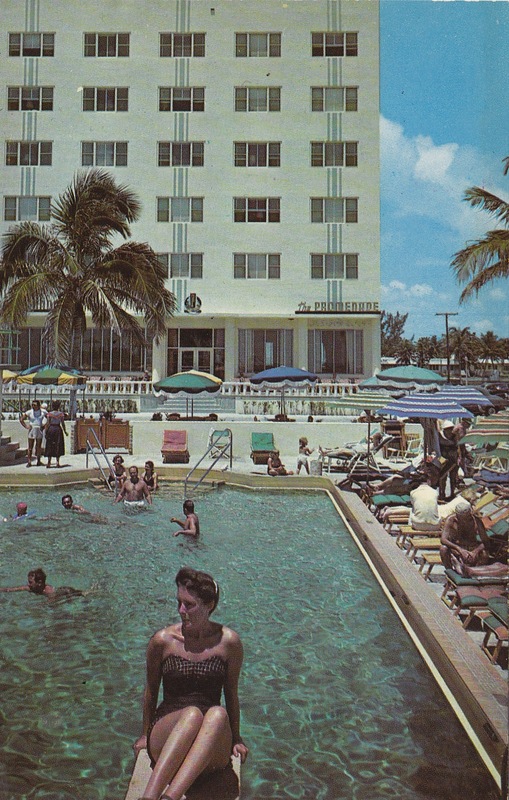 The story of Miami Beach as told by those who lived it. 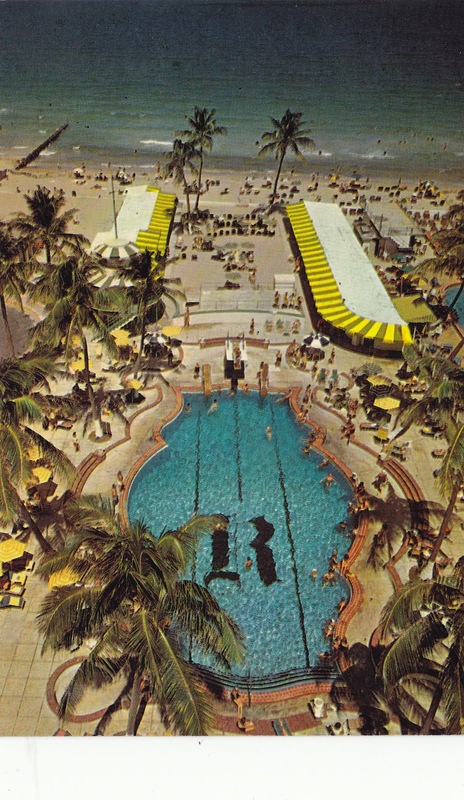 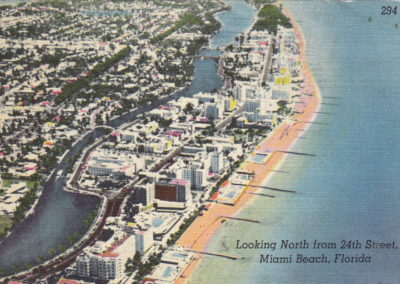 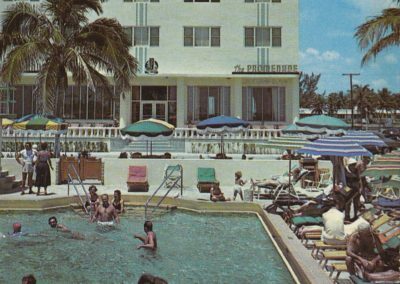 The history of Miami Beach as told by those who lived it. 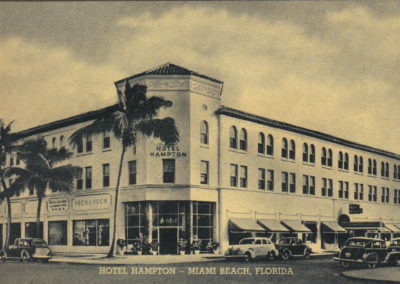 Historic designation and preservation is an vital part of Miami Beach’s recognition as an international tourist and cultural center. 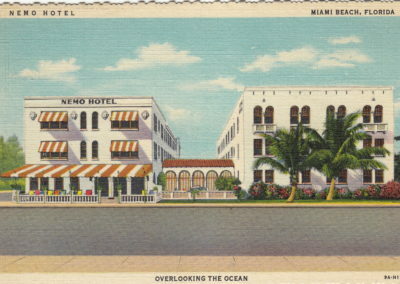 Its Art Deco District is one of the largest heritage sites in the world with 800 buildings constructed between the Great Hurricane of 1926 and the beginning of the Second World War. 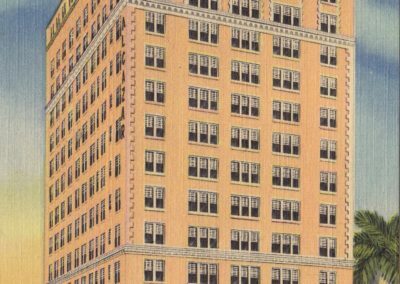 The fight for preservation is an ongoing struggle given the appreciating value of the real estate. 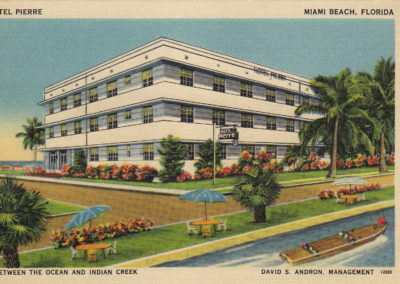 Blacks cleared, built and maintained Miami Beach. 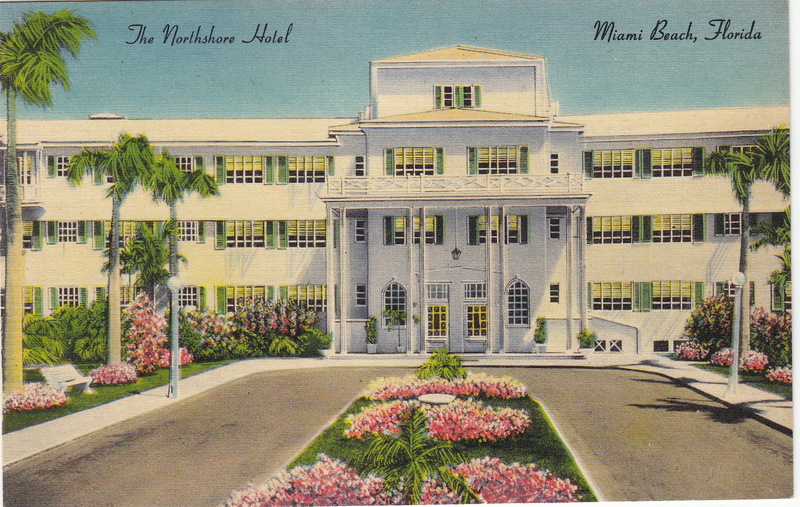 They staffed the hotels, cared for the children and entertained northern tourists. 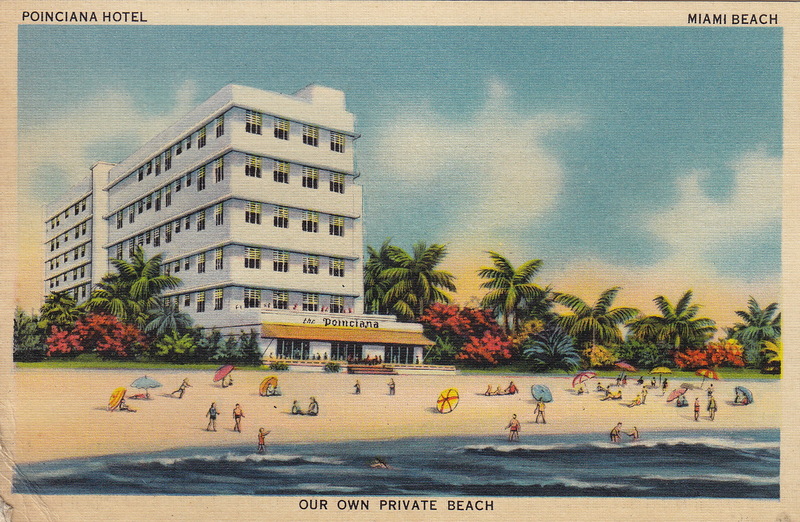 But they could not stay on the Beach, rent a room or own a business. 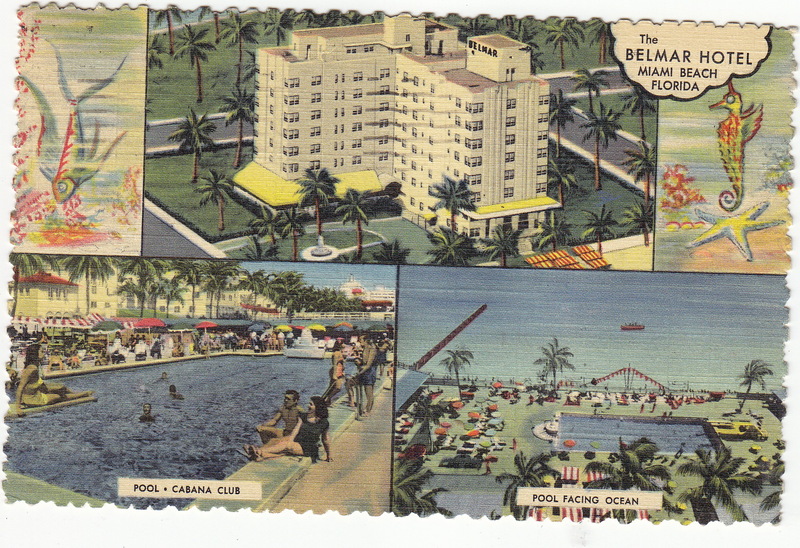 While Miami Beach was spared much of the ugly confrontations of a Selma or Birmingham, it was still a segregated Southern city for much of the last century. 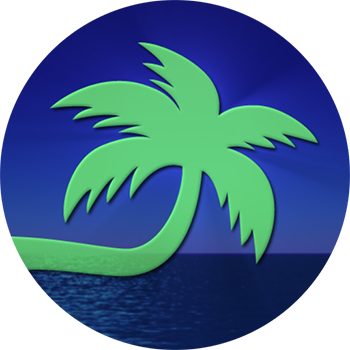 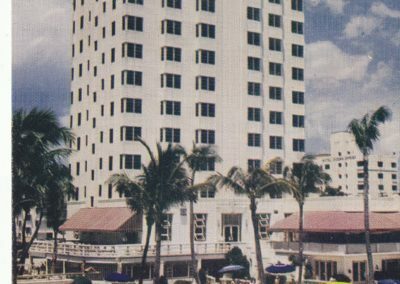 The Miami Beach Visual Memoirs Project is an on-line digital archive extended HD video interviews with the people of Miami Beach — their recollections, impressions, stories and involvement in the developments and changes over the past seventy years. 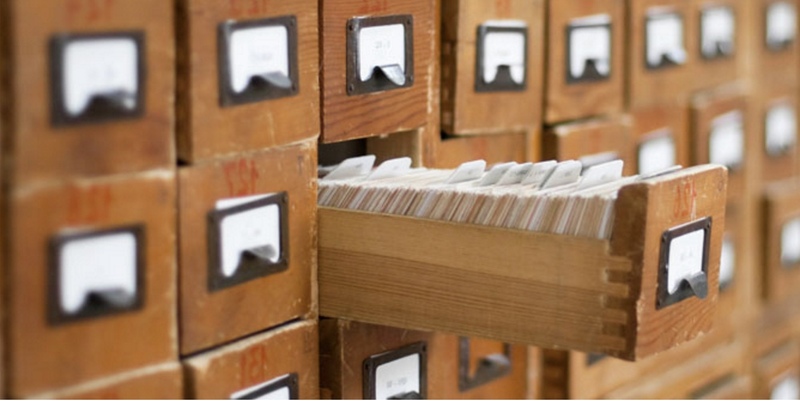 The archive is still in development: interviews are regularly added, full transcripts are added, educational videos adapted from the media, photos added and new topic areas defined. 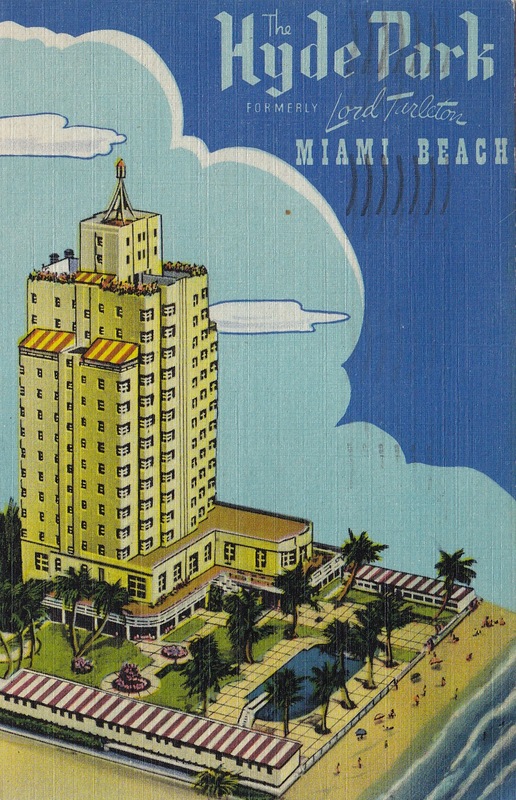 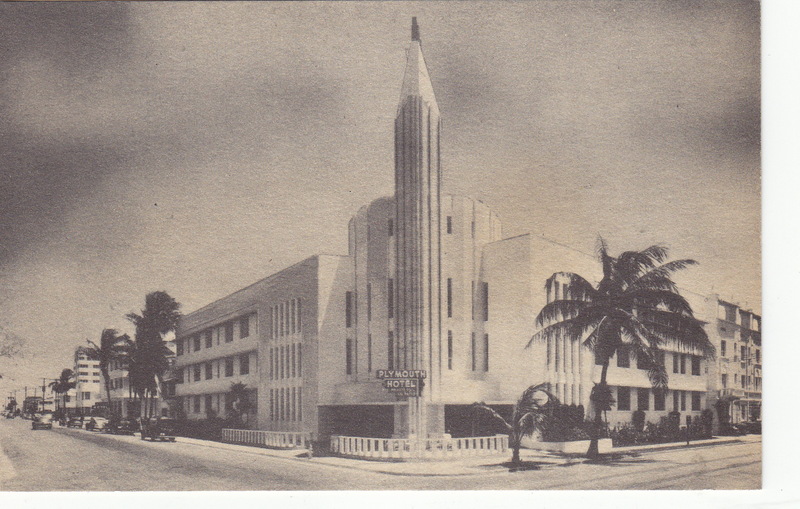 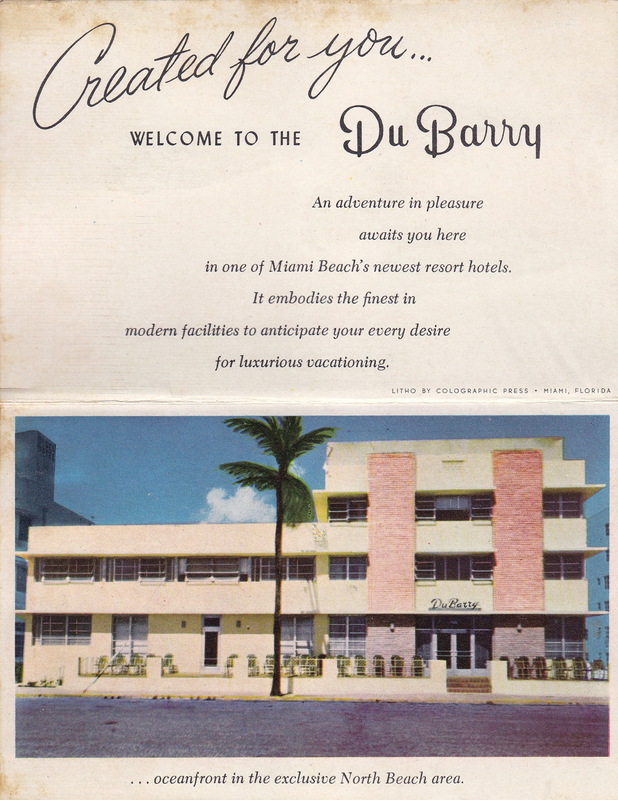 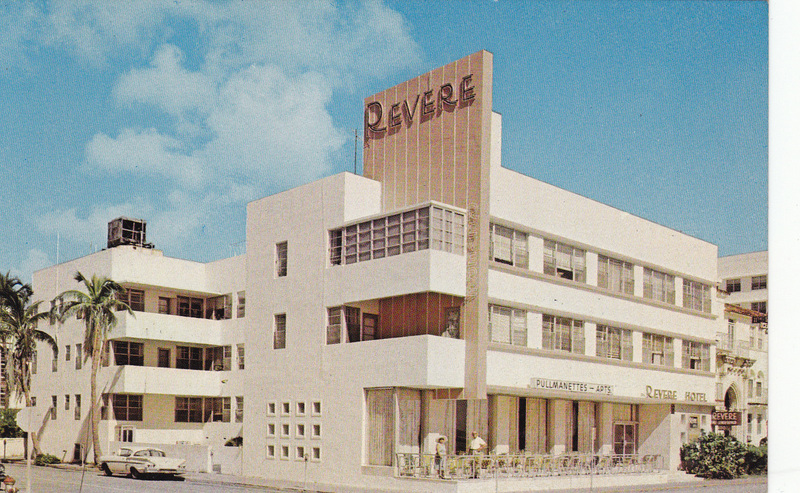 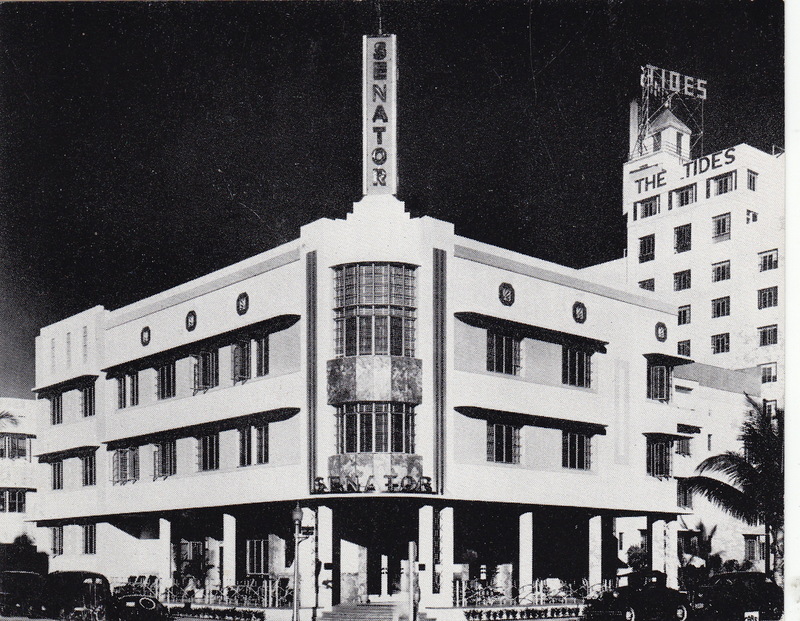 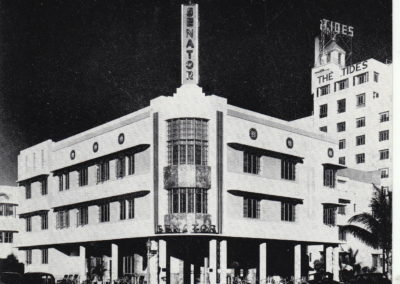 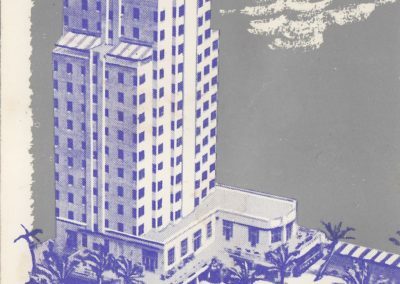 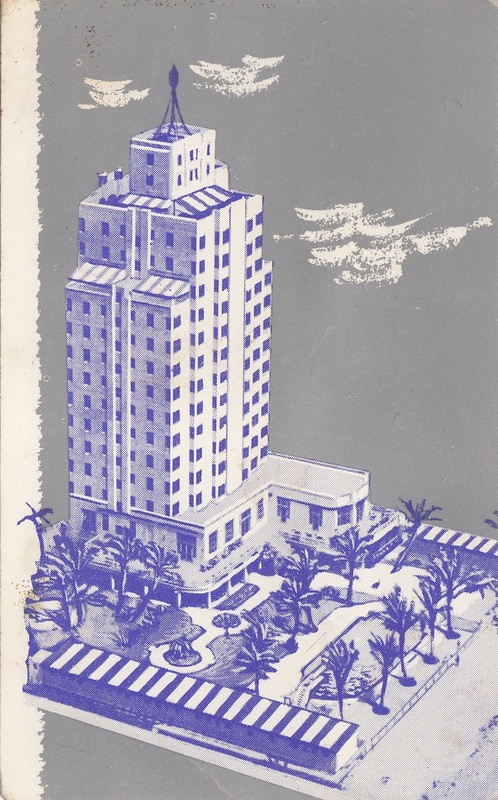 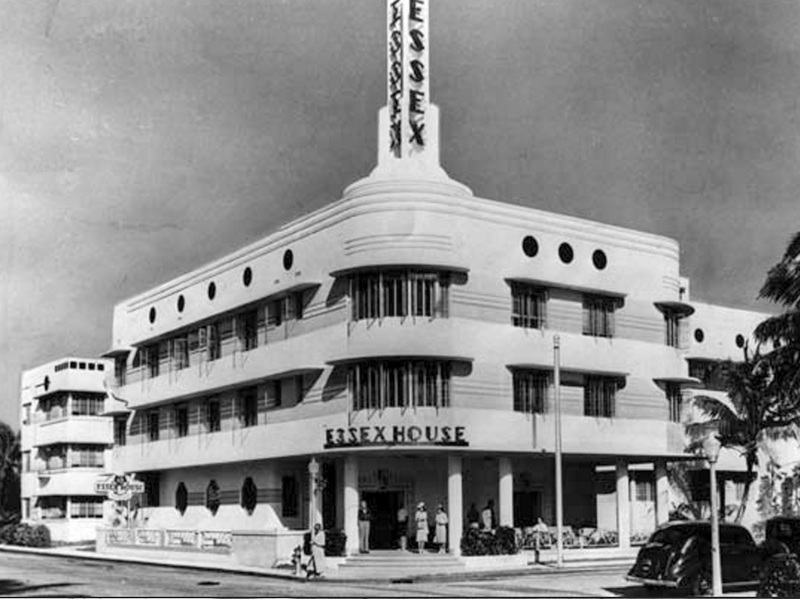 Video excerpts and highlights from lectures, seminars and roundtable discussions on the development of Miami Beach and the Art Deco movement recorded during Art Deco Weekend events. 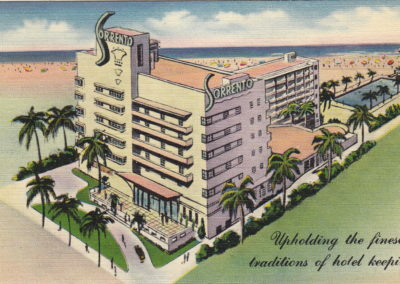 Hotels encouraged guests to use the often free cards to share news of their visit. 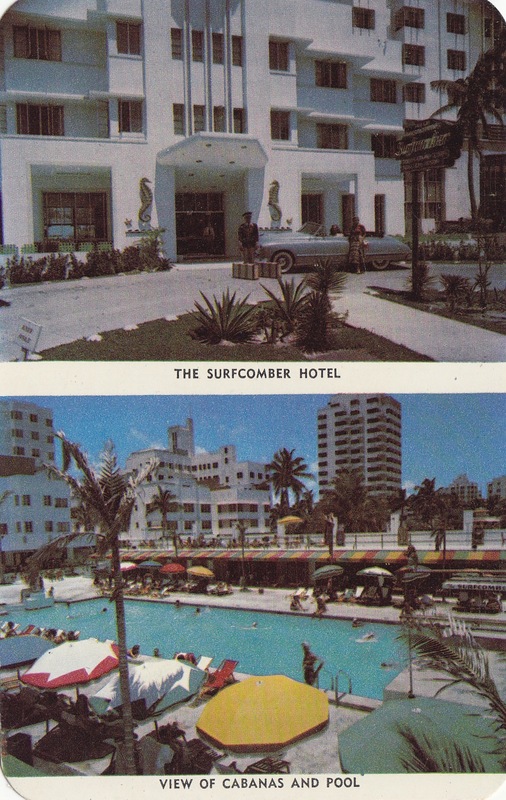 It was a cheap efficient way to advertise, especially if the hotels were relatively small. 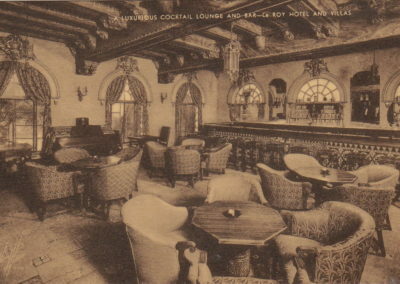 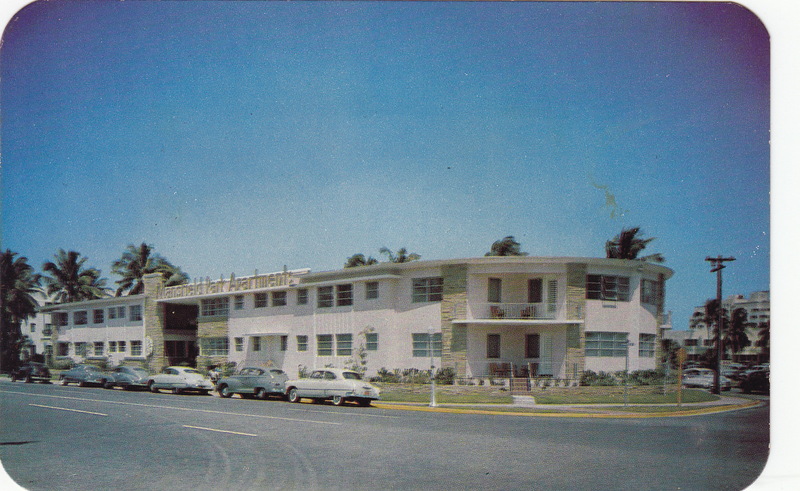 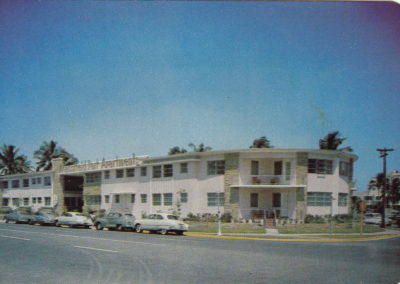 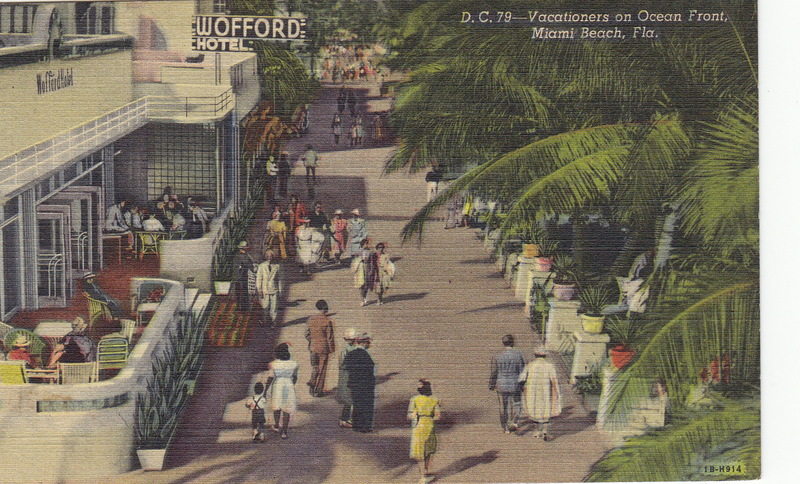 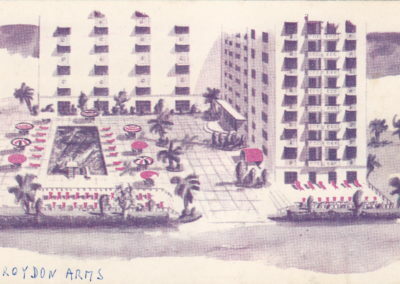 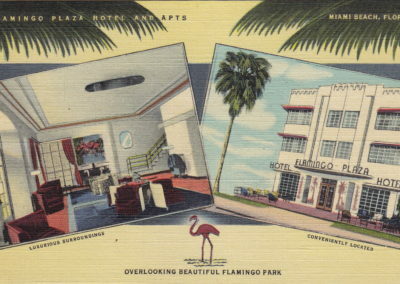 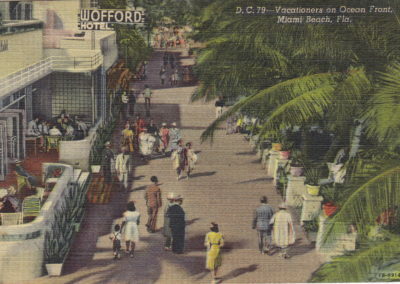 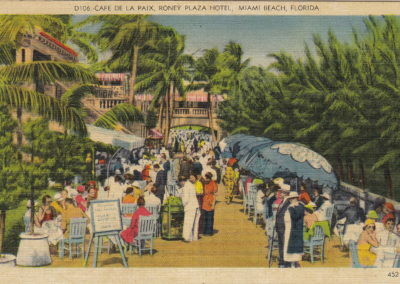 The picture postcard also permitted editorial license by creating a more pleasing ambiance than existed in reality — the hotels are often seen isolated from other hotels on “the strip,” with more color and vegetation than actually existed. 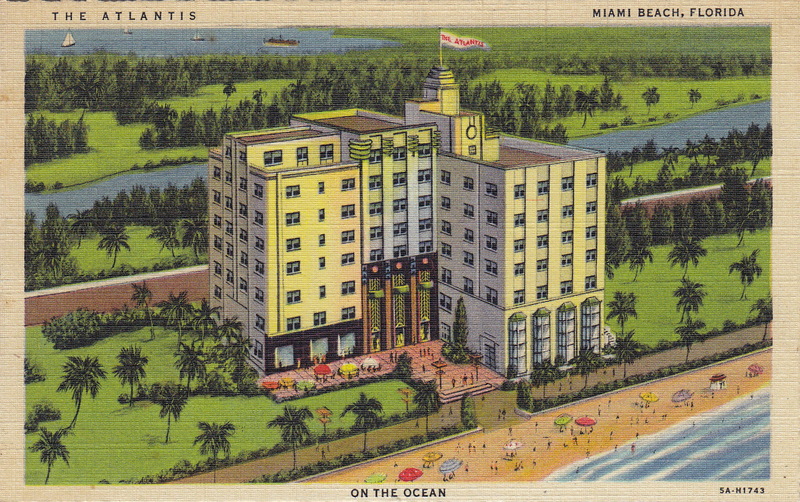 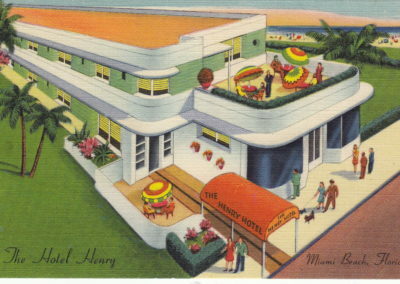 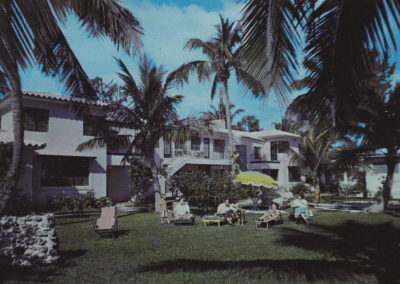 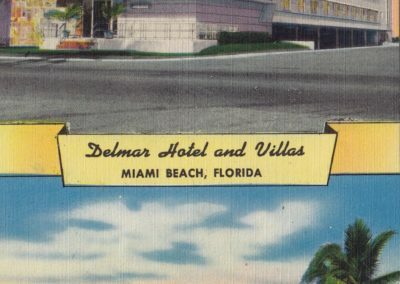 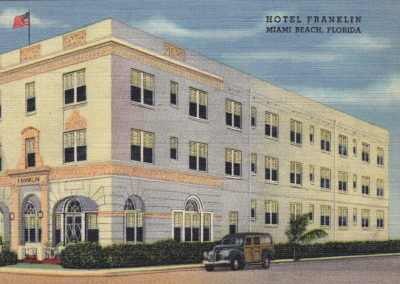 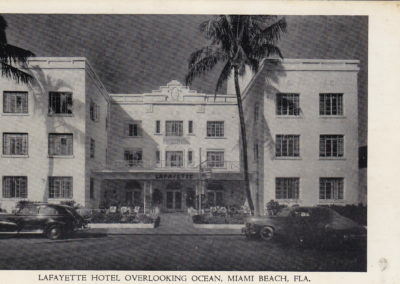 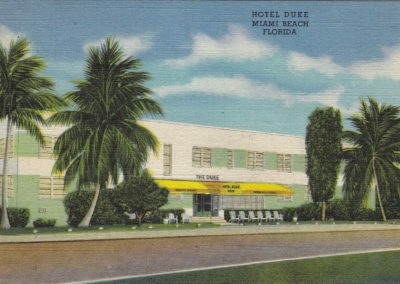 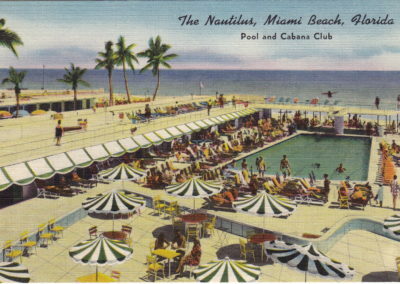 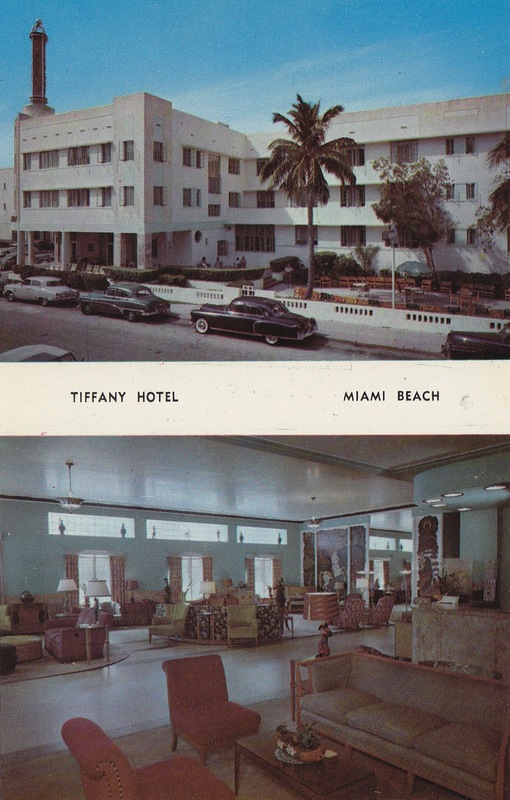 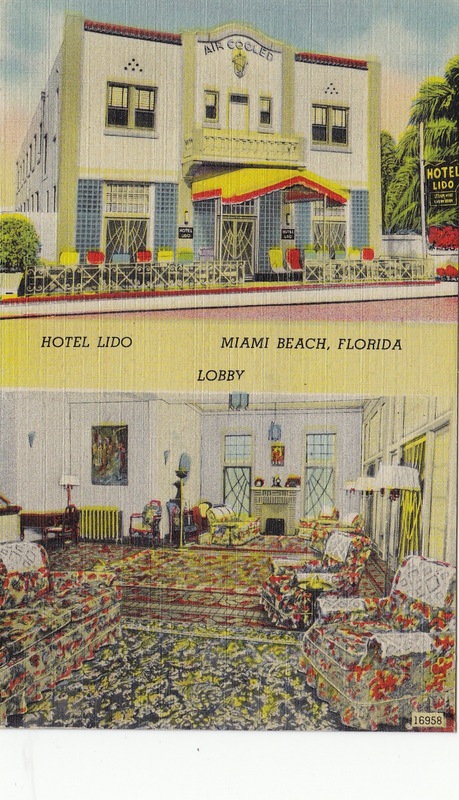 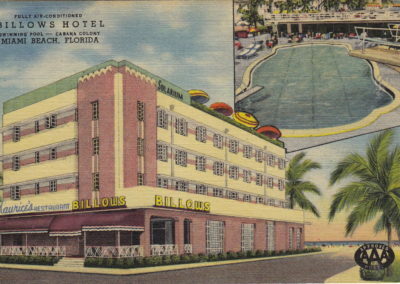 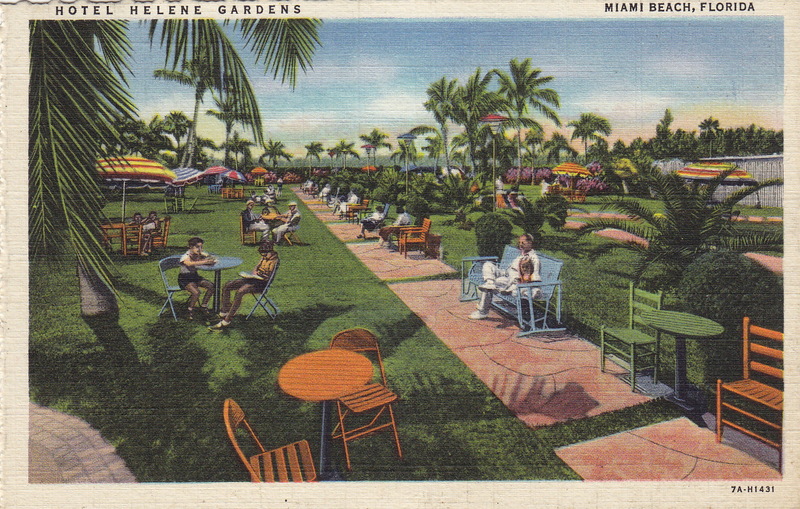 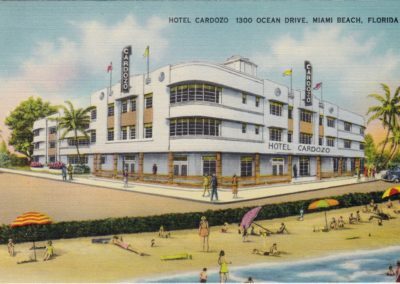 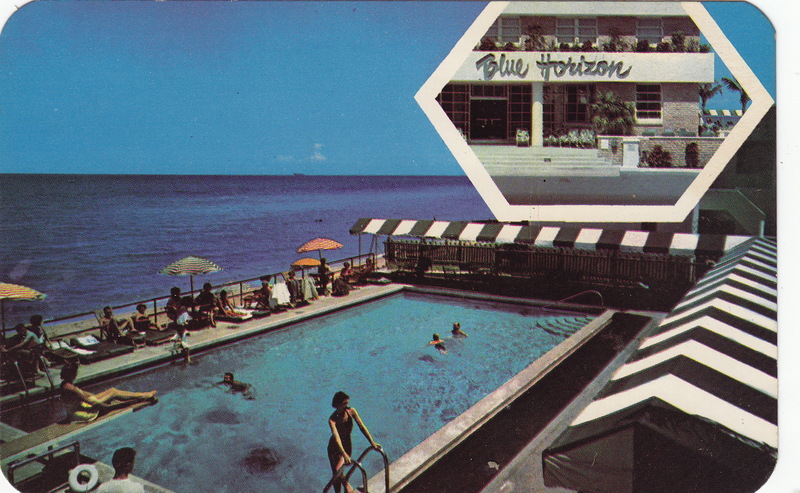 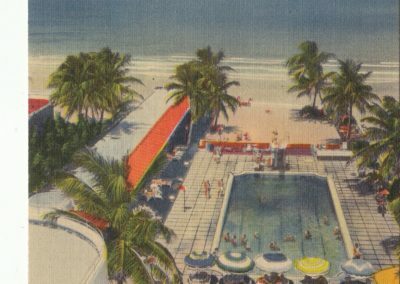 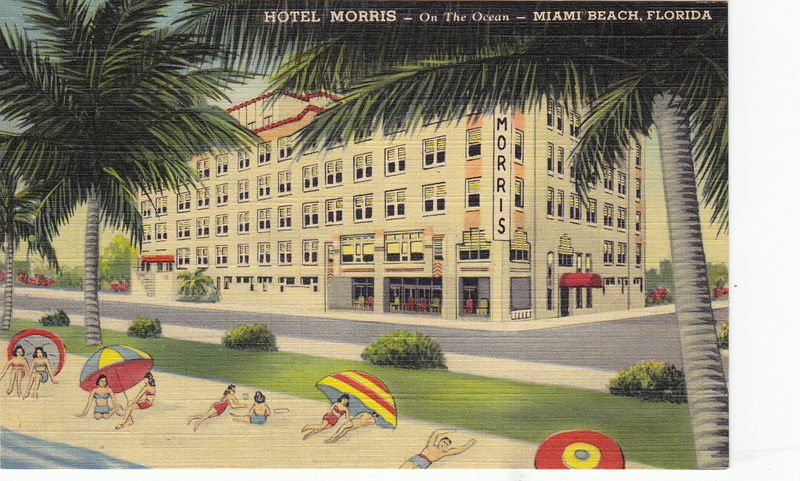 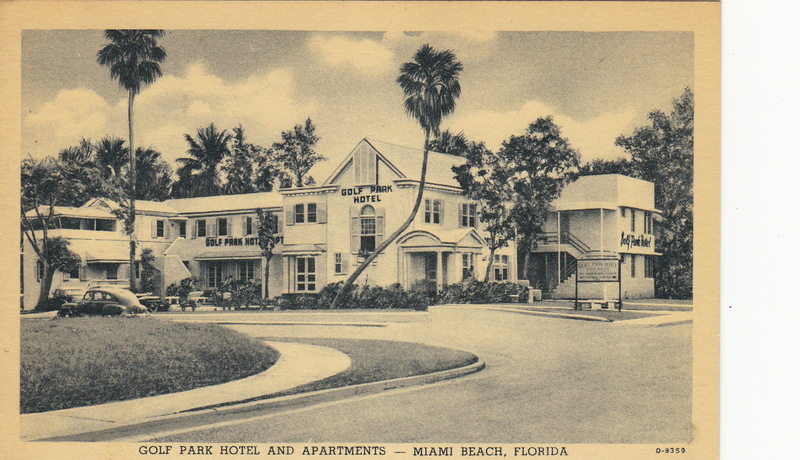 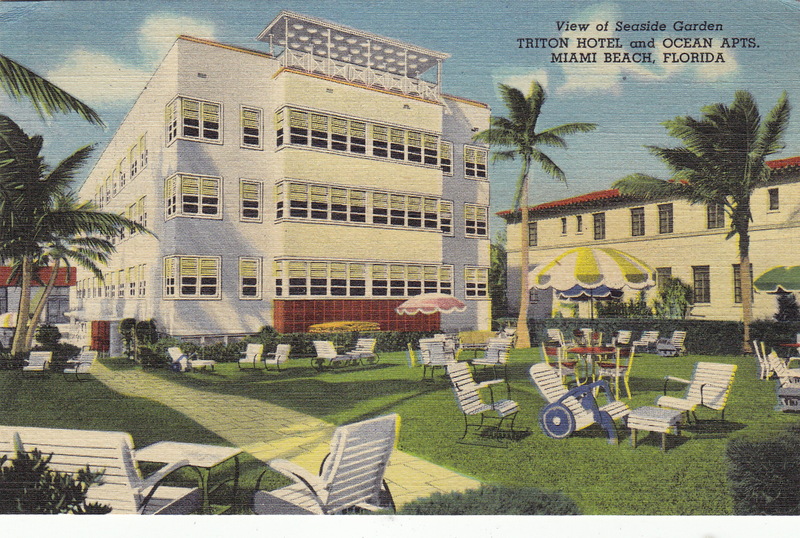 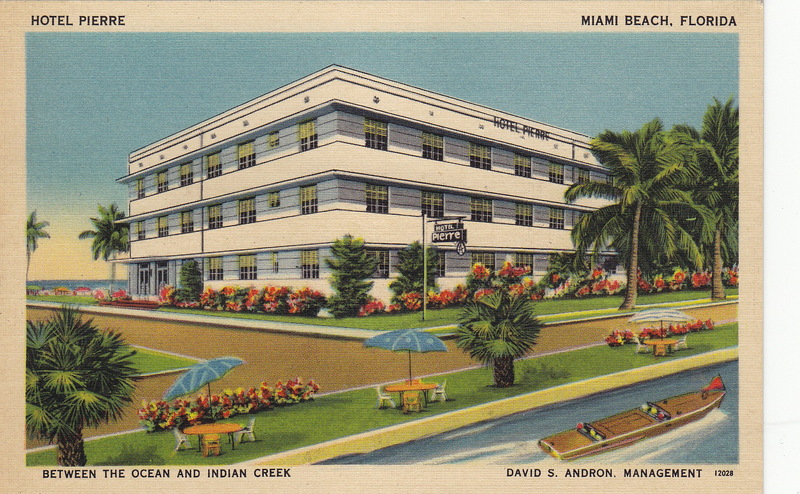 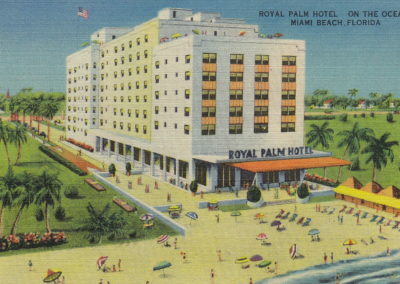 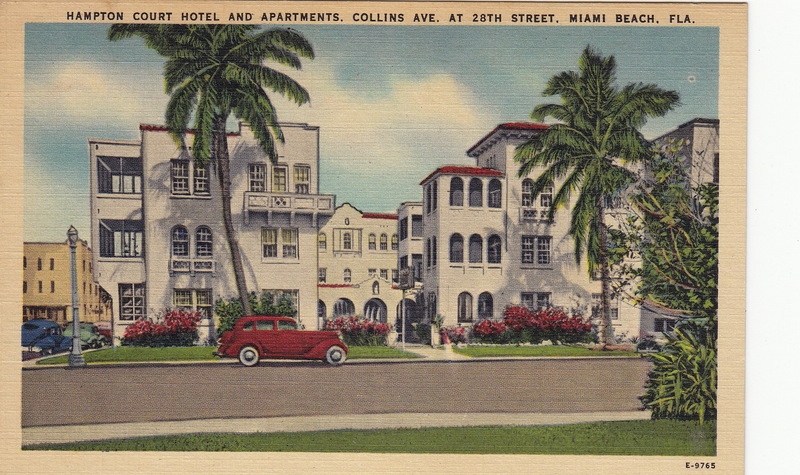 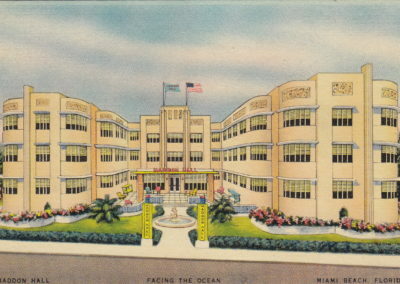 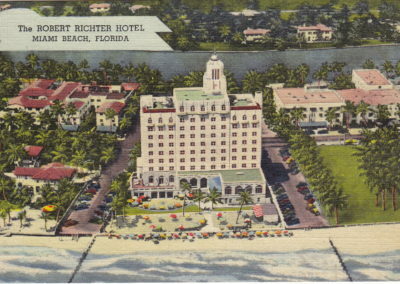 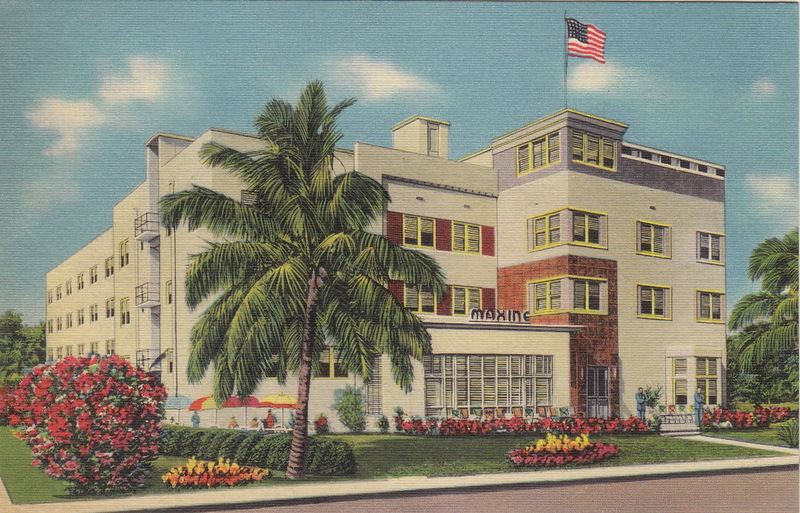 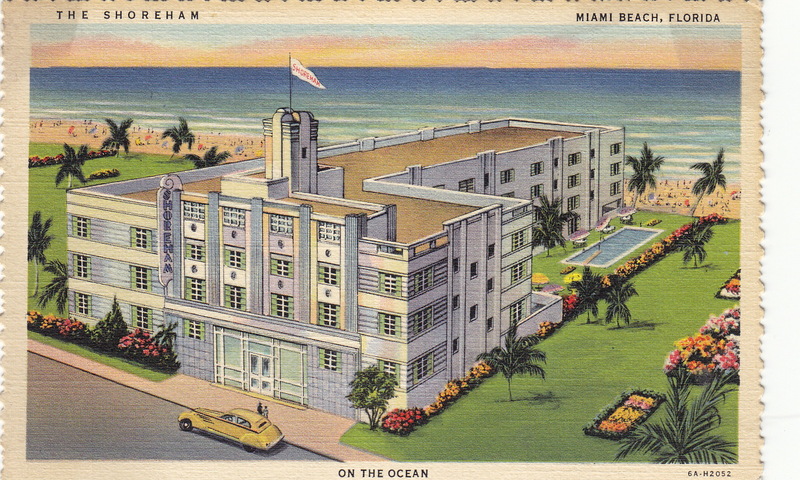 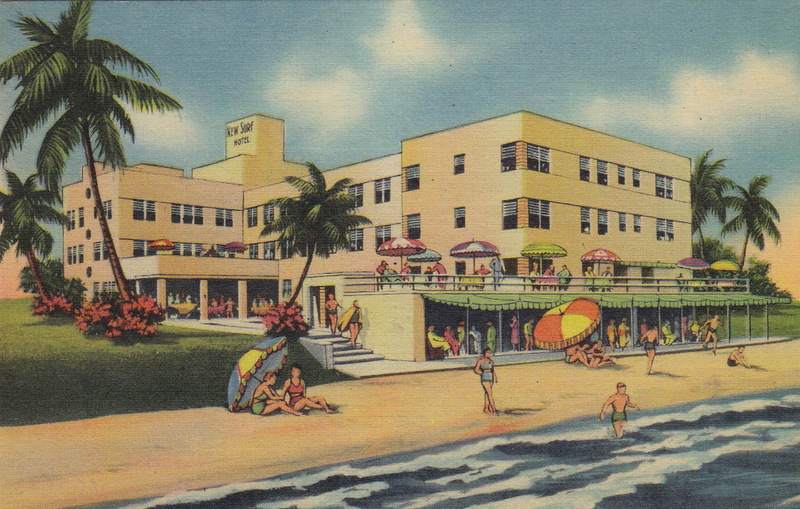 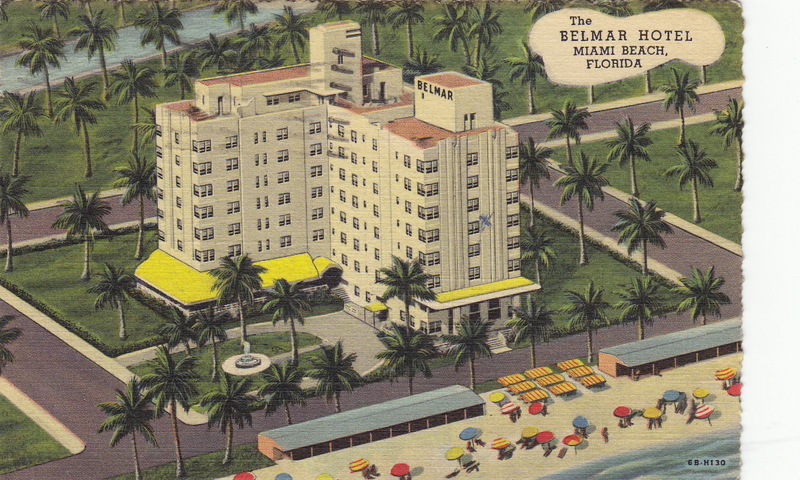 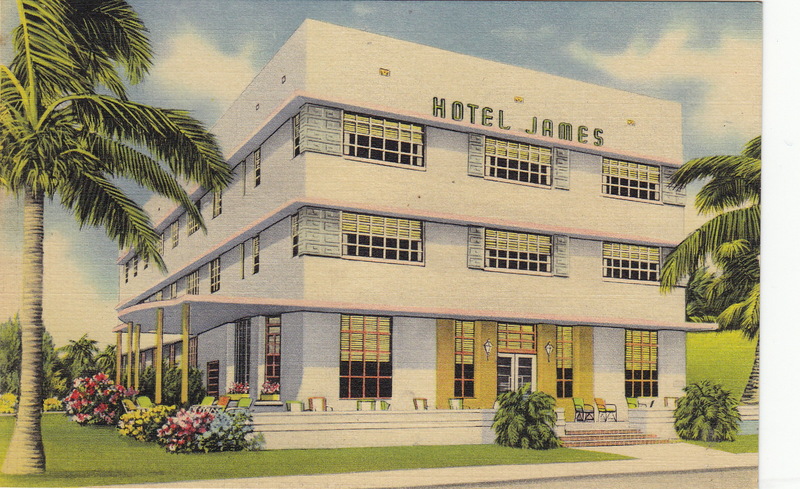 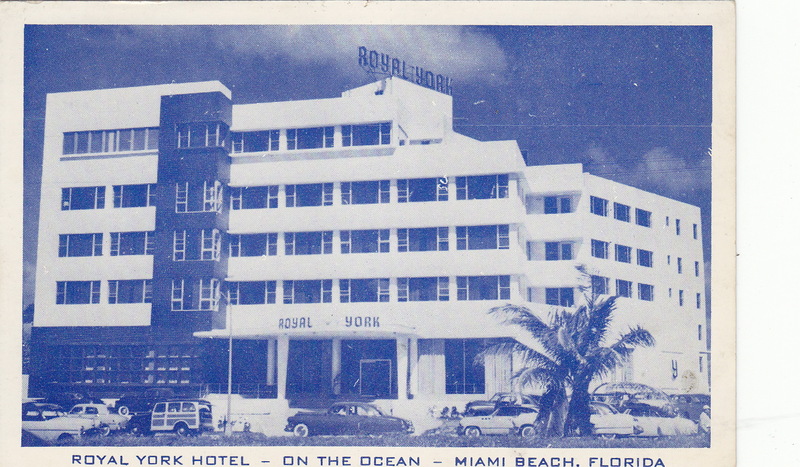 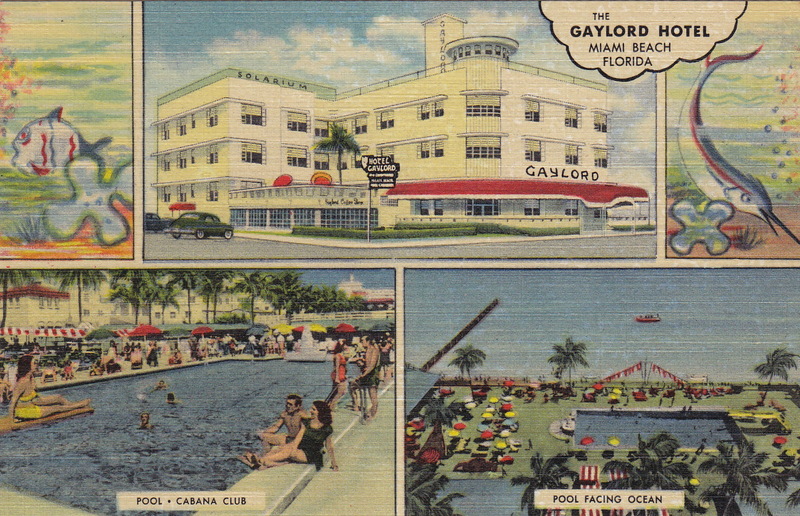 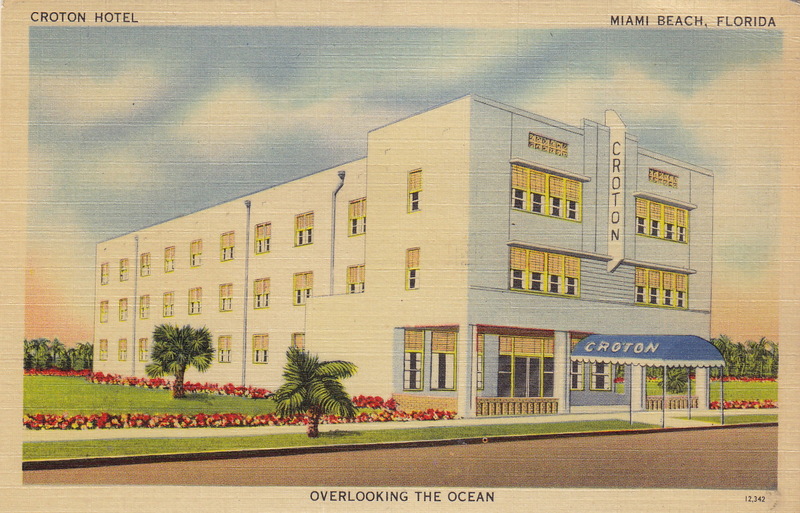 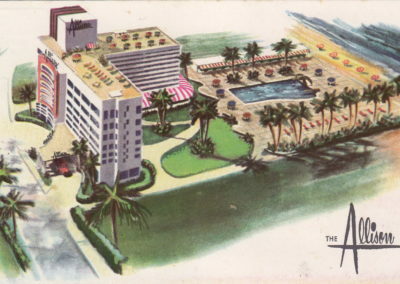 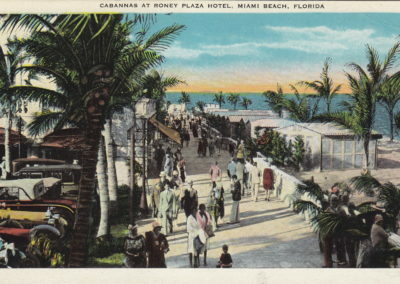 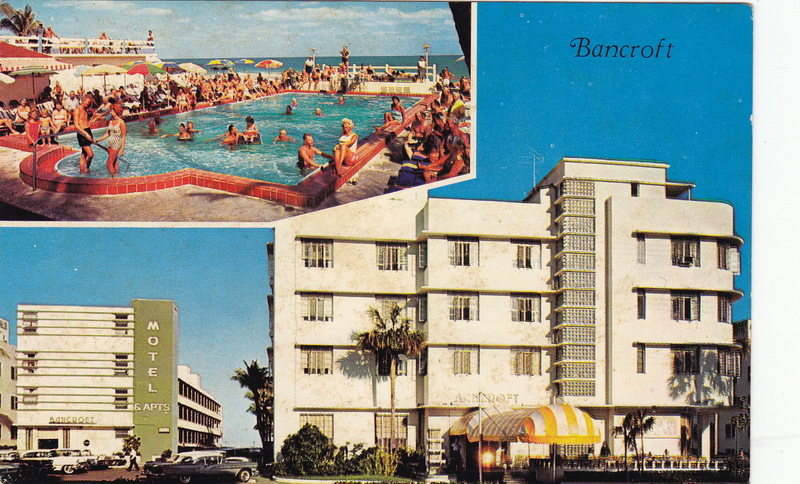 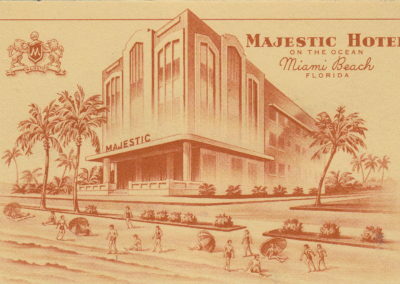 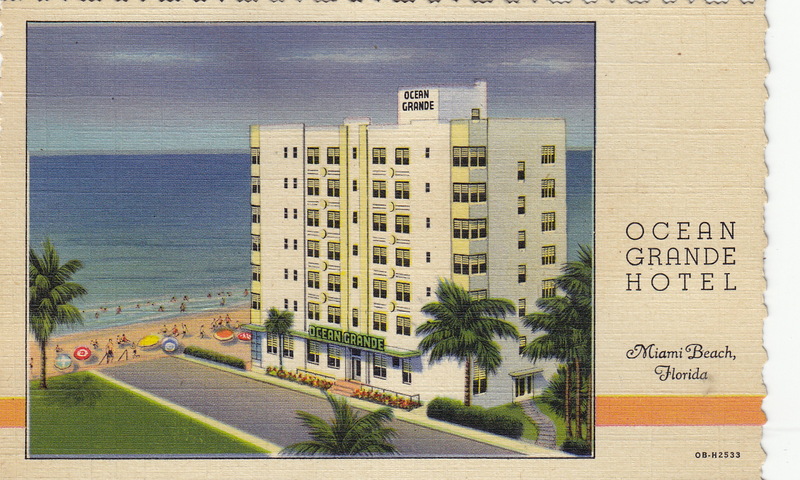 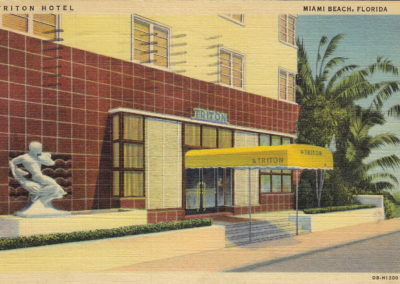 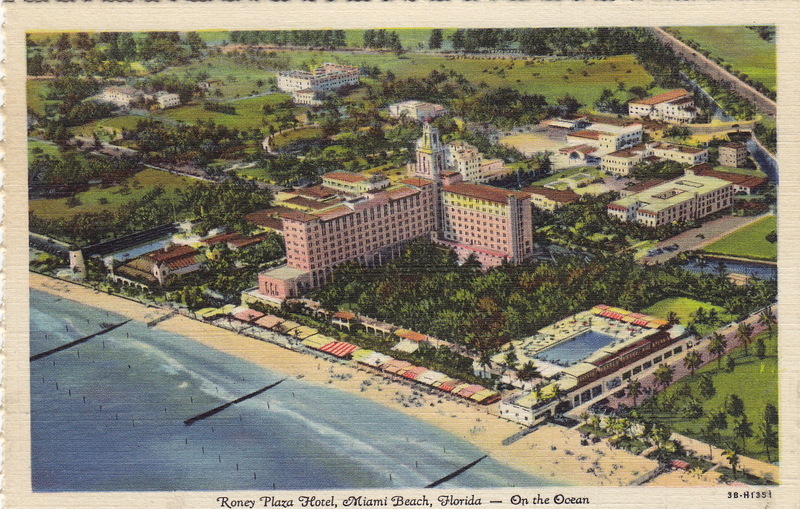 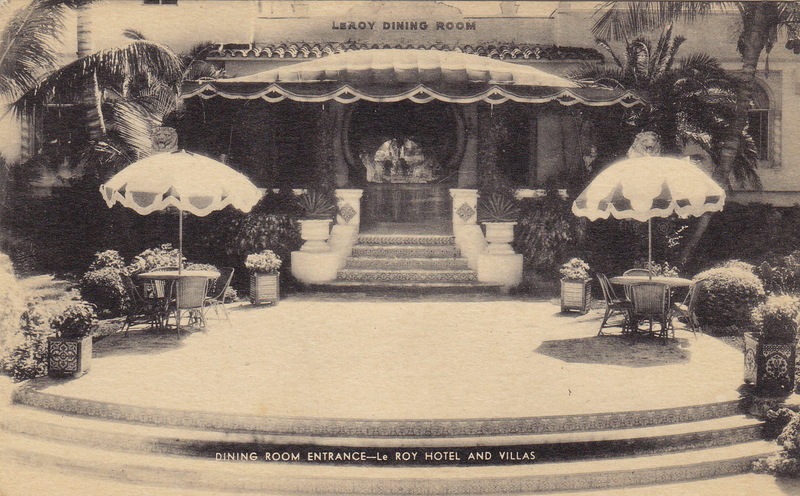 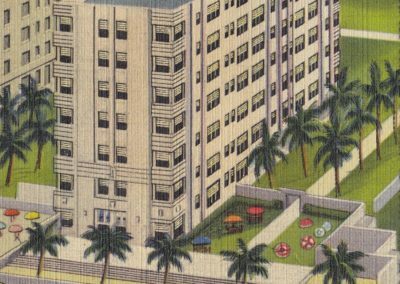 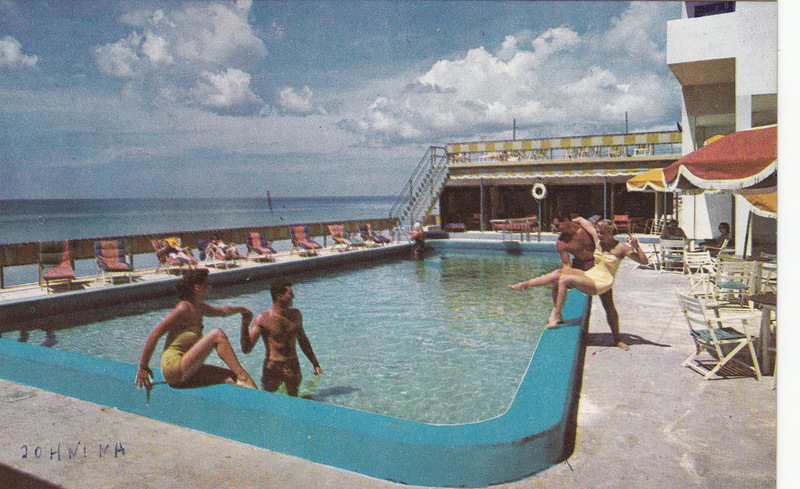 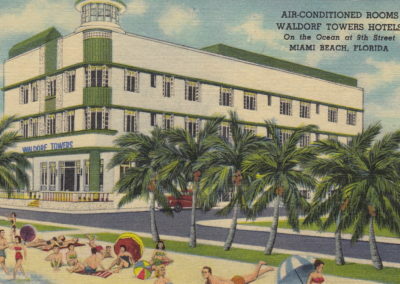 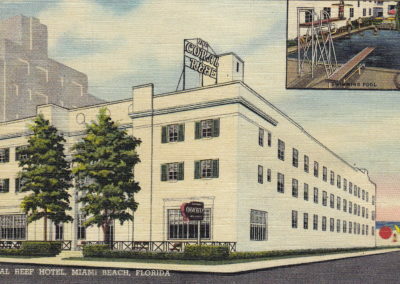 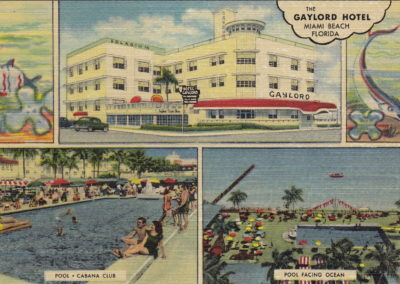 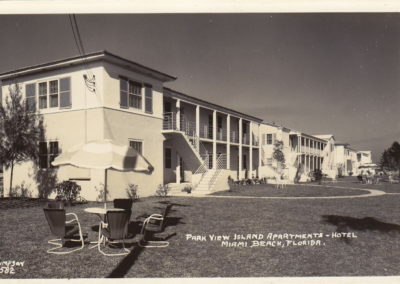 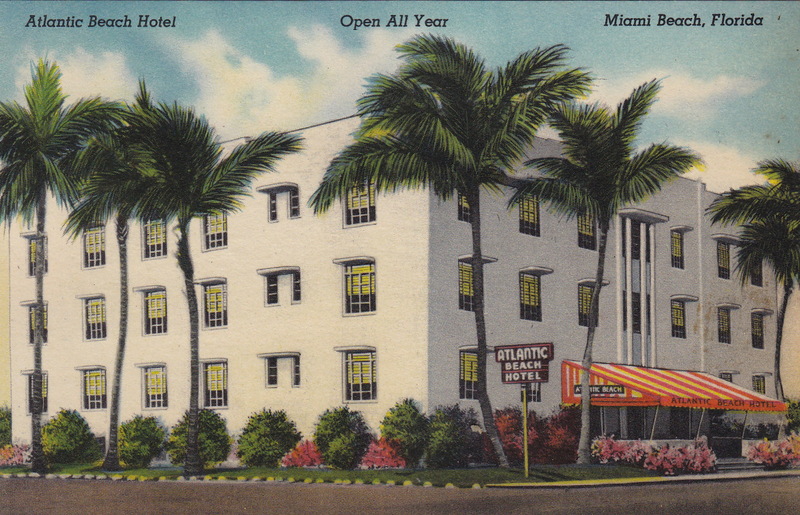 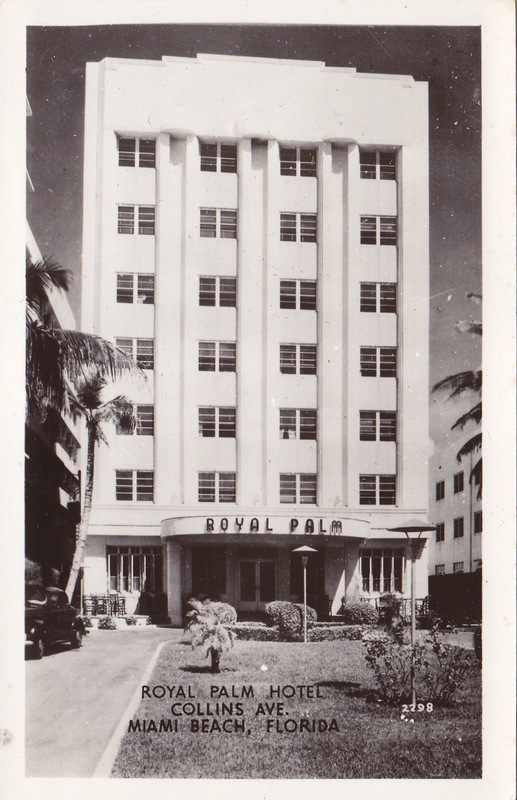 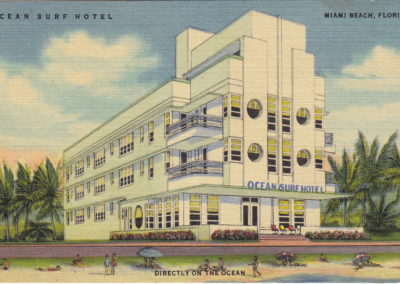 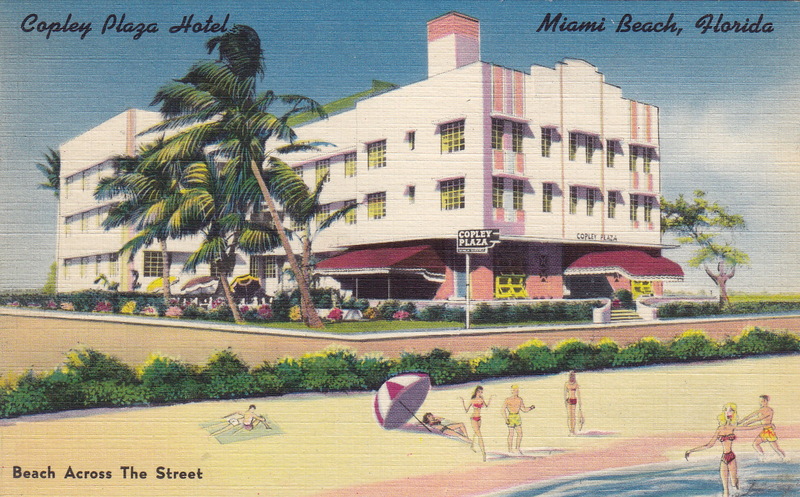 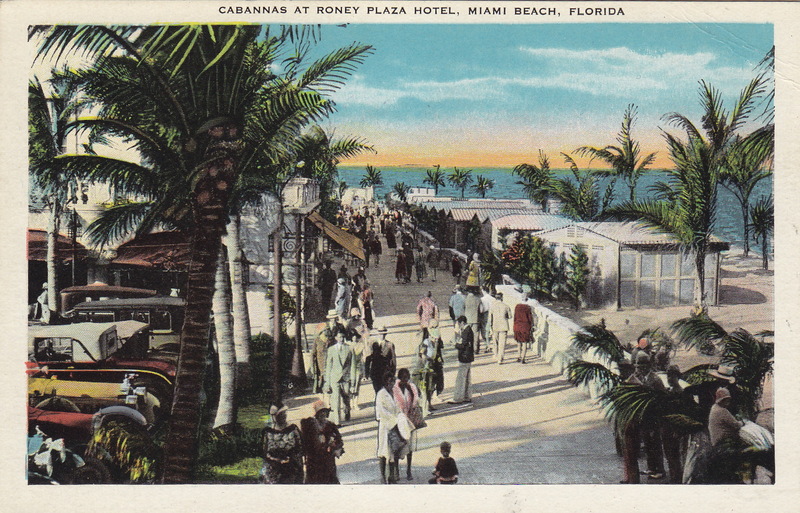 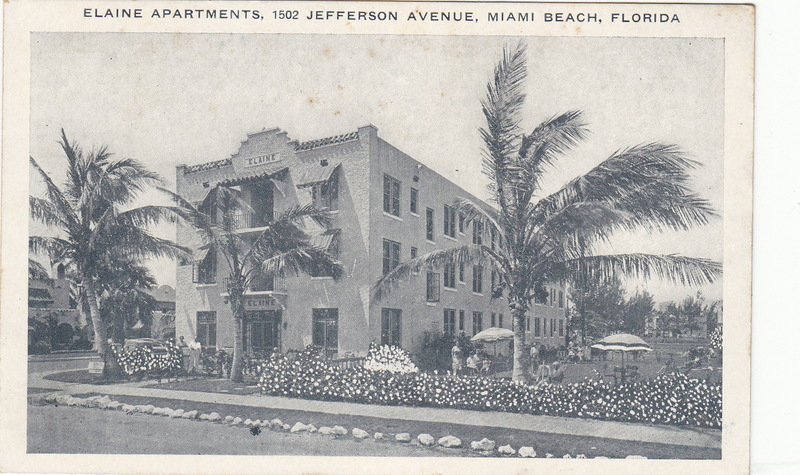 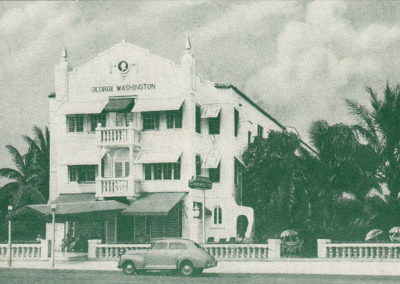 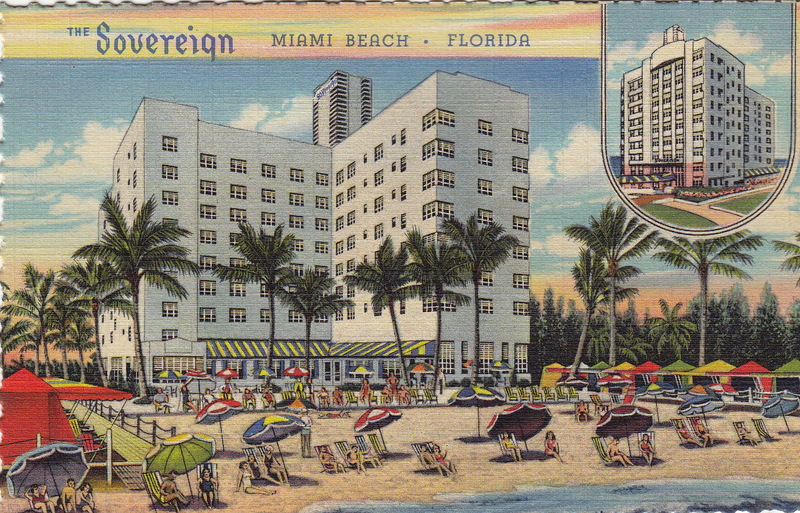 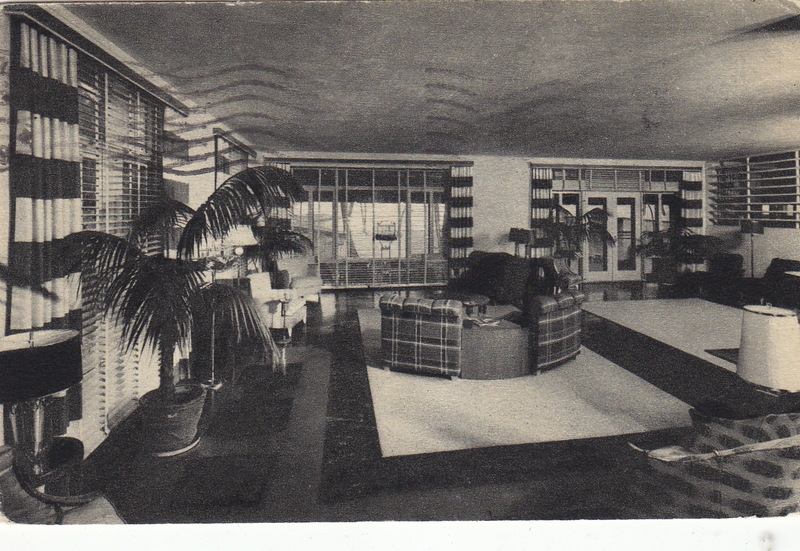 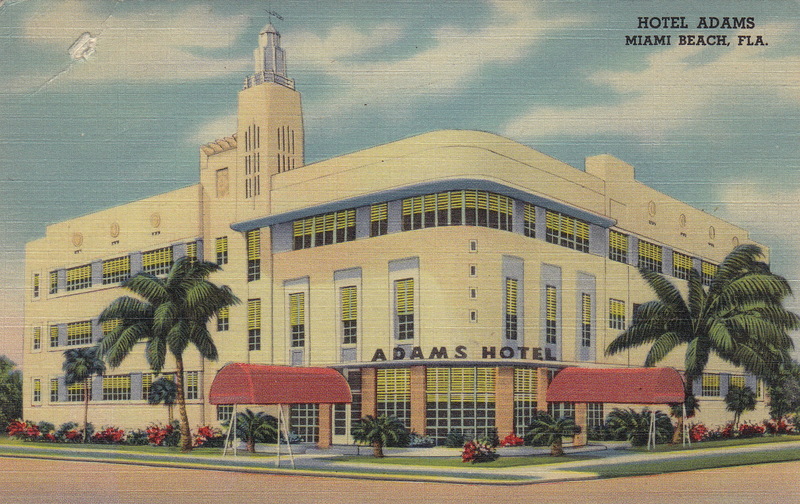 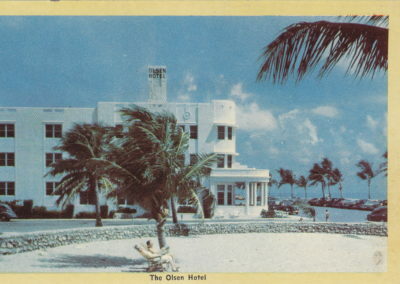 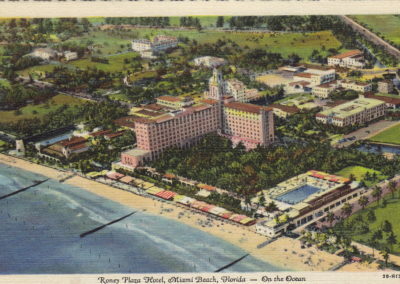 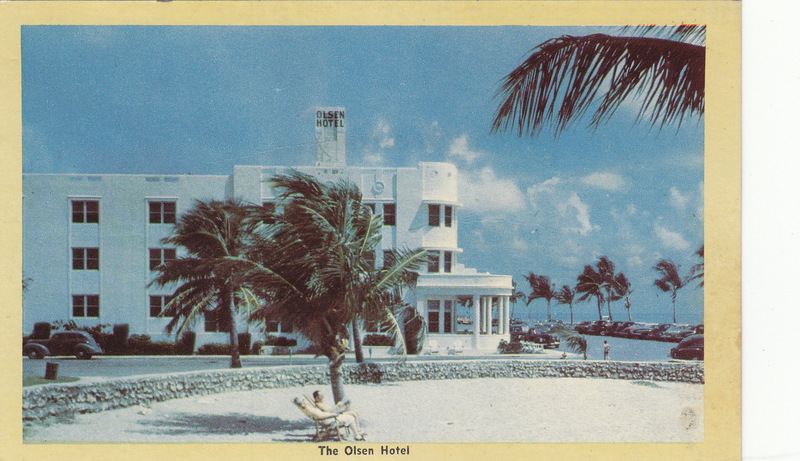 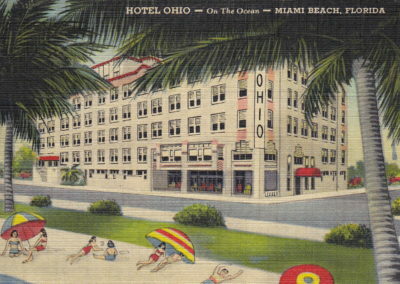 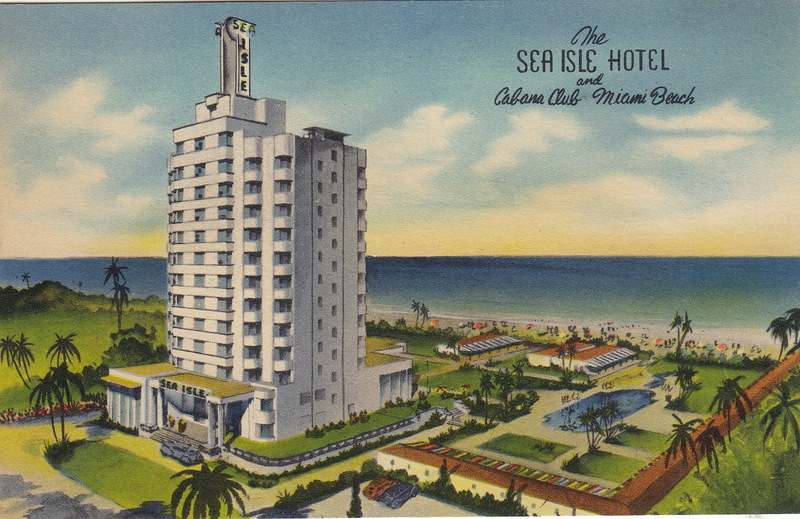 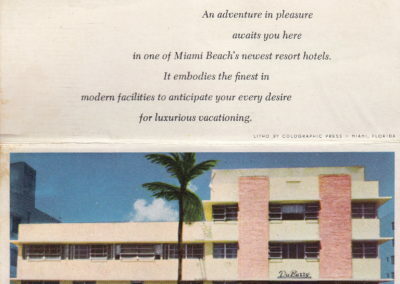 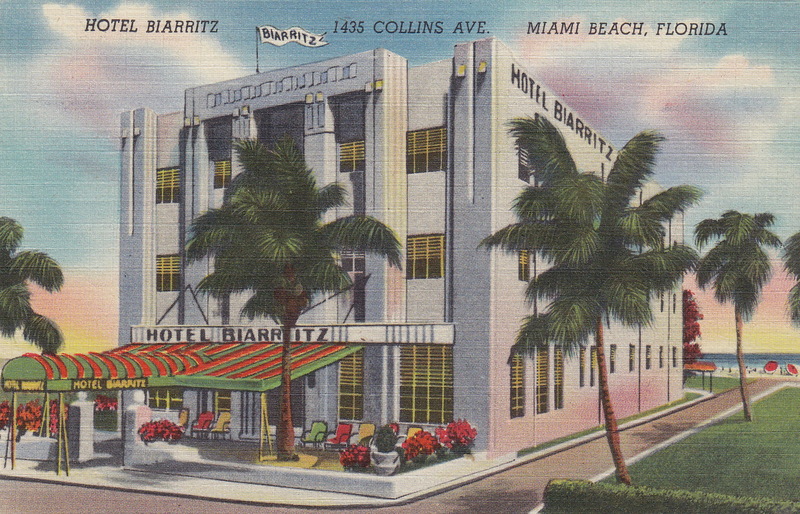 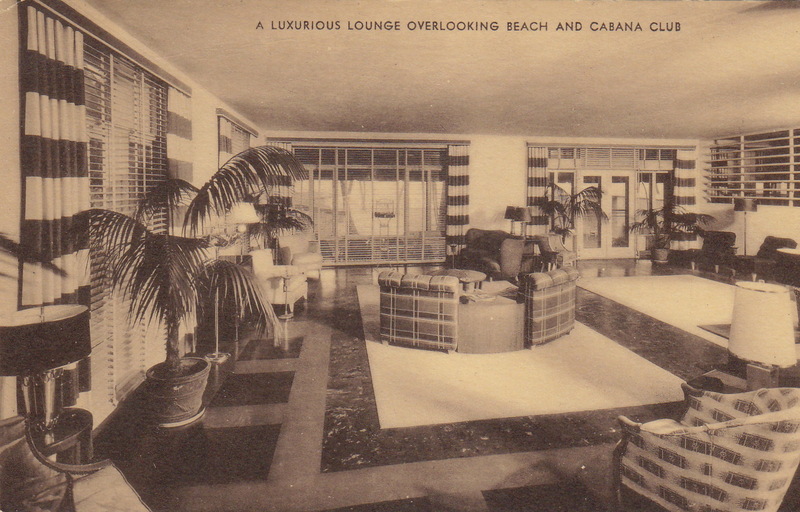 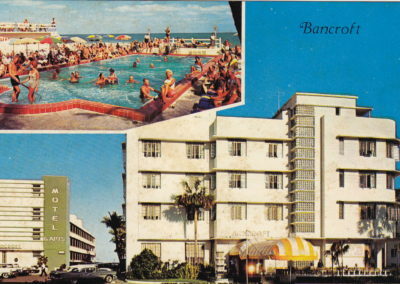 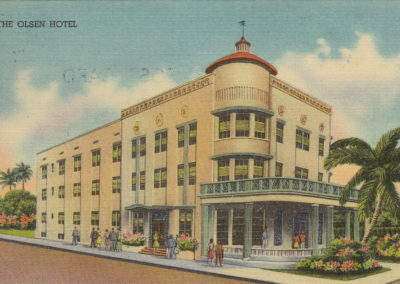 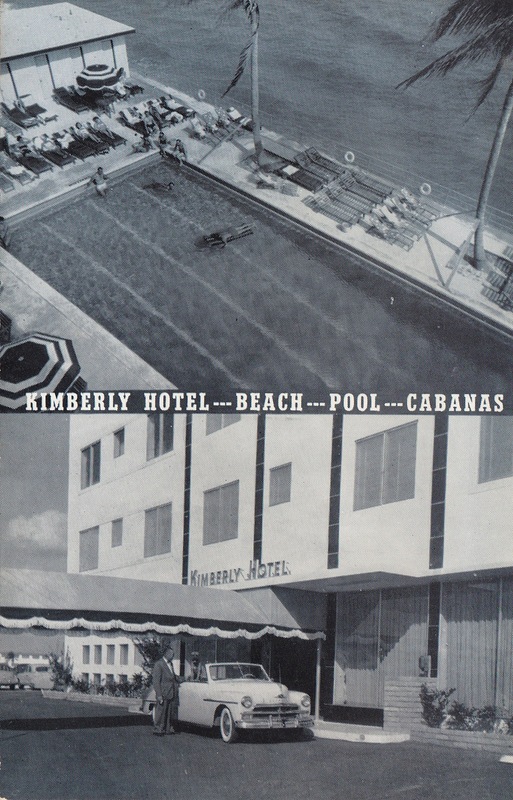 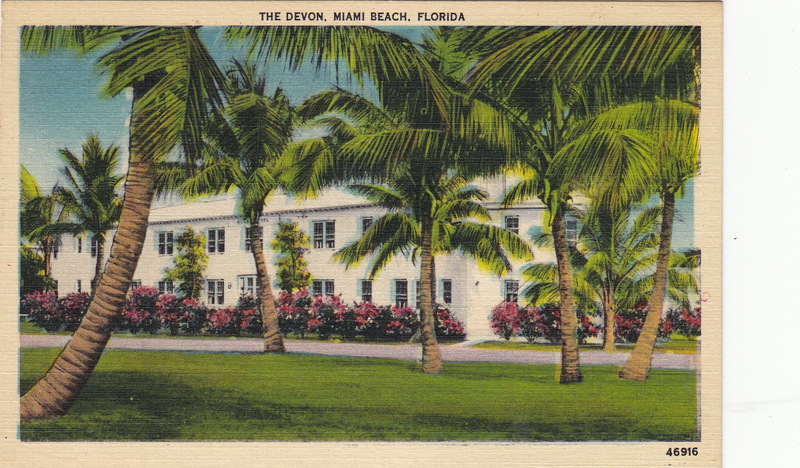 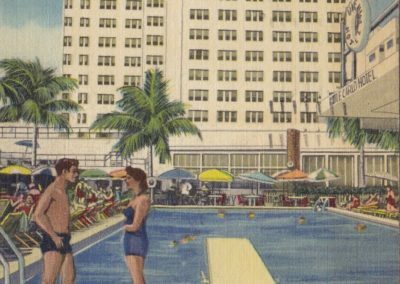 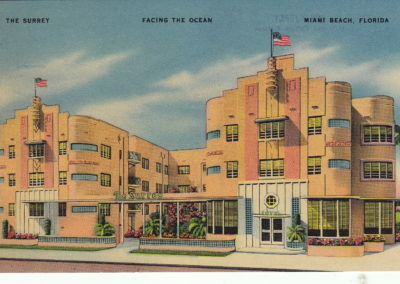 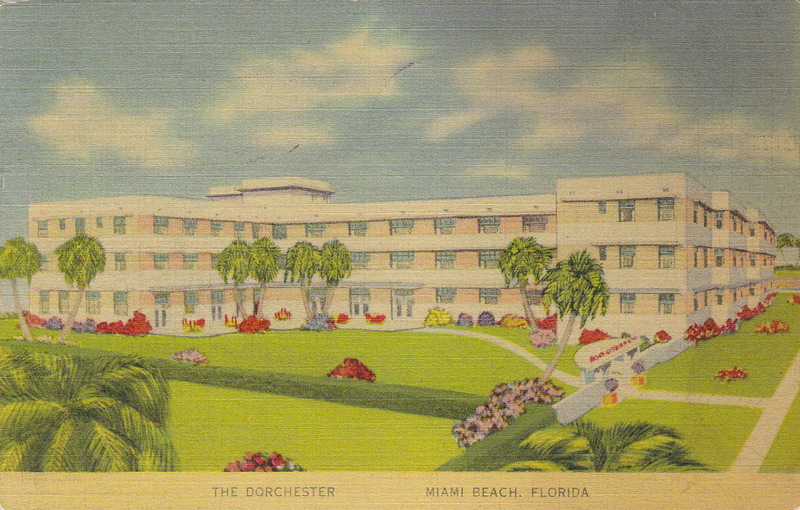 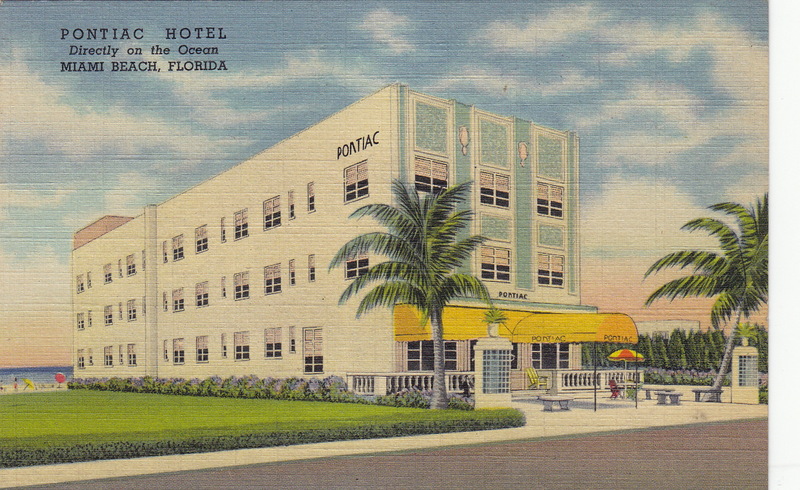 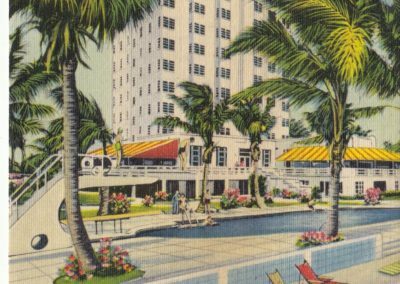 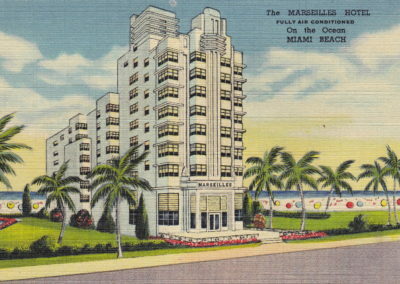 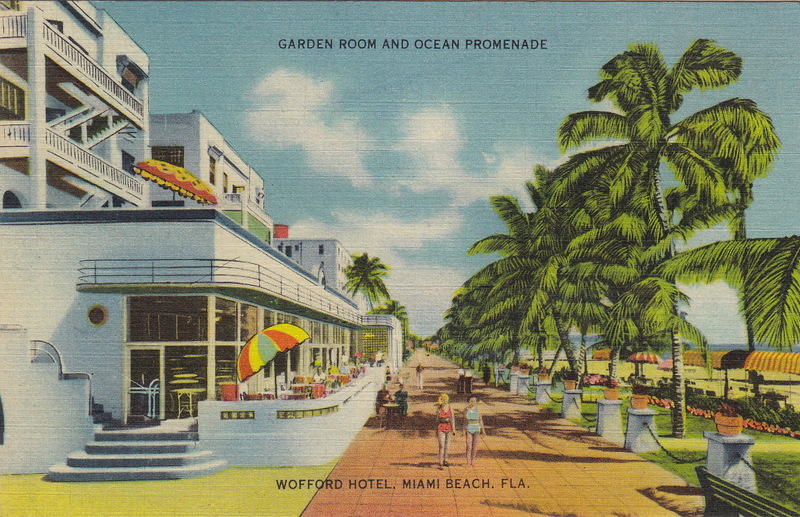 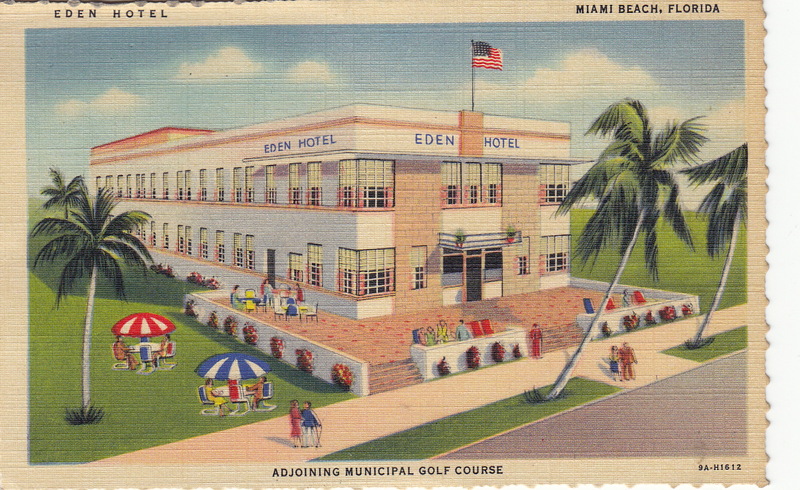 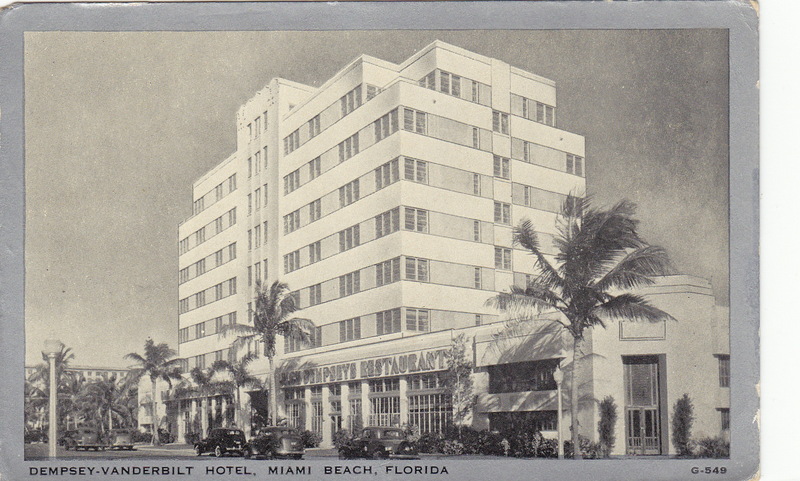 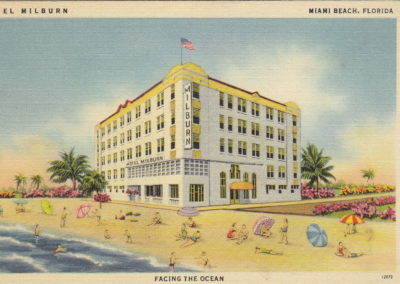 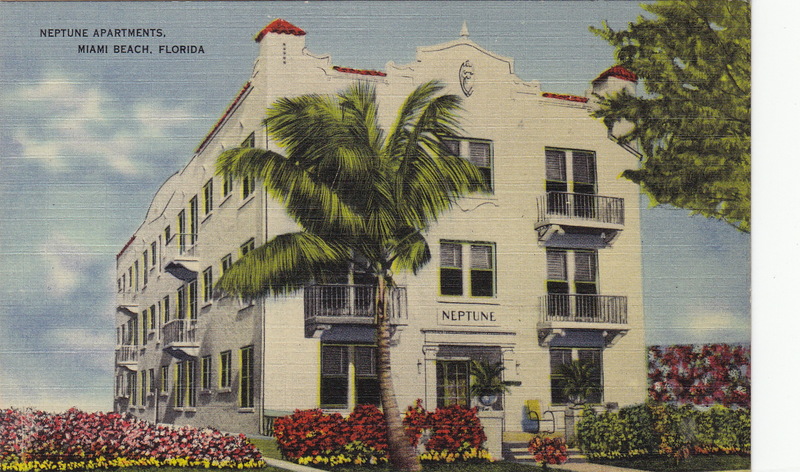 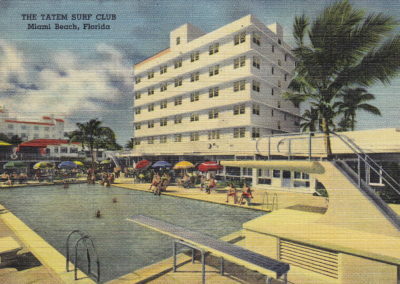 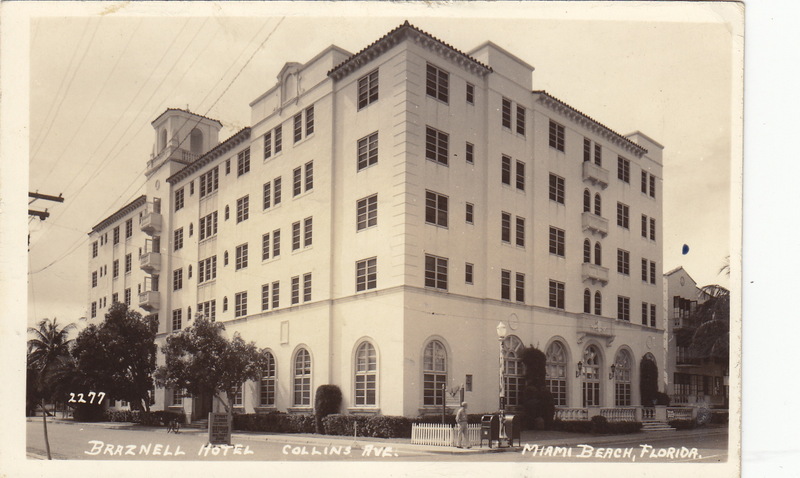 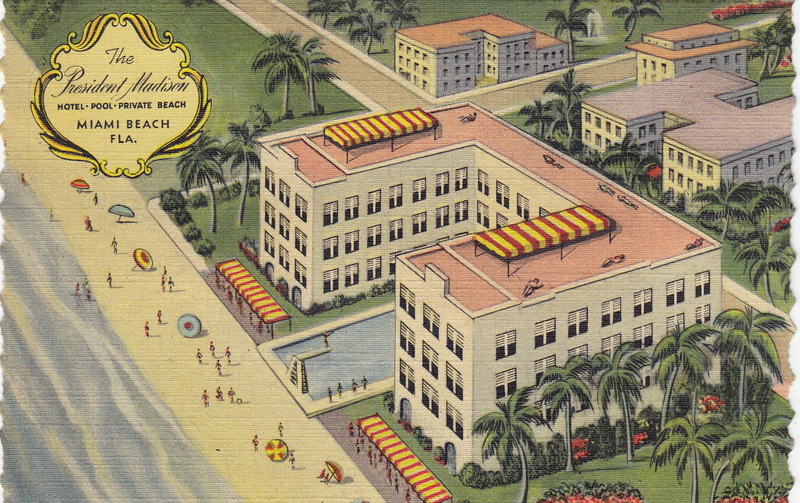 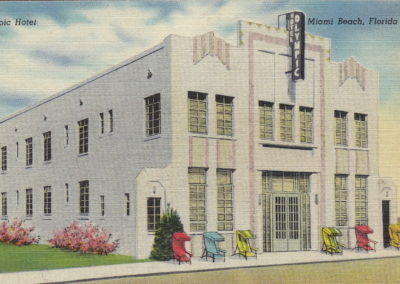 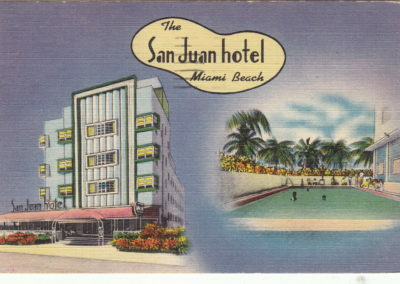 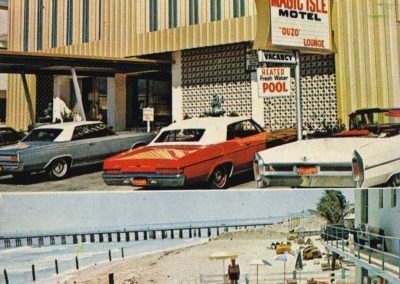 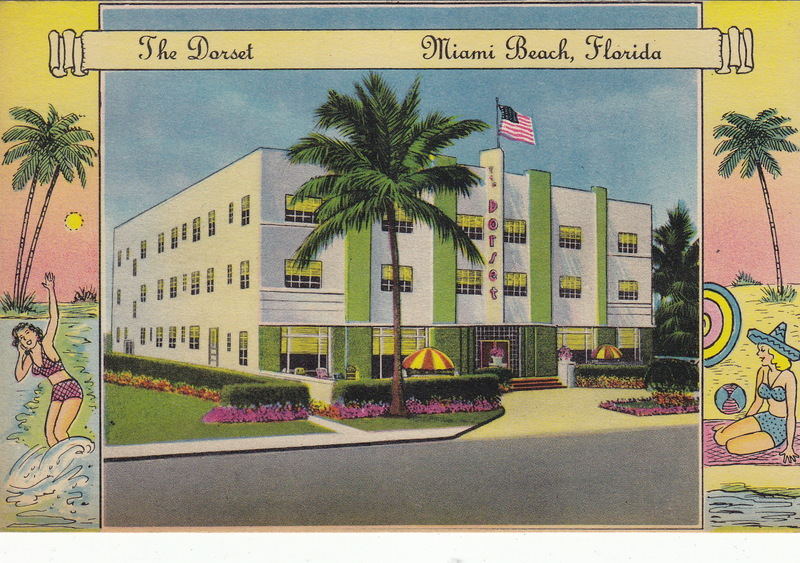 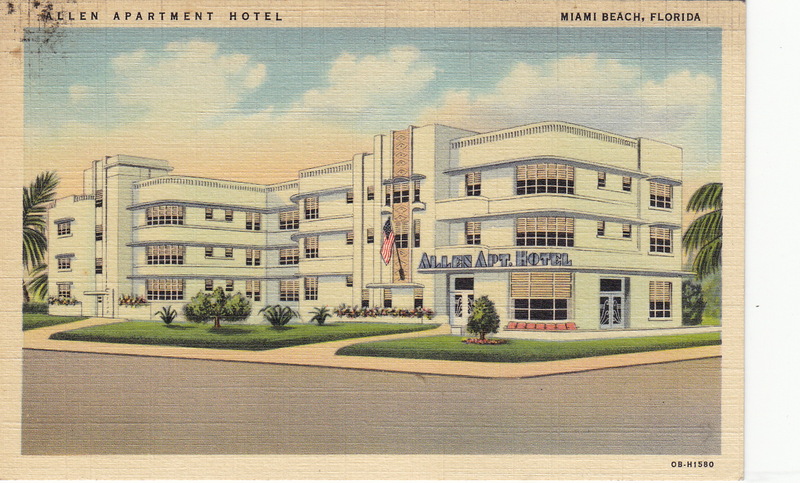 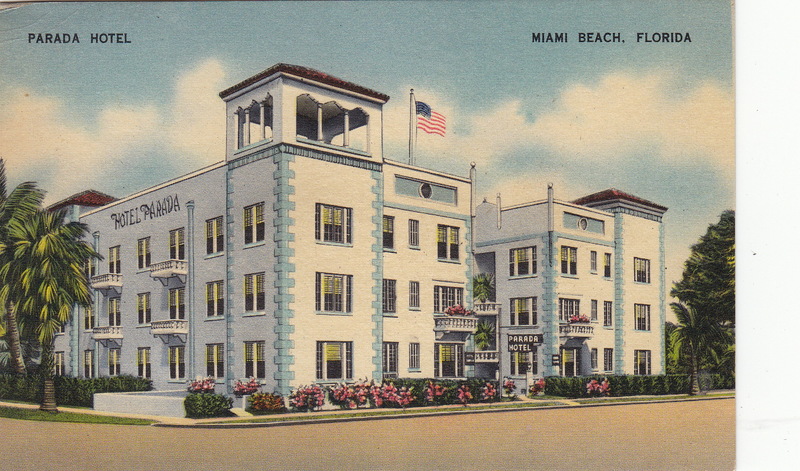 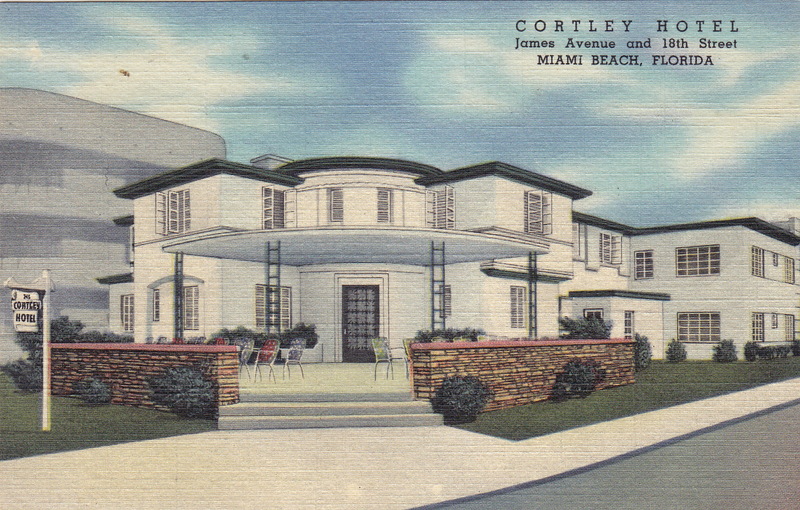 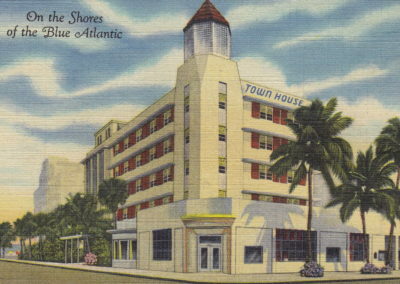 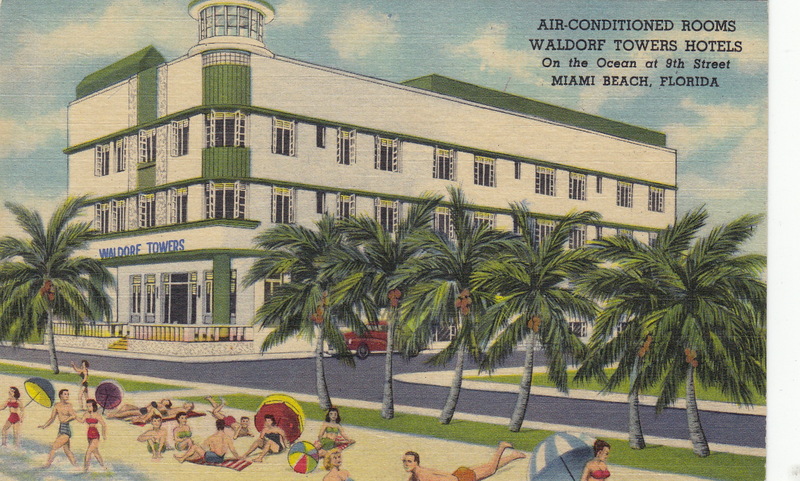 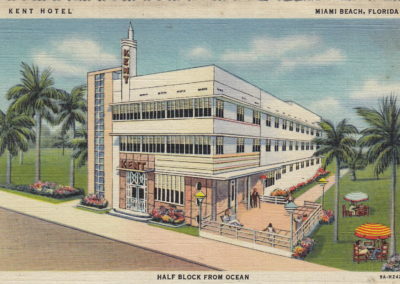 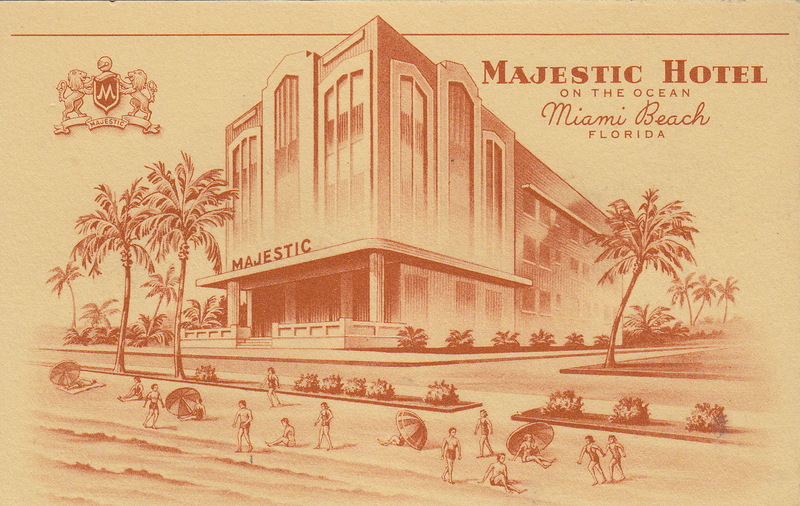 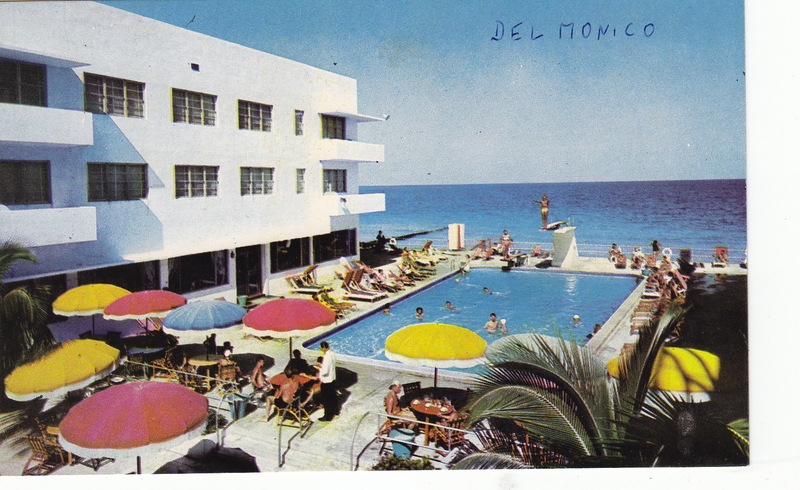 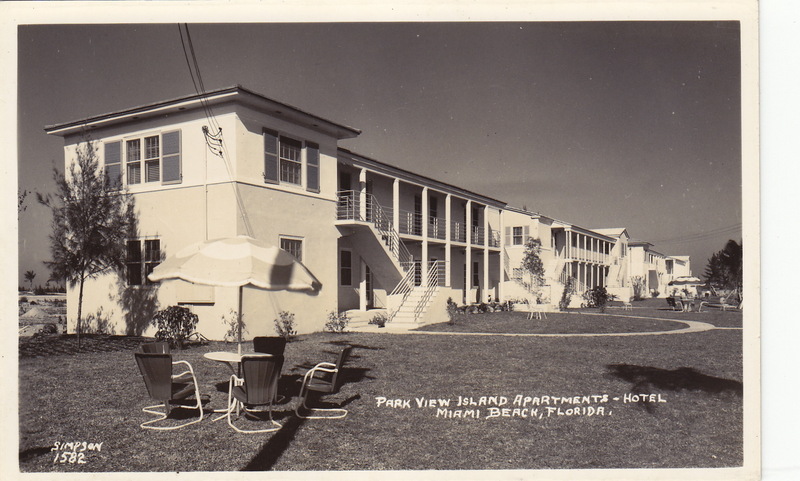 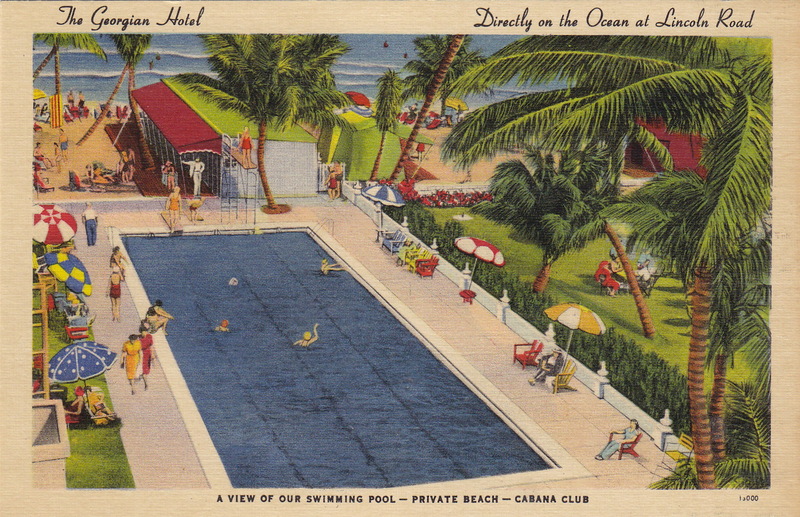 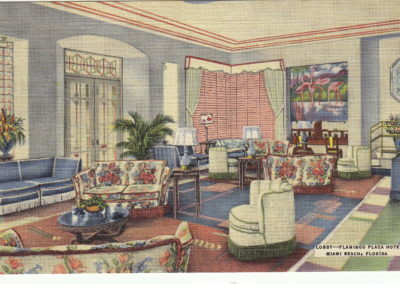 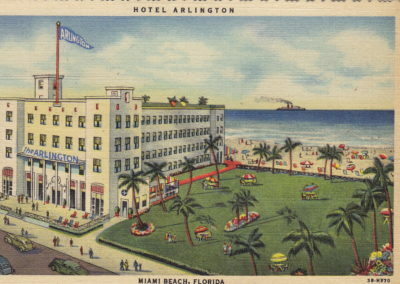 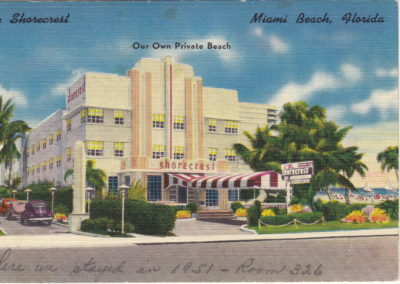 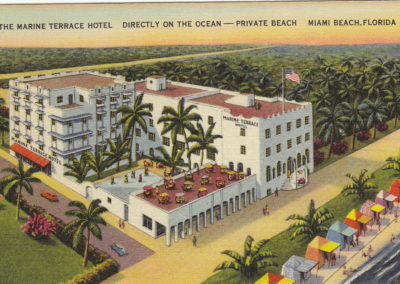 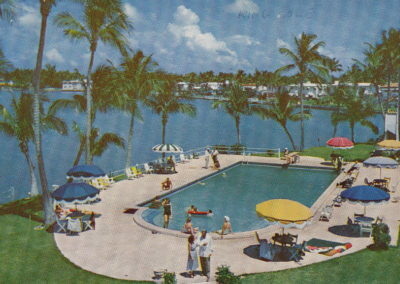 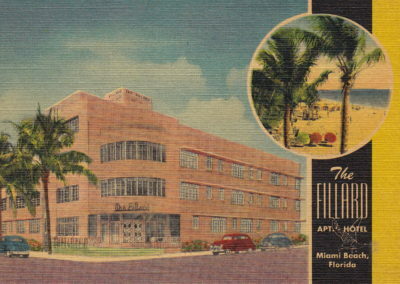 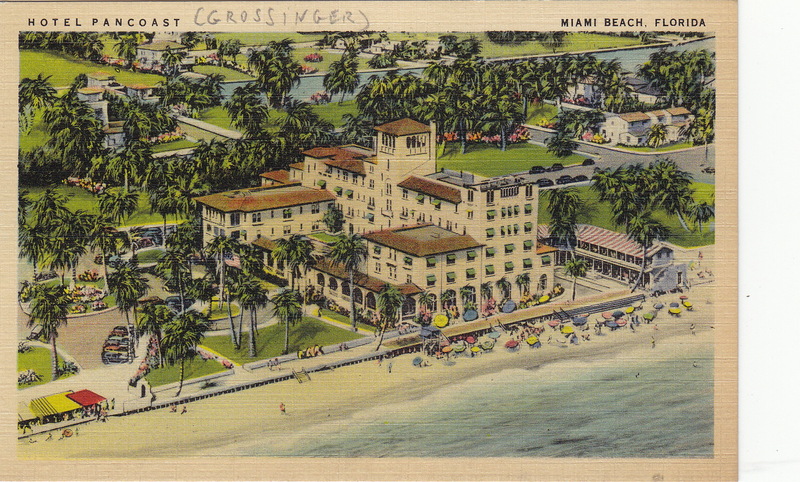 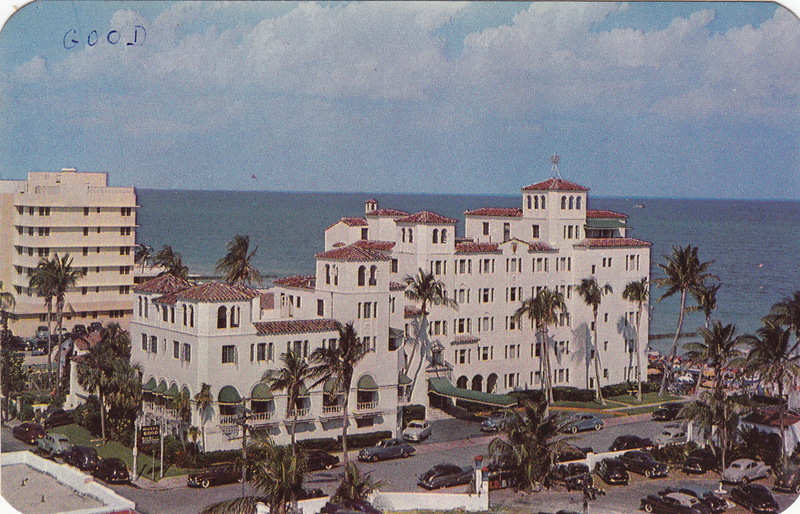 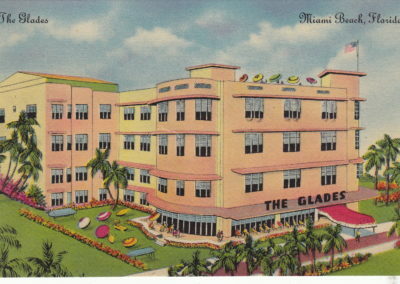 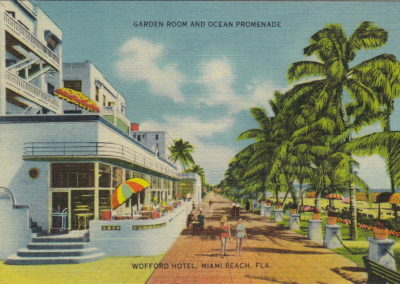 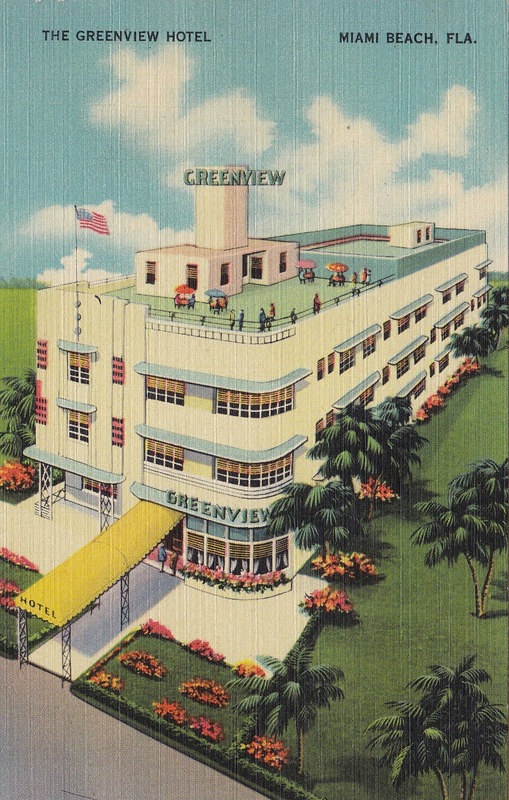 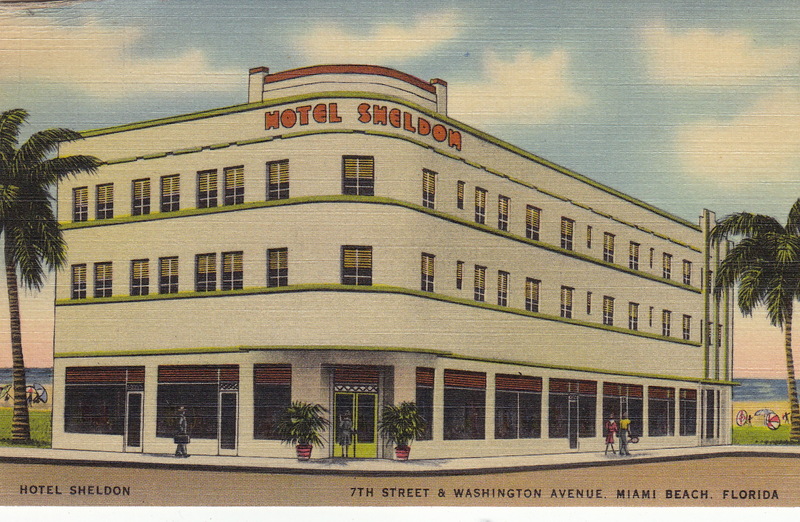 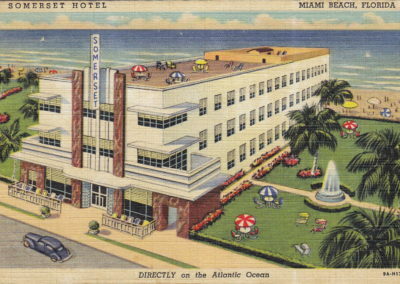 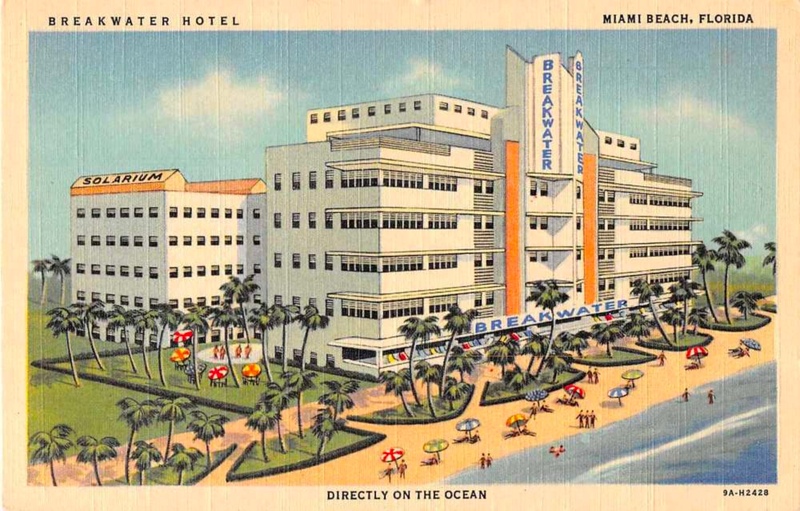 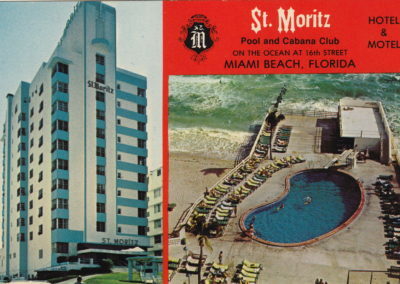 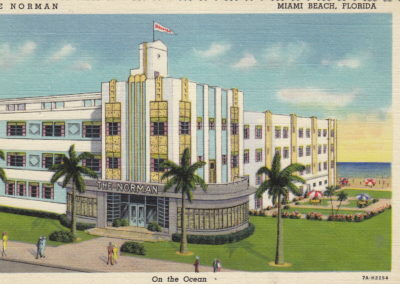 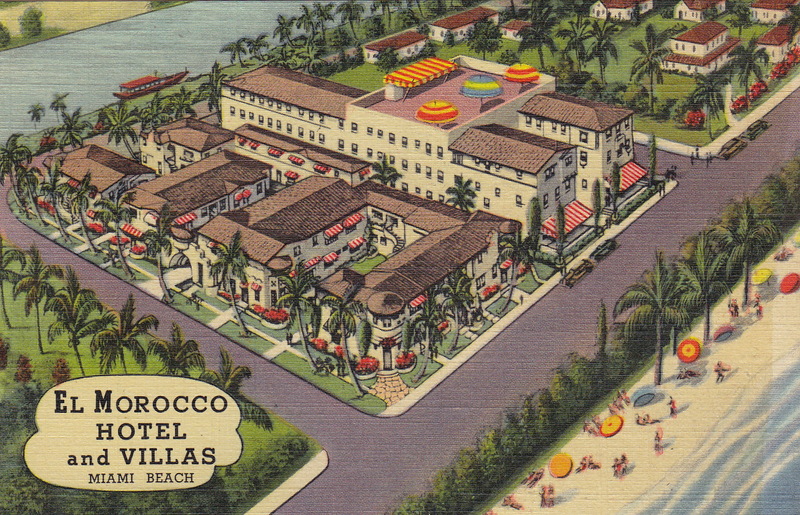 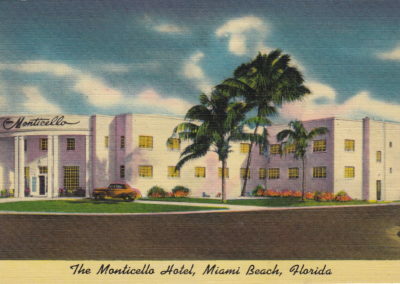 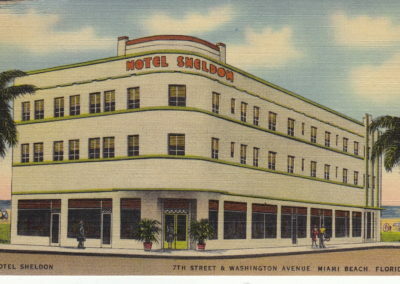 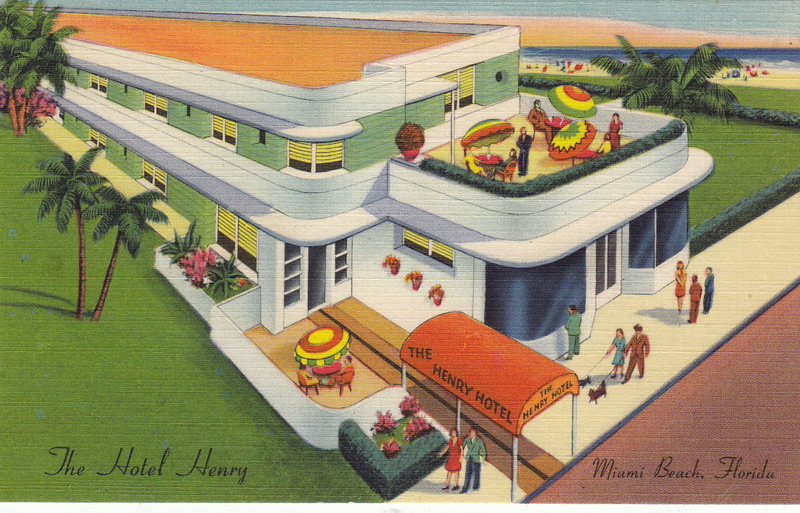 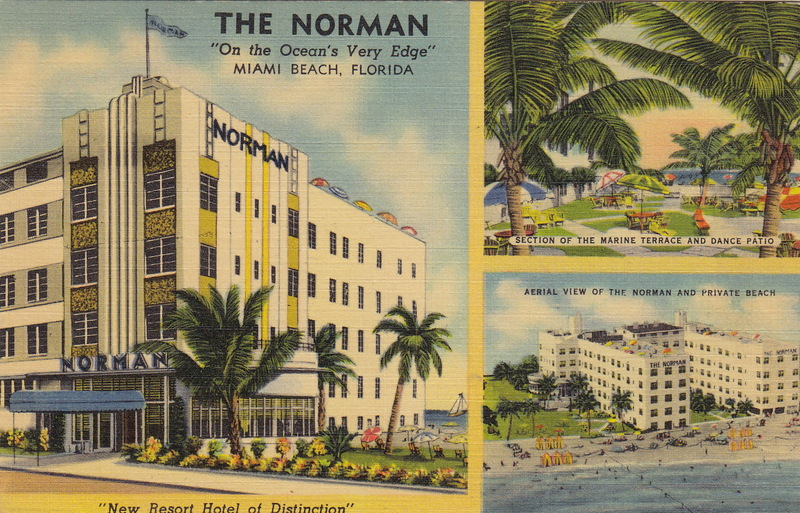 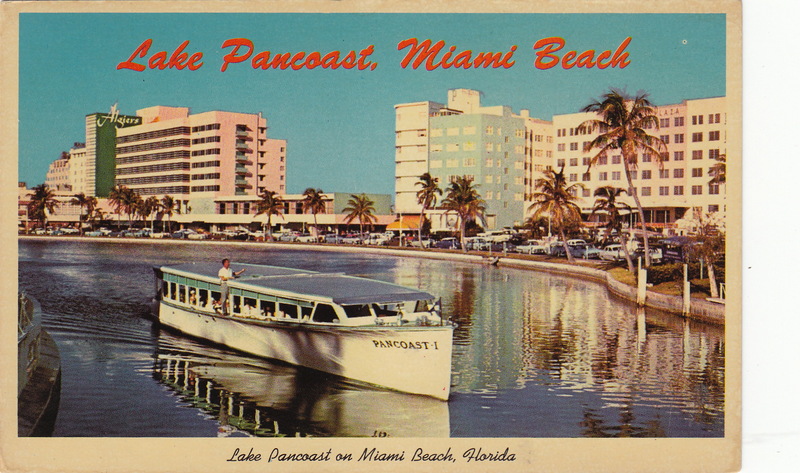 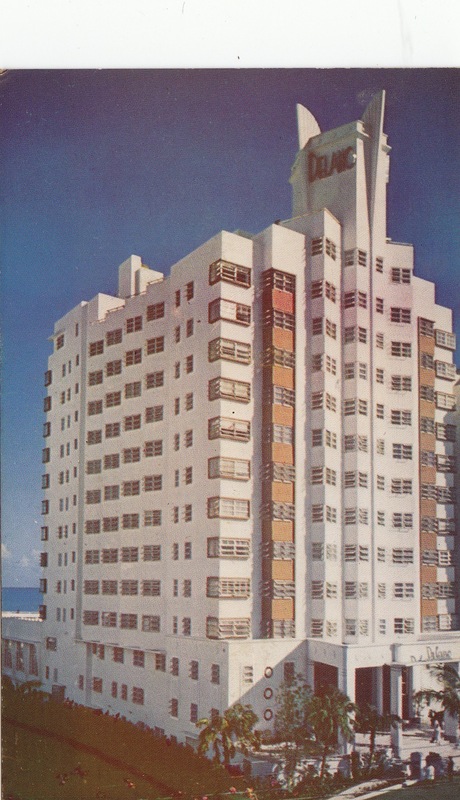 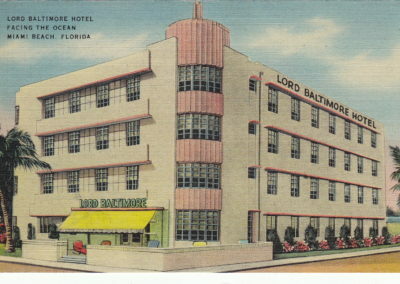 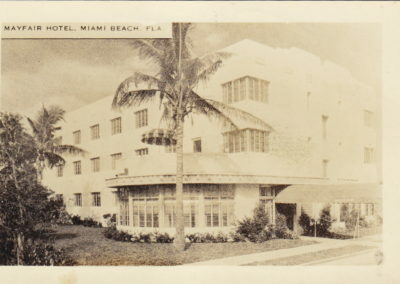 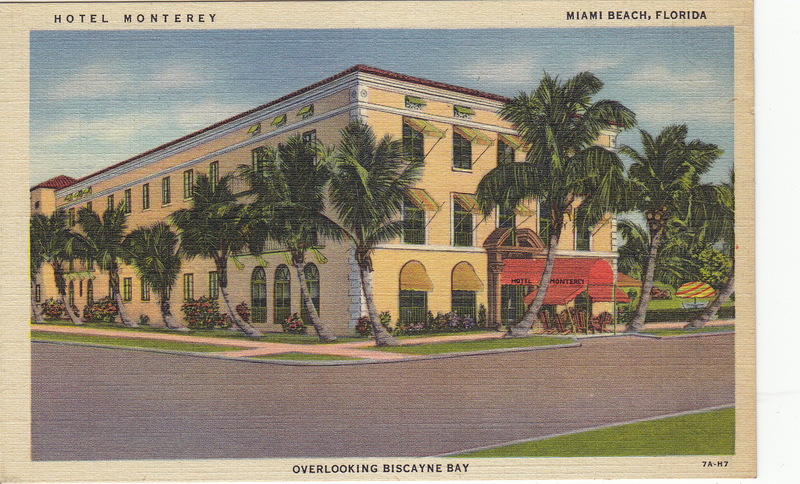 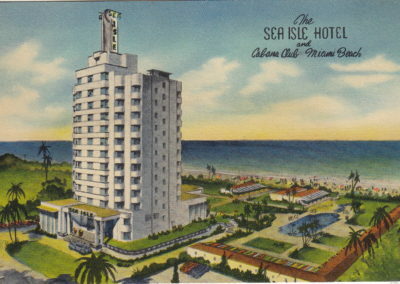 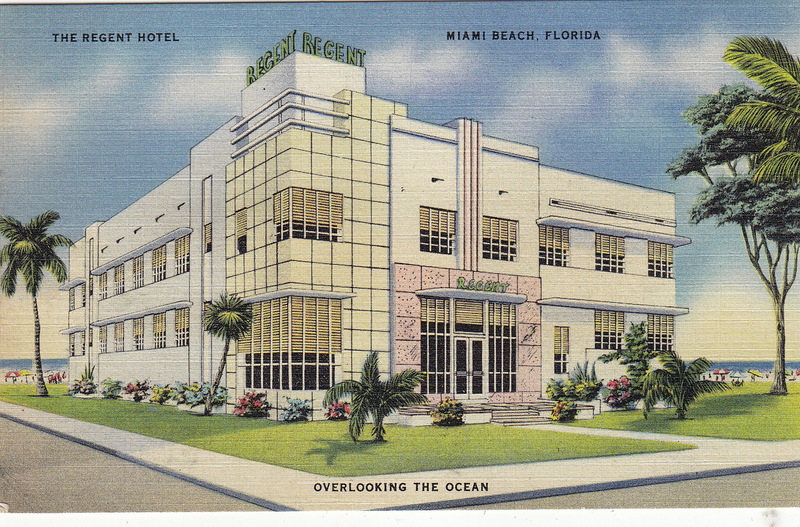 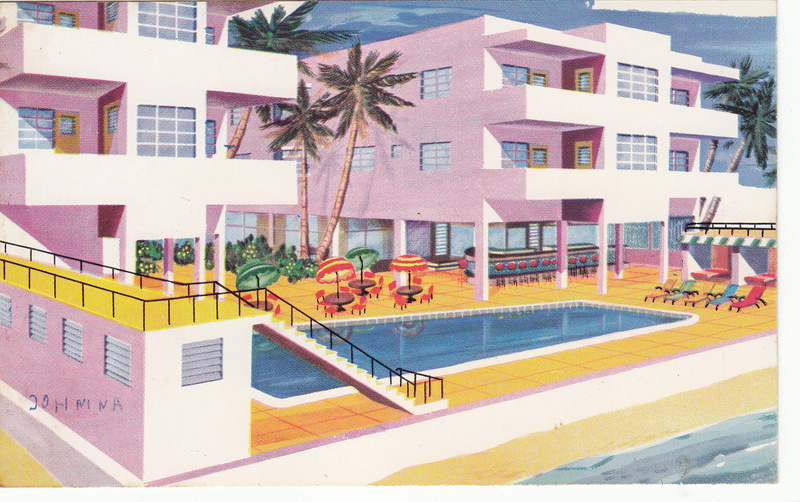 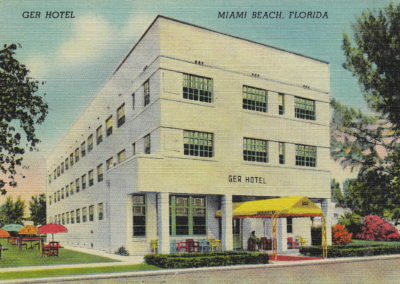 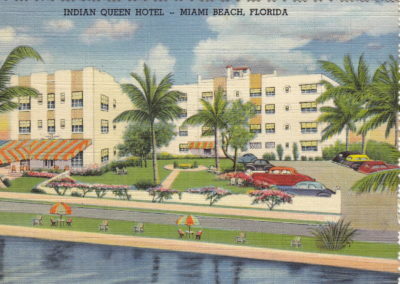 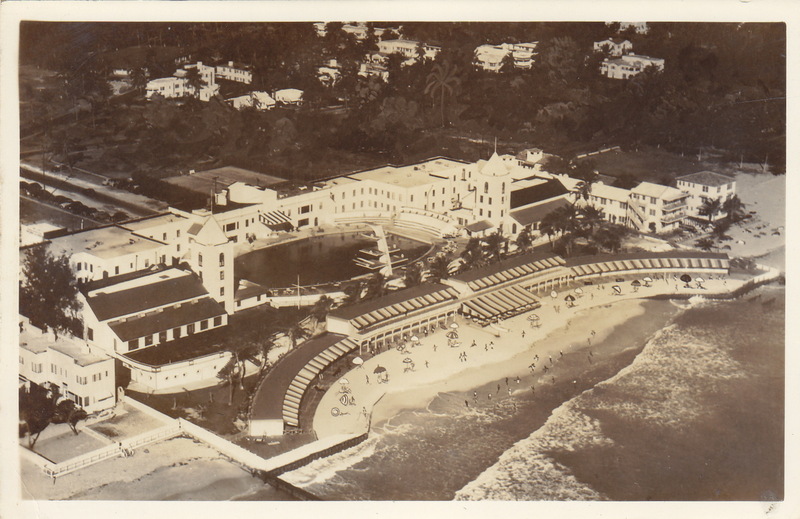 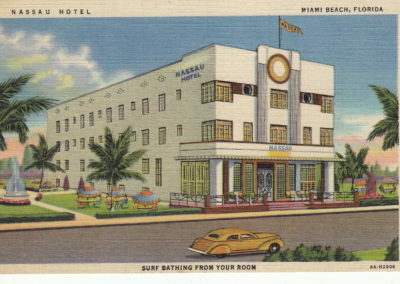 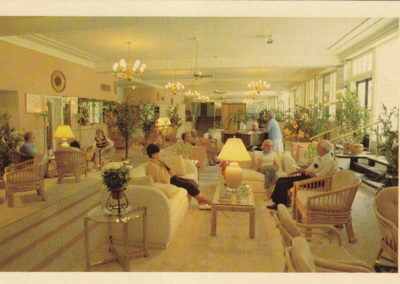 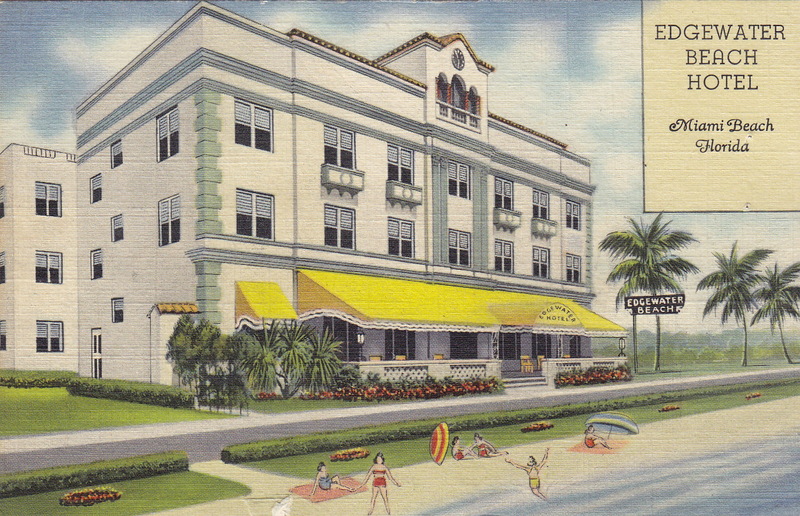 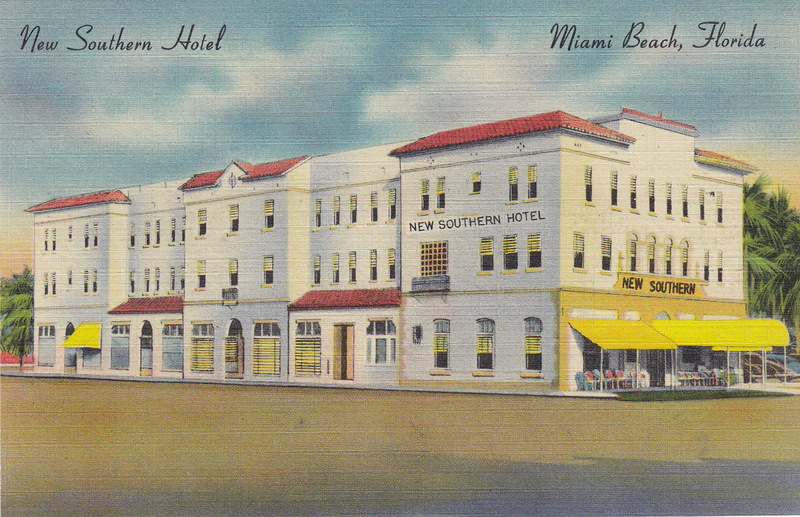 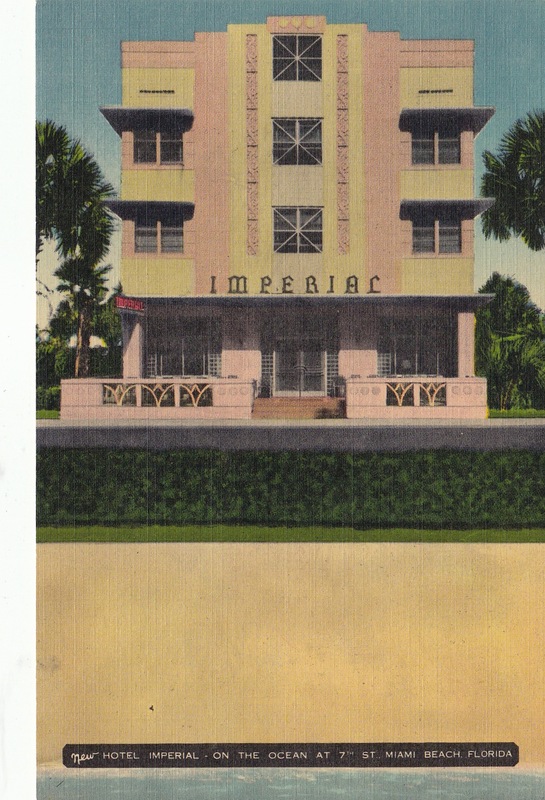 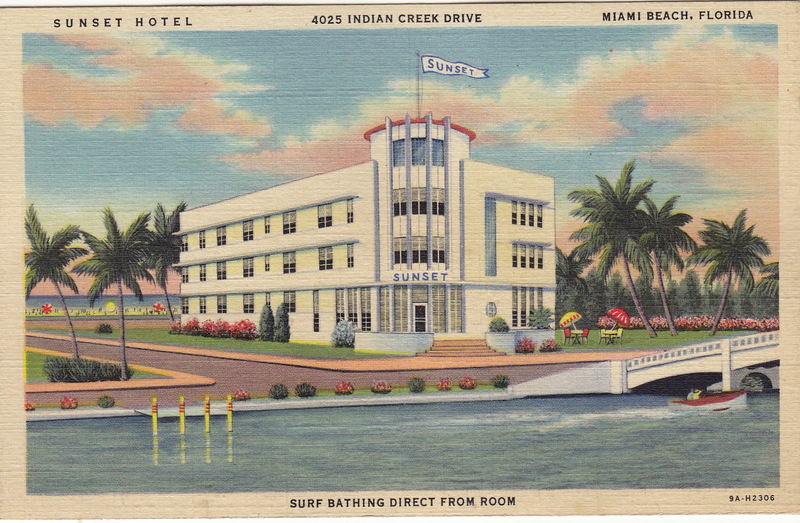 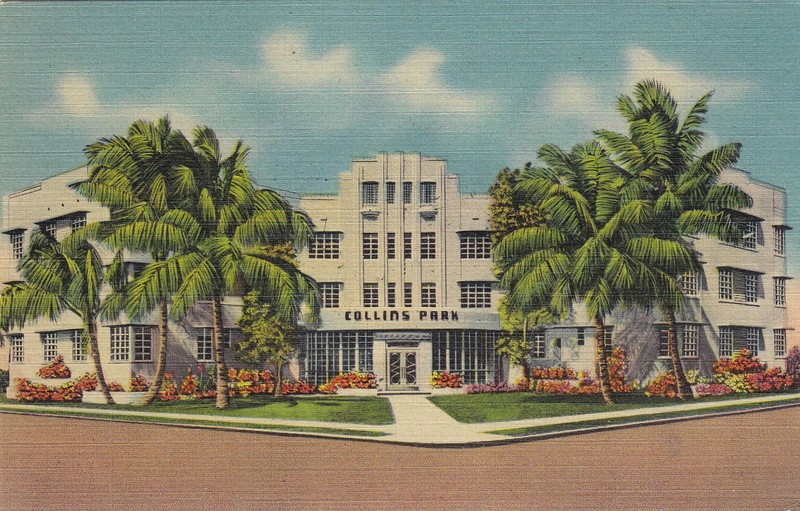 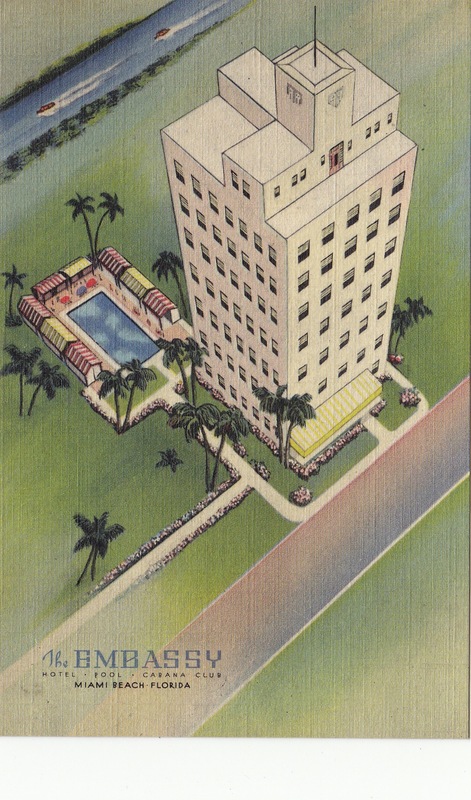 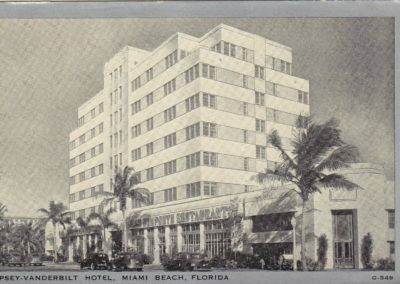 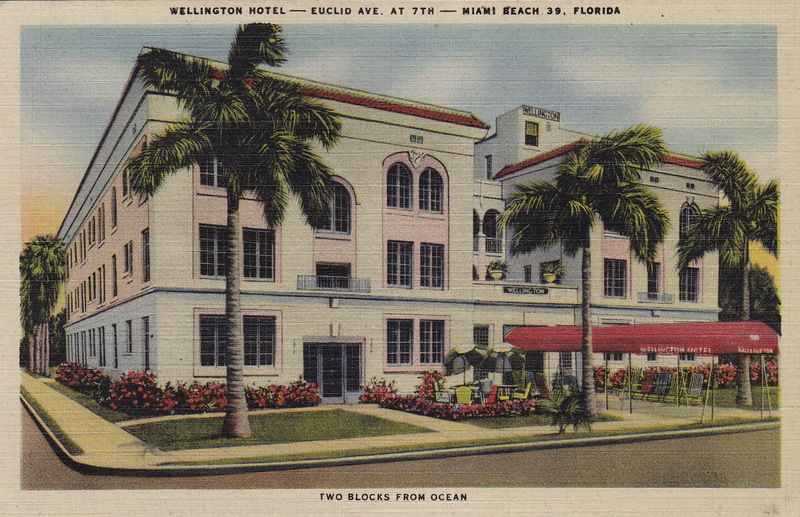 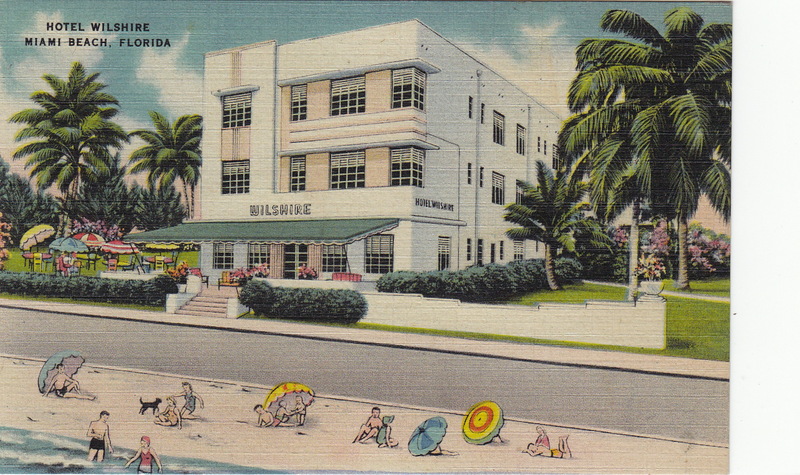 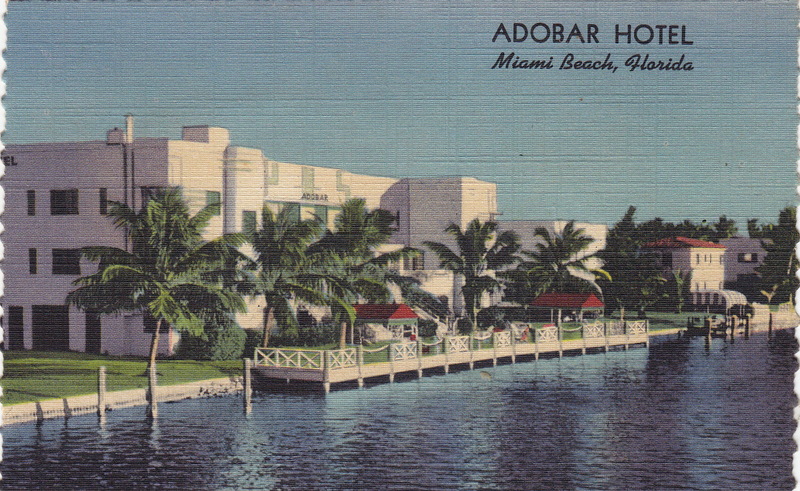 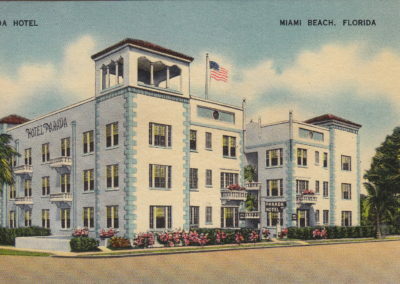 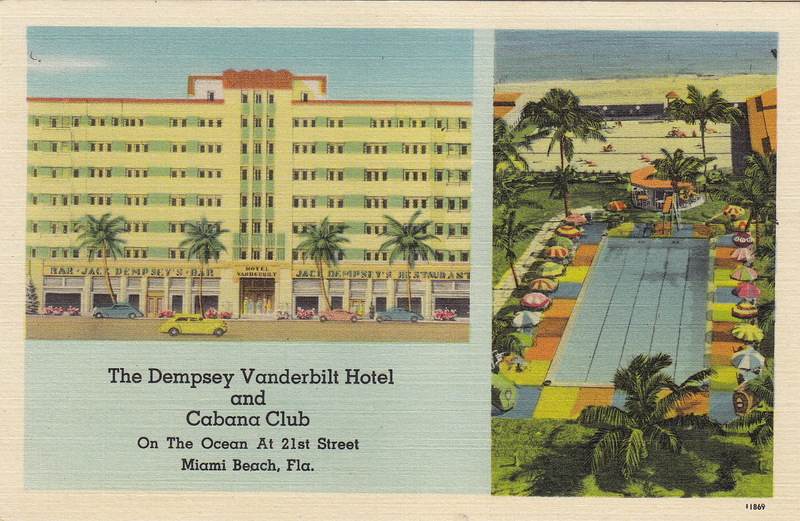 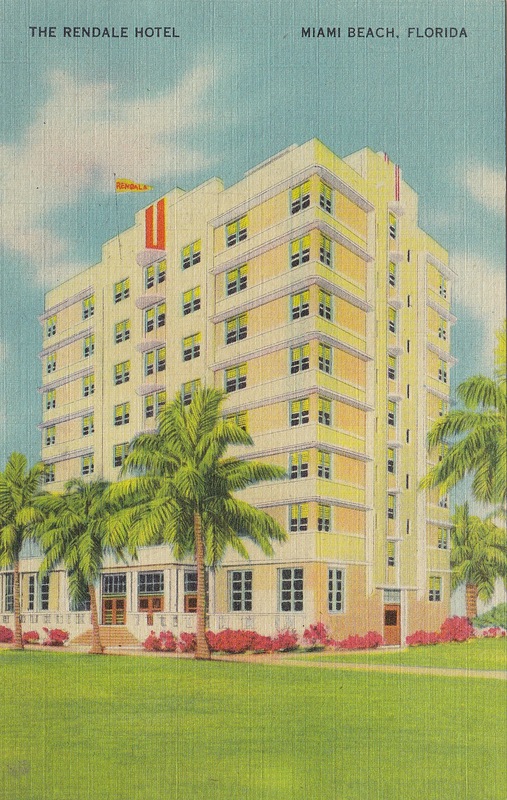 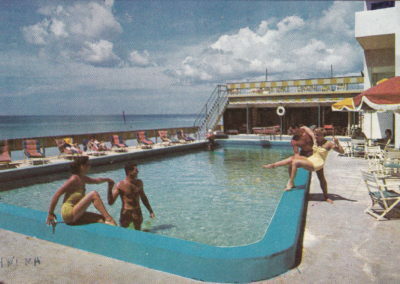 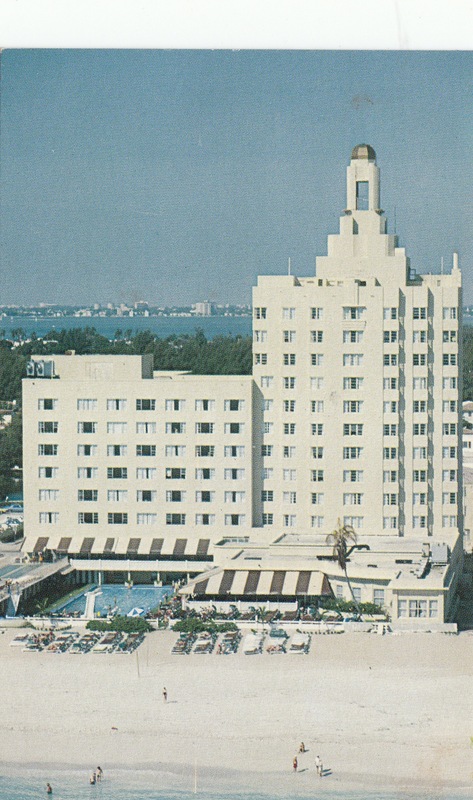 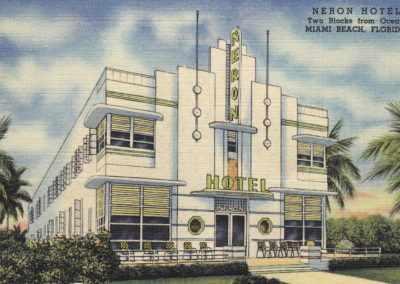 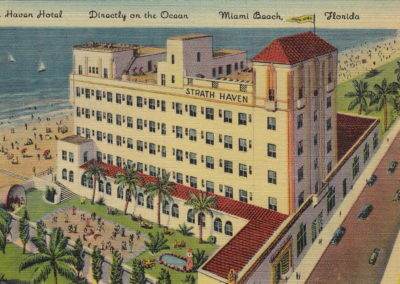 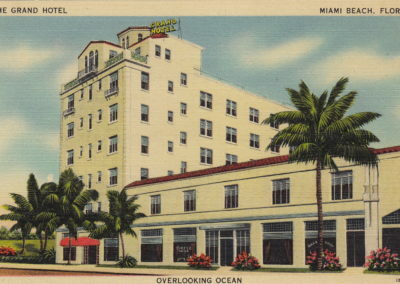 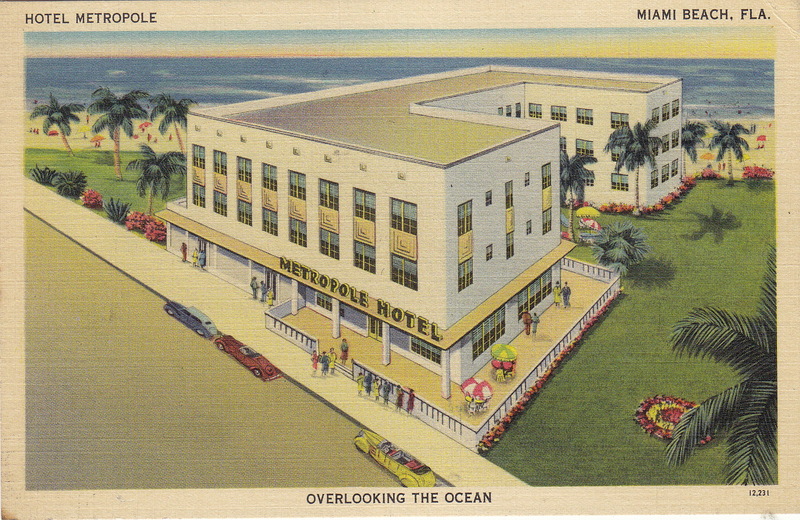 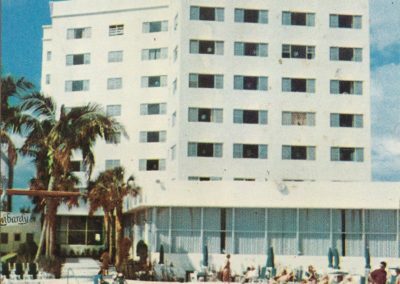 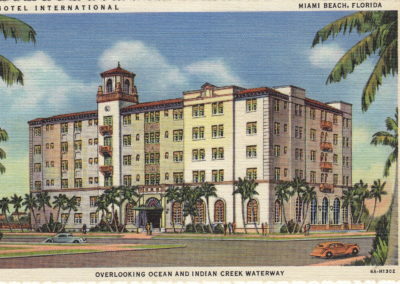 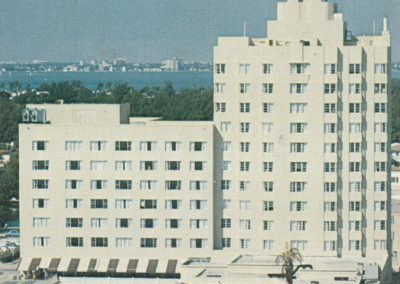 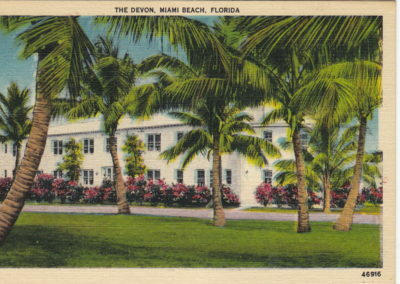 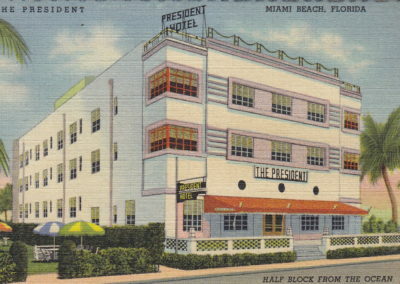 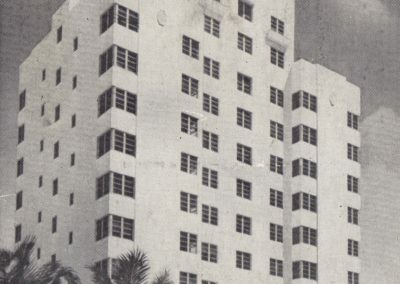 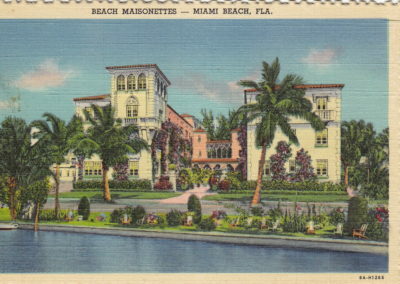 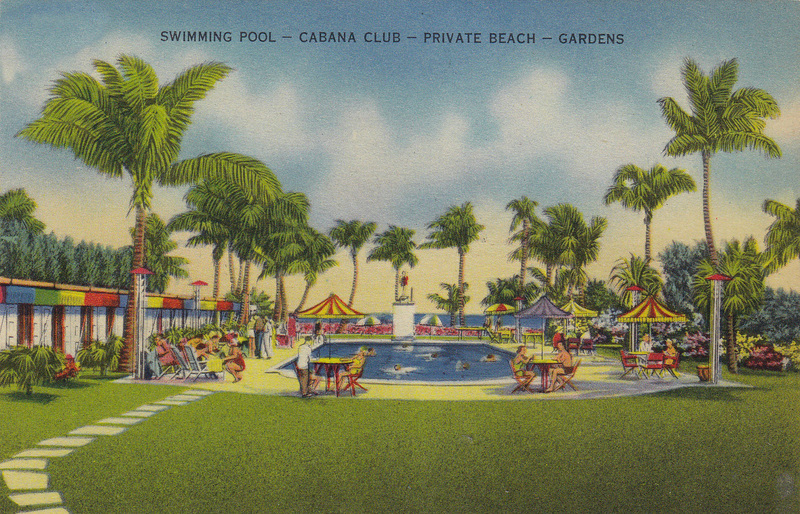 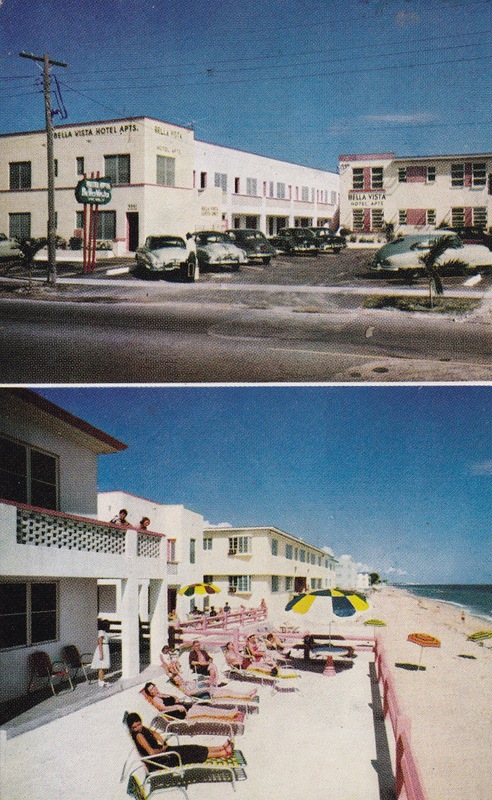 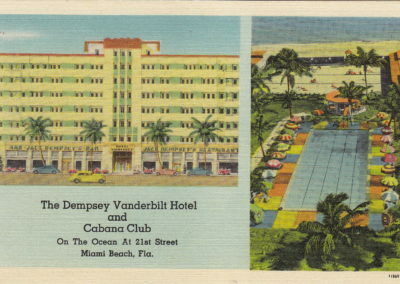 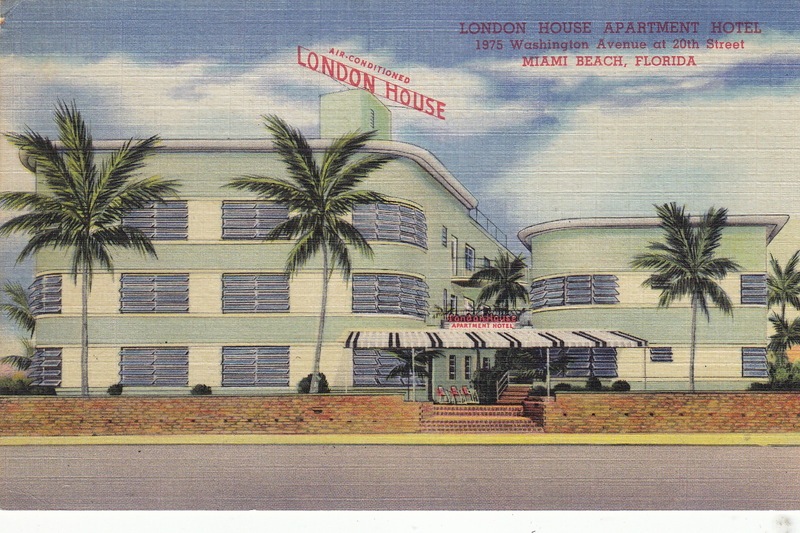 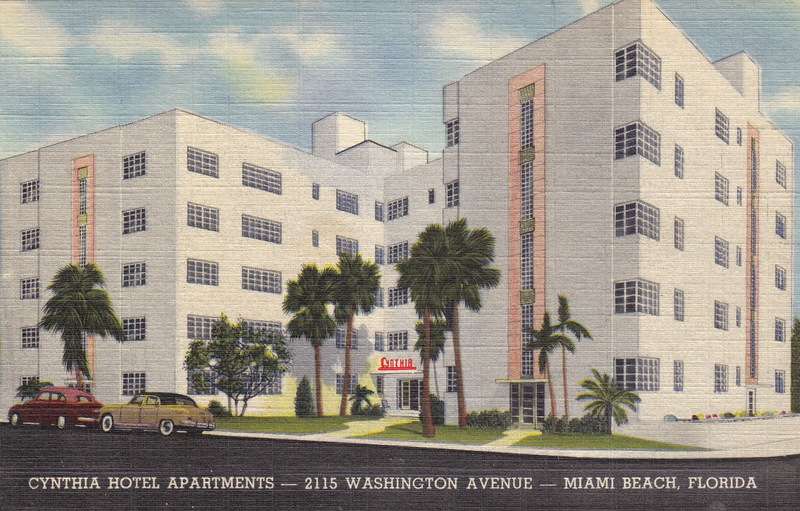 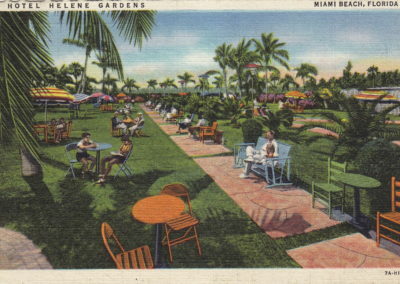 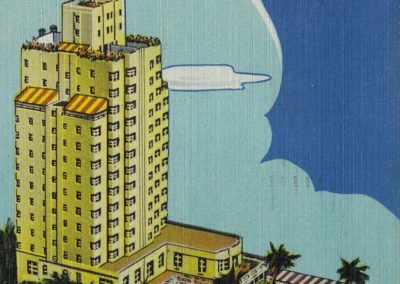 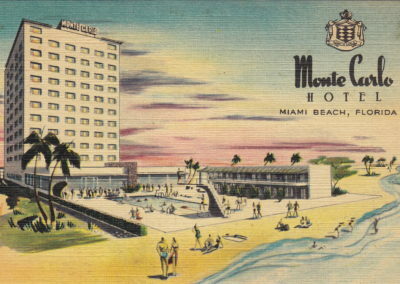 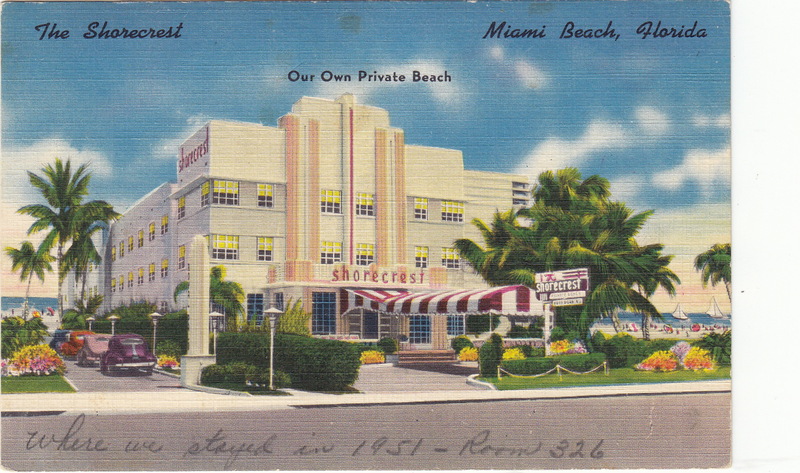 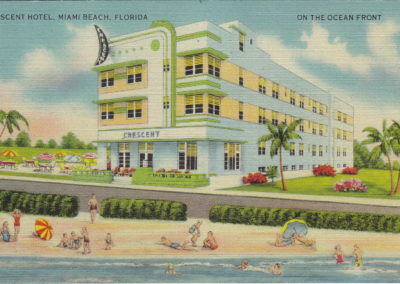 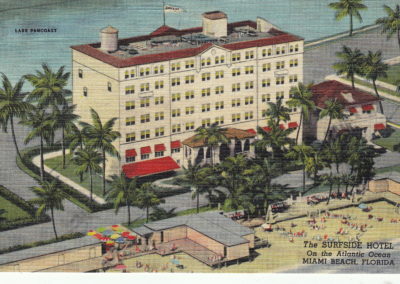 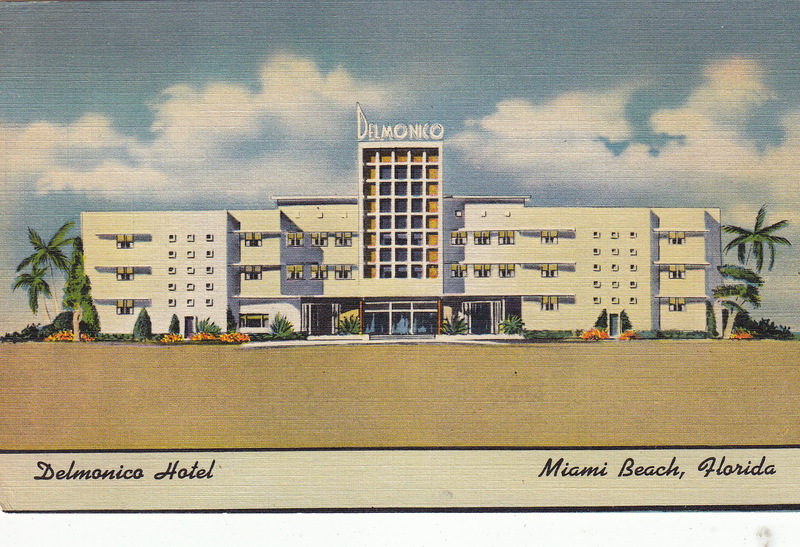 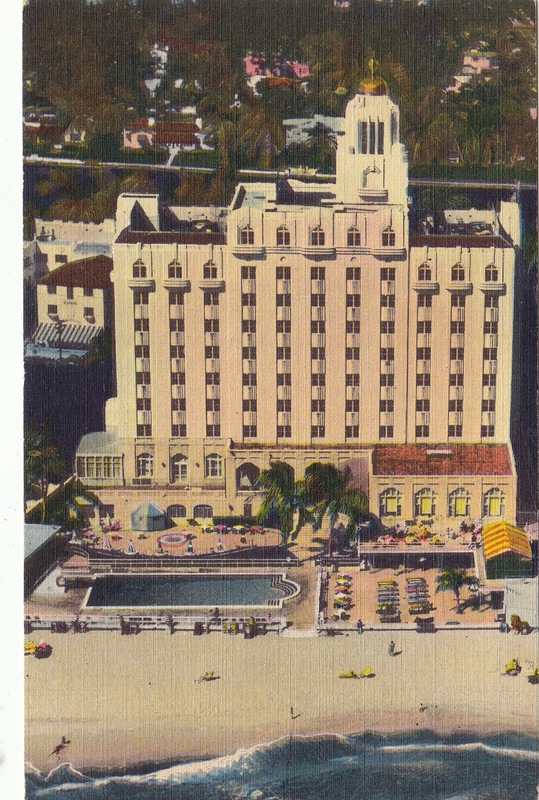 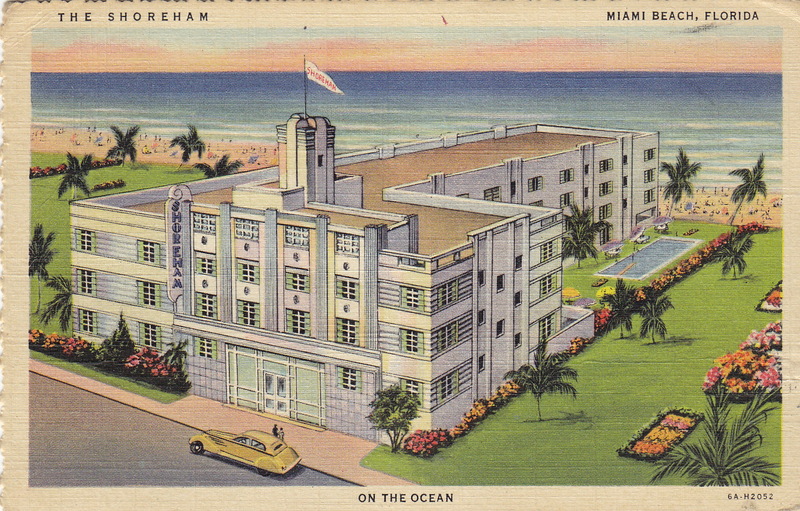 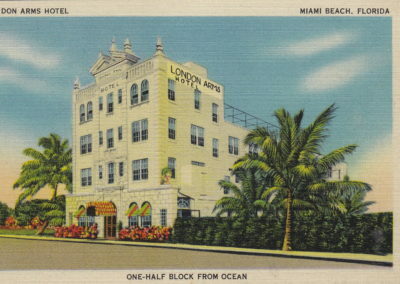 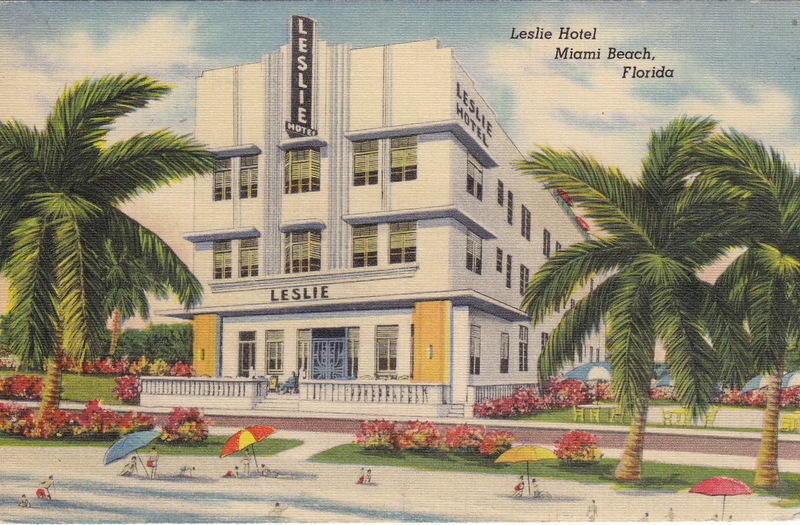 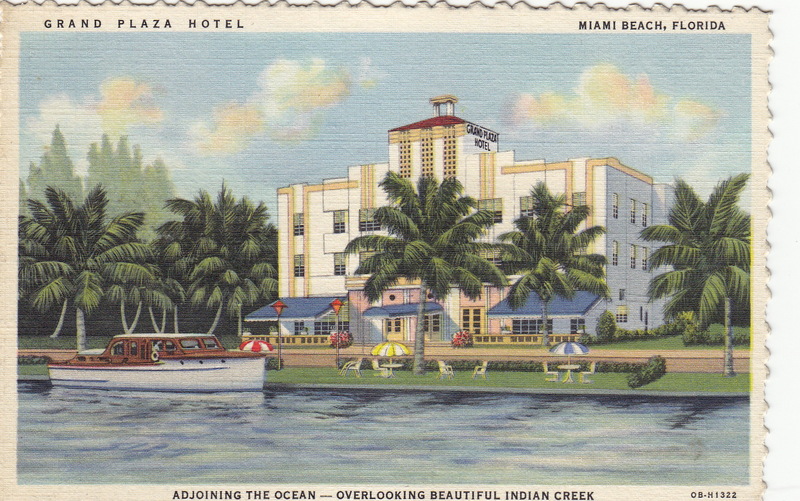 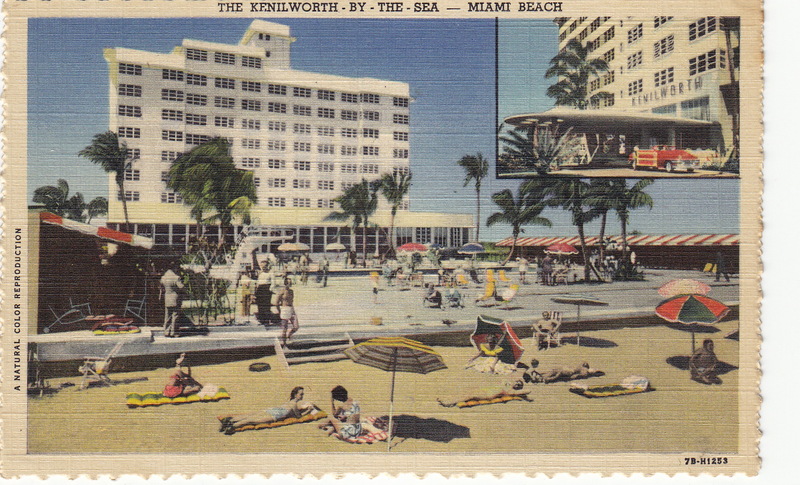 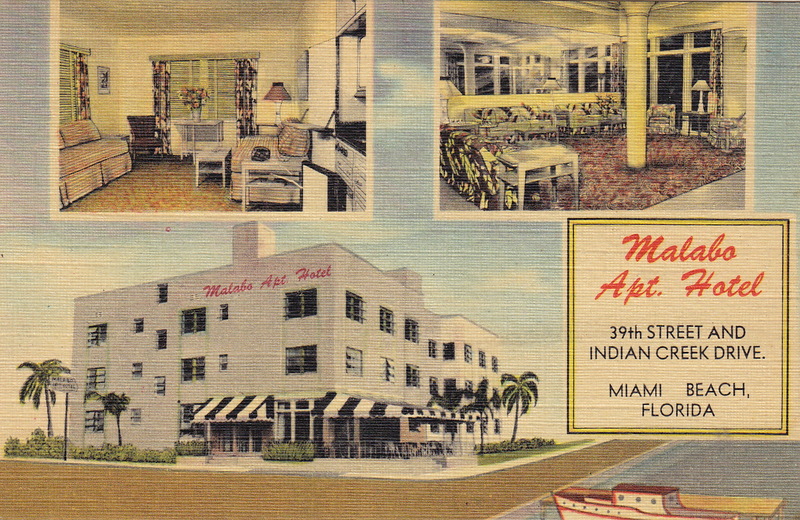 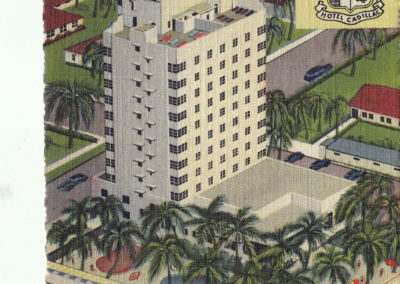 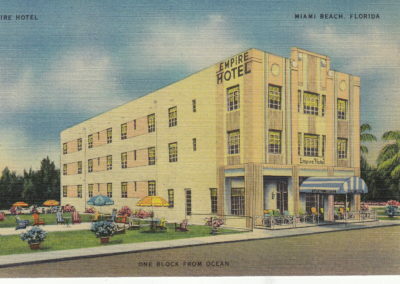 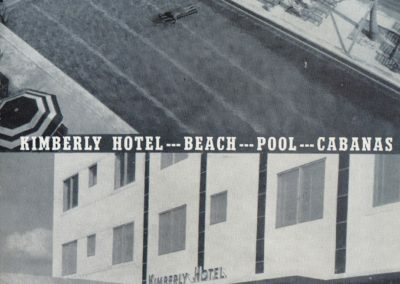 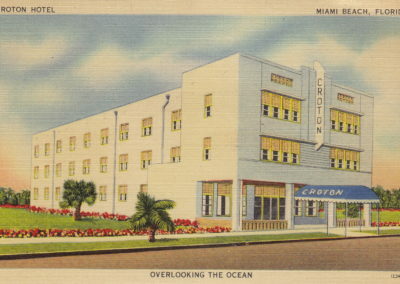 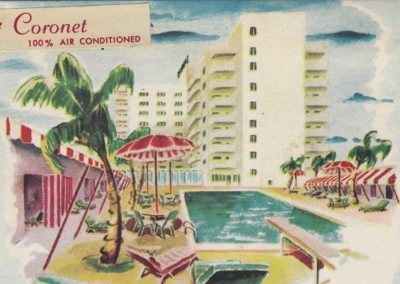 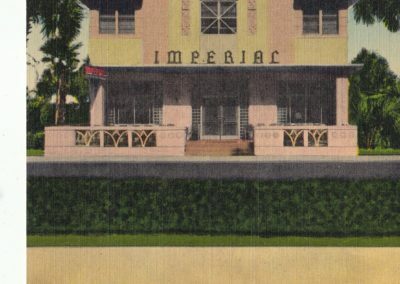 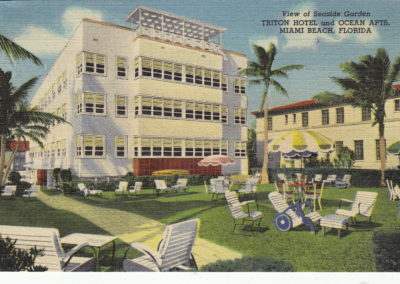 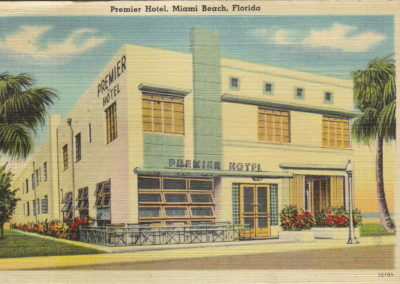 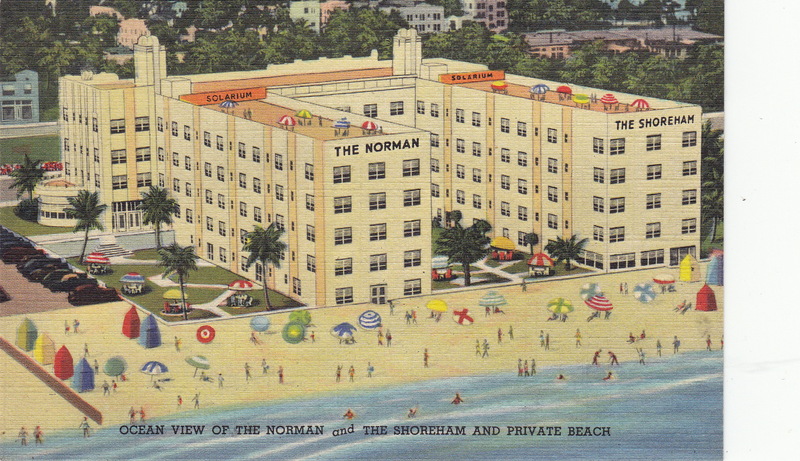 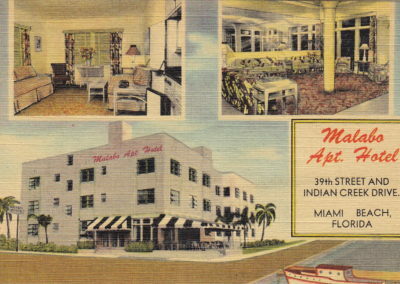 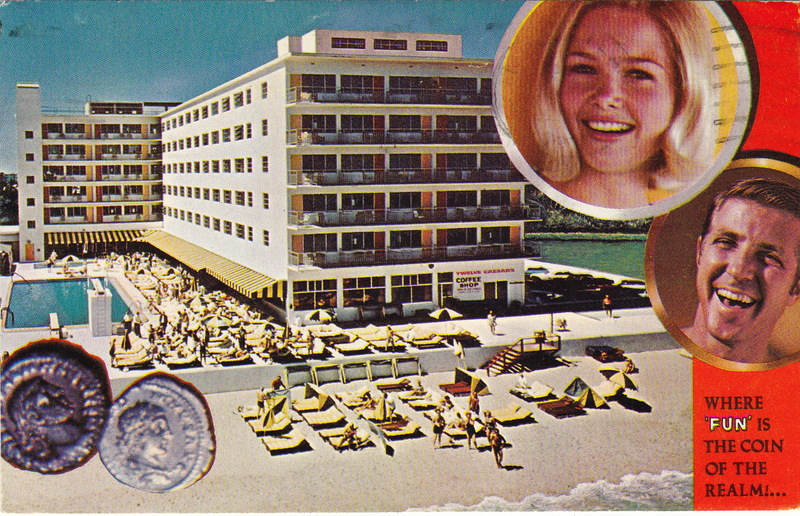 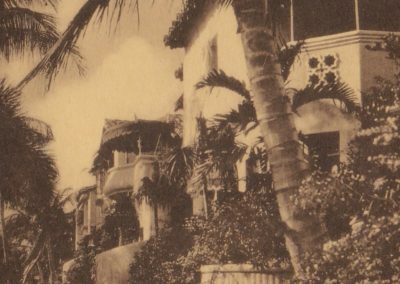 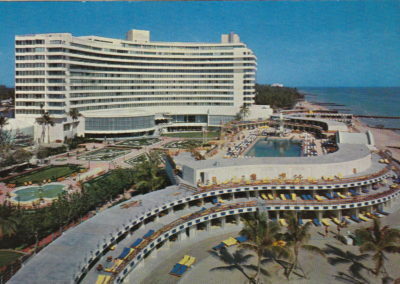 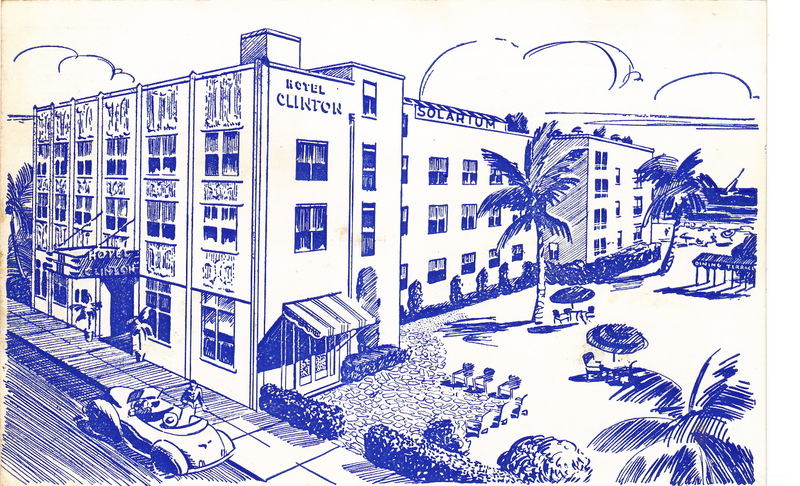 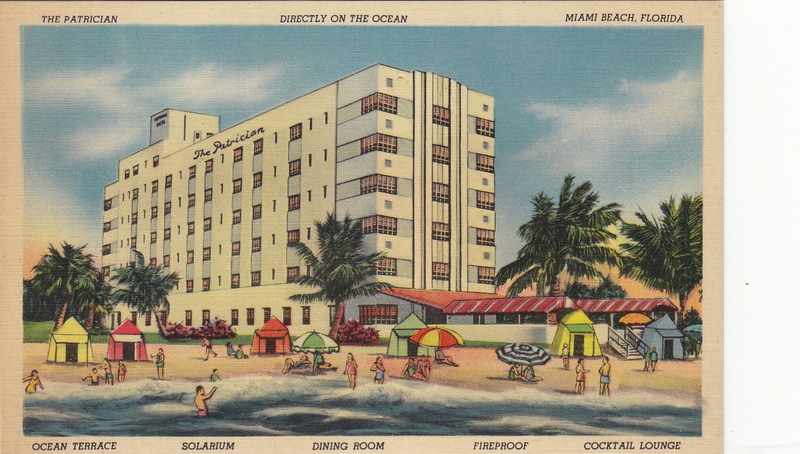 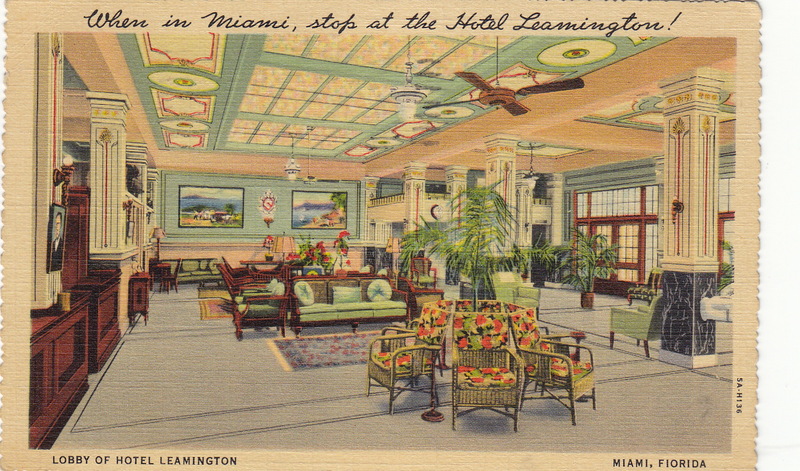 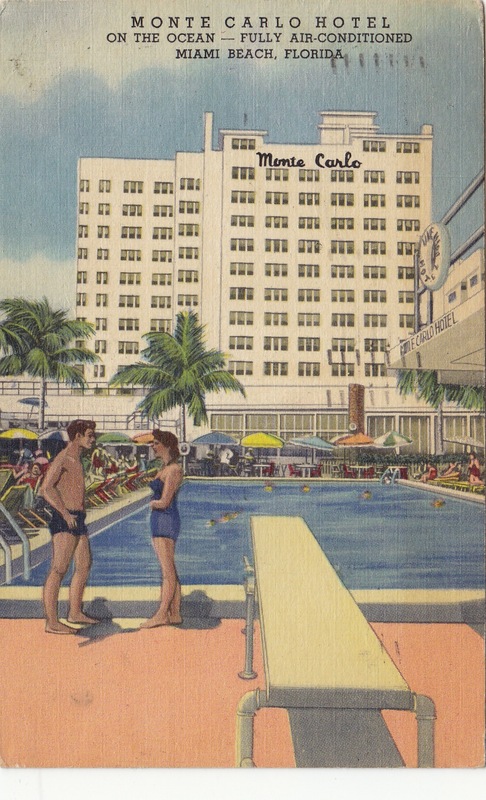 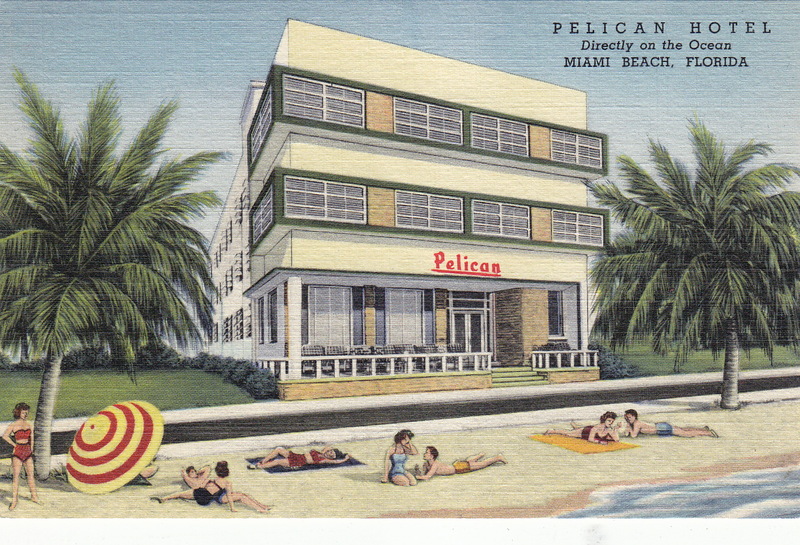 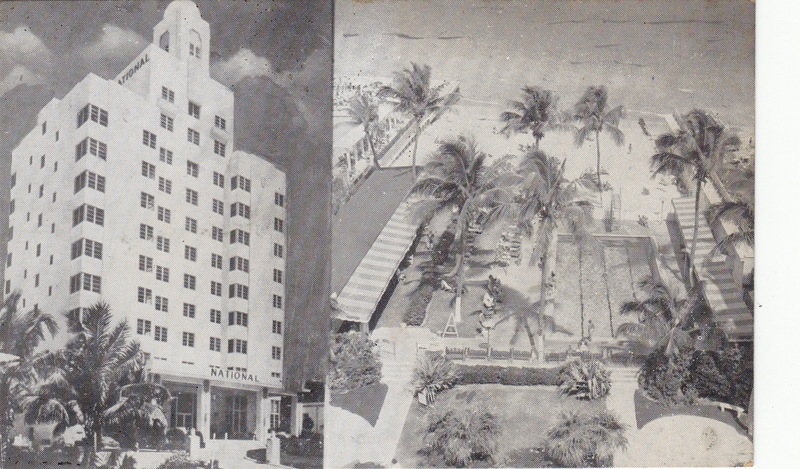 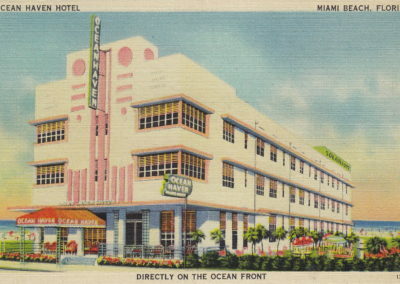 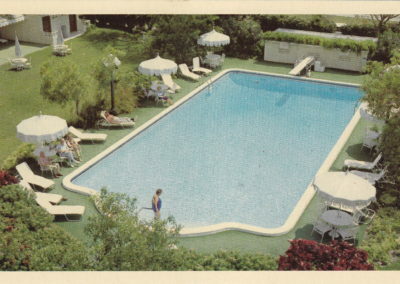 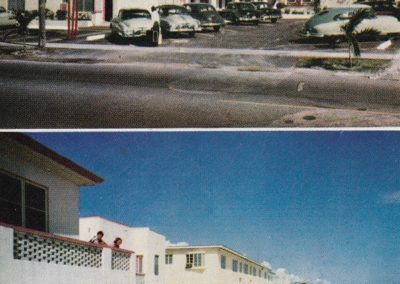 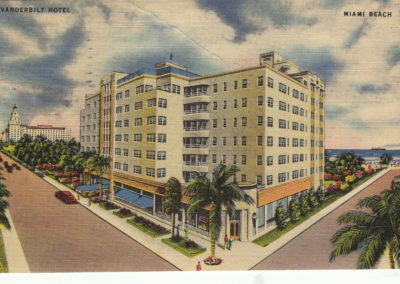 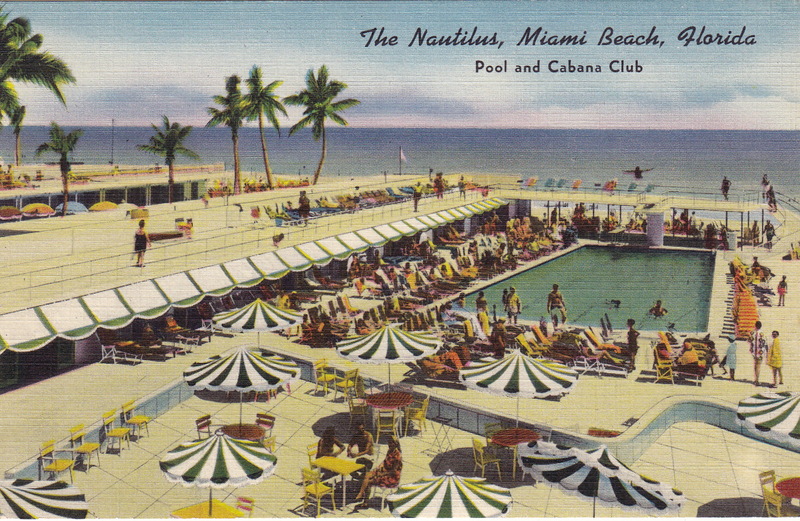 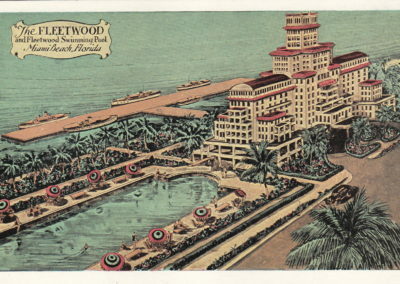 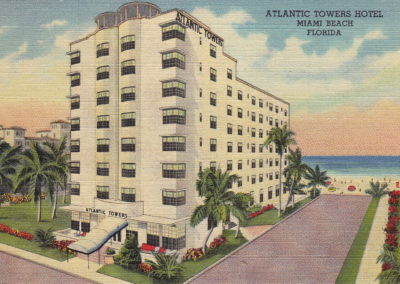 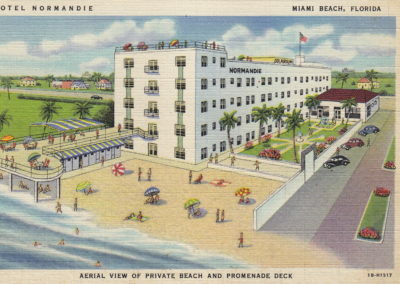 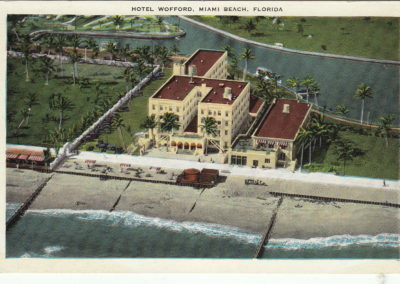 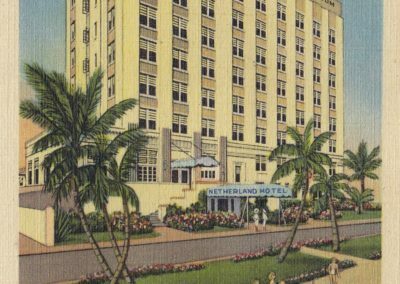 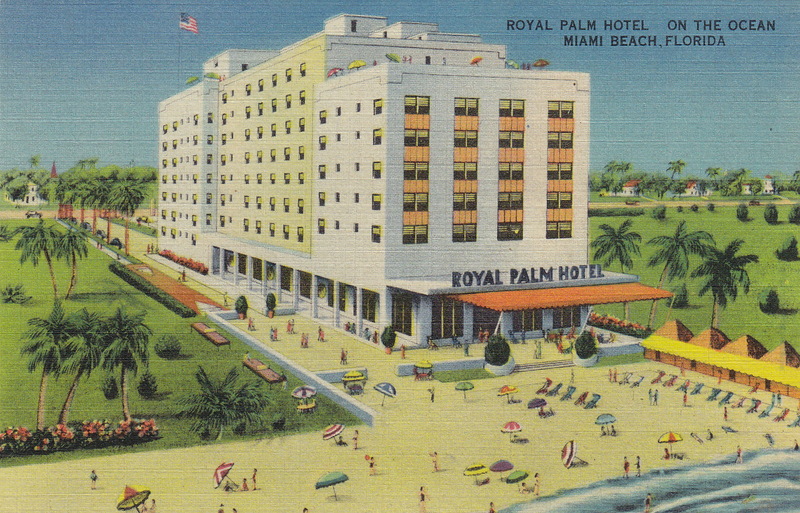 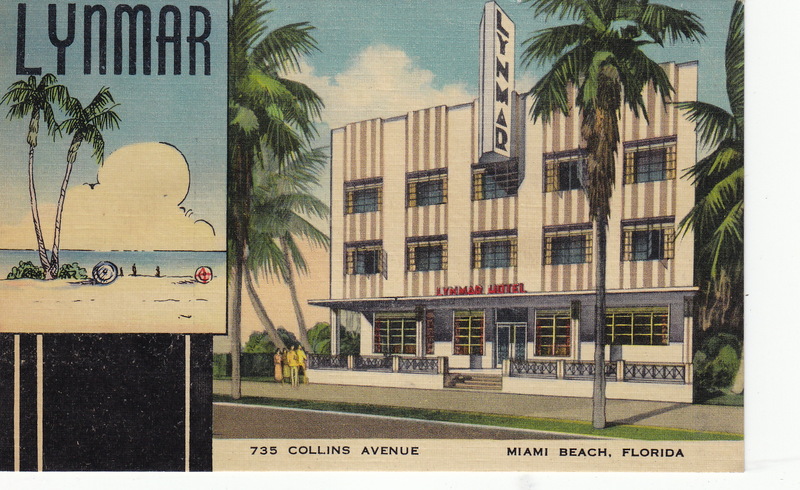 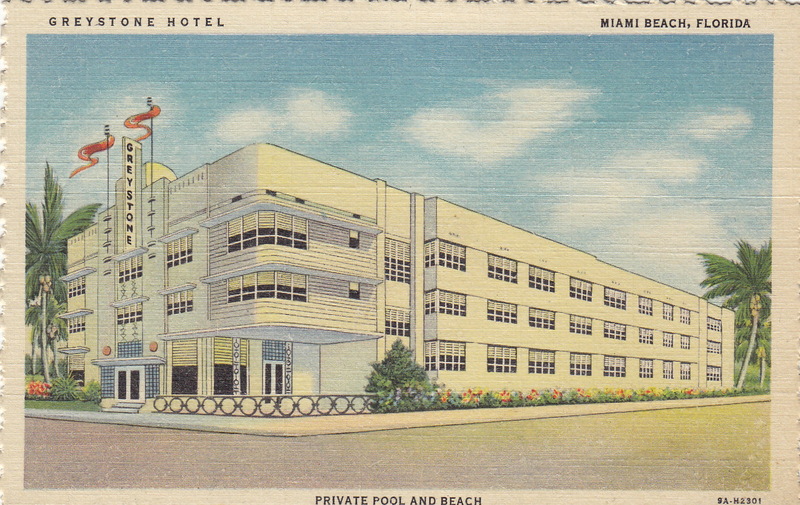 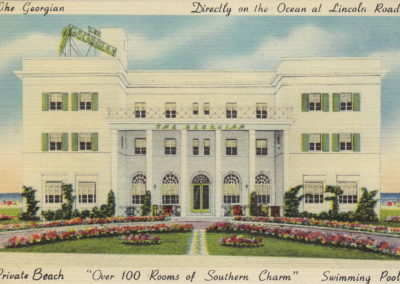 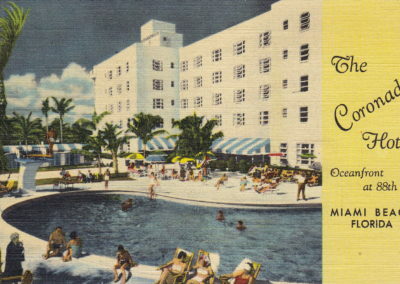 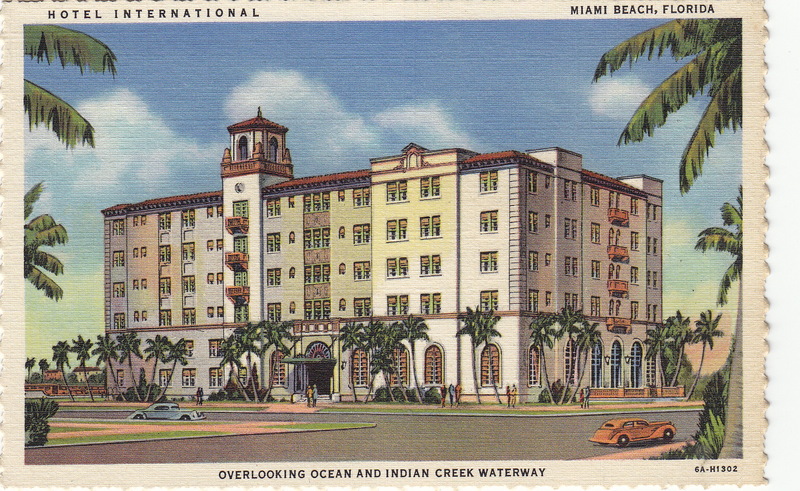 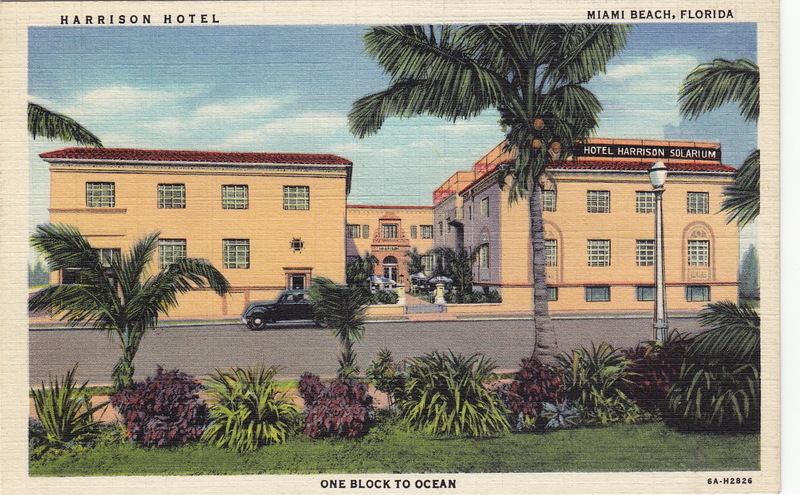 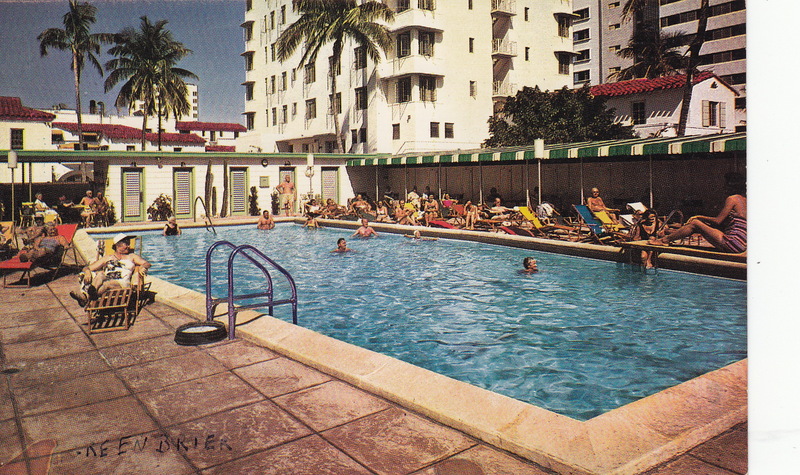 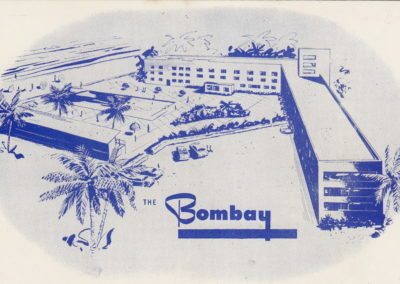 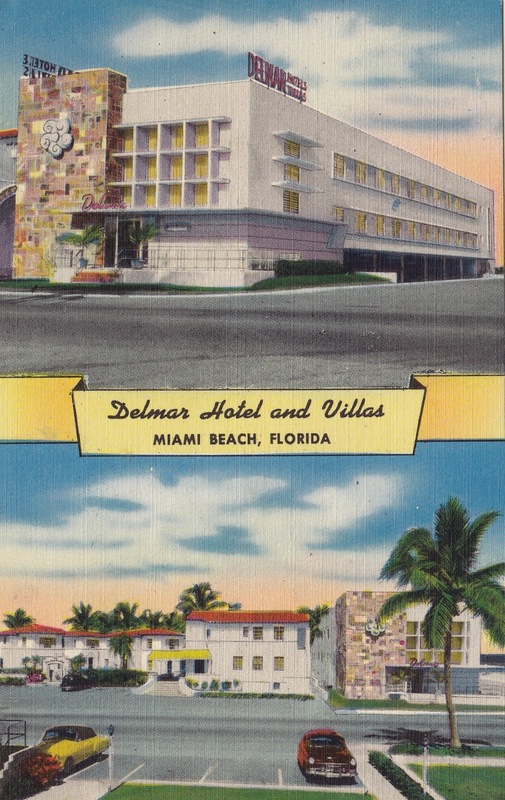 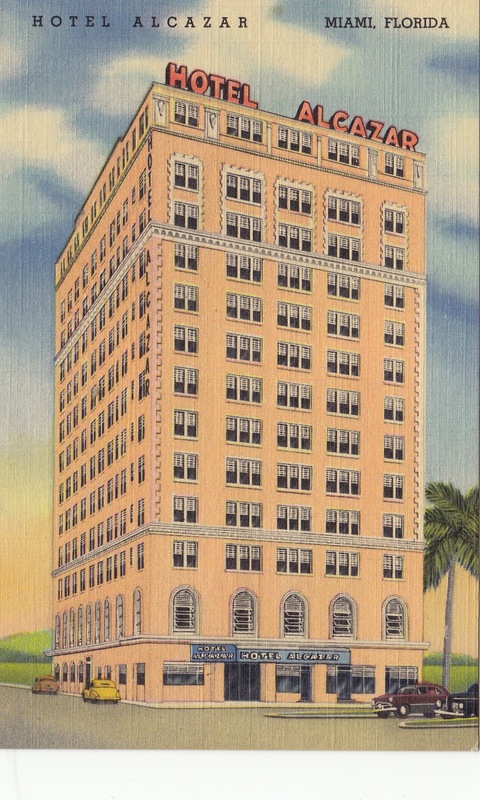 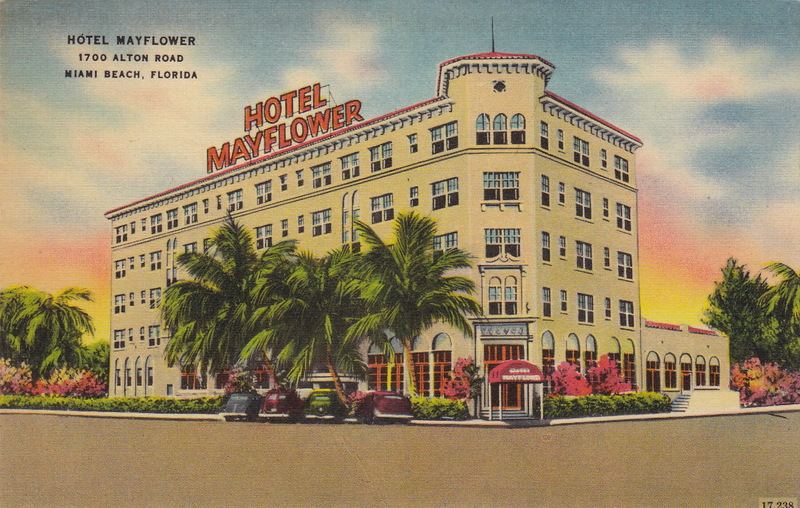 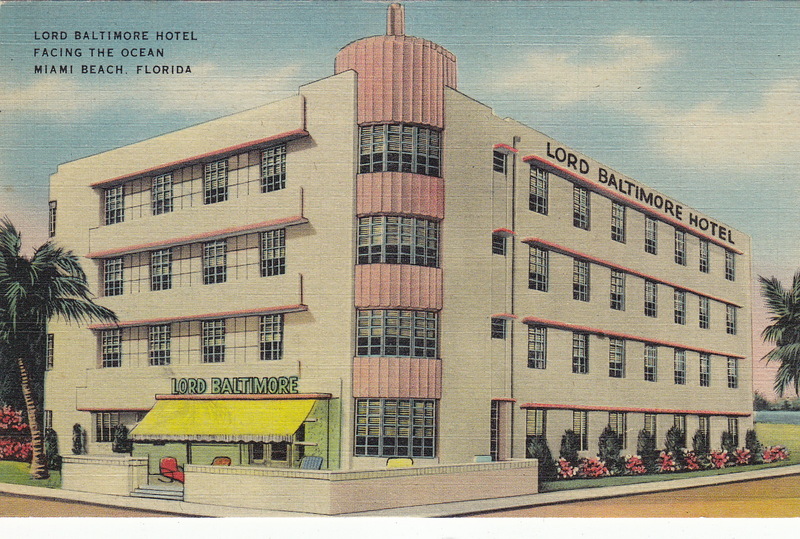 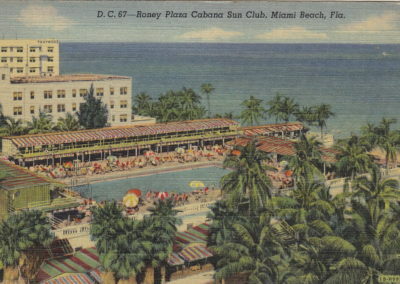 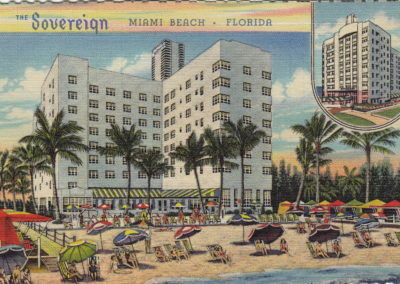 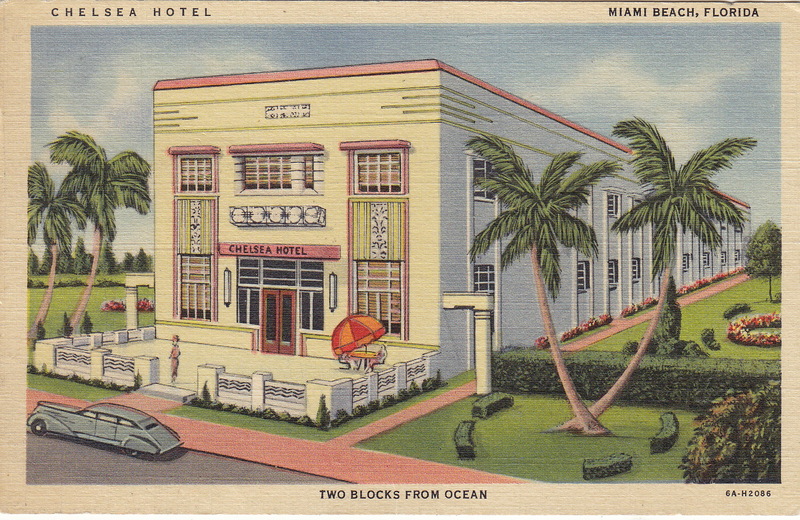 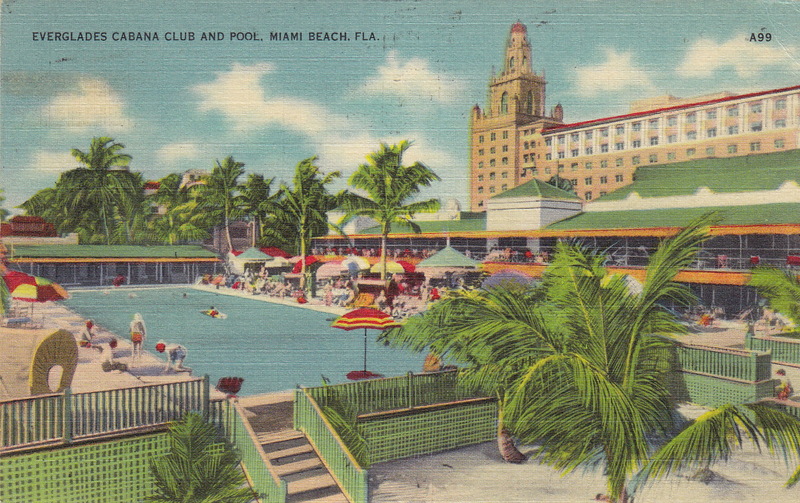 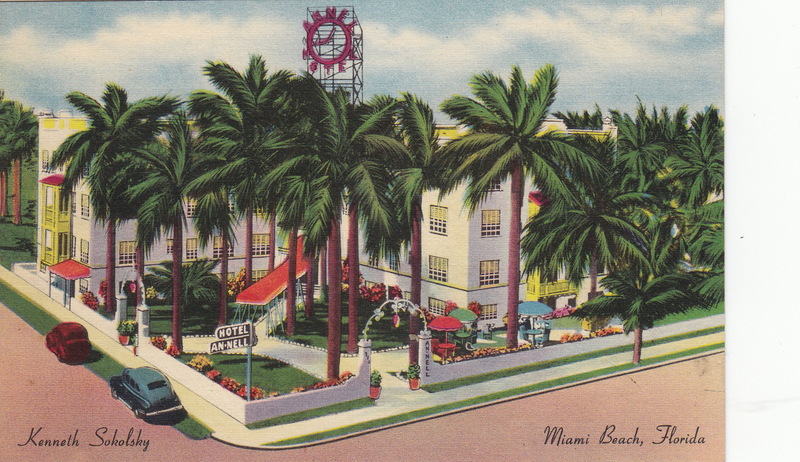 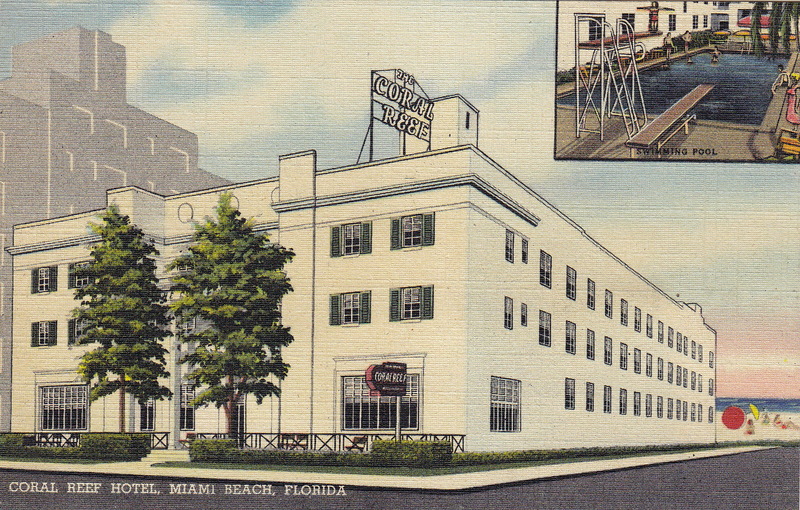 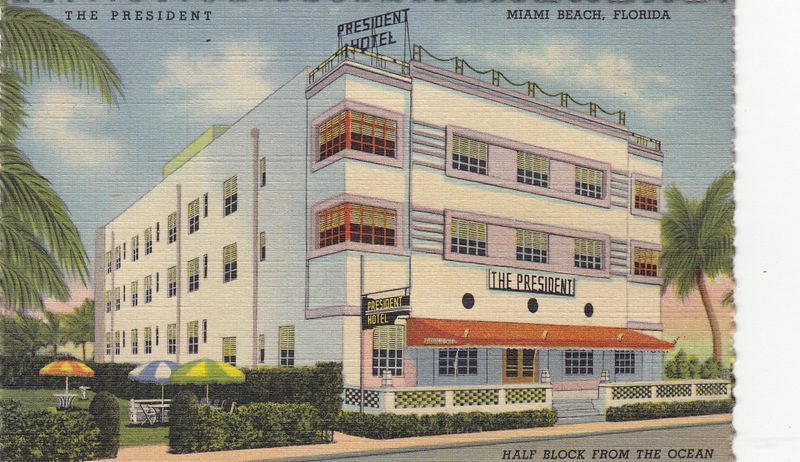 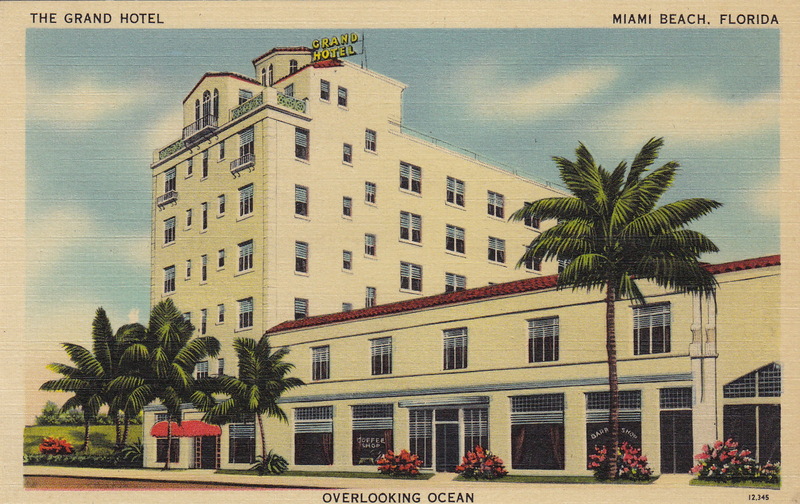 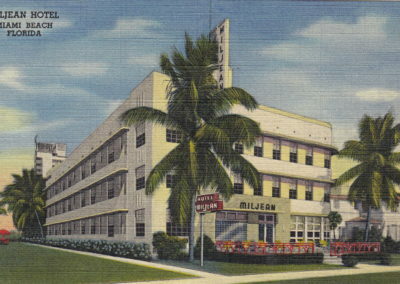 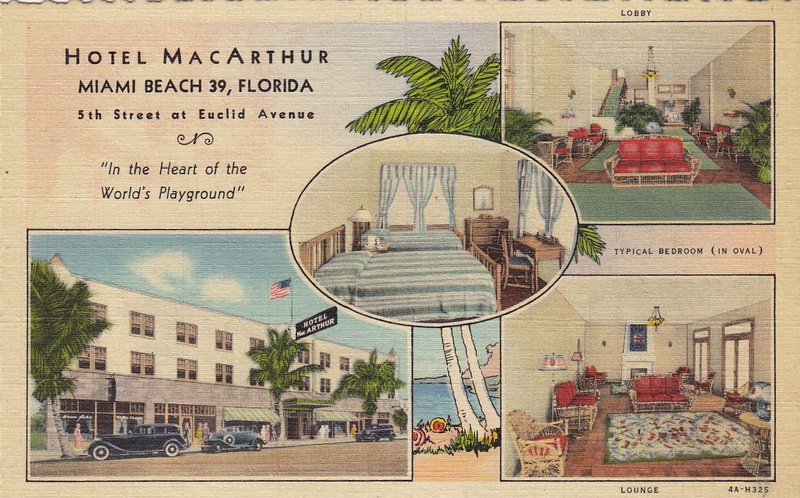 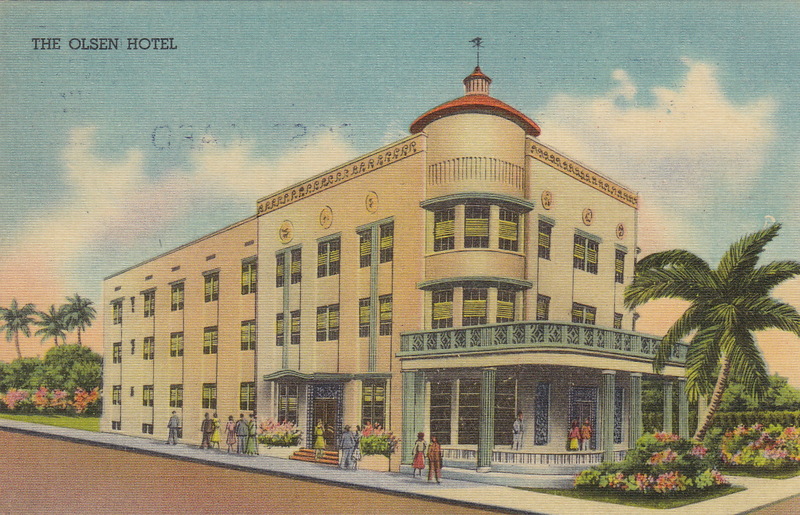 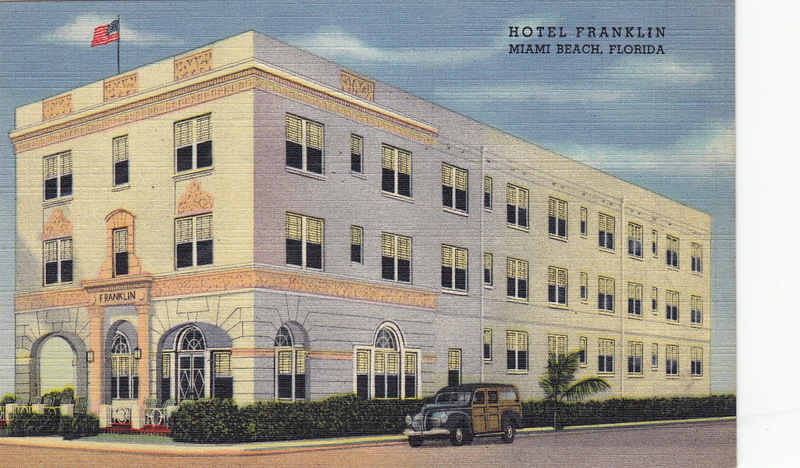 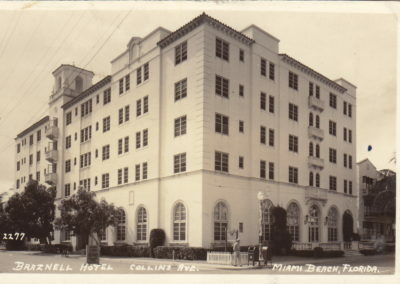 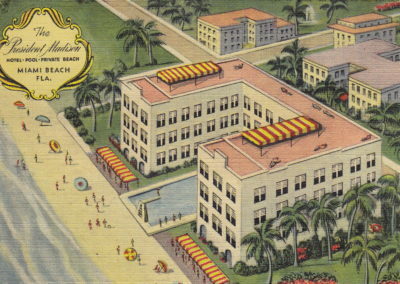 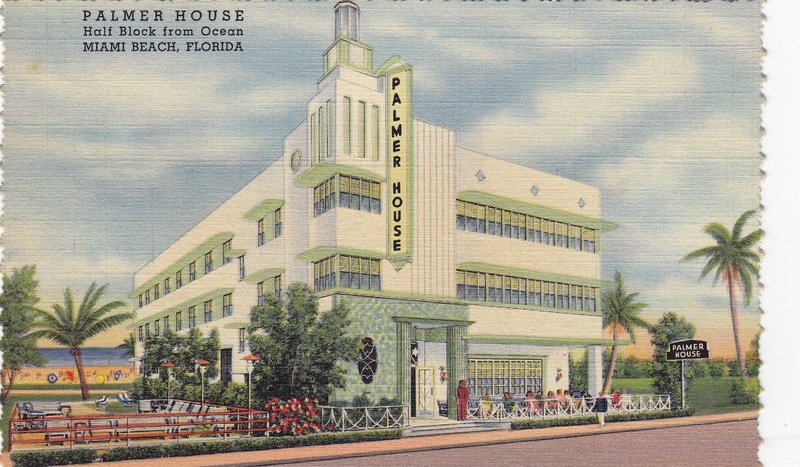 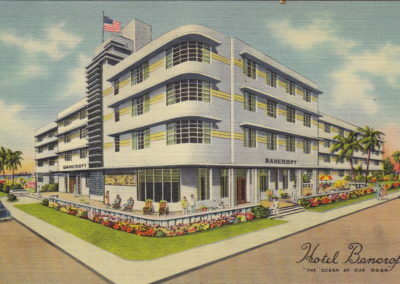 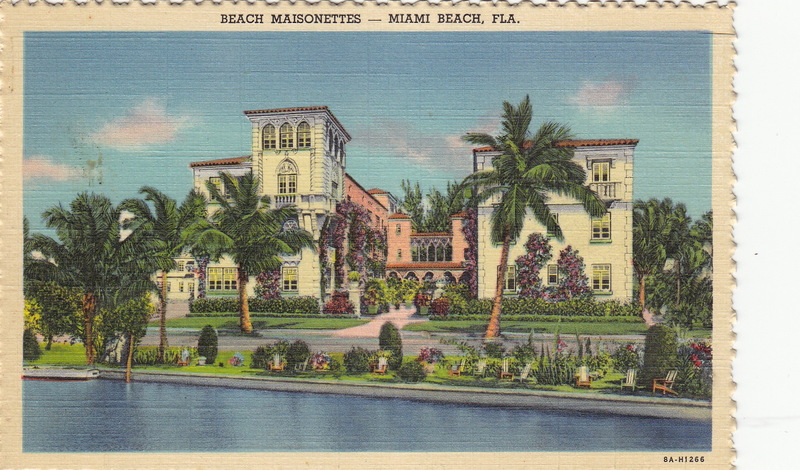 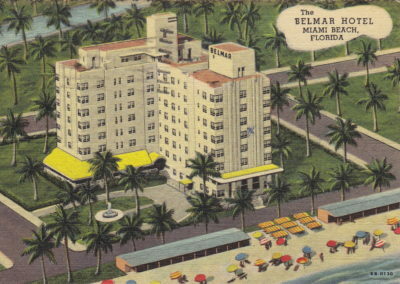 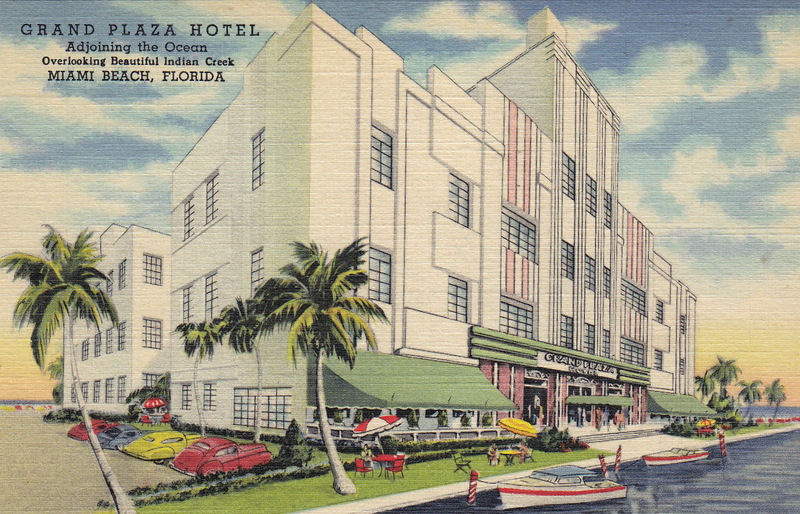 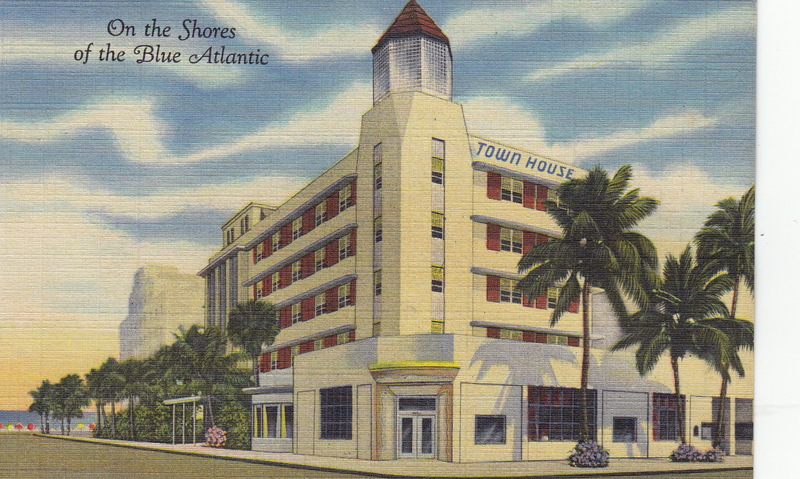 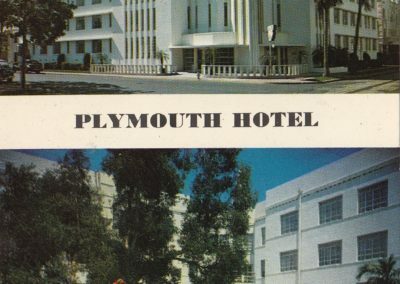 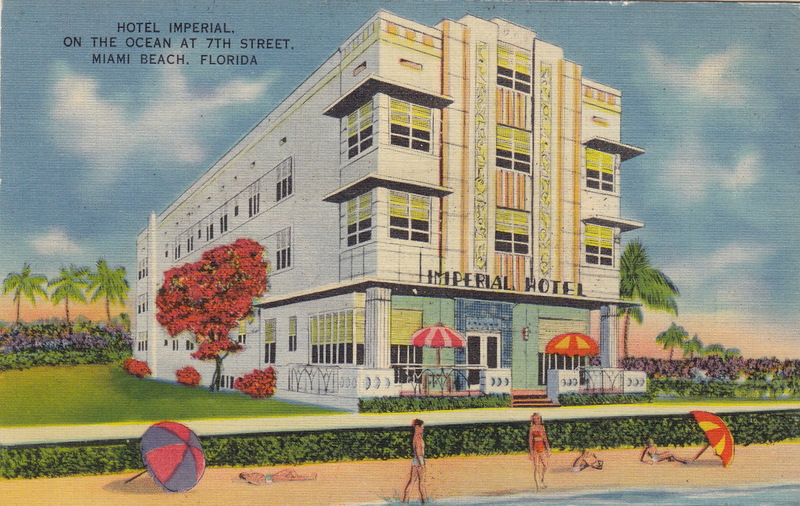 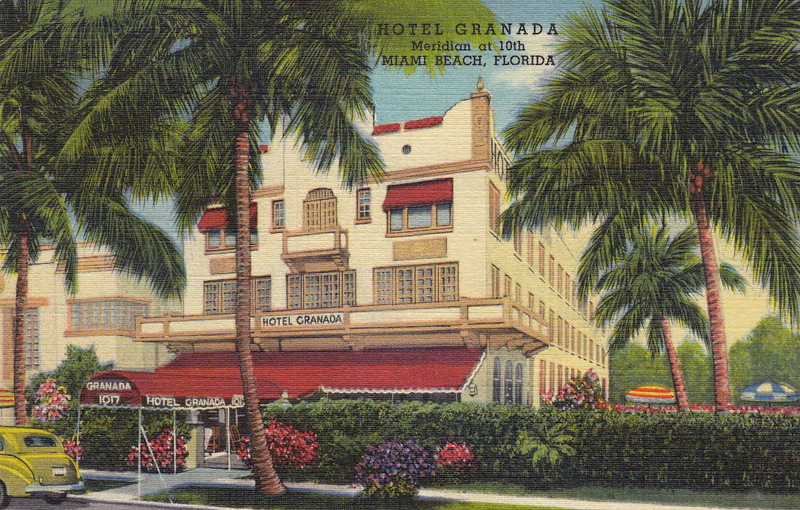 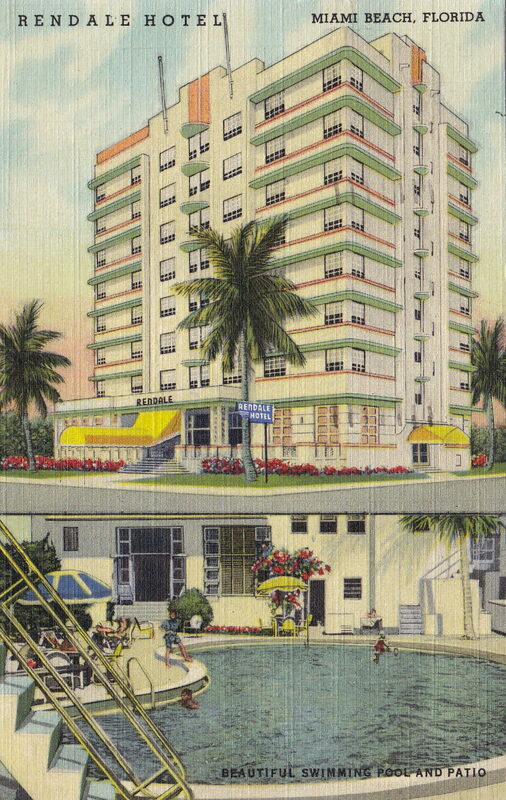 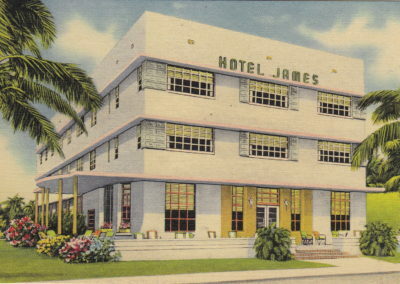 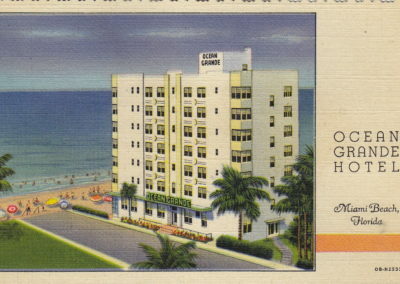 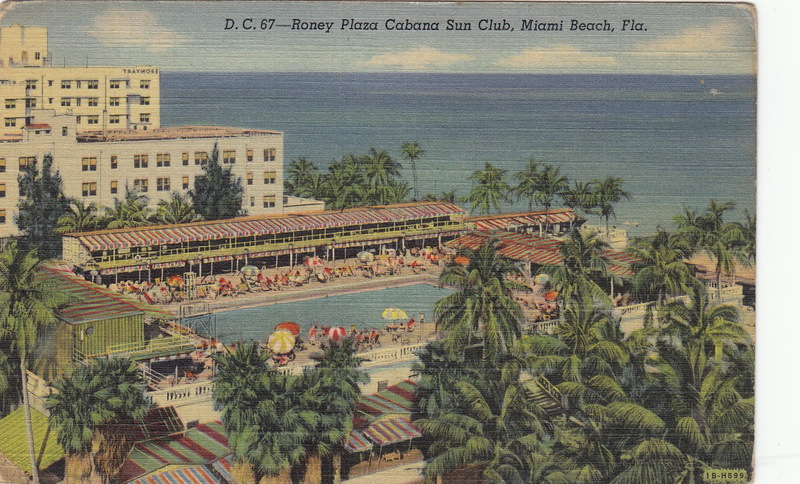 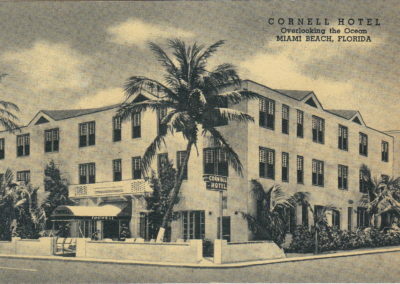 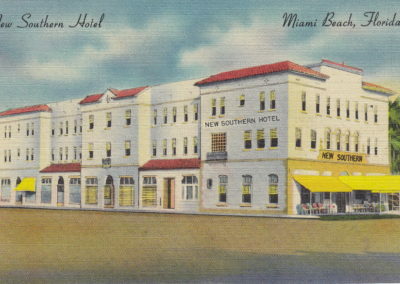 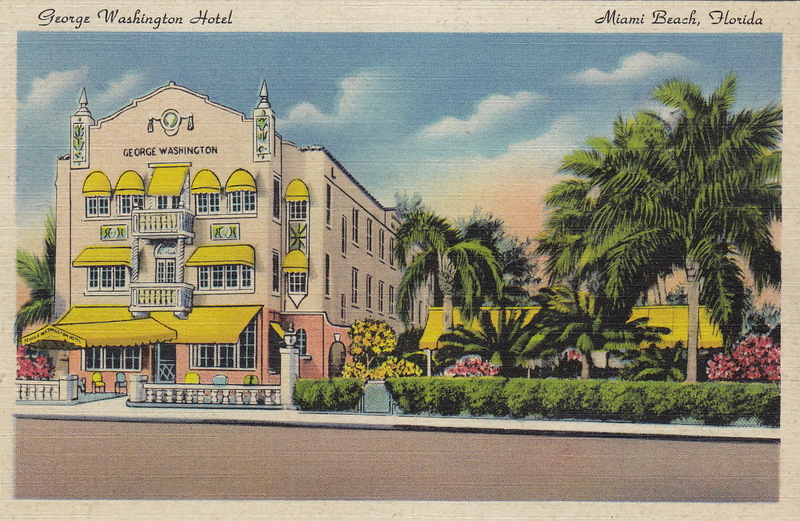 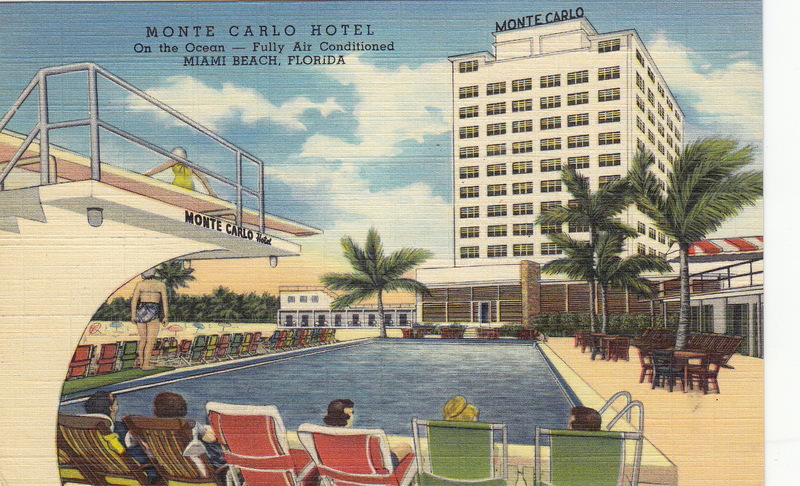 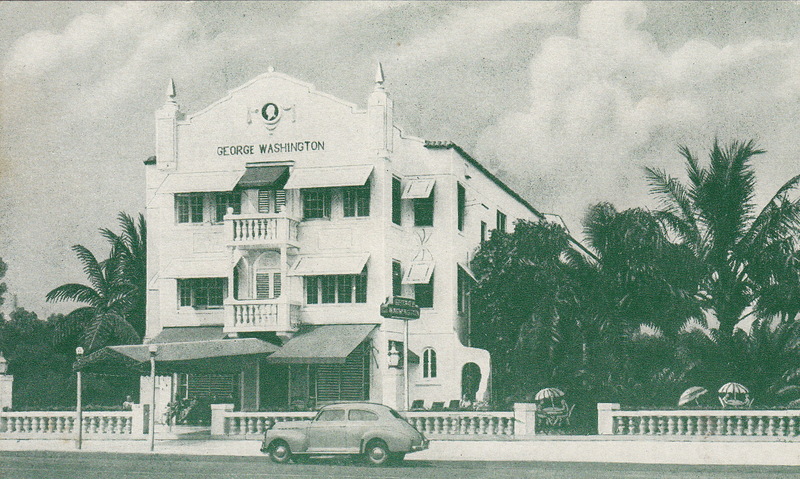 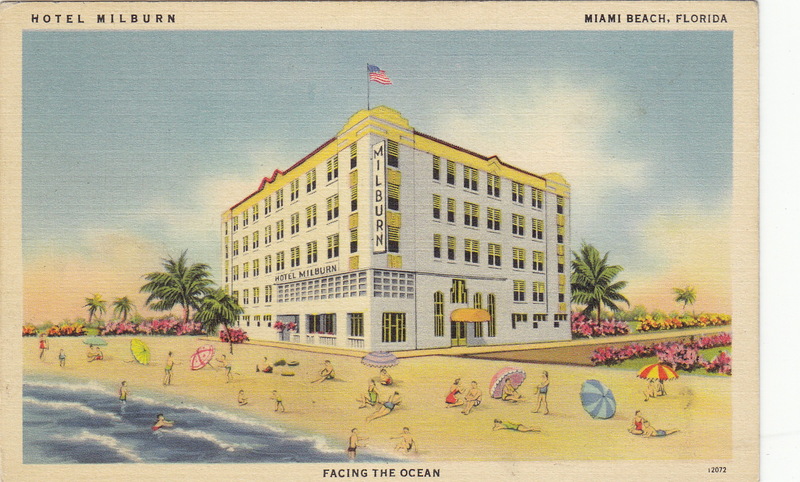 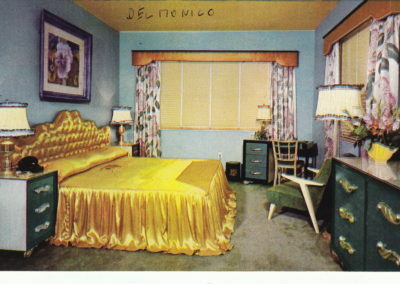 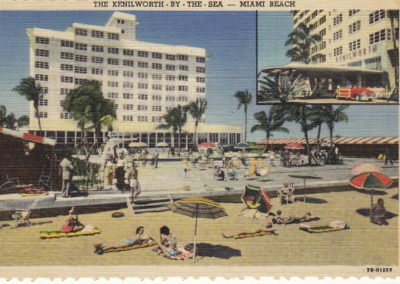 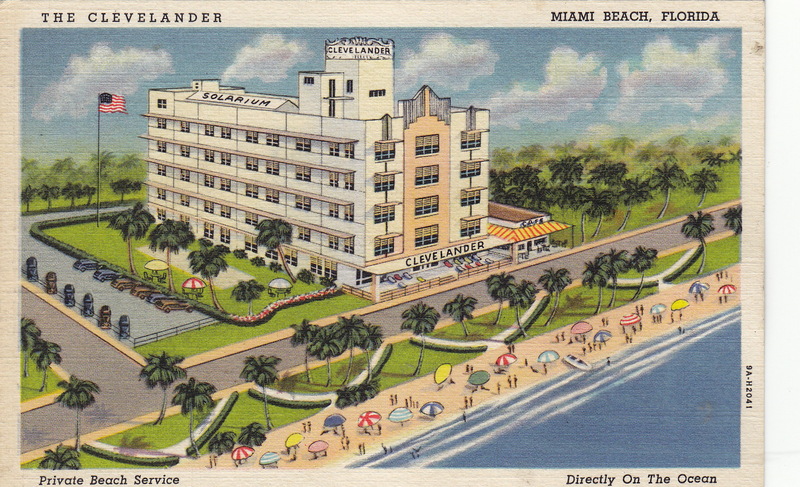 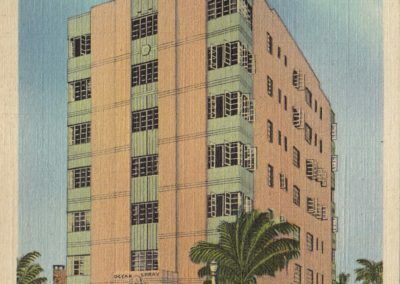 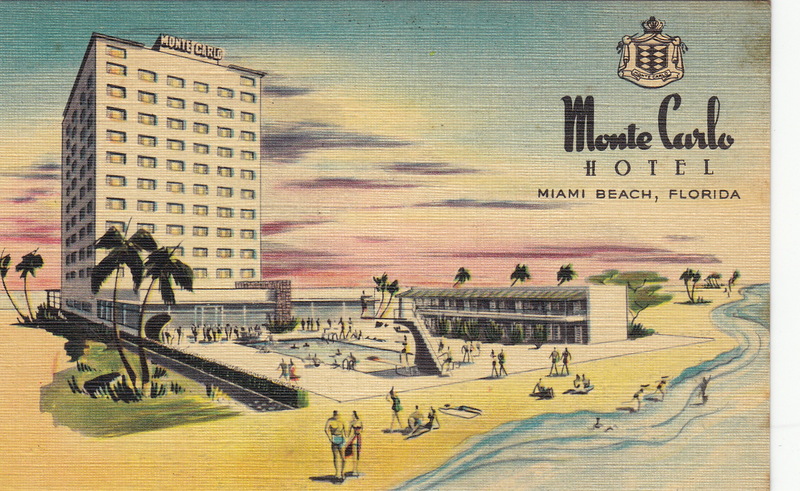 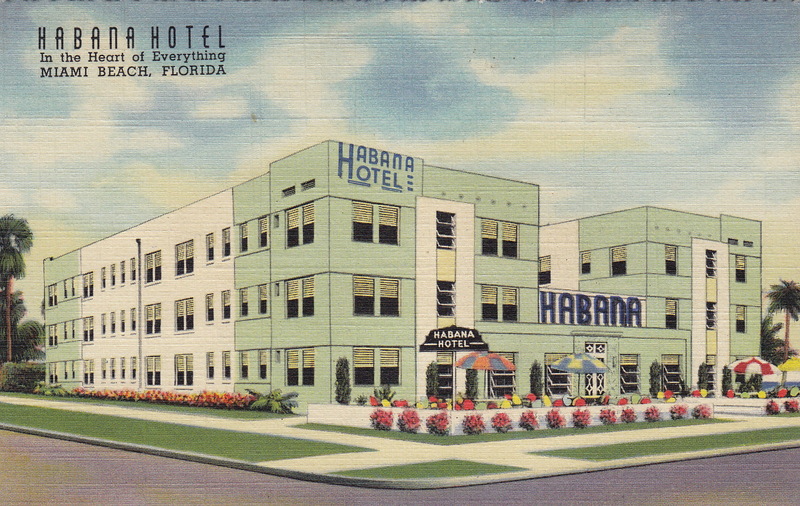 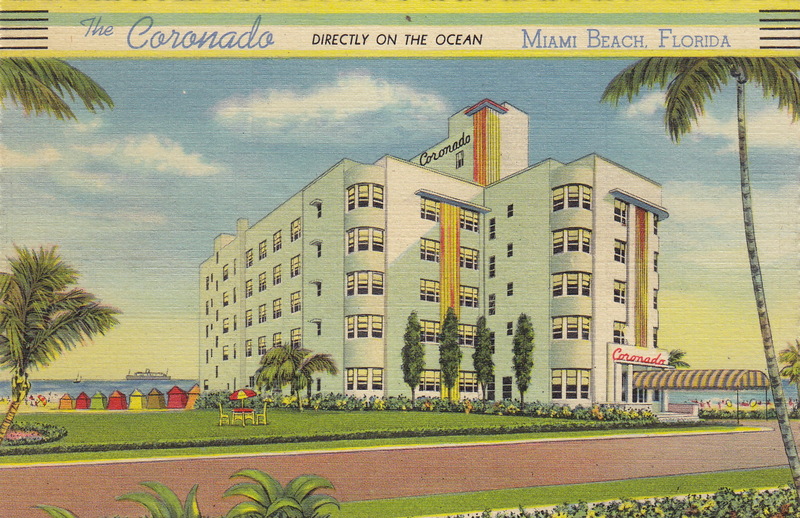 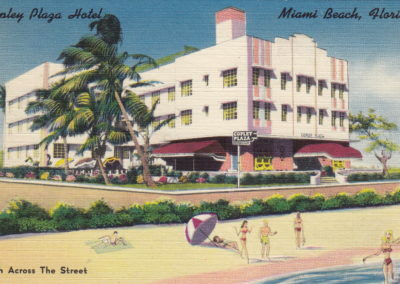 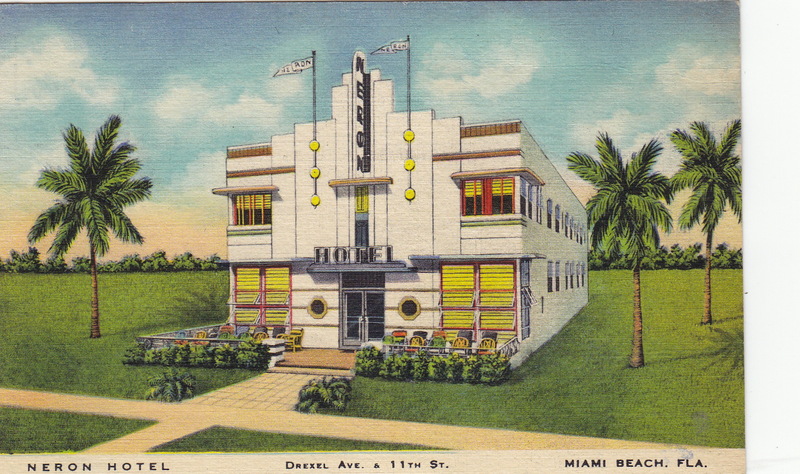 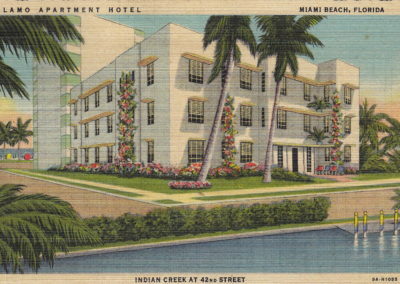 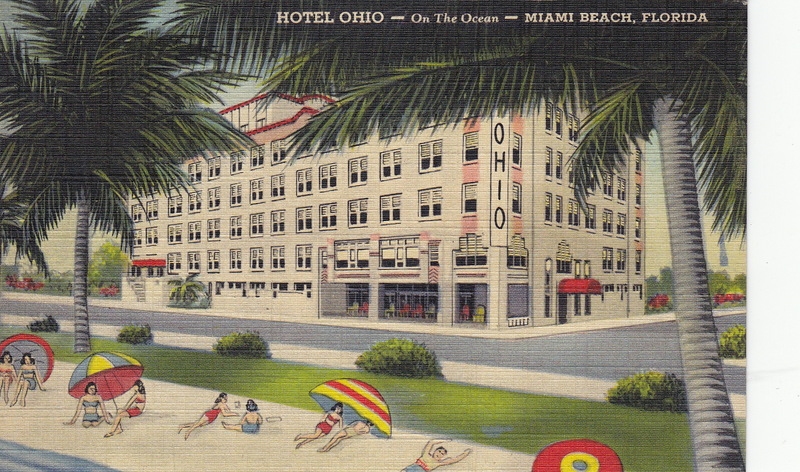 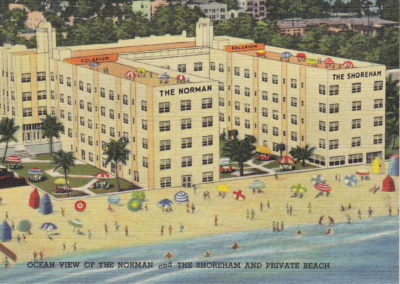 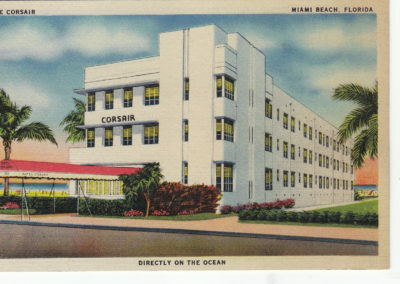 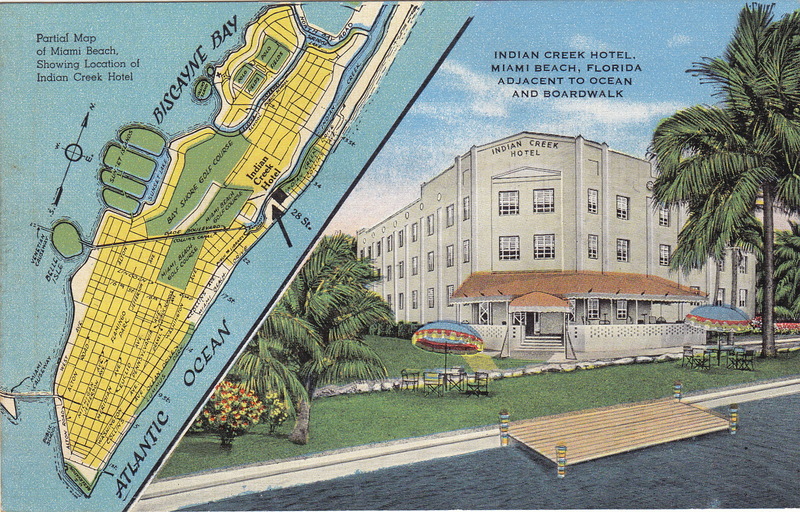 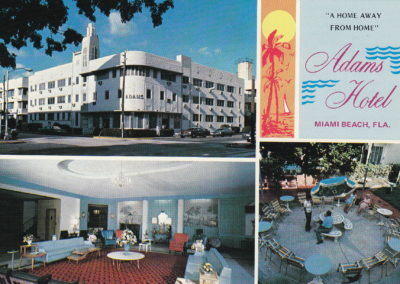 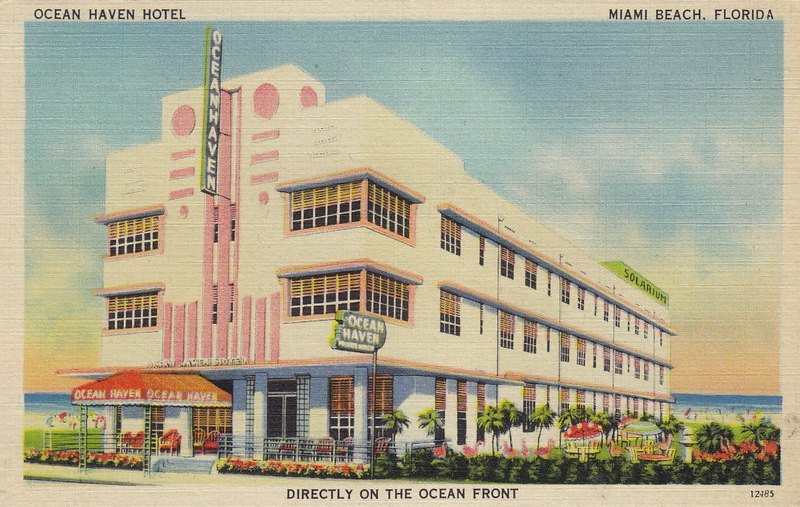 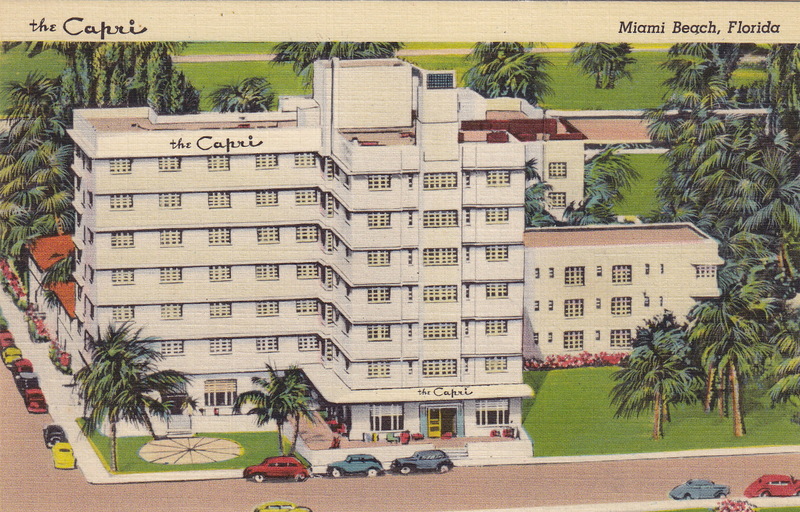 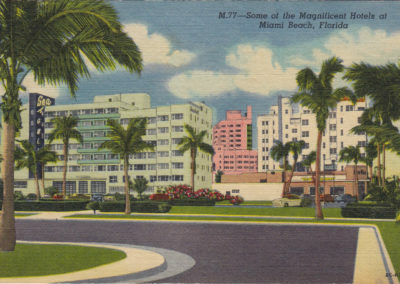 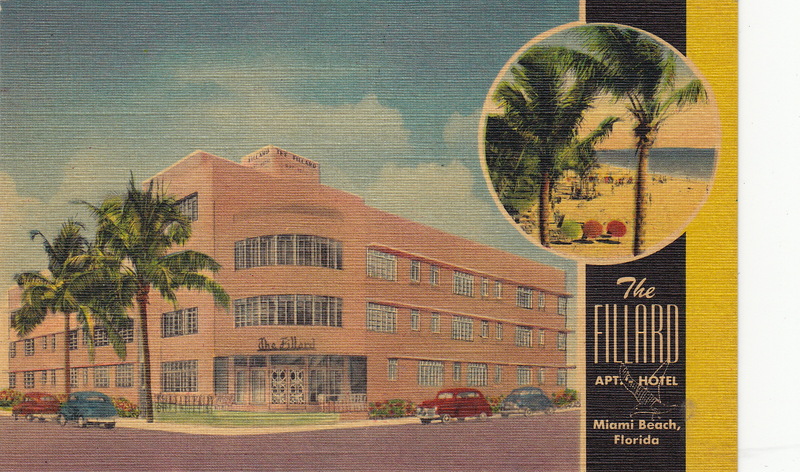 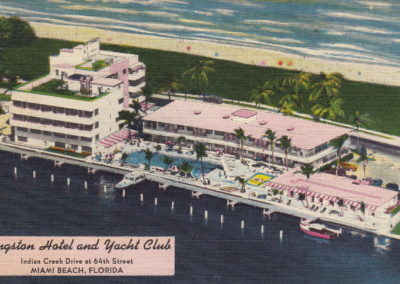 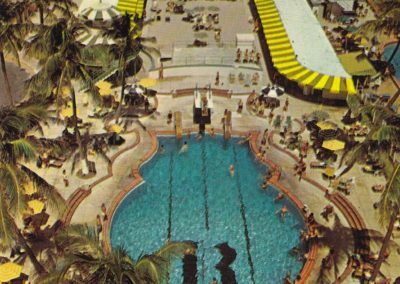 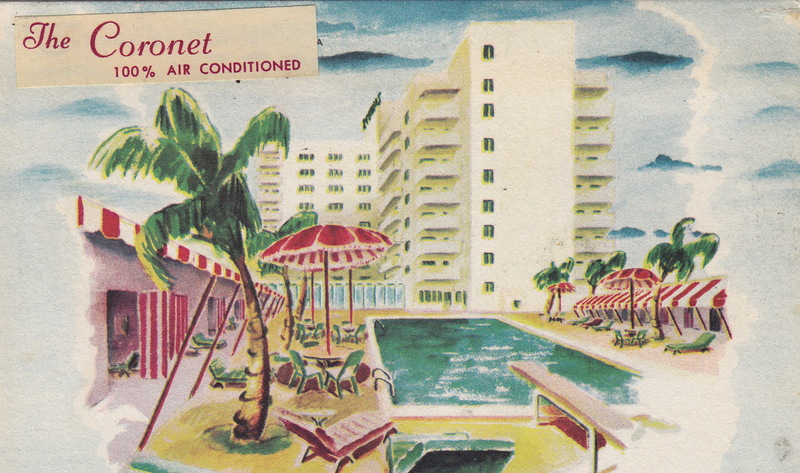 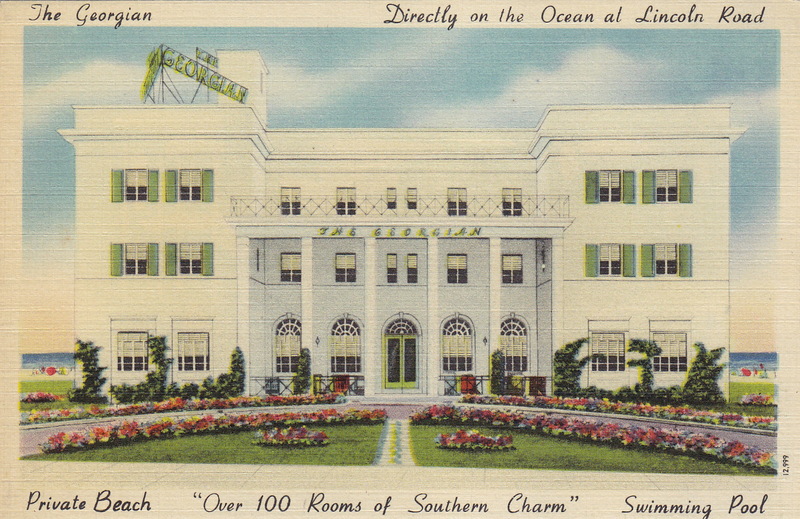 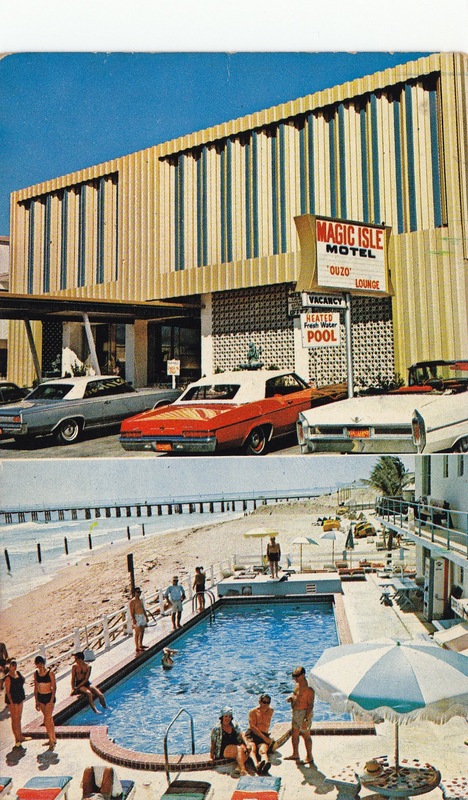 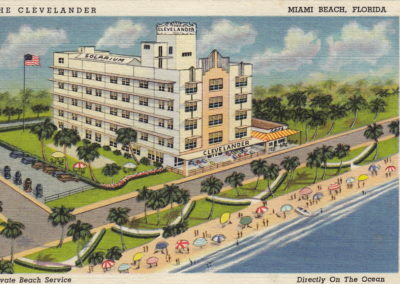 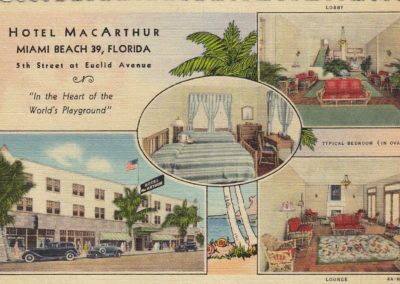 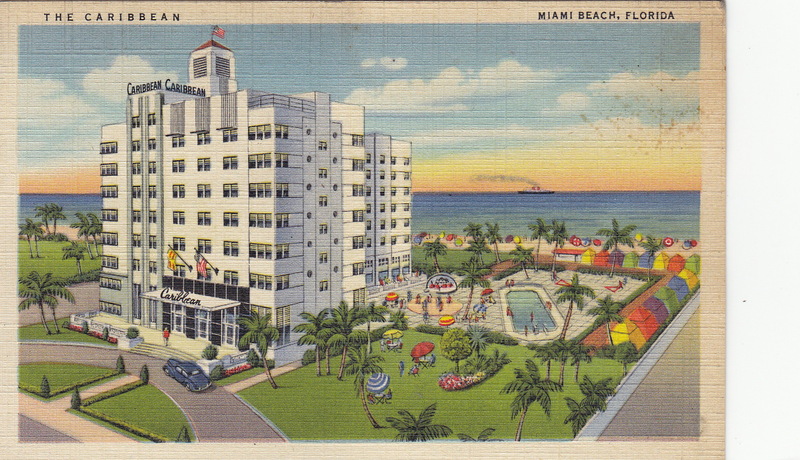 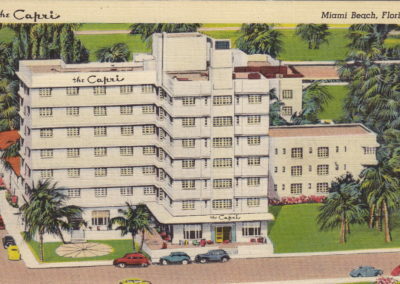 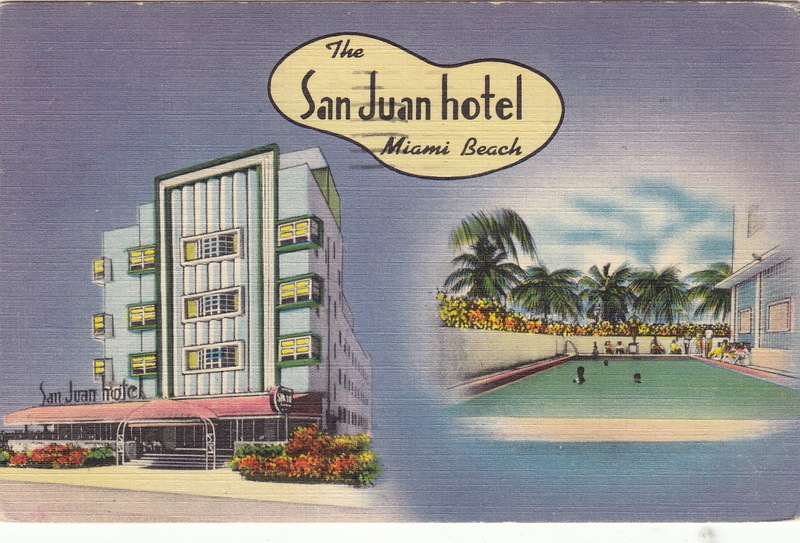 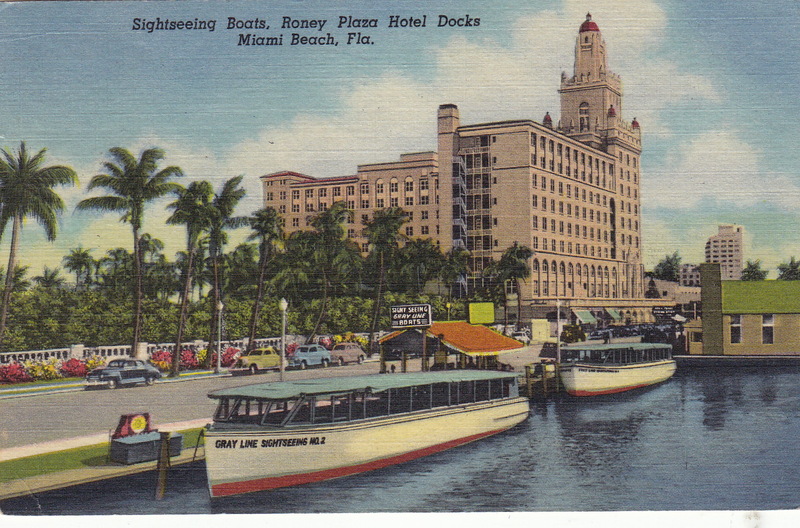 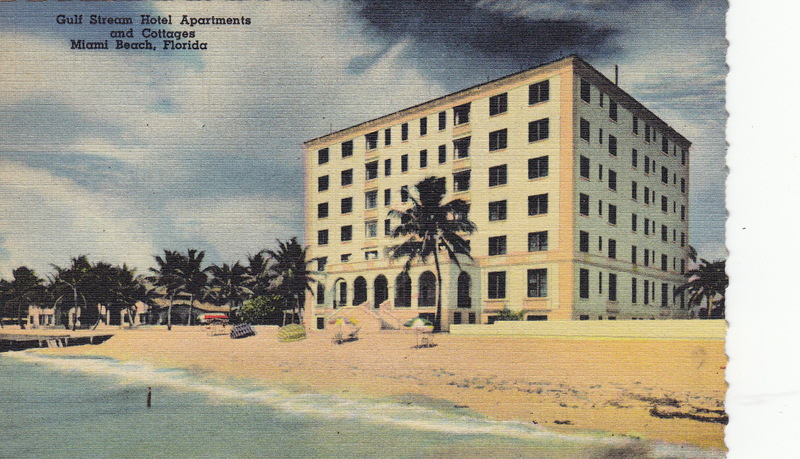 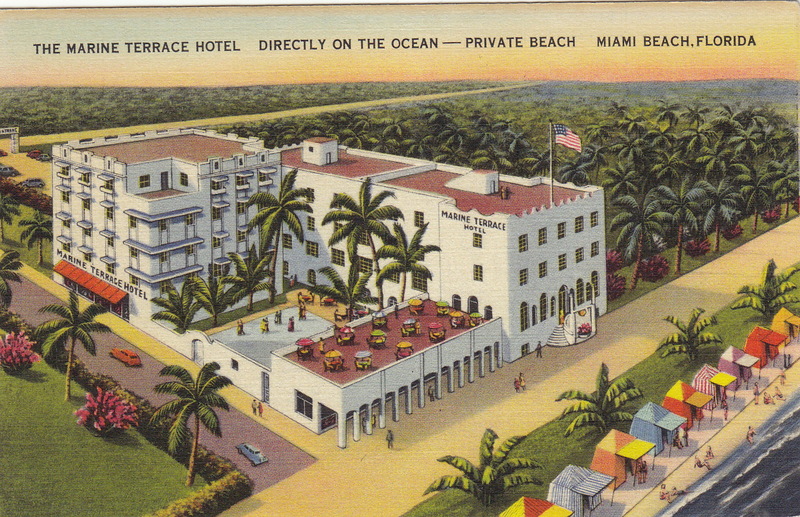 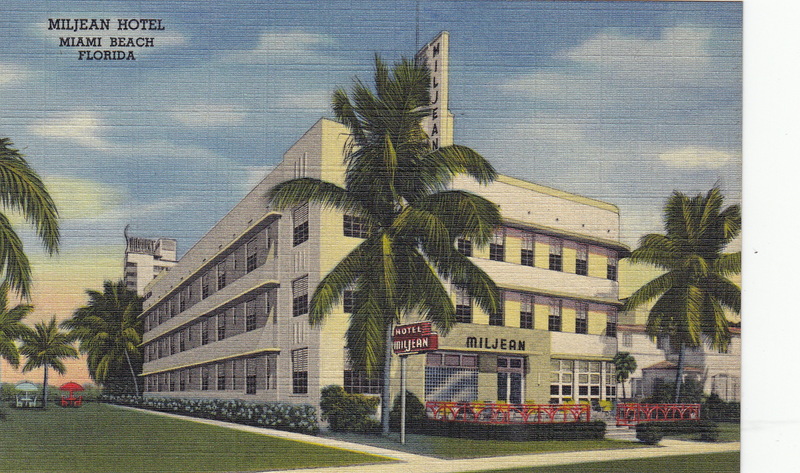 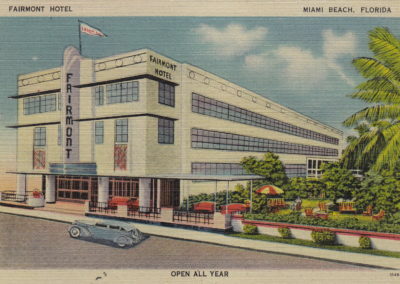 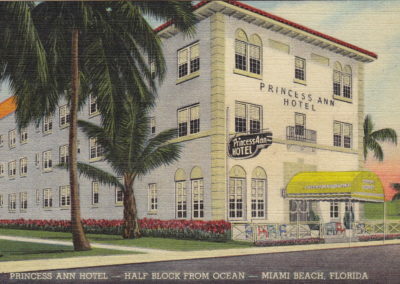 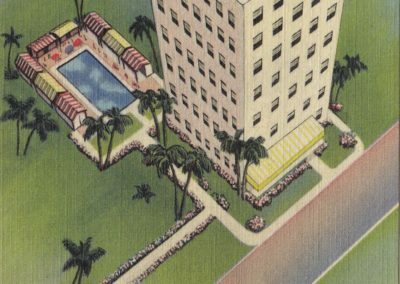 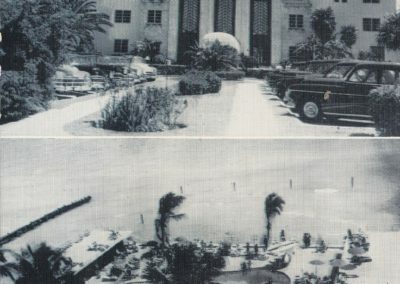 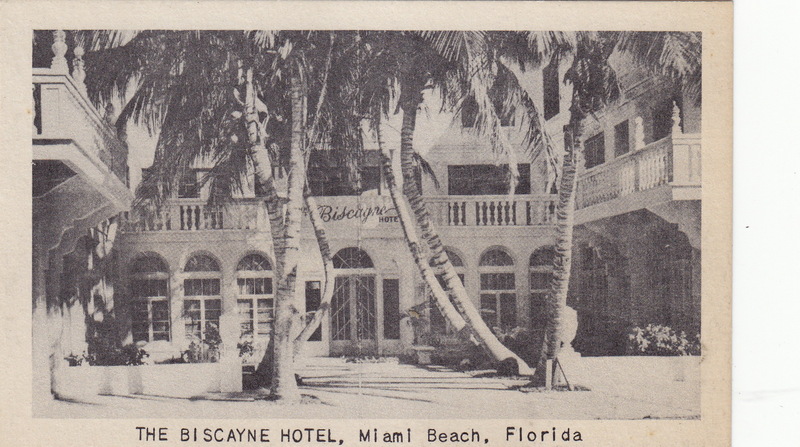 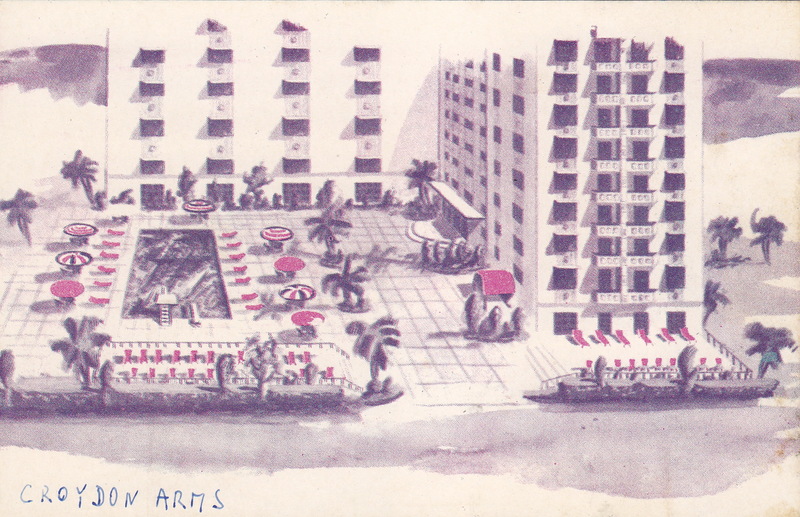 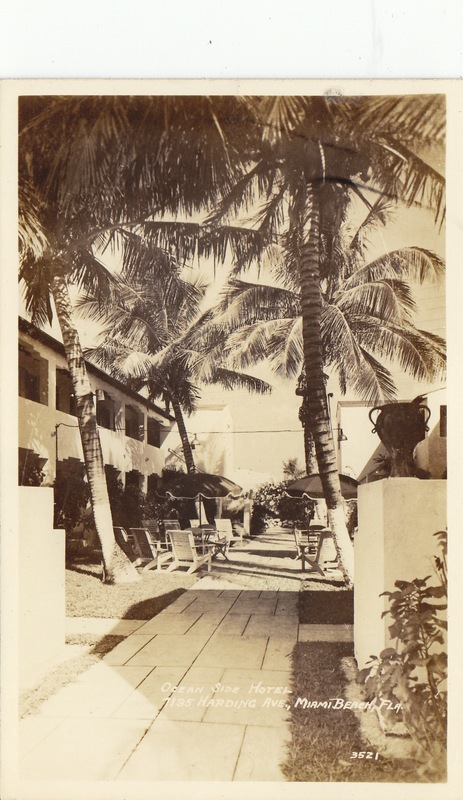 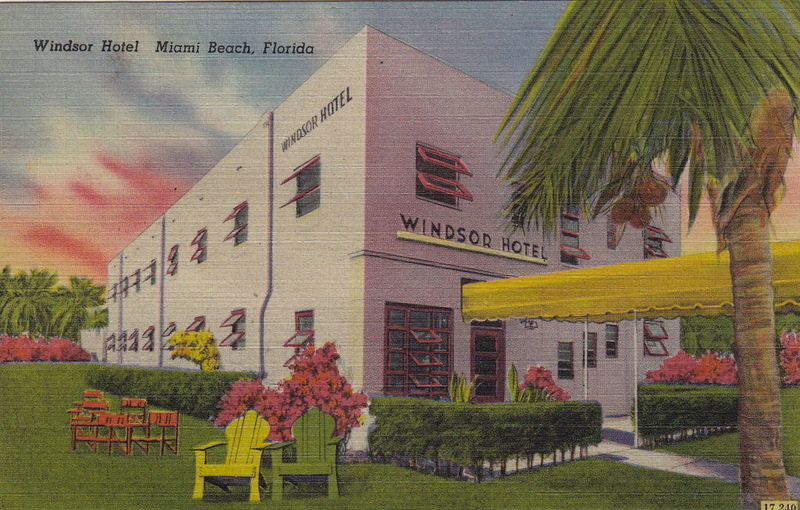 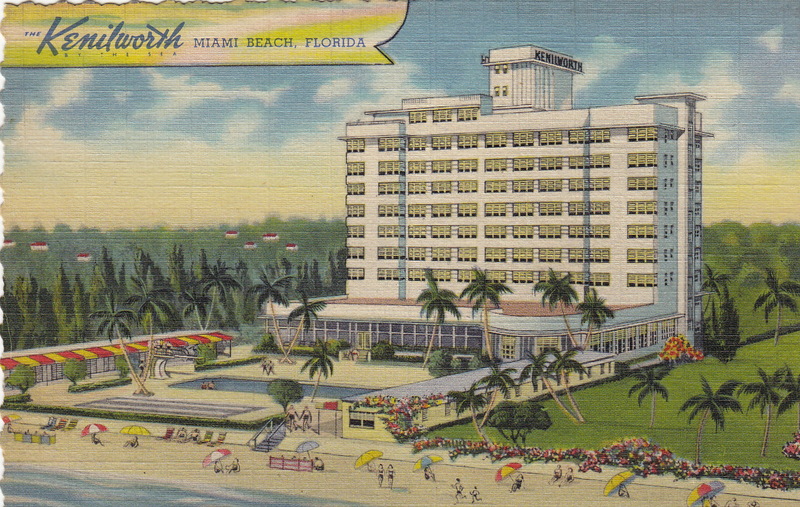 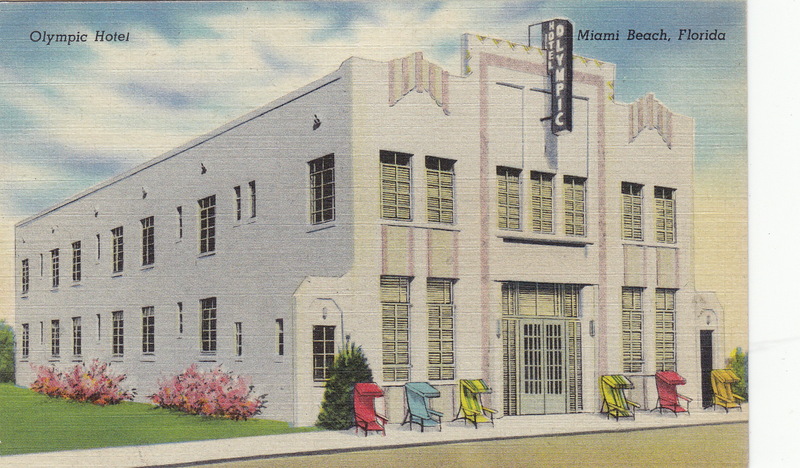 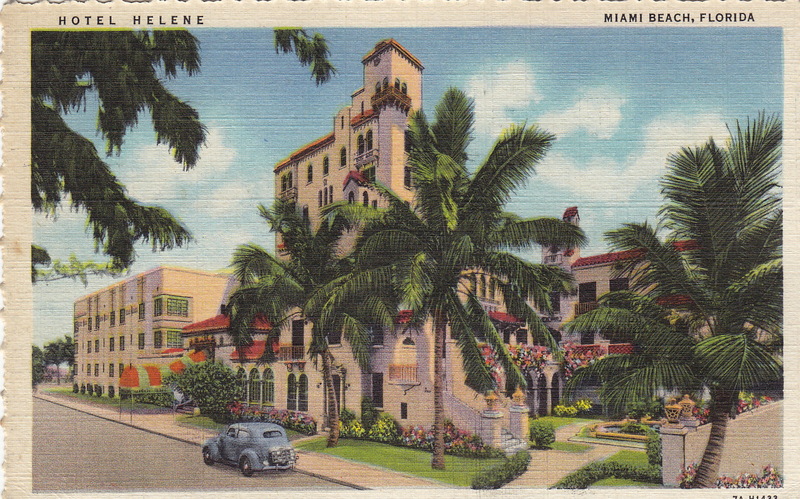 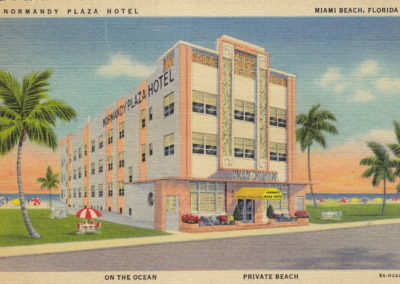 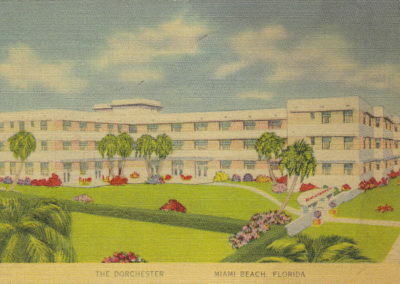 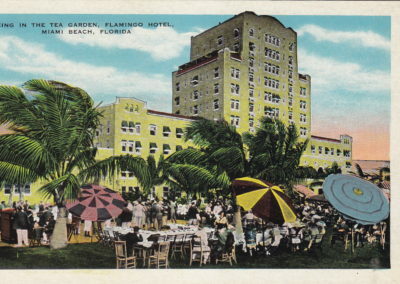 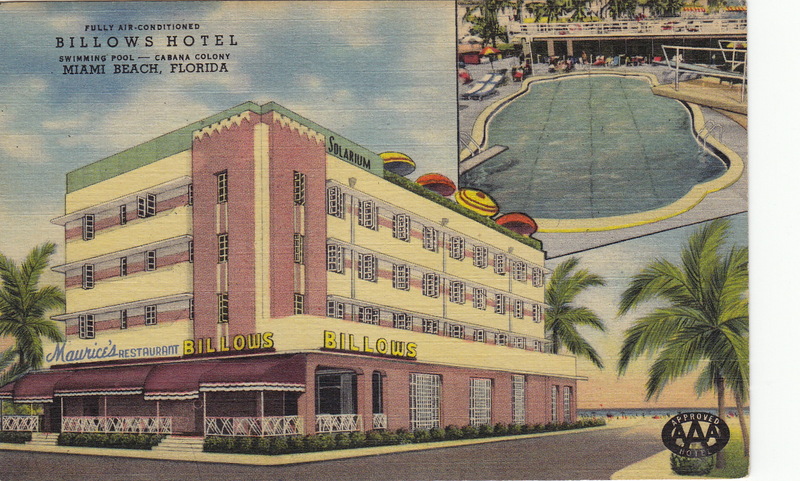 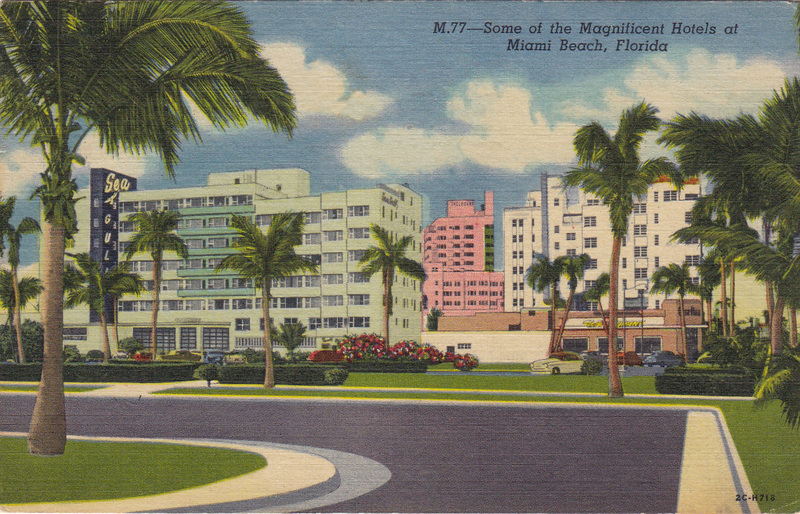 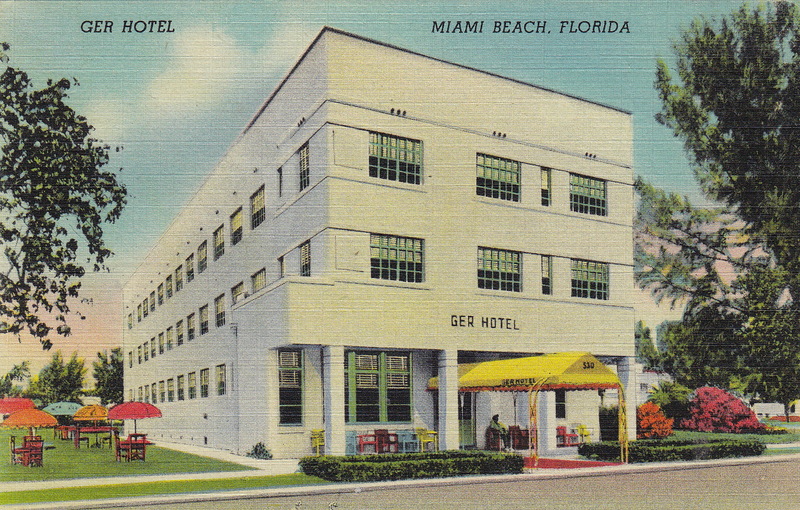 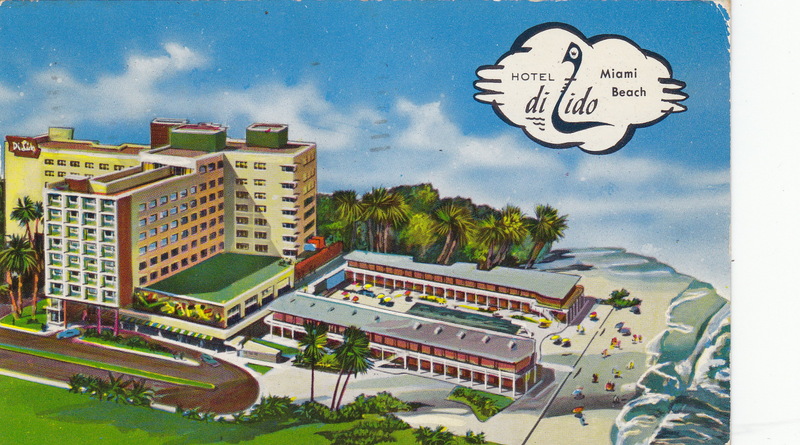 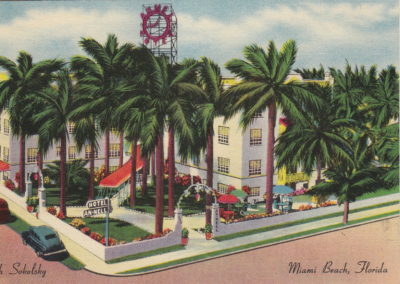 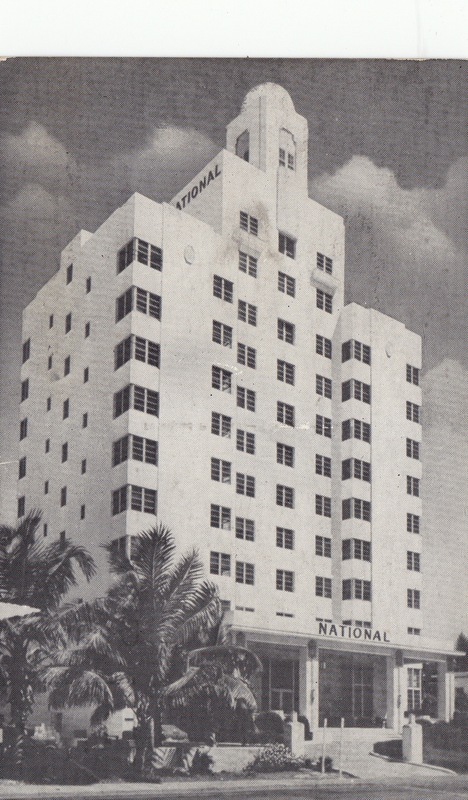 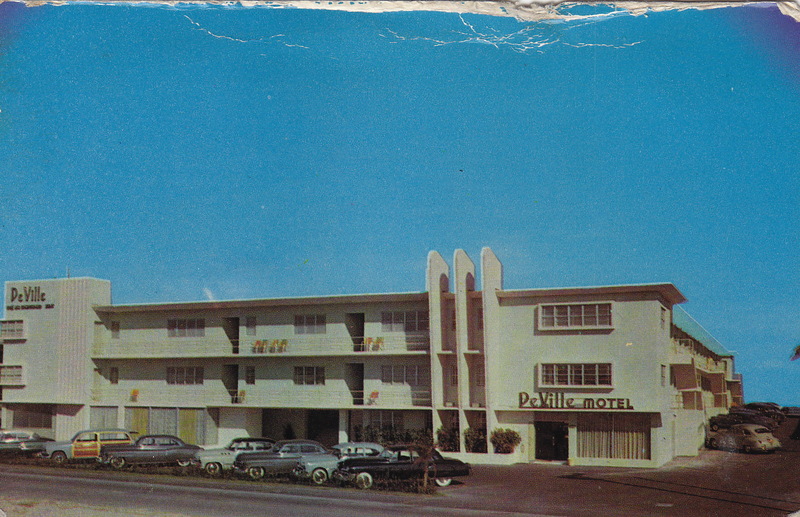 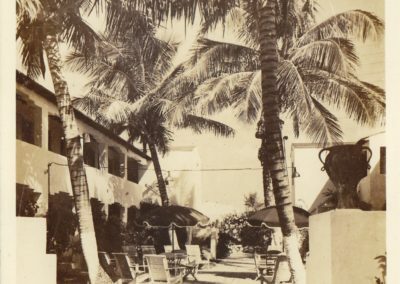 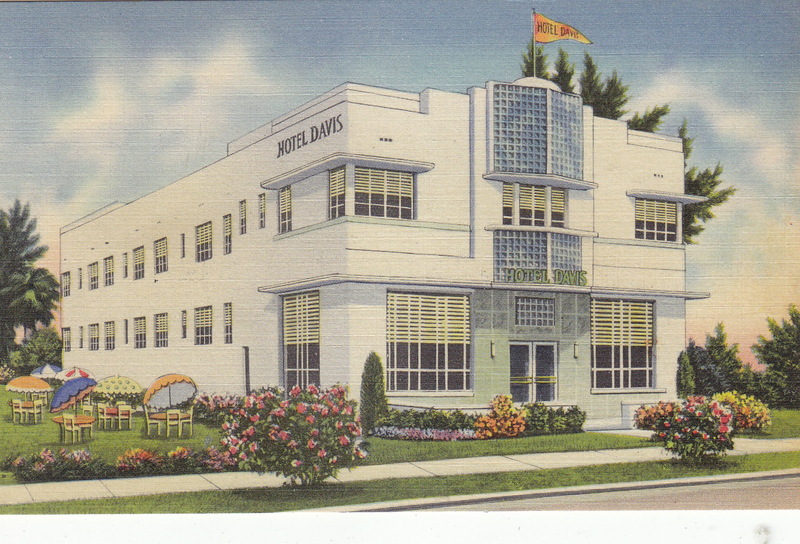 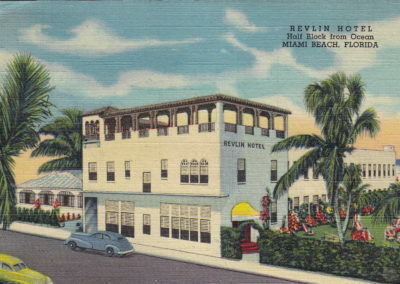 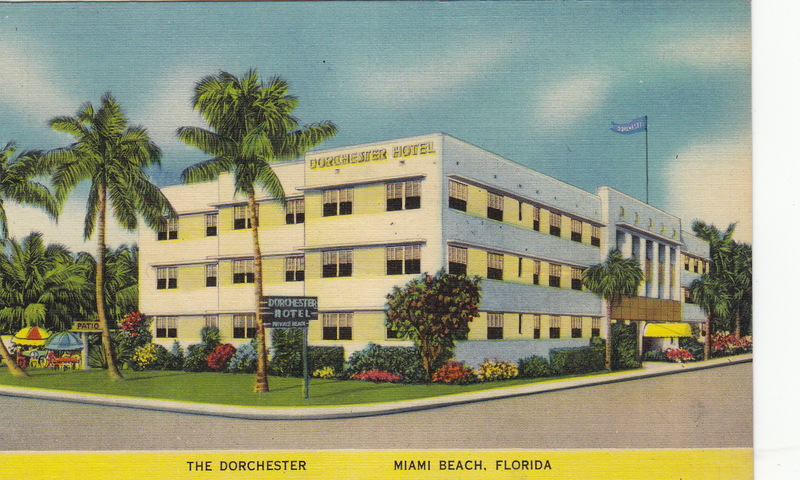 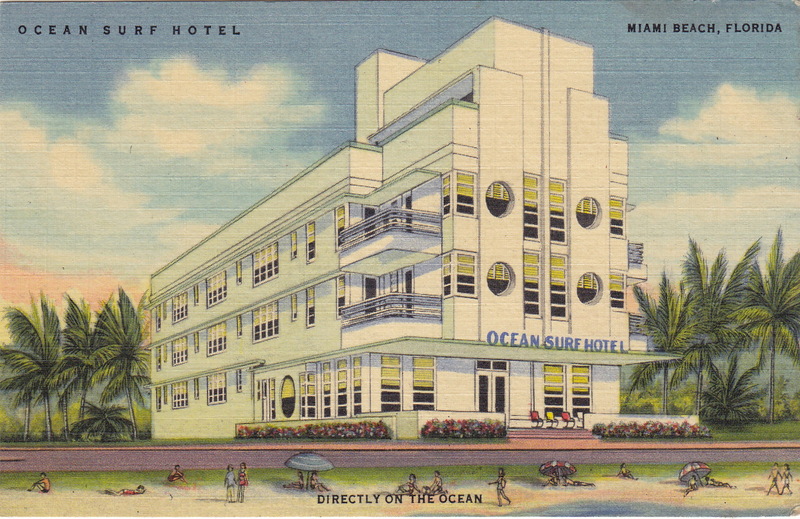 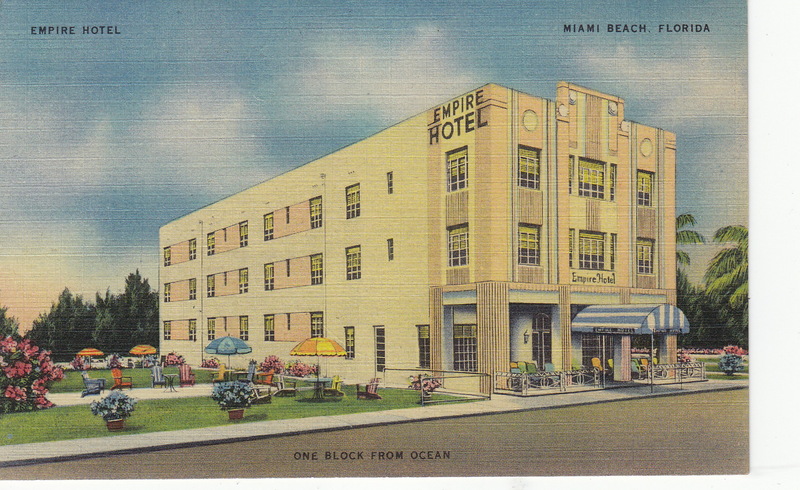 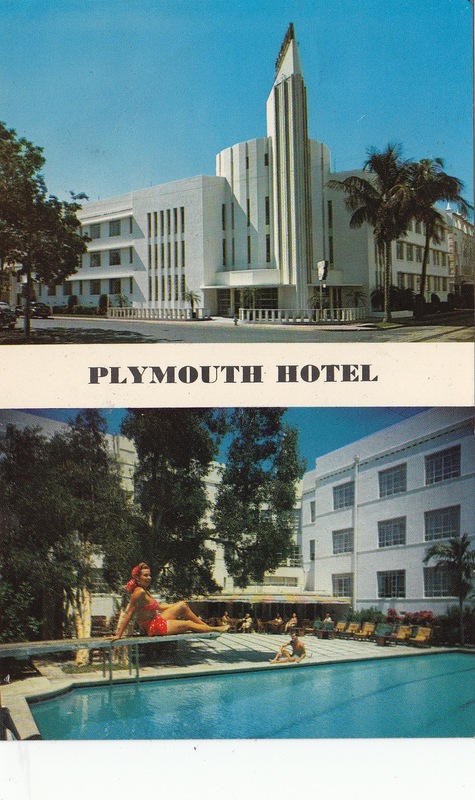 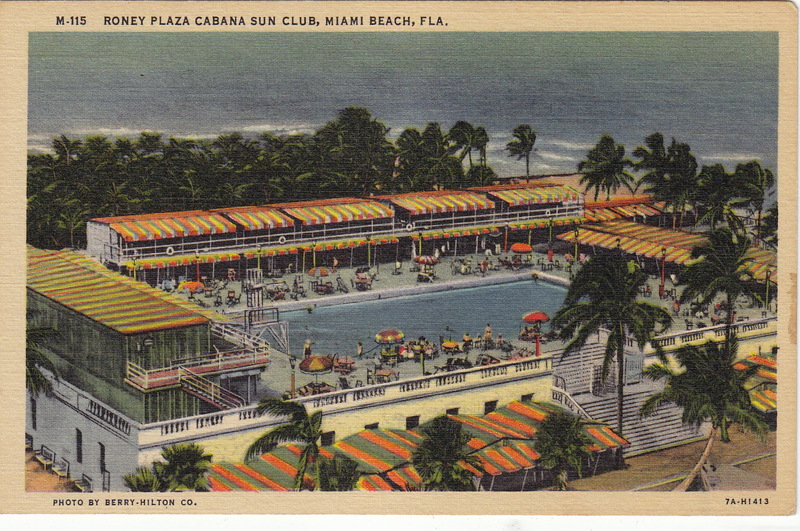 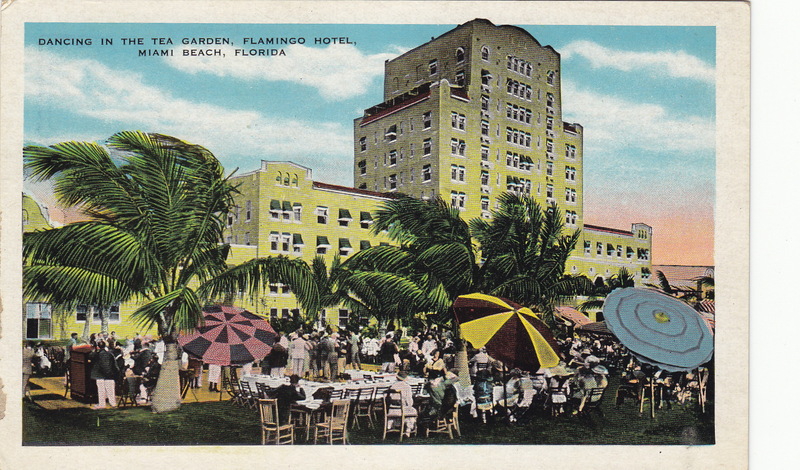 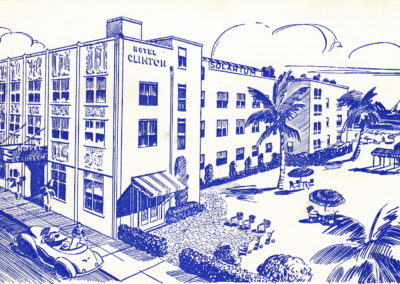 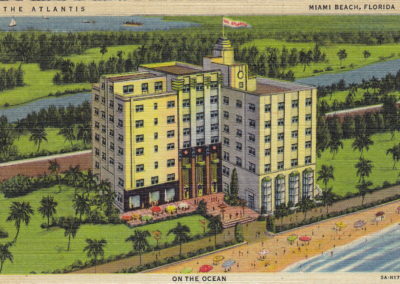 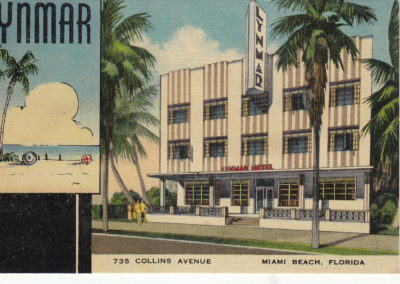 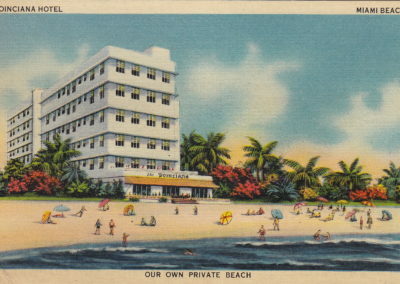 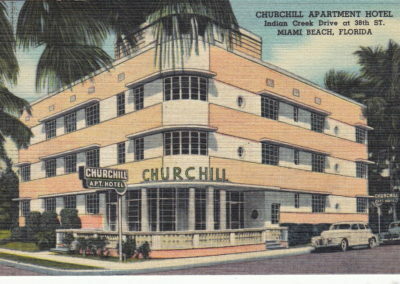 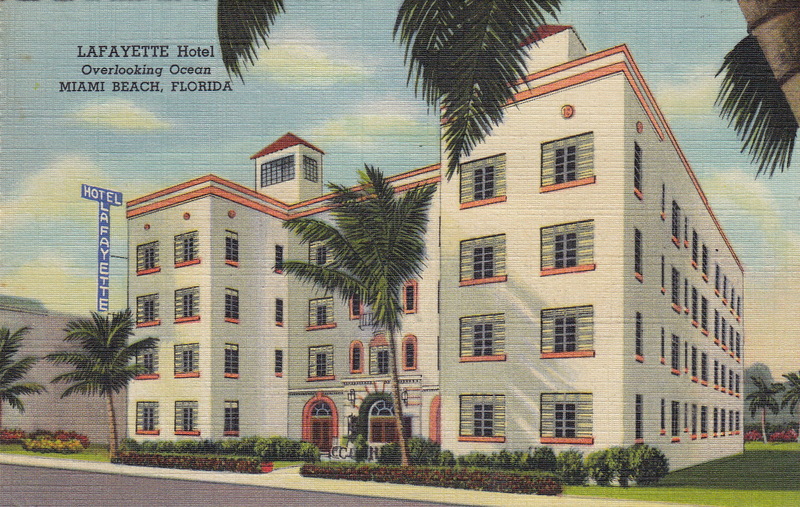 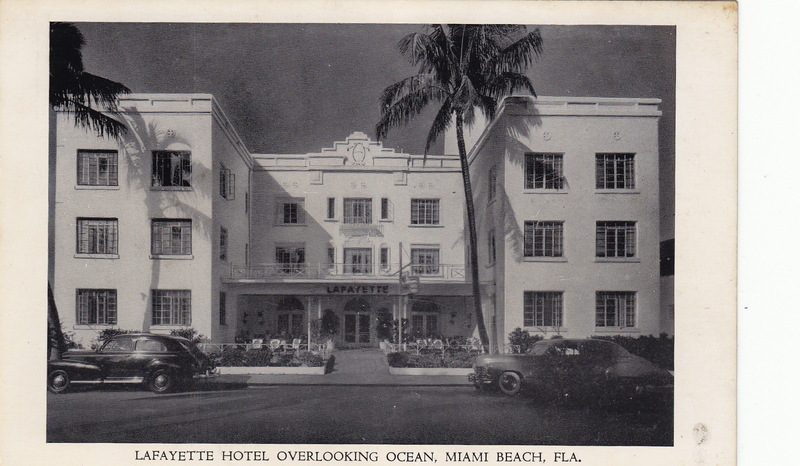 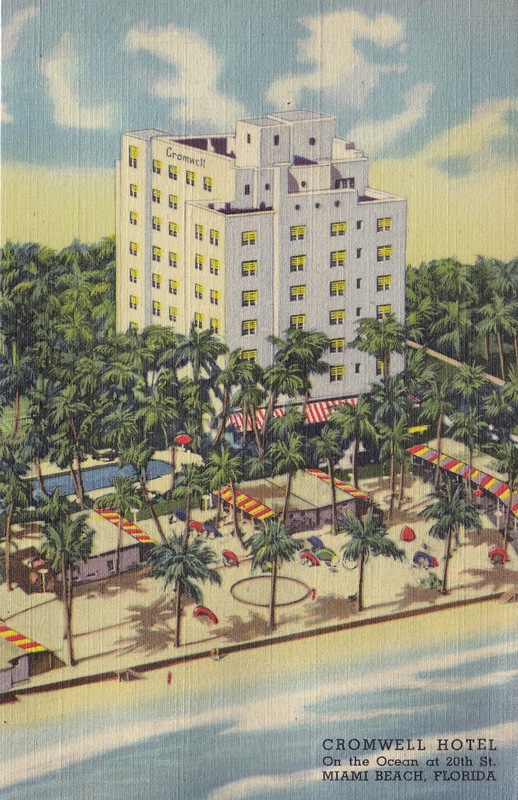 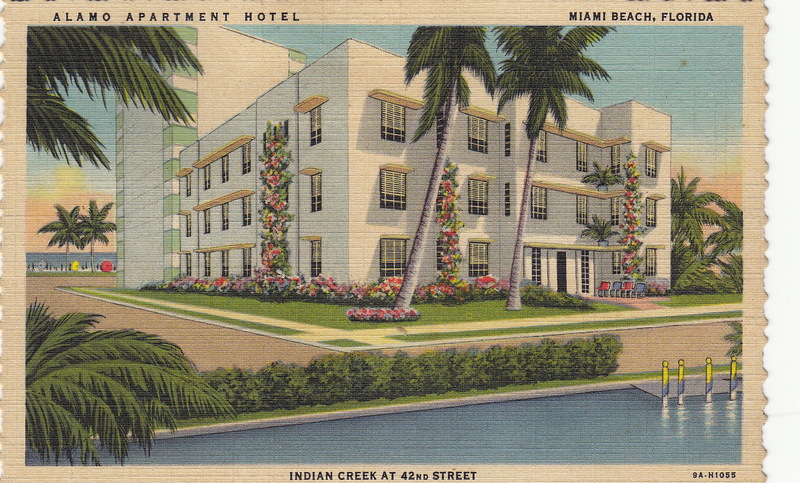 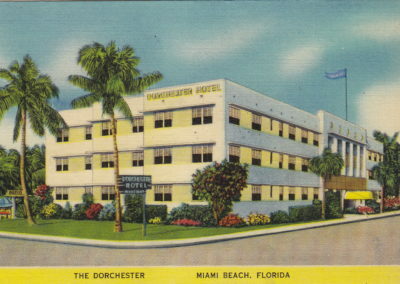 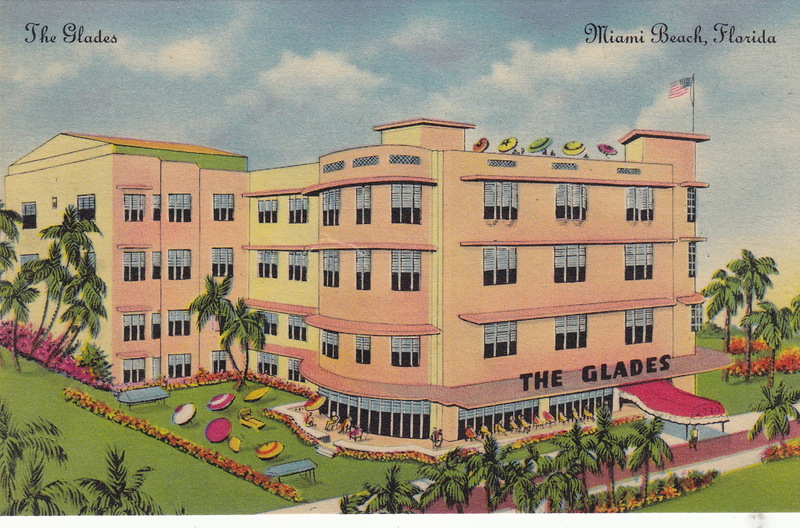 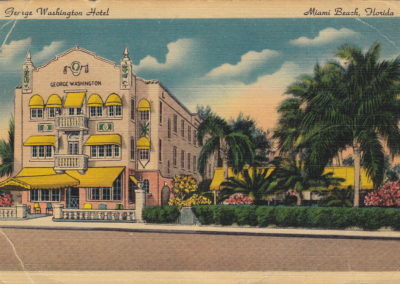 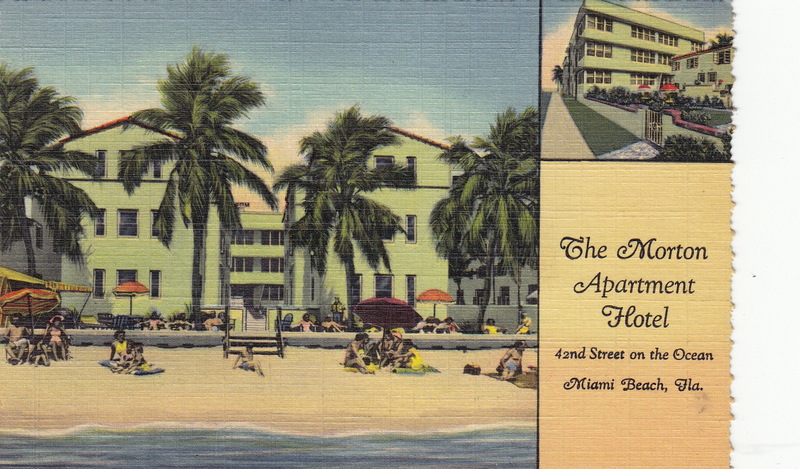 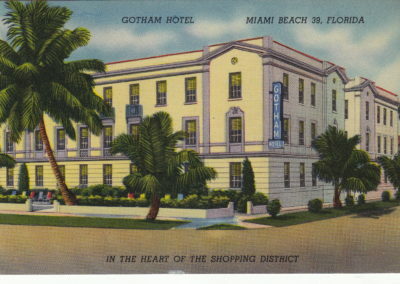 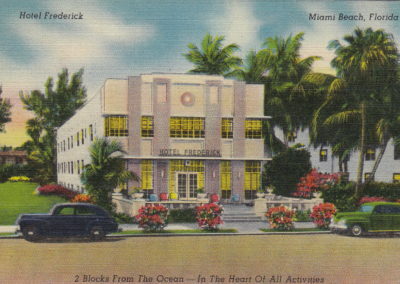 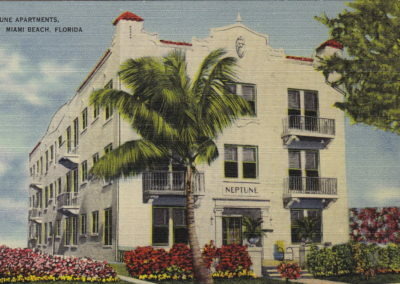 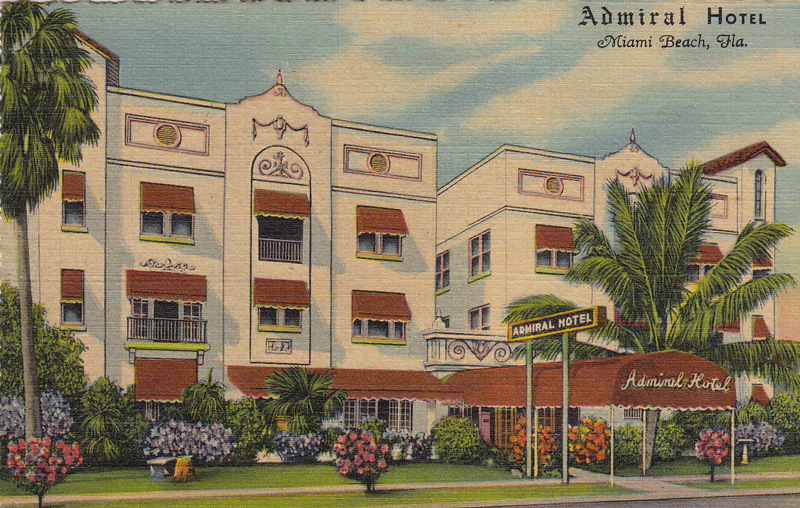 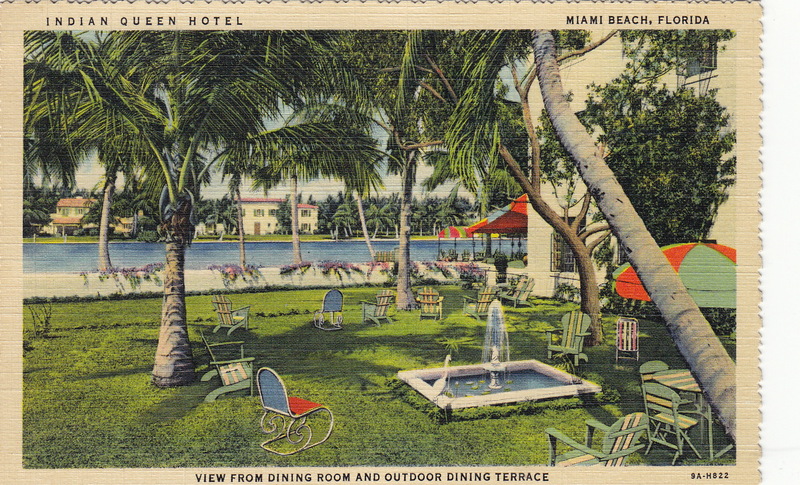 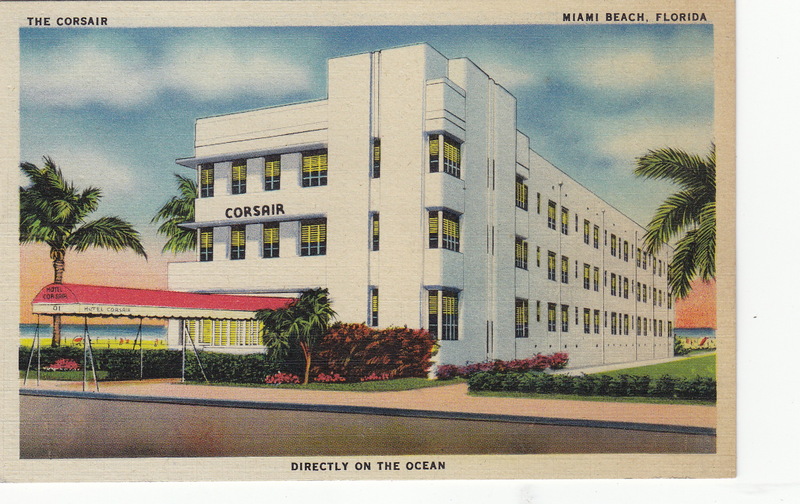 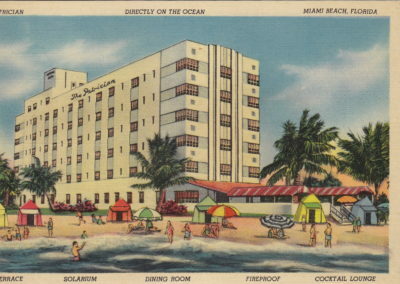 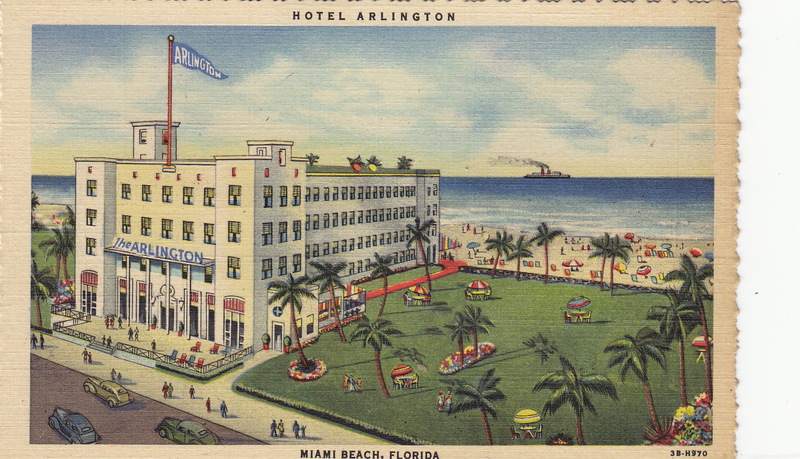 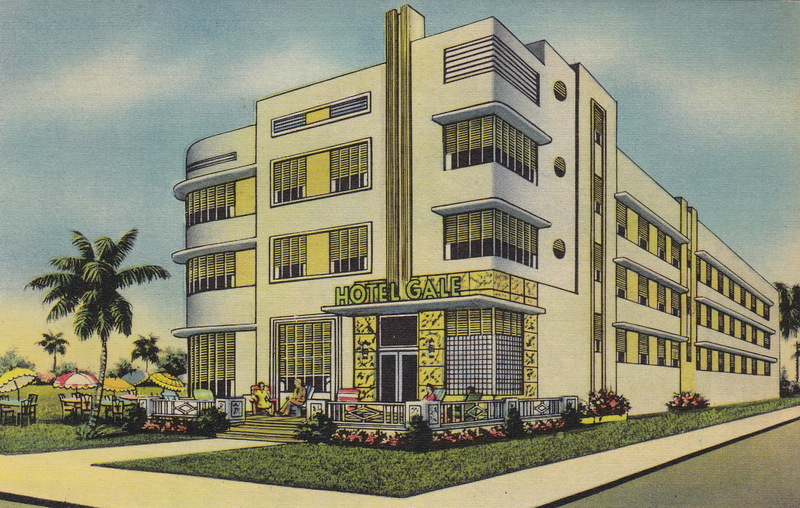 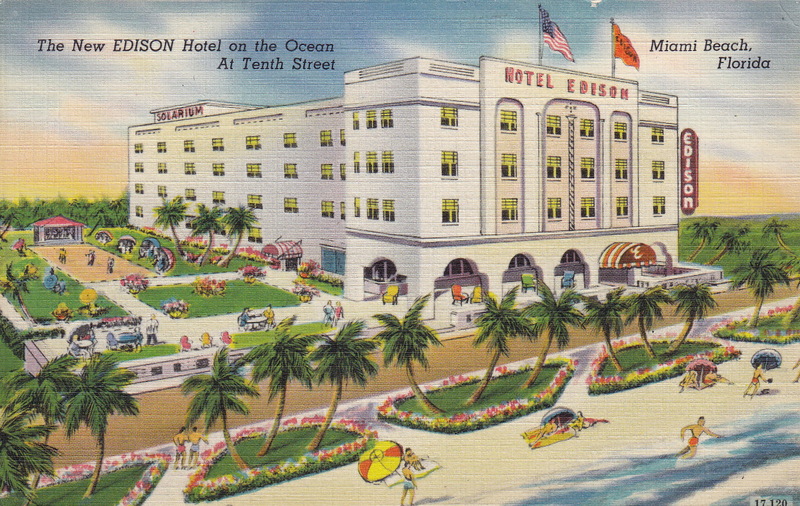 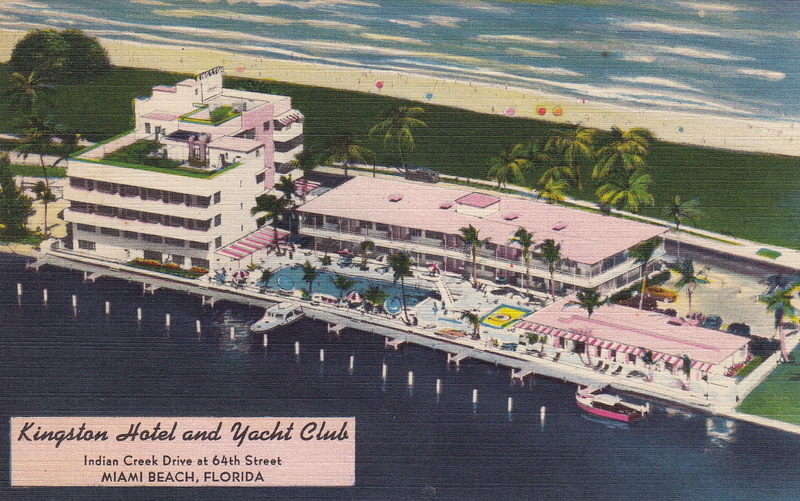 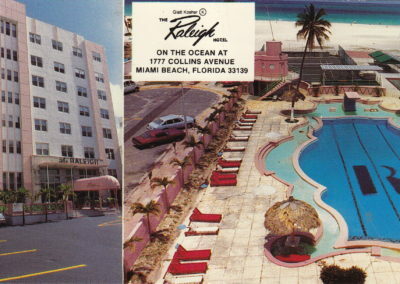 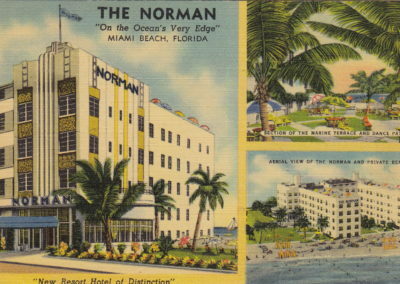 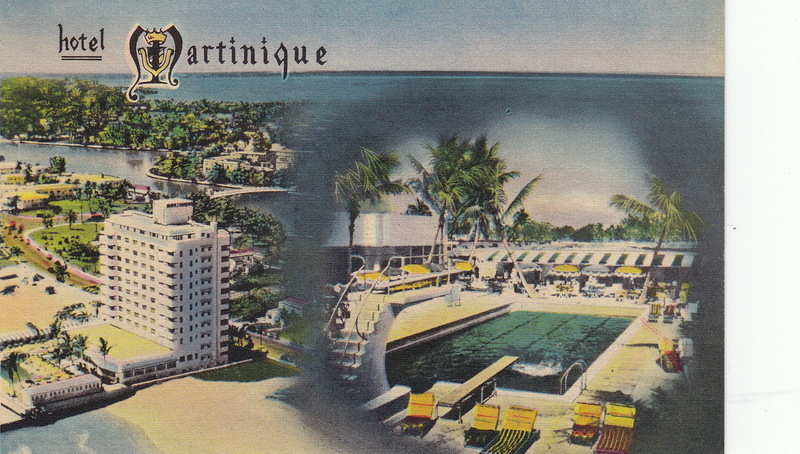 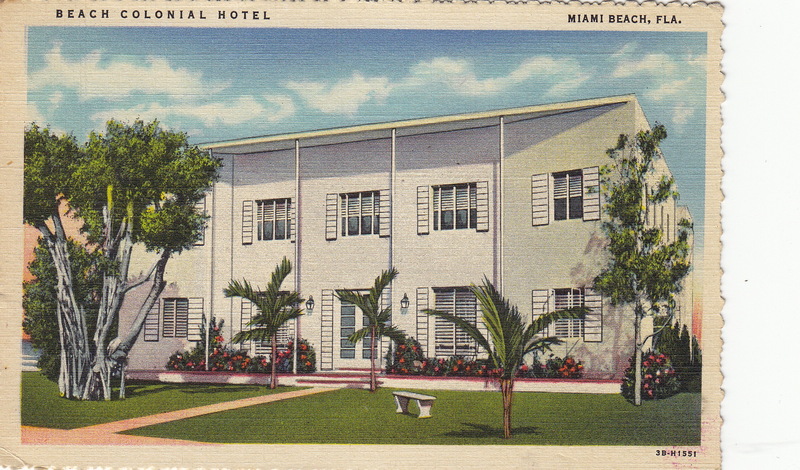 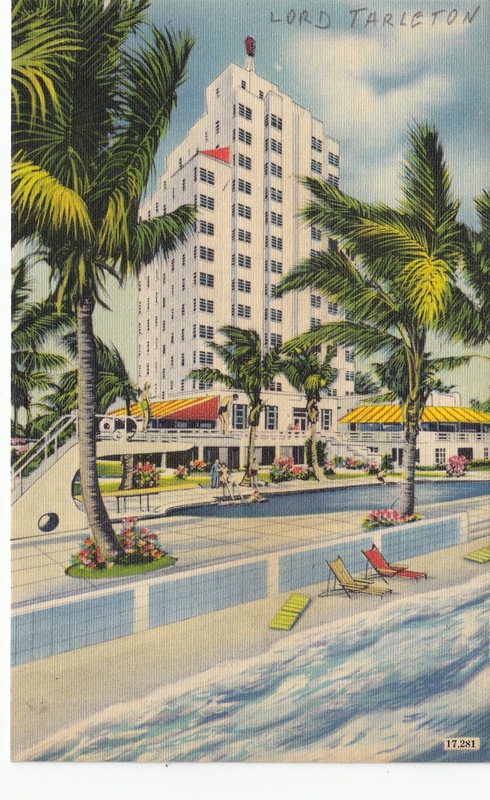 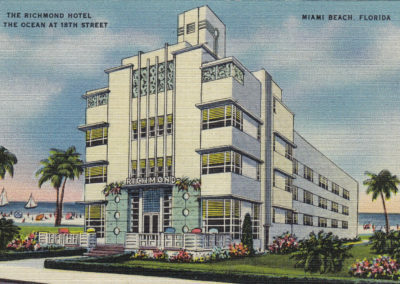 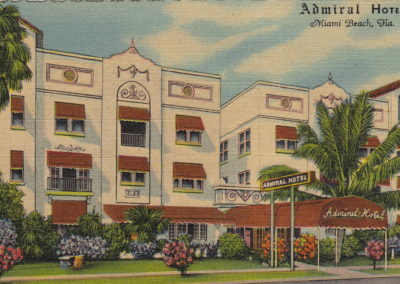 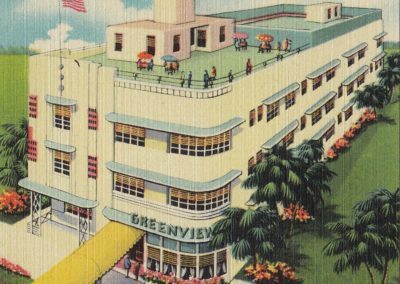 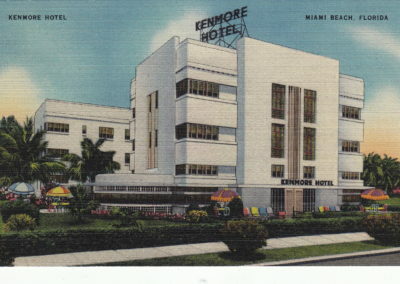 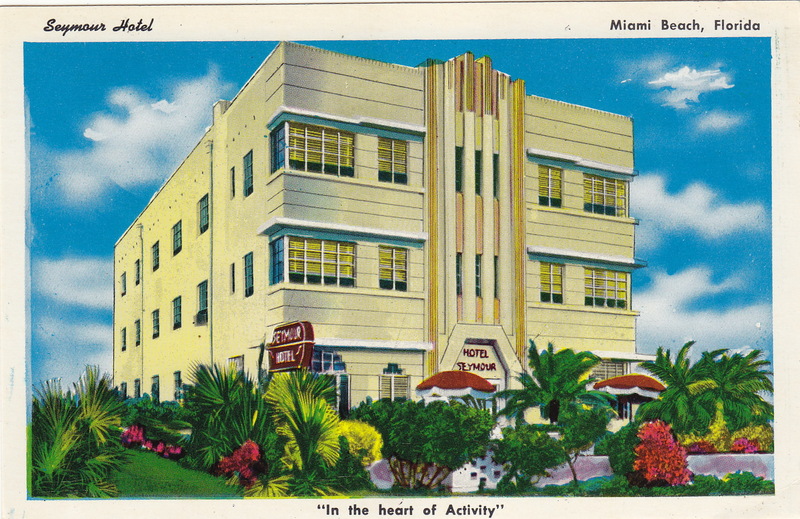 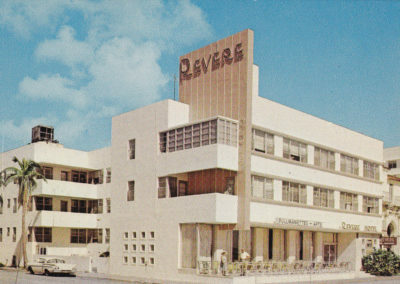 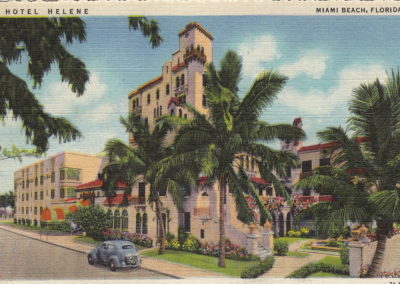 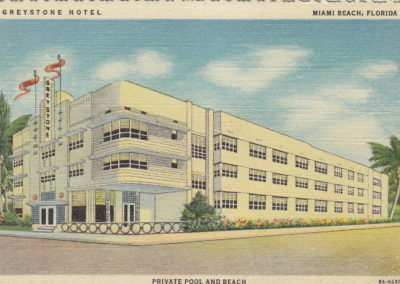 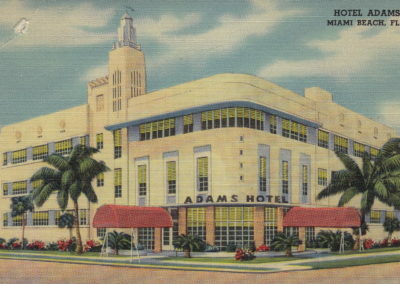 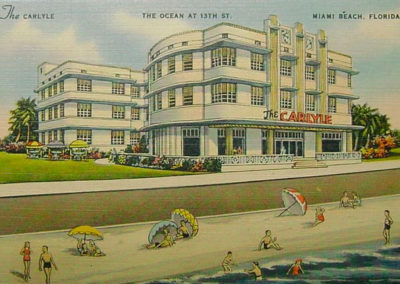 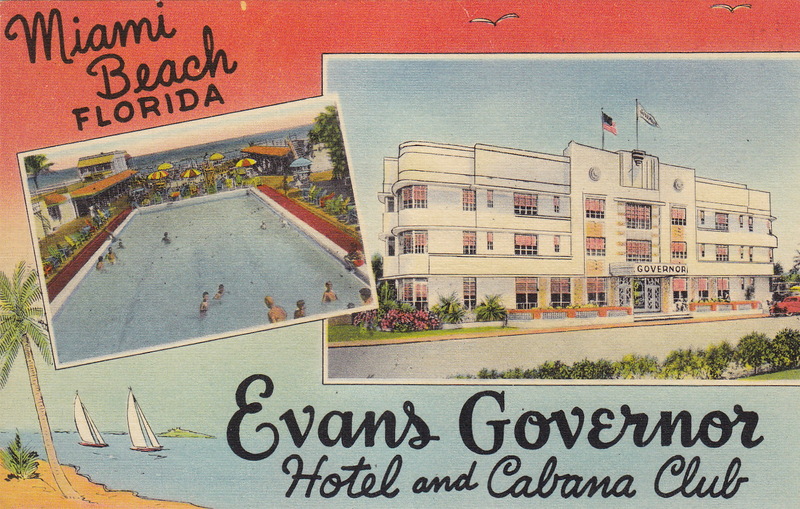 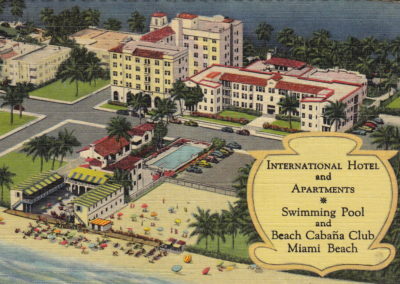 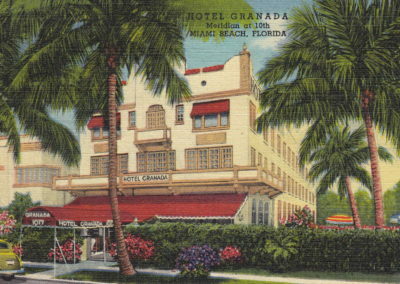 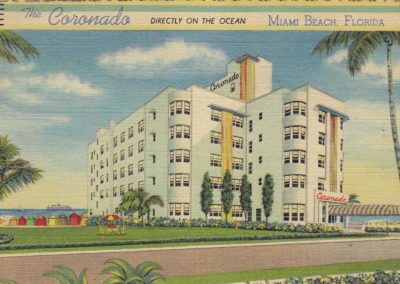 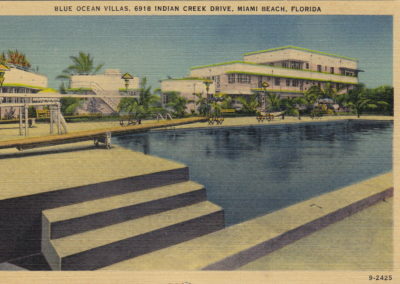 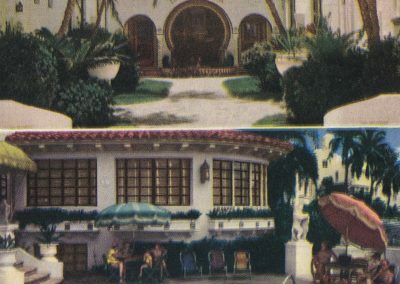 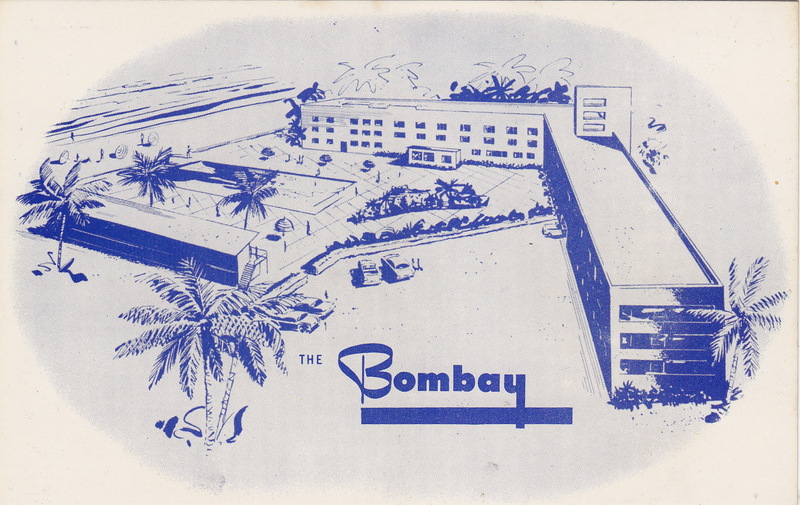 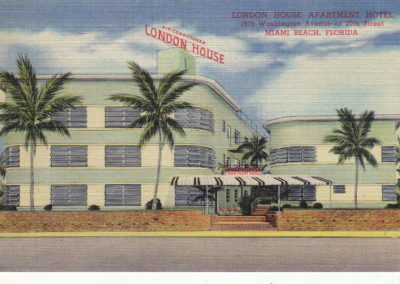 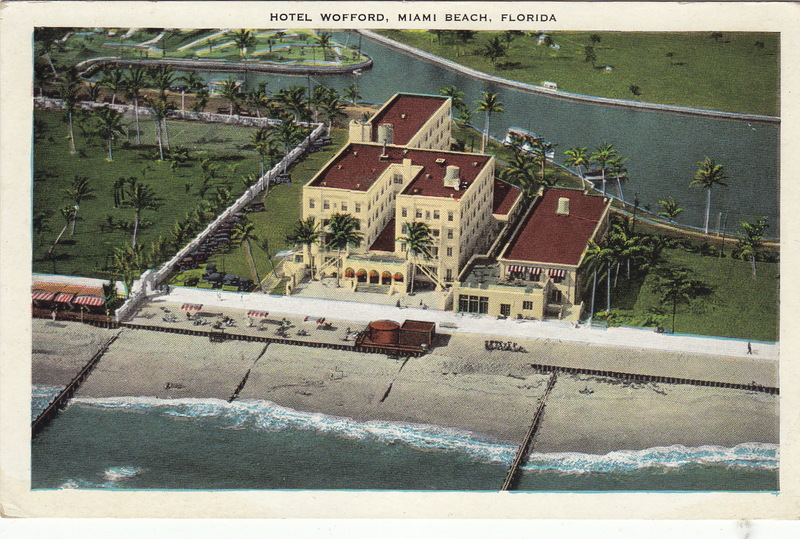 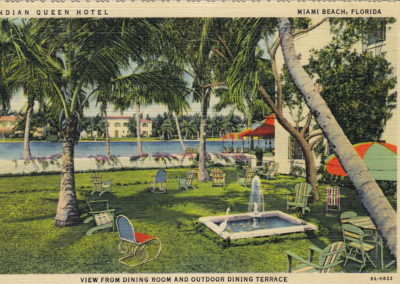 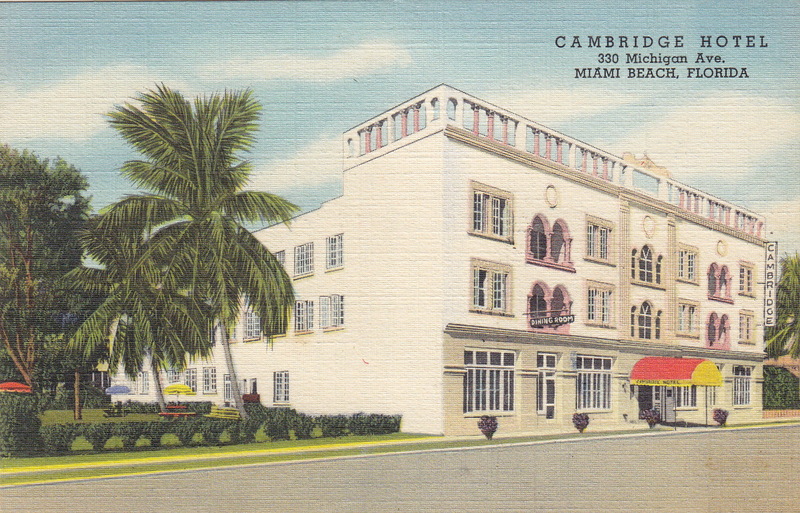 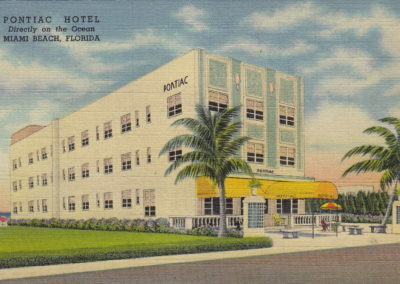 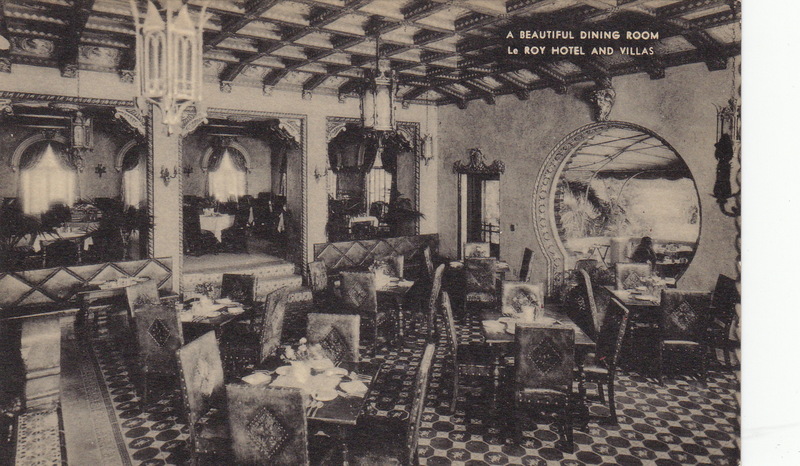 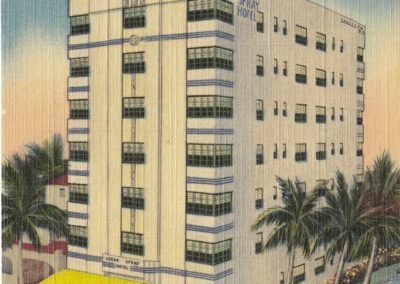 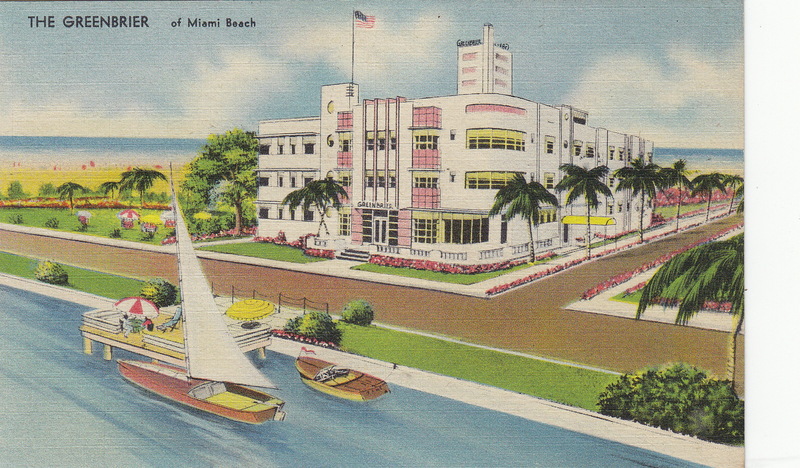 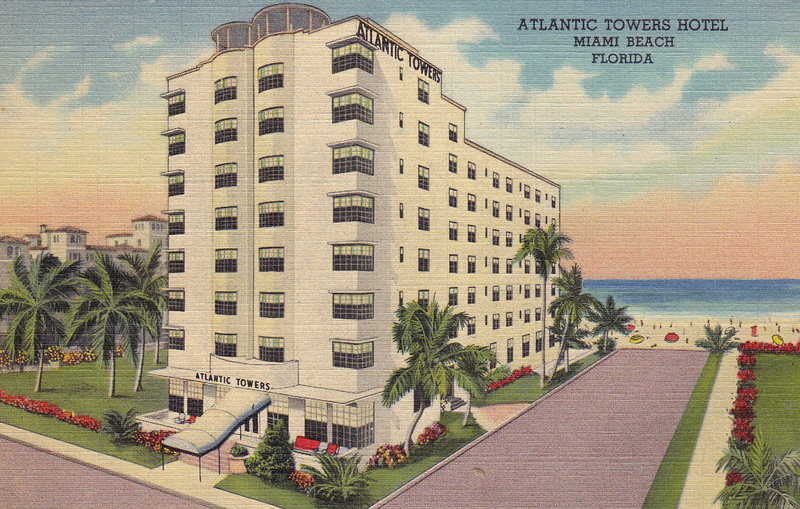 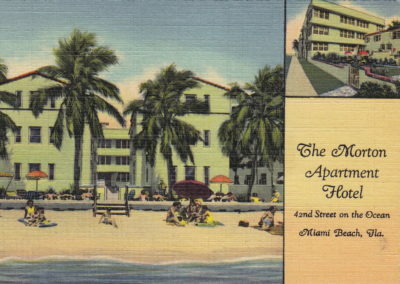 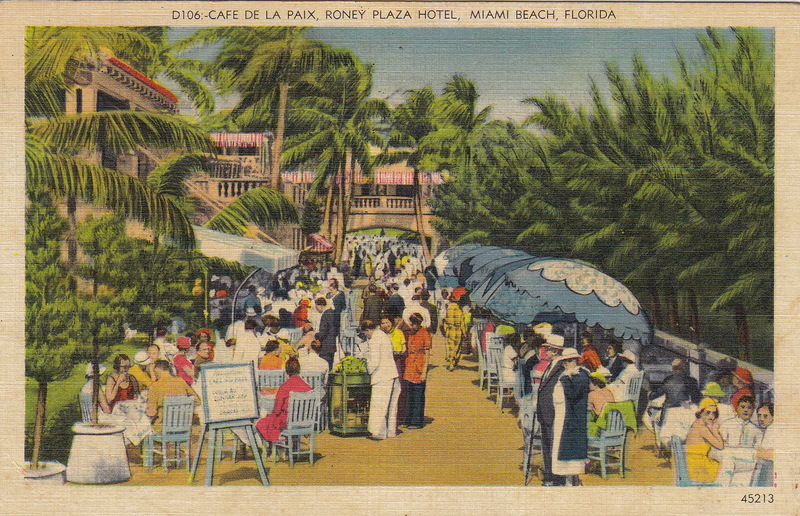 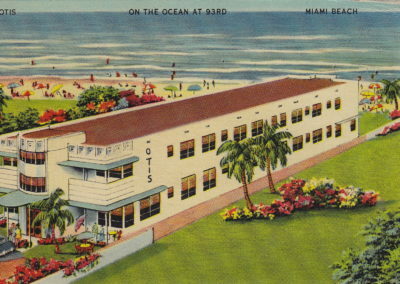 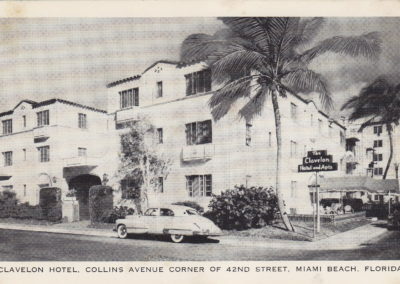 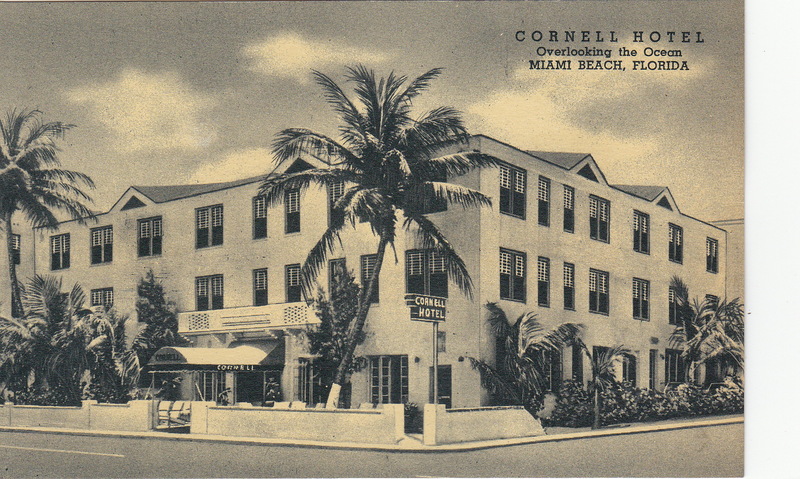 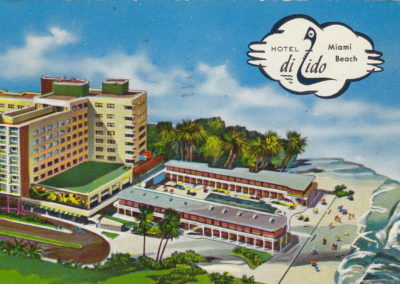 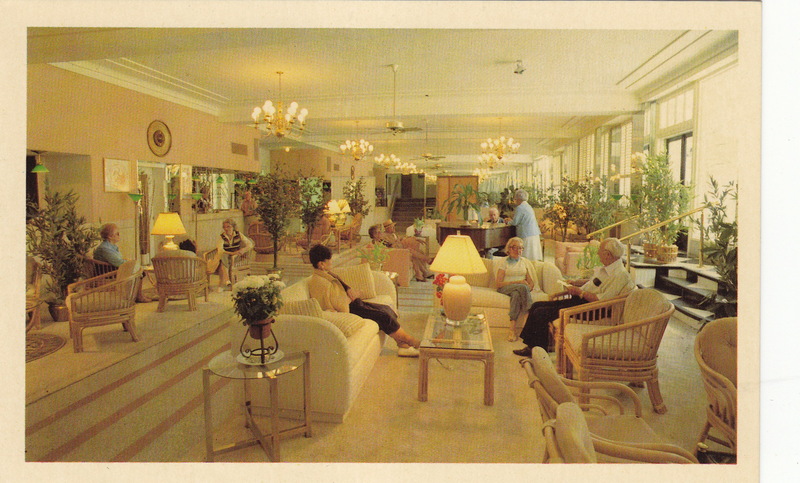 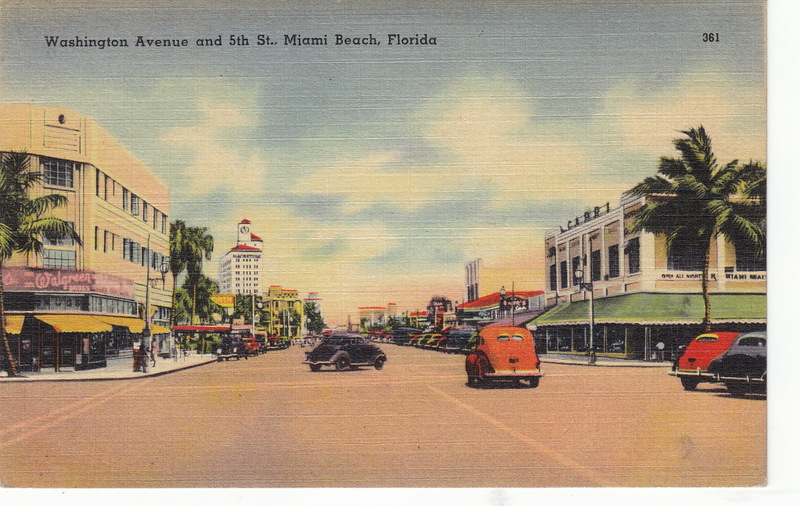 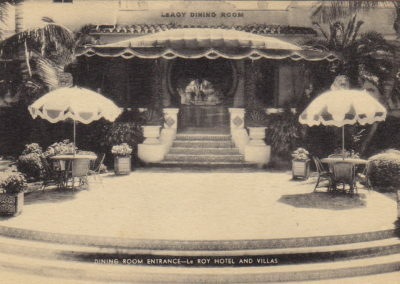 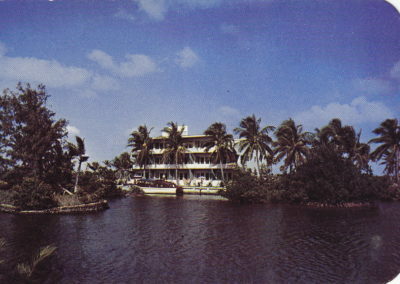 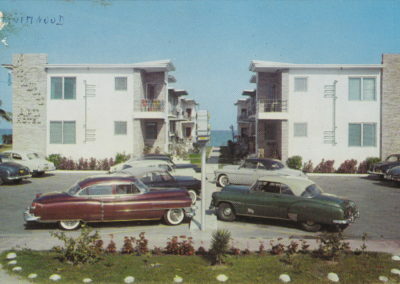 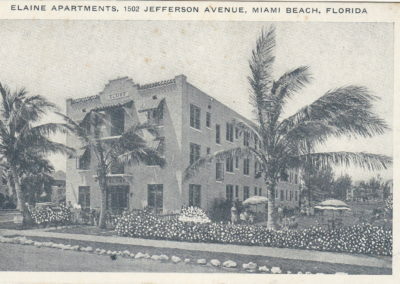 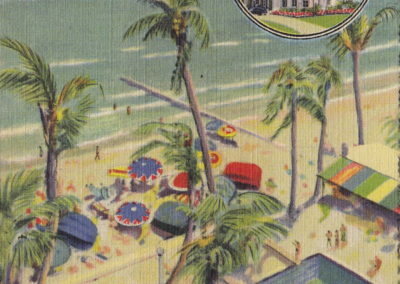 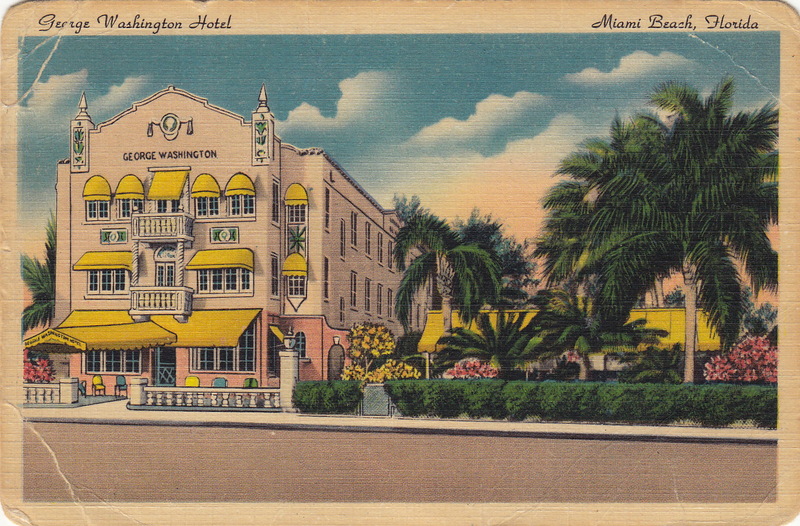 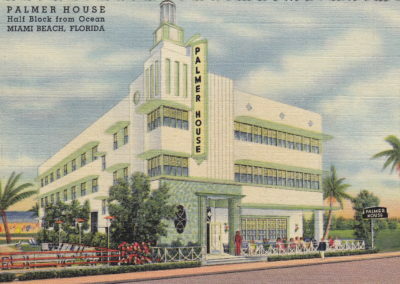 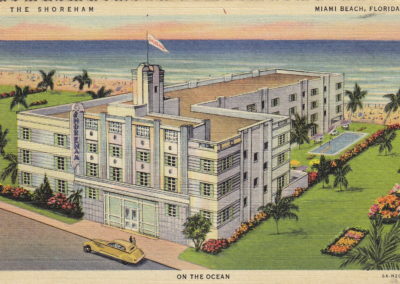 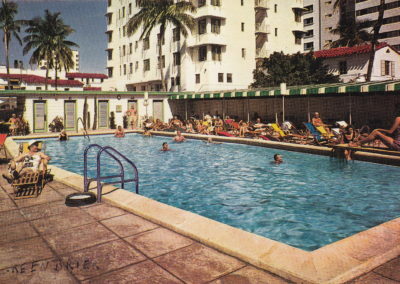 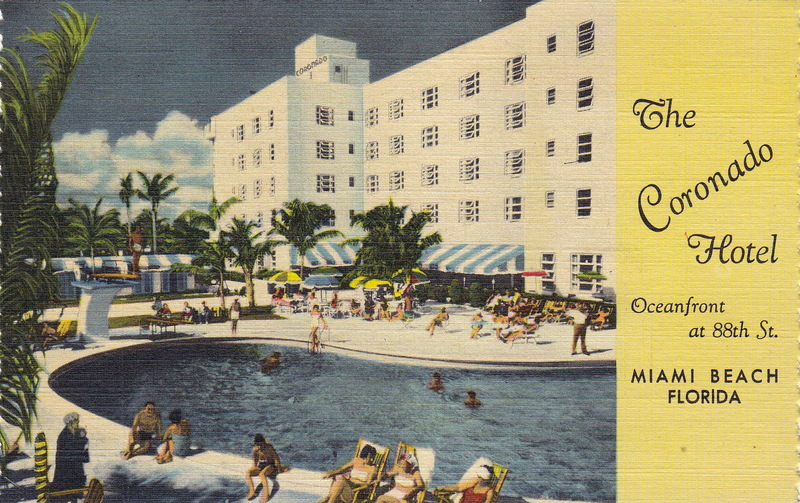 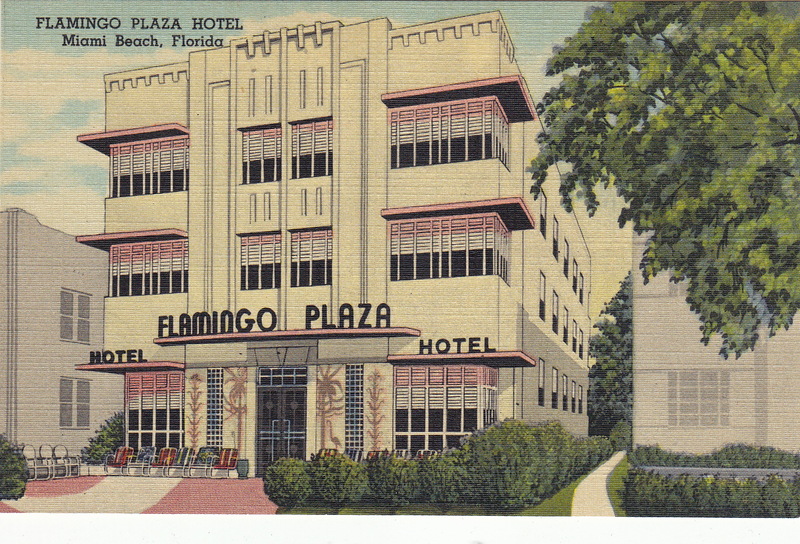 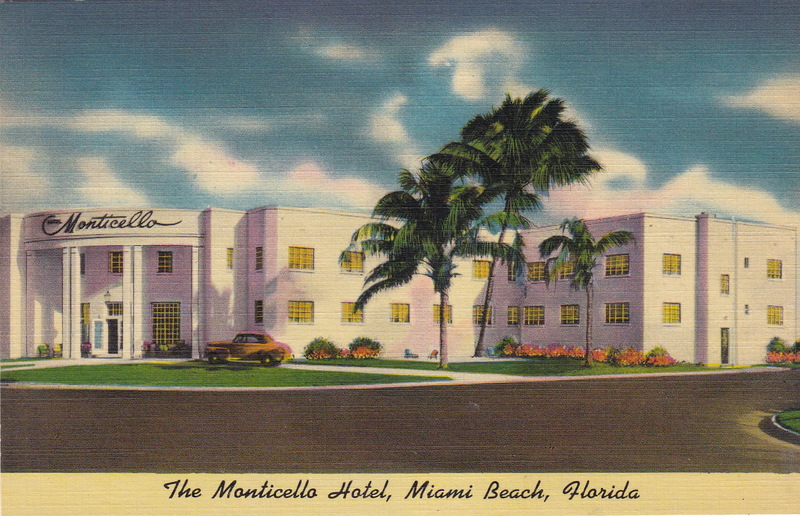 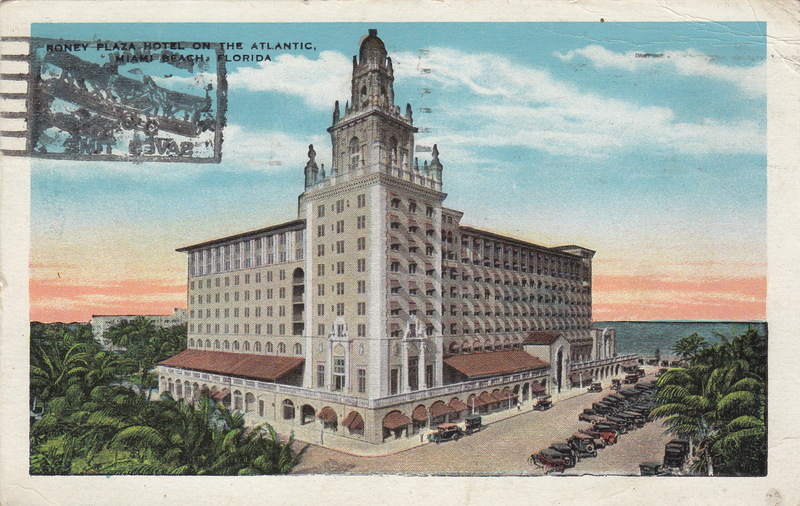 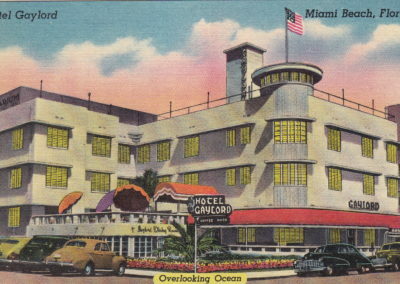 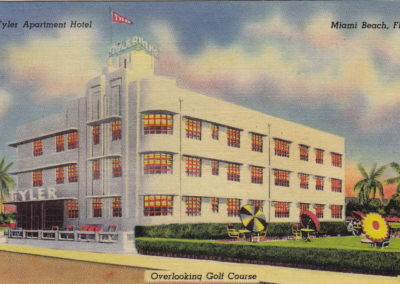 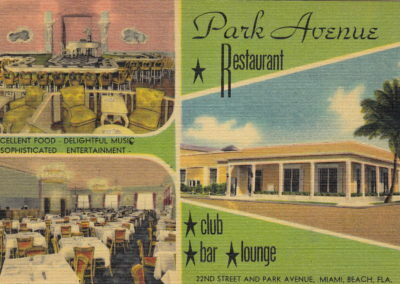 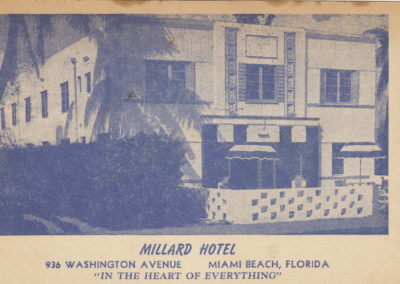 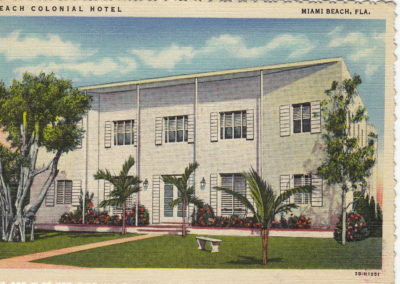 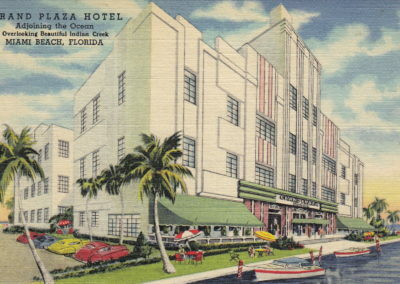 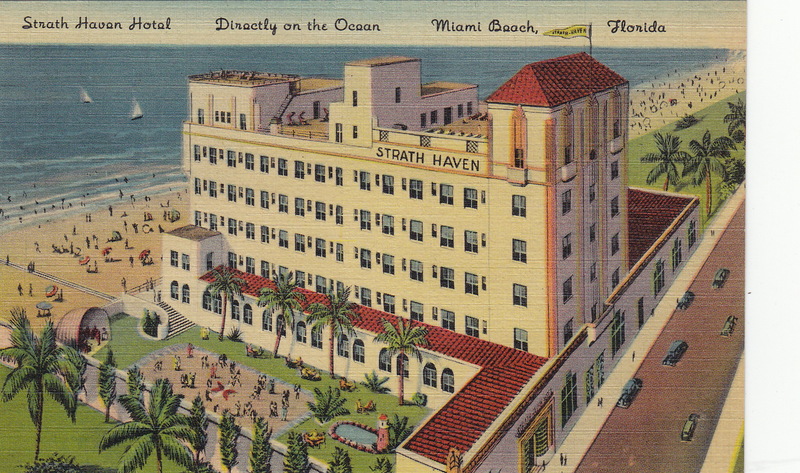 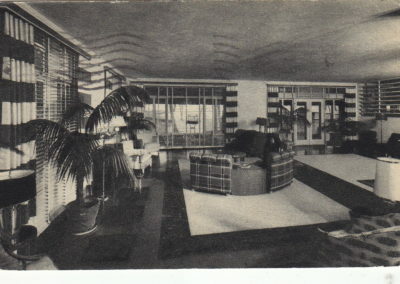 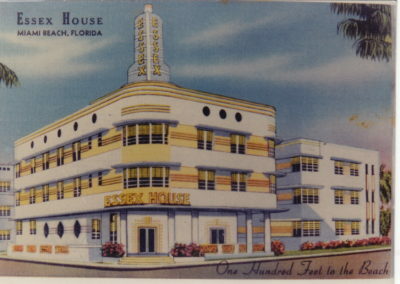 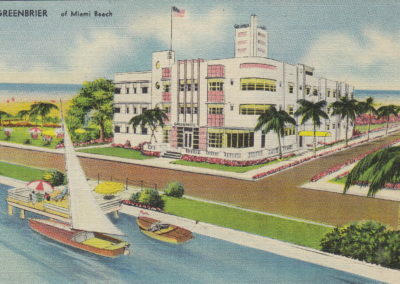 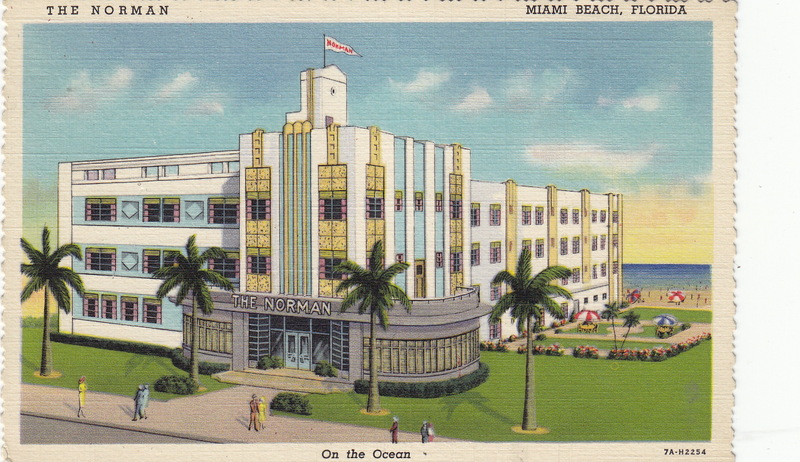 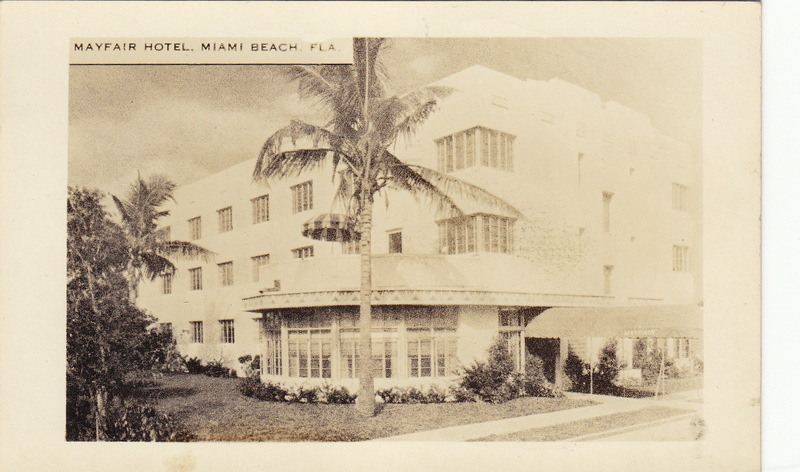 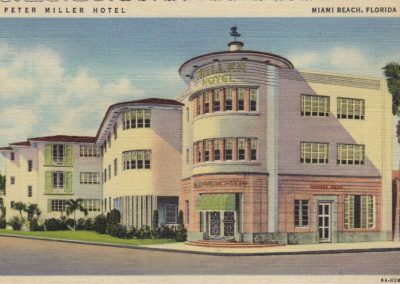 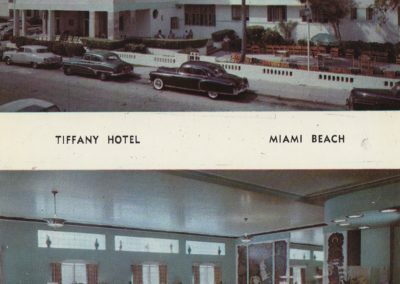 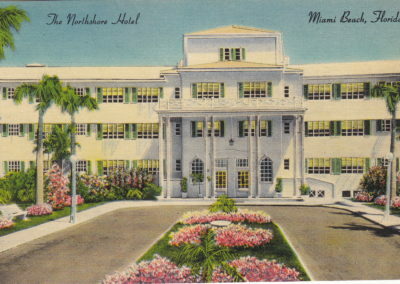 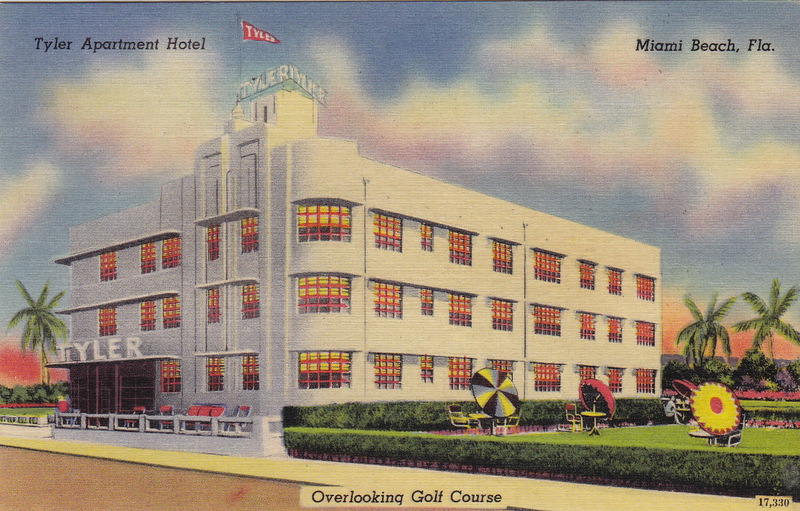 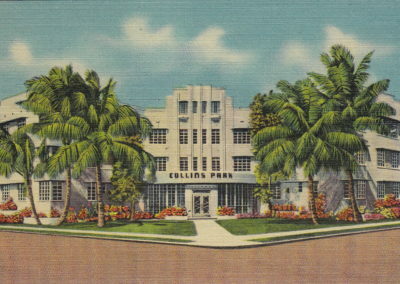 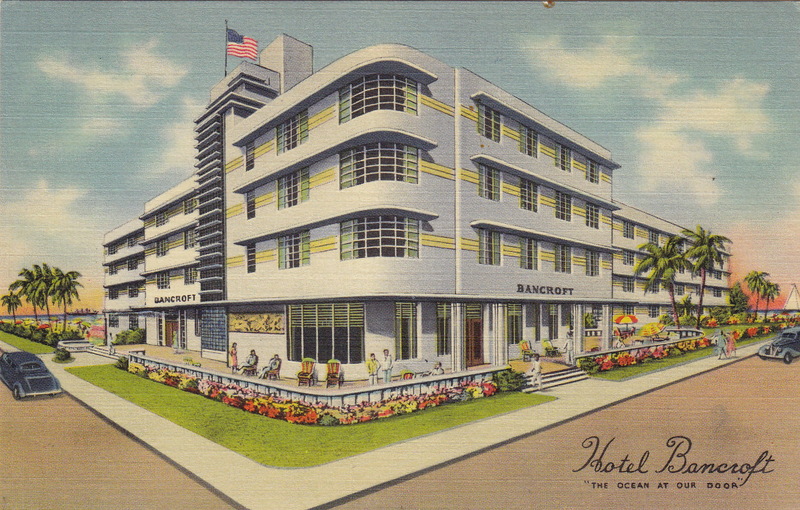 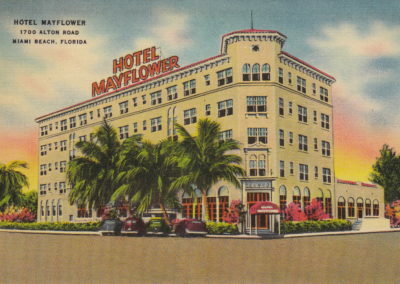 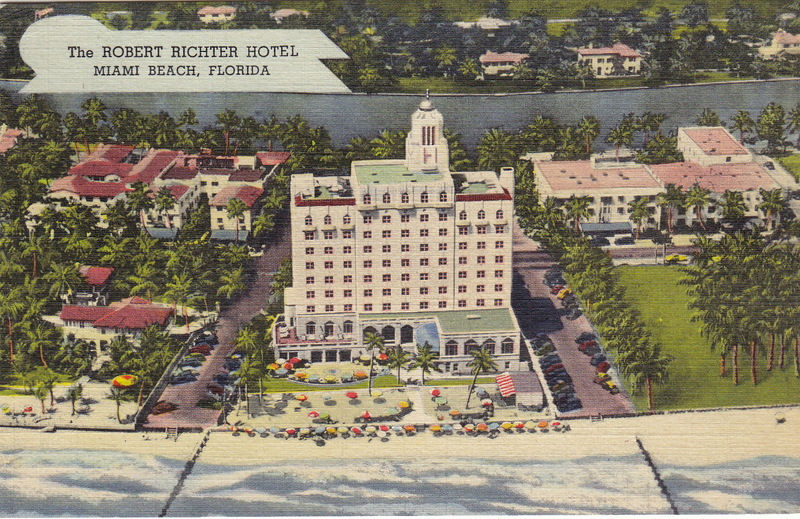 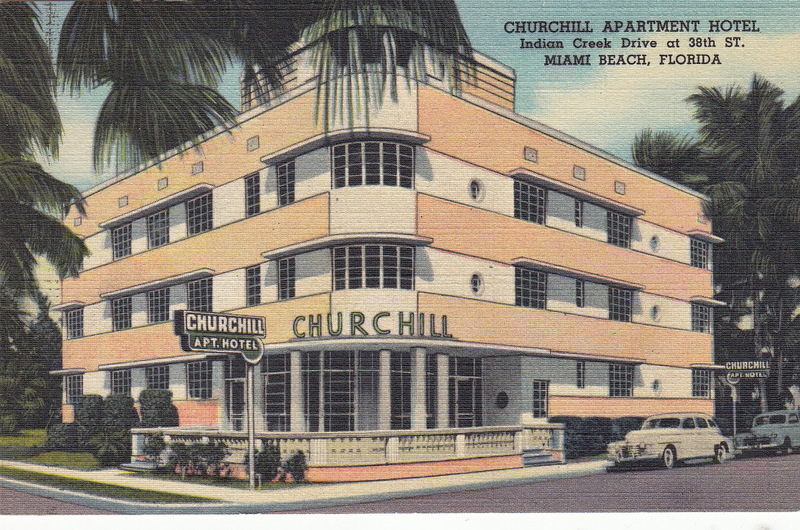 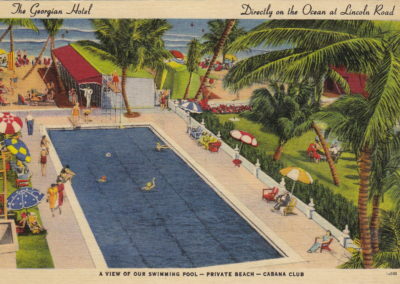 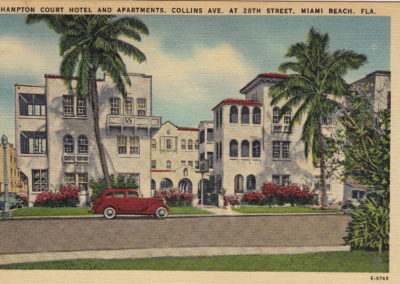 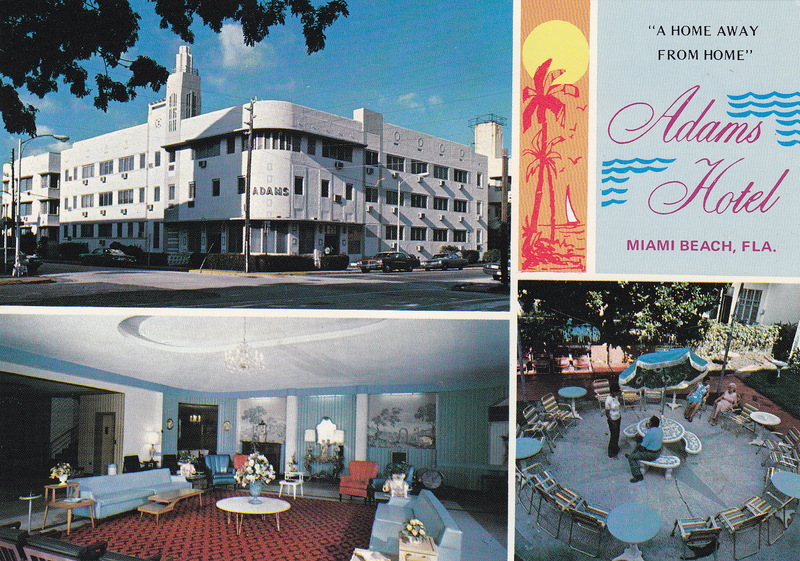 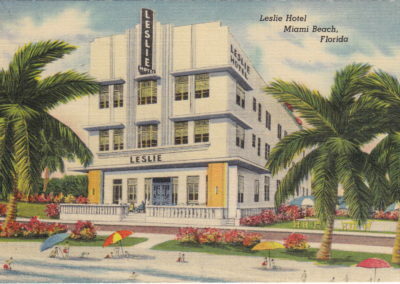 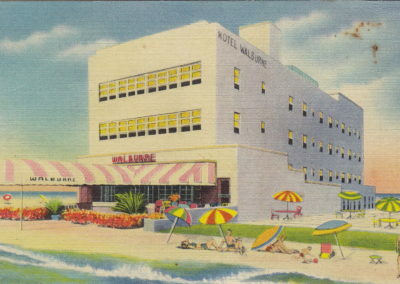 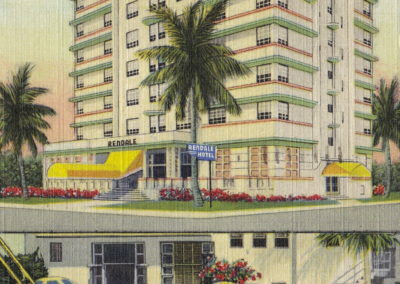 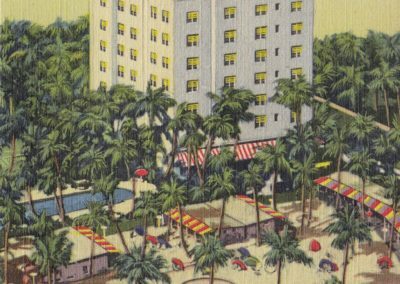 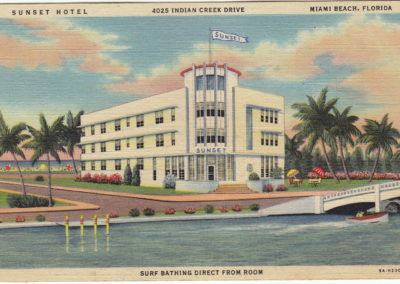 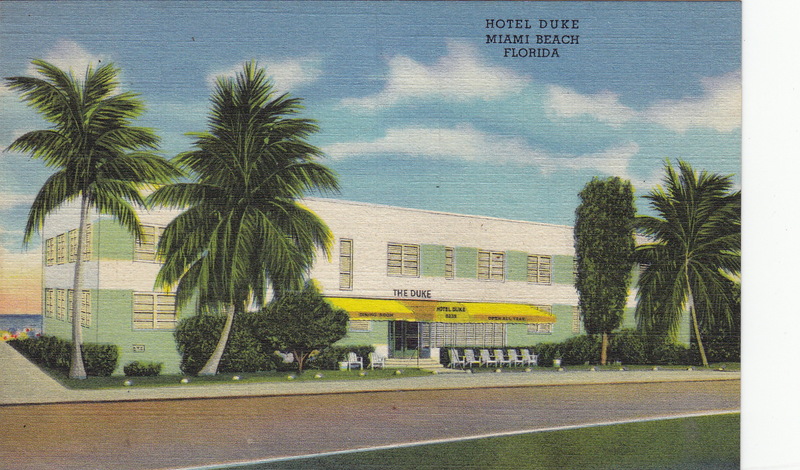 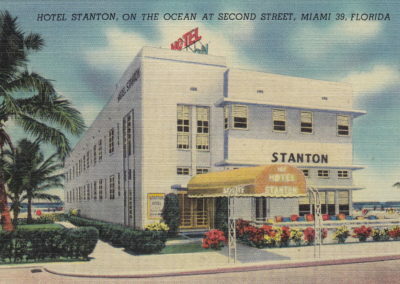 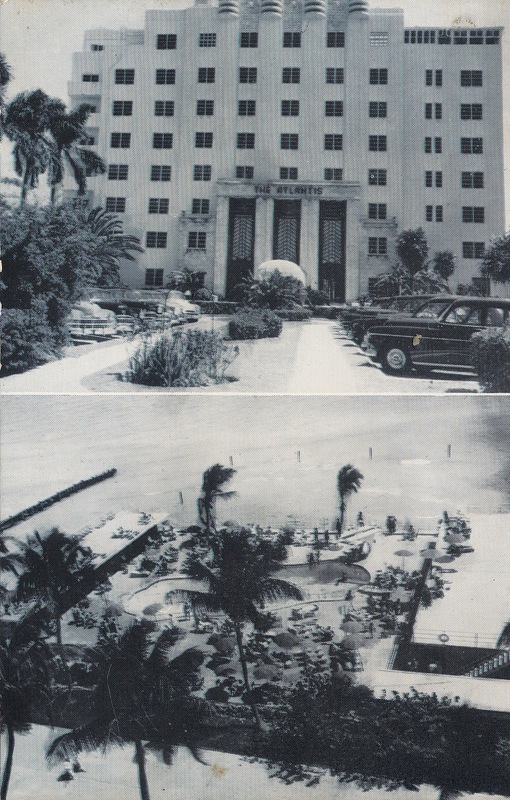 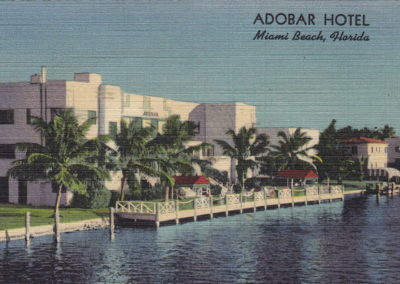 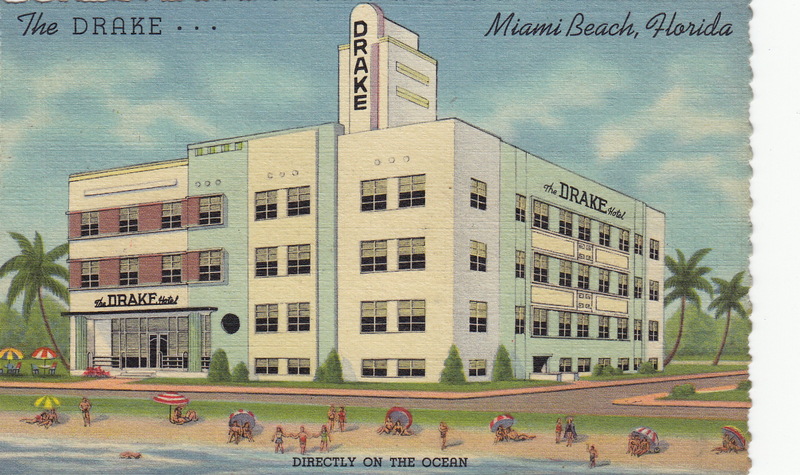 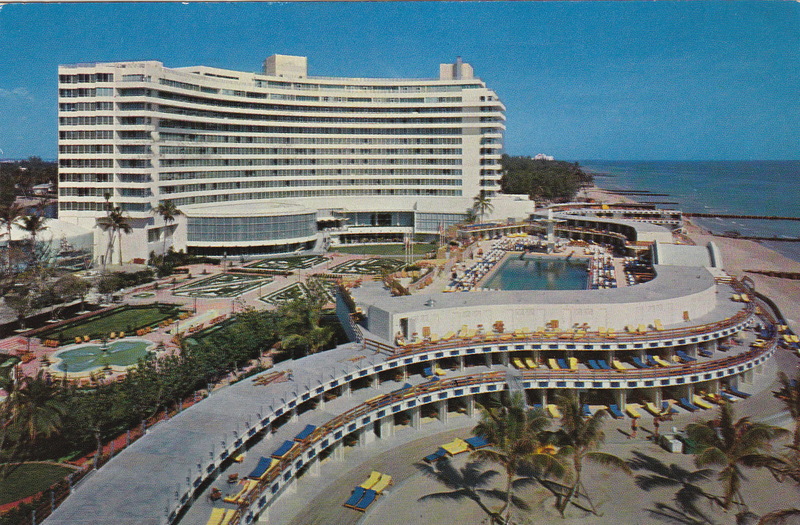 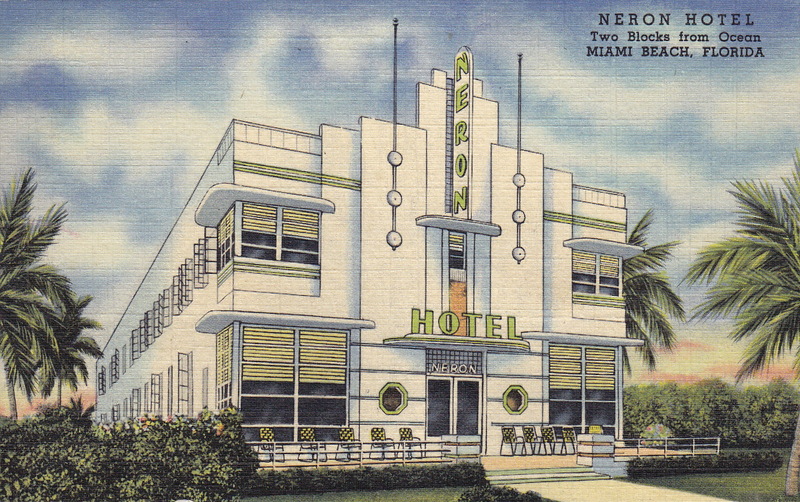 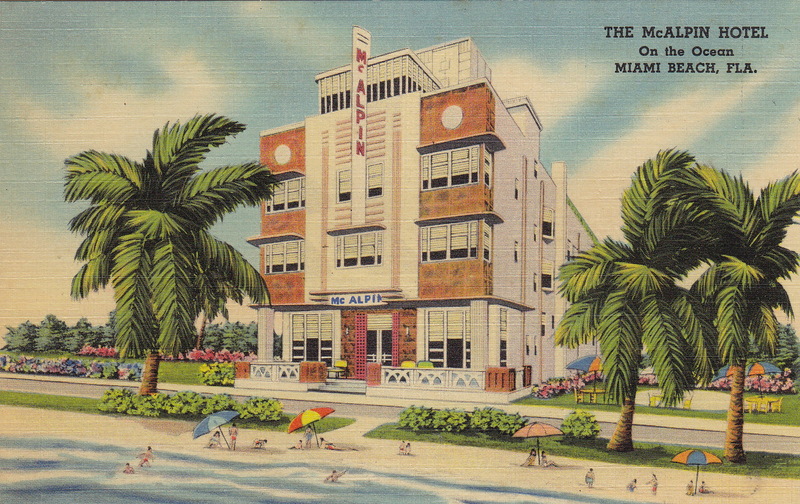 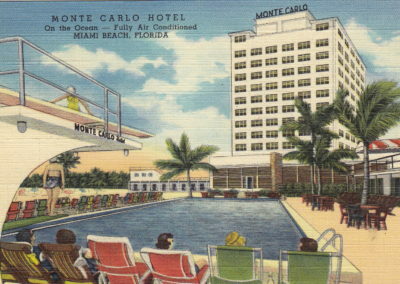 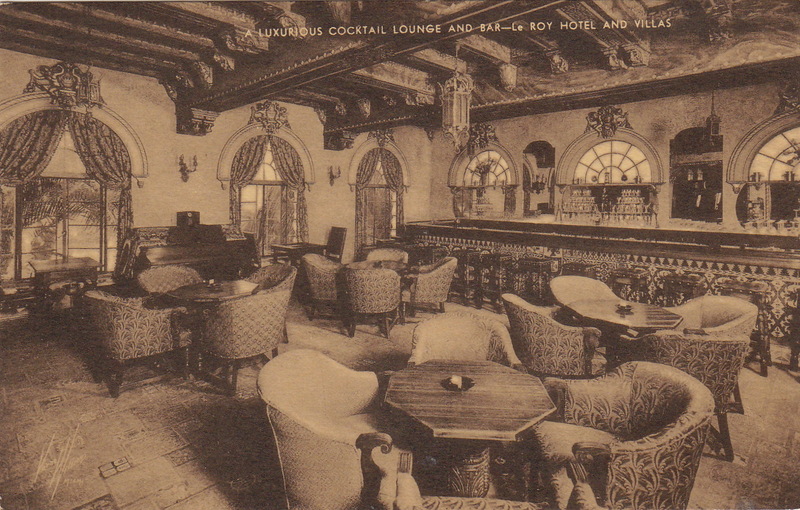 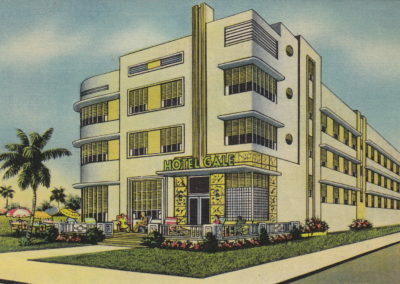 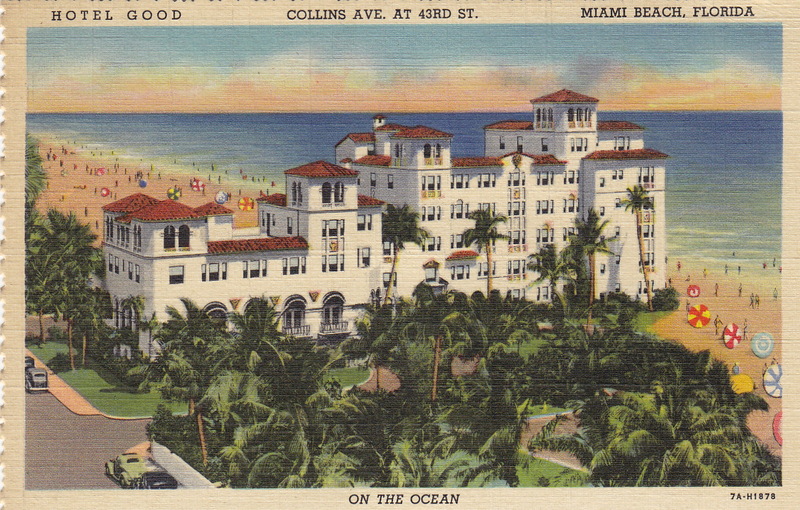 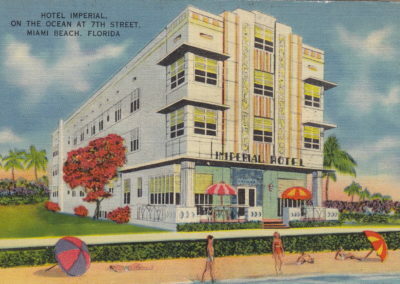 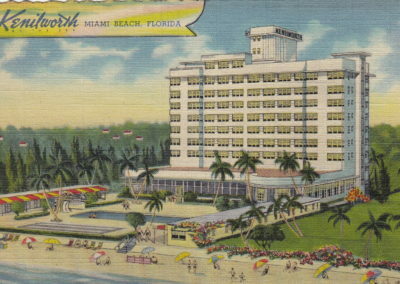 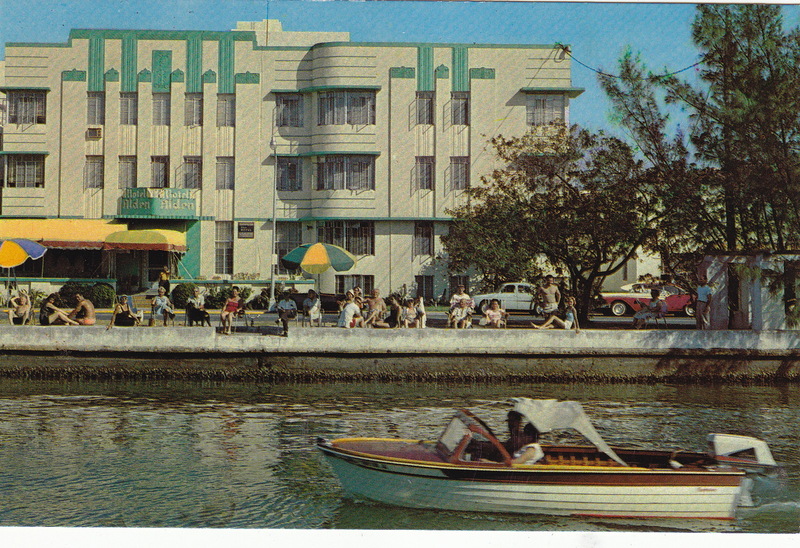 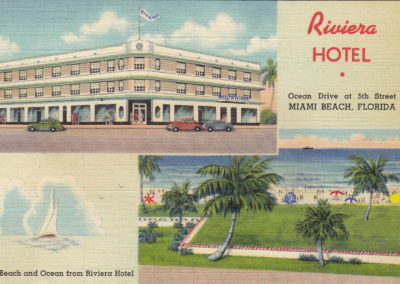 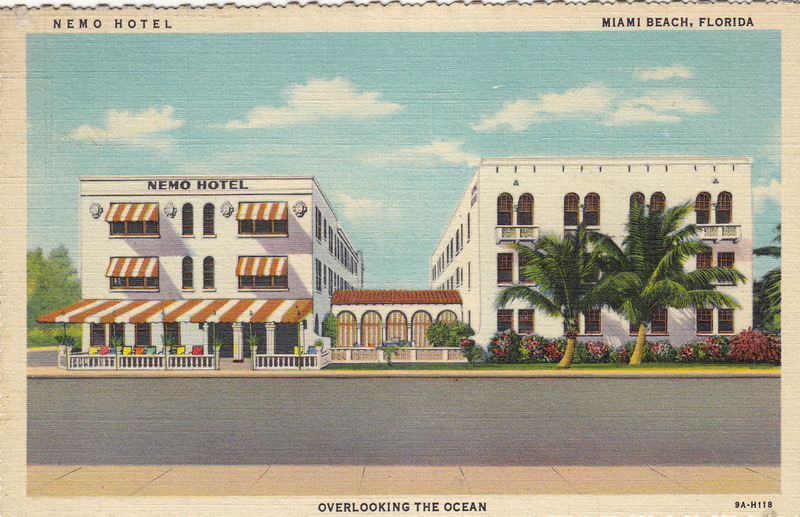 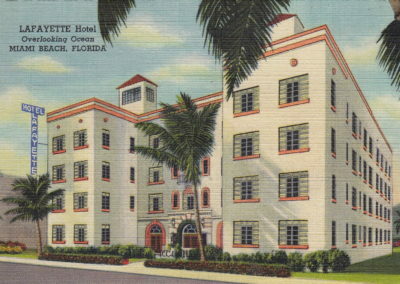 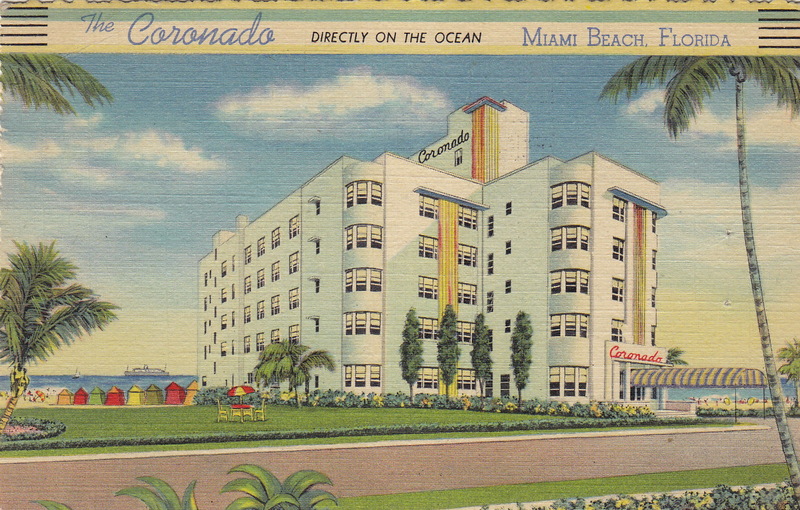 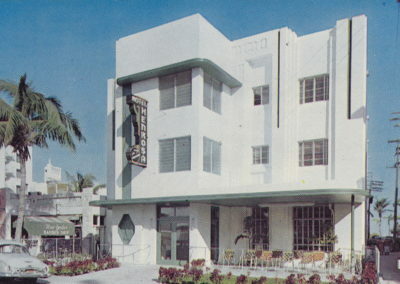 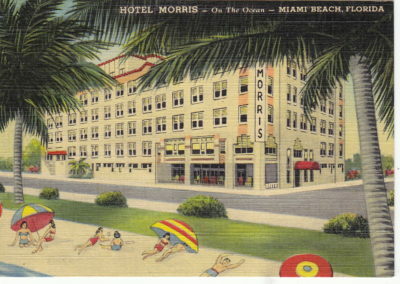 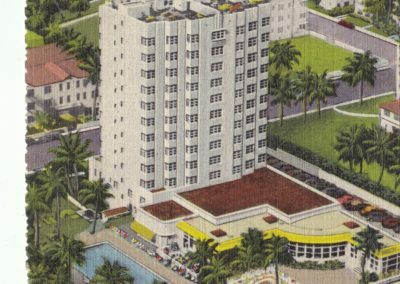 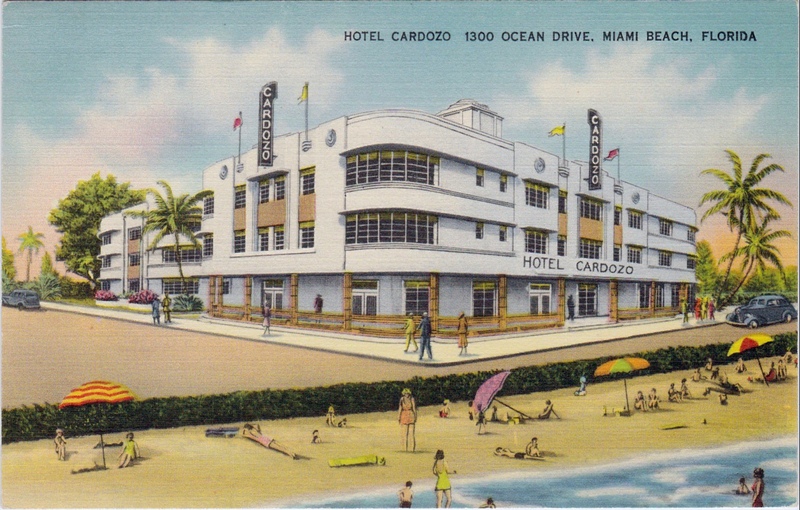 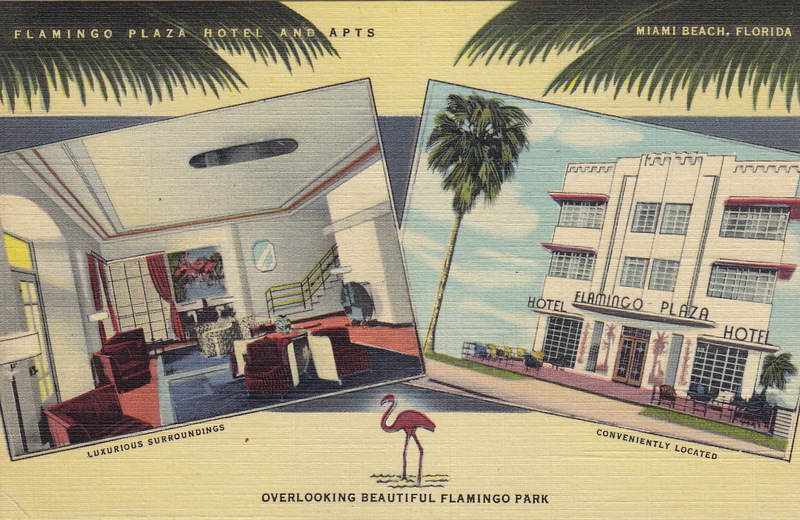 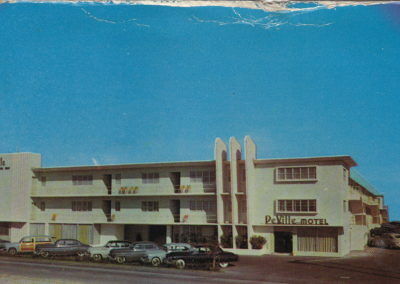 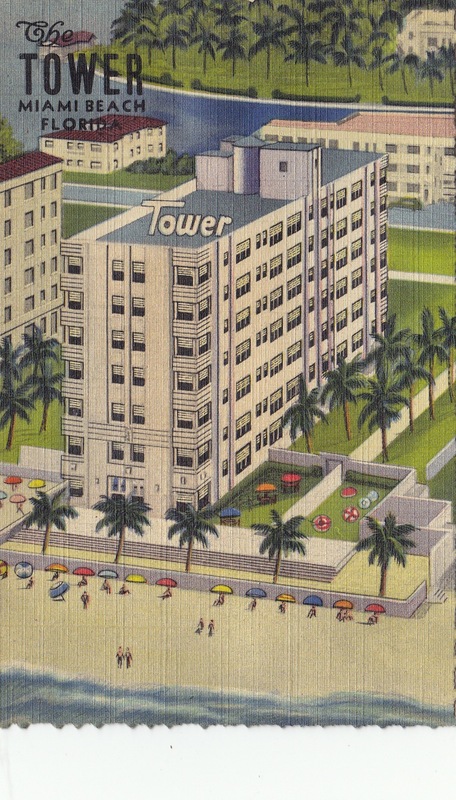 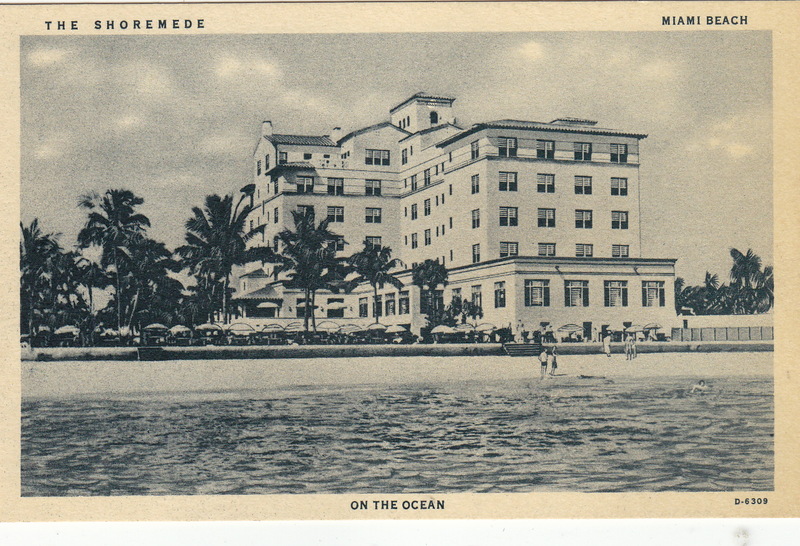 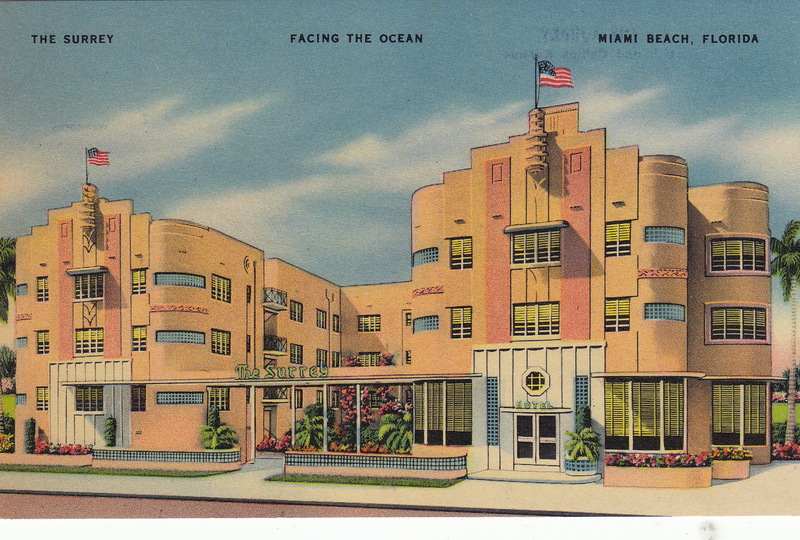 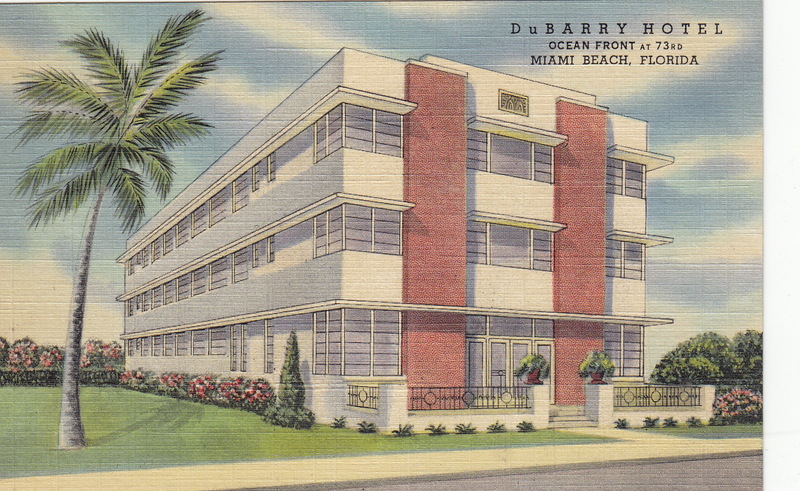 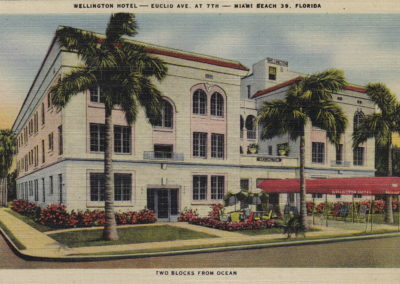 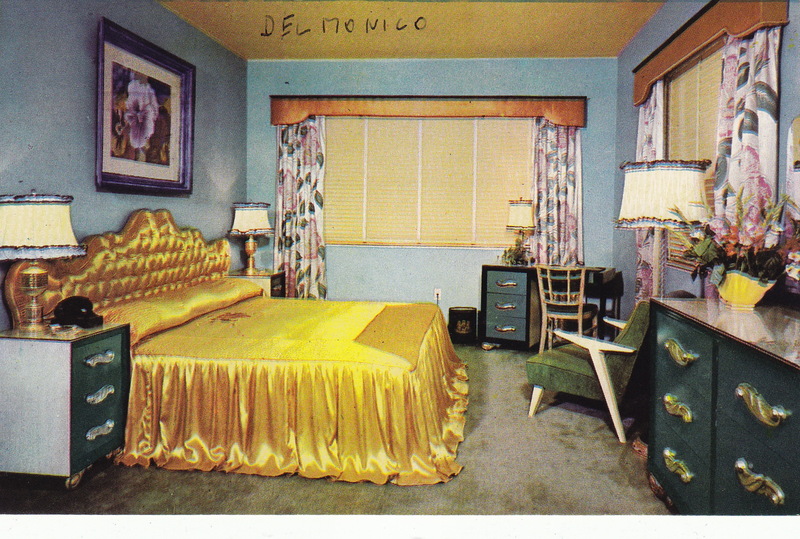 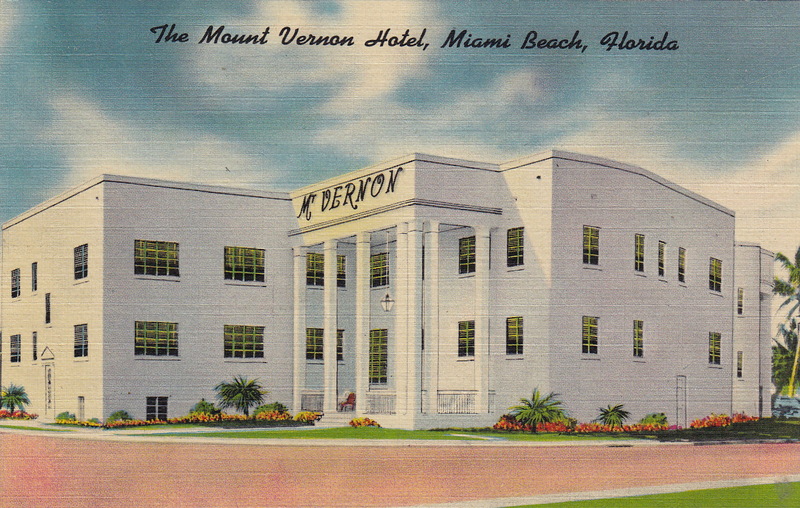 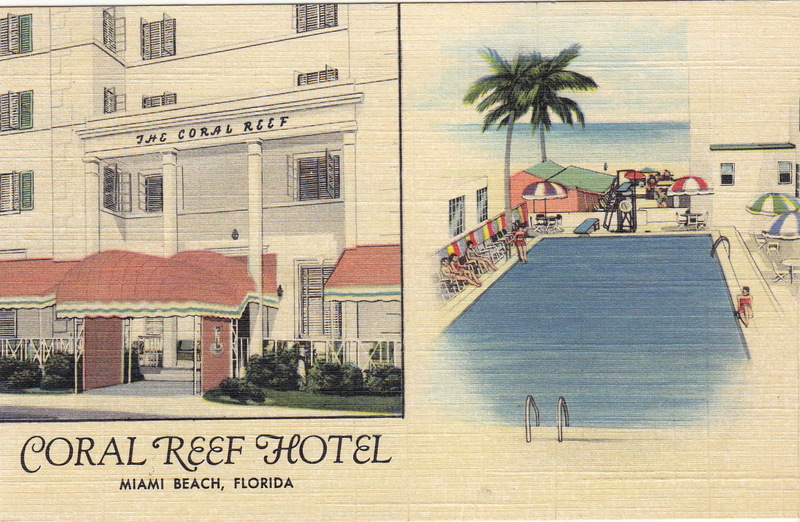 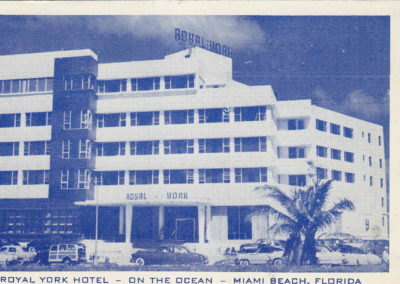 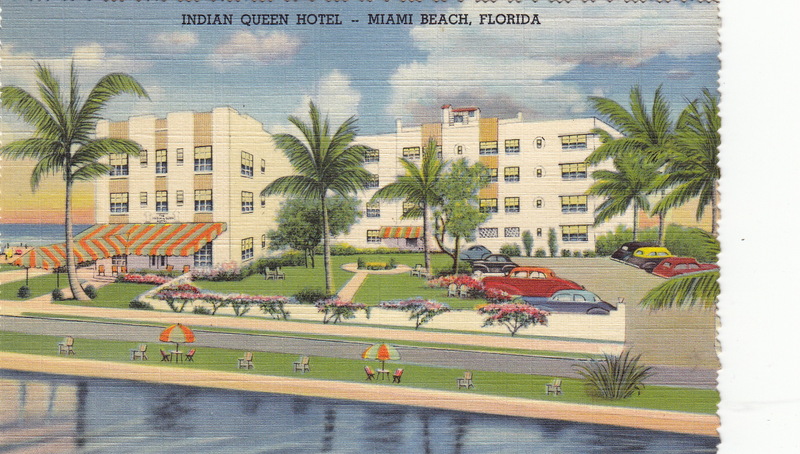 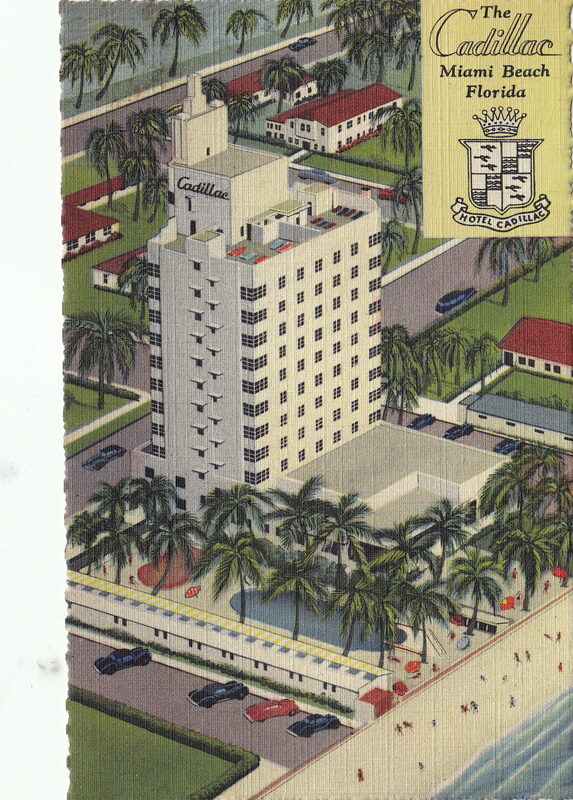 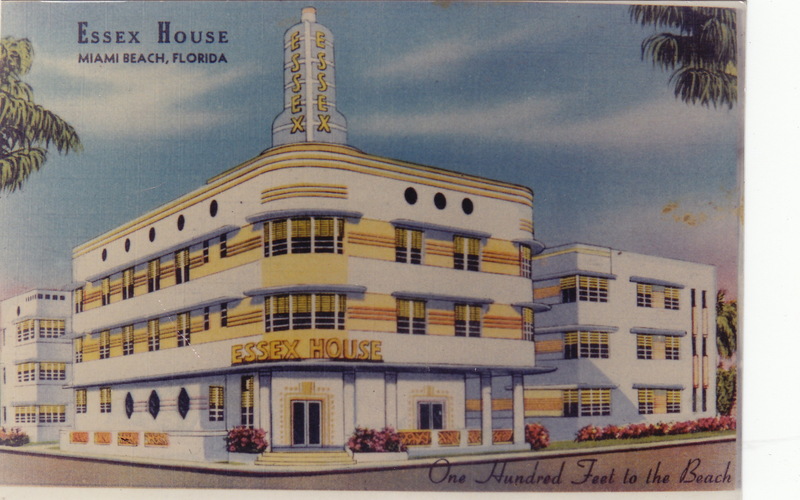 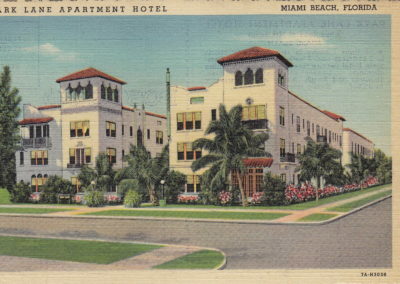 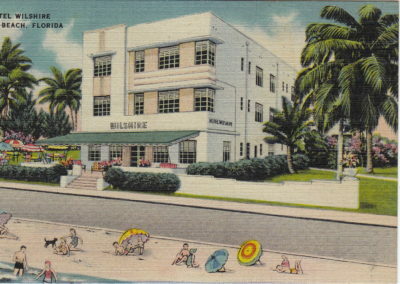 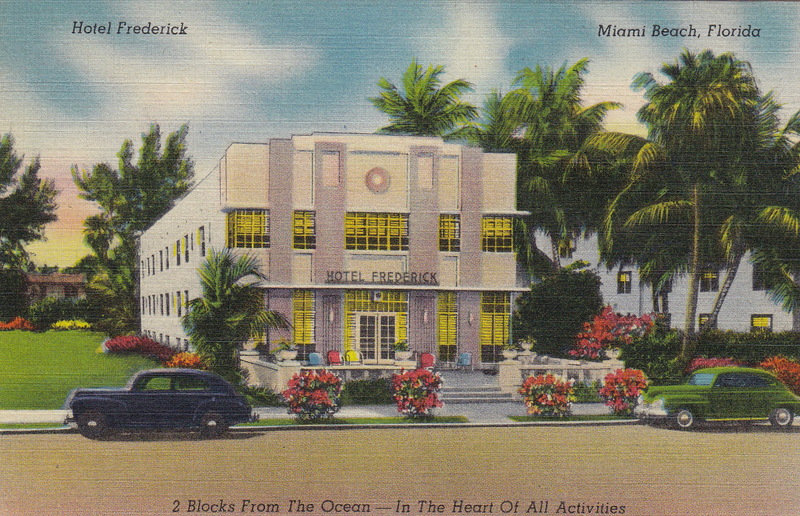 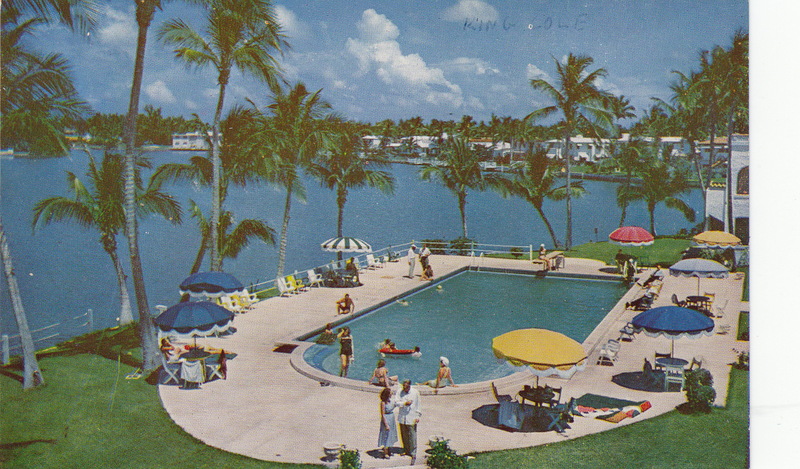 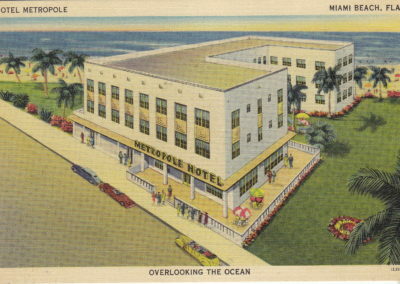 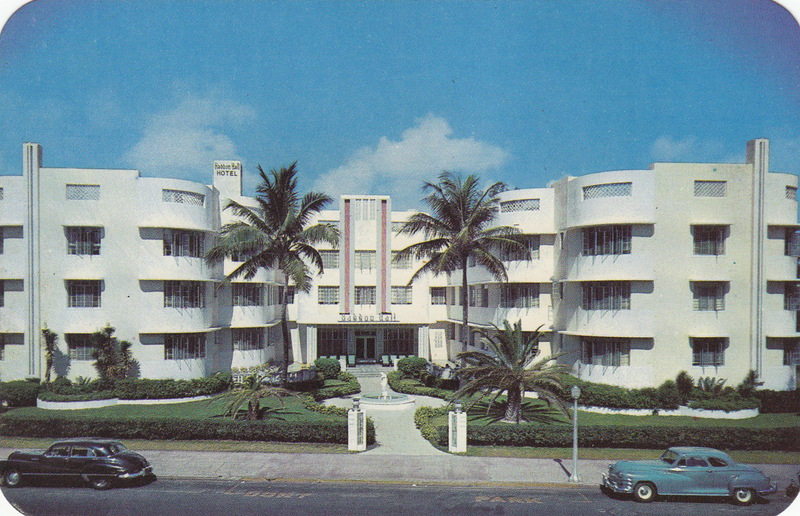 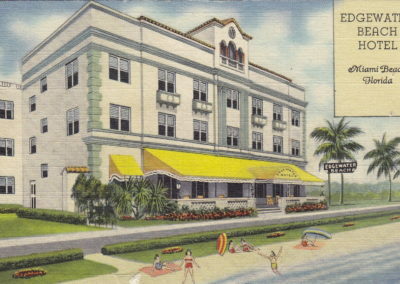 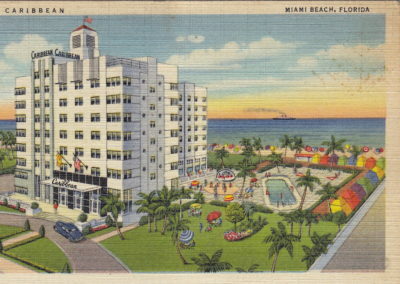 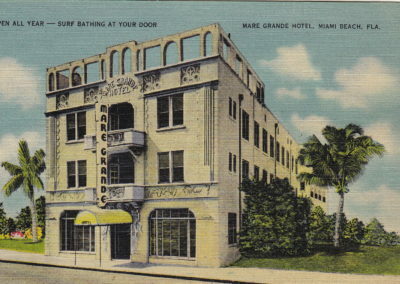 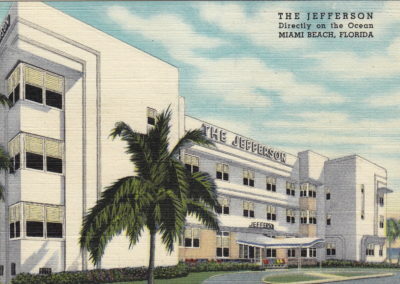 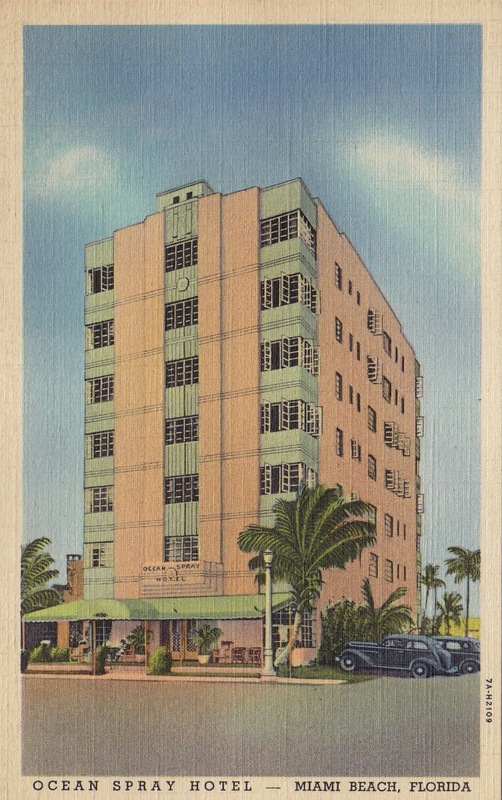 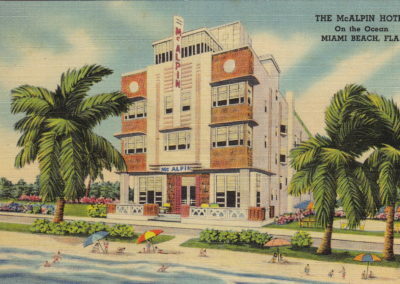 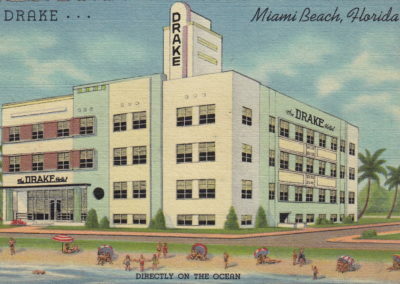 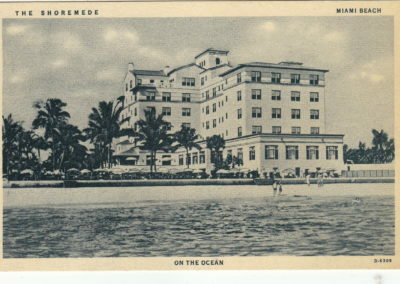 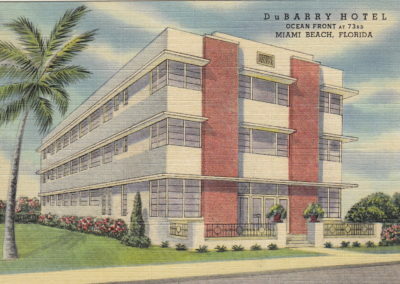 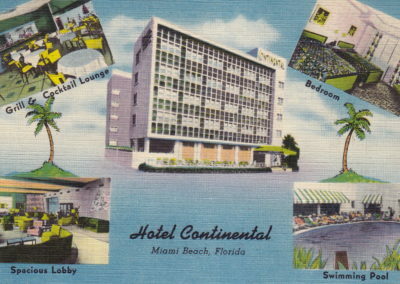 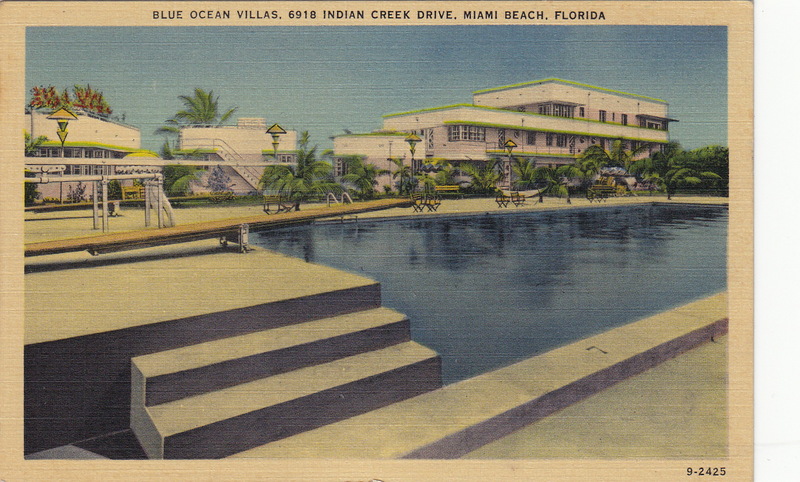 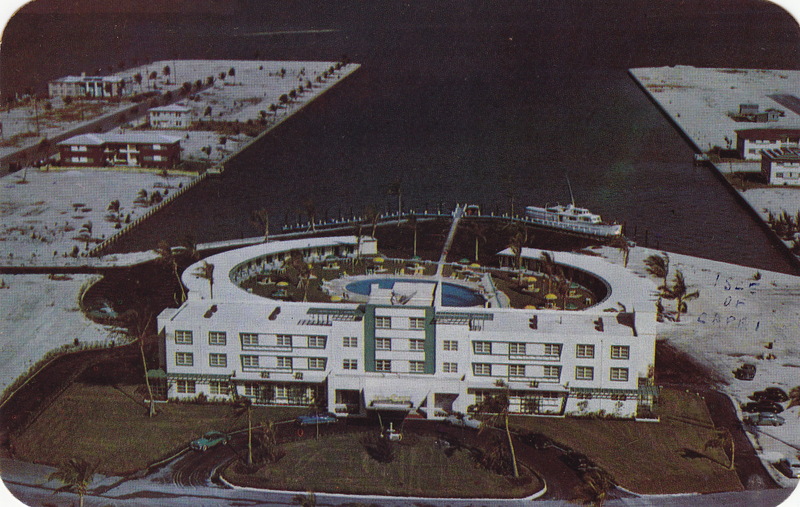 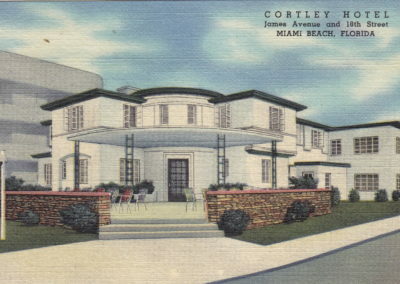 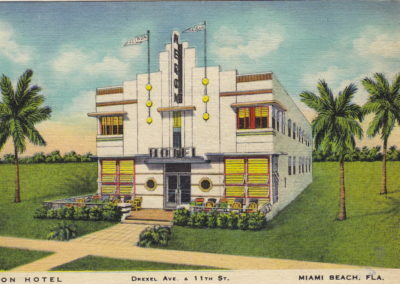 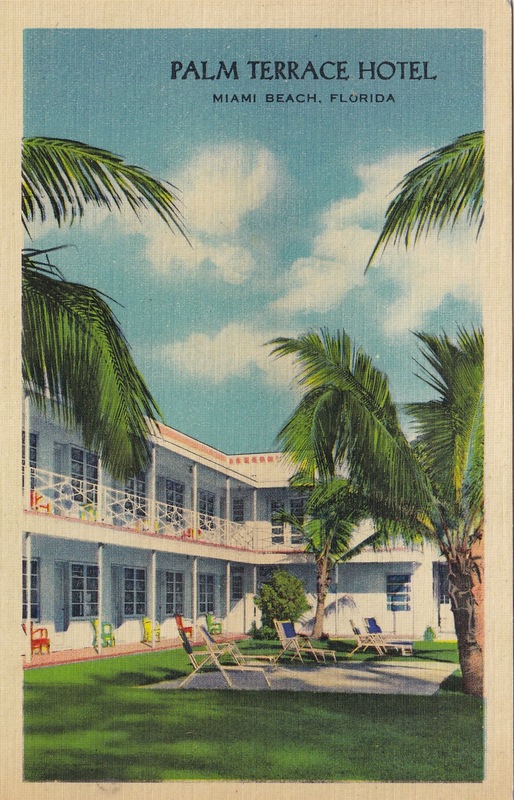 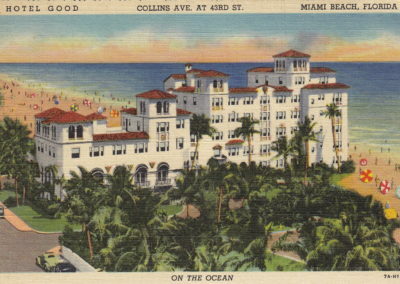 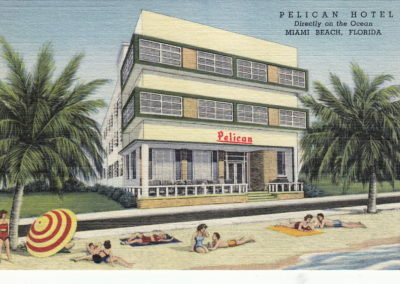 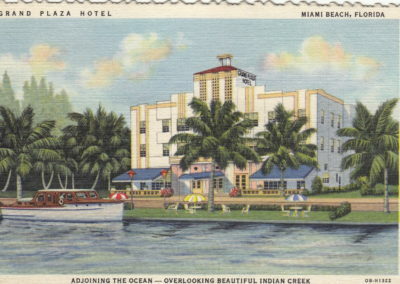 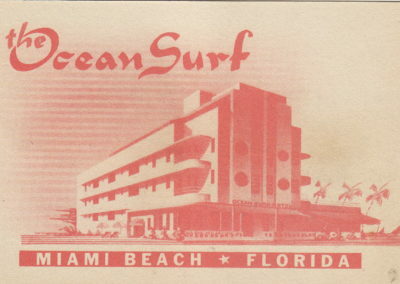 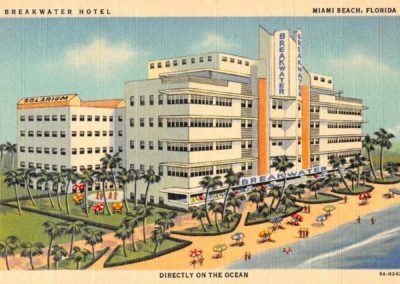 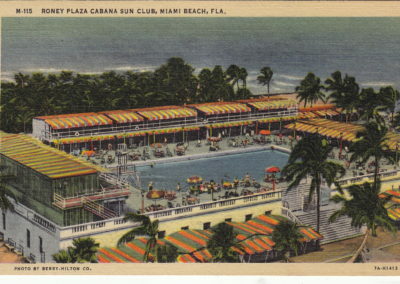 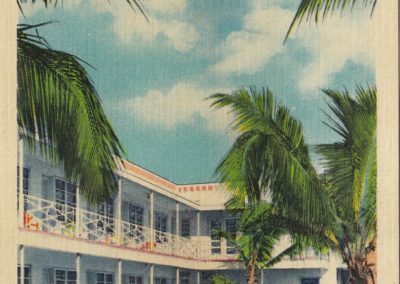 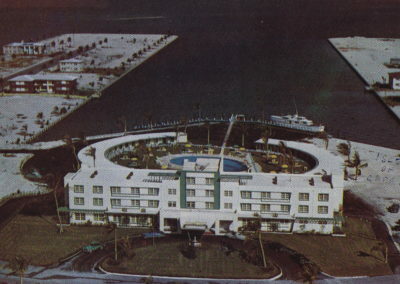 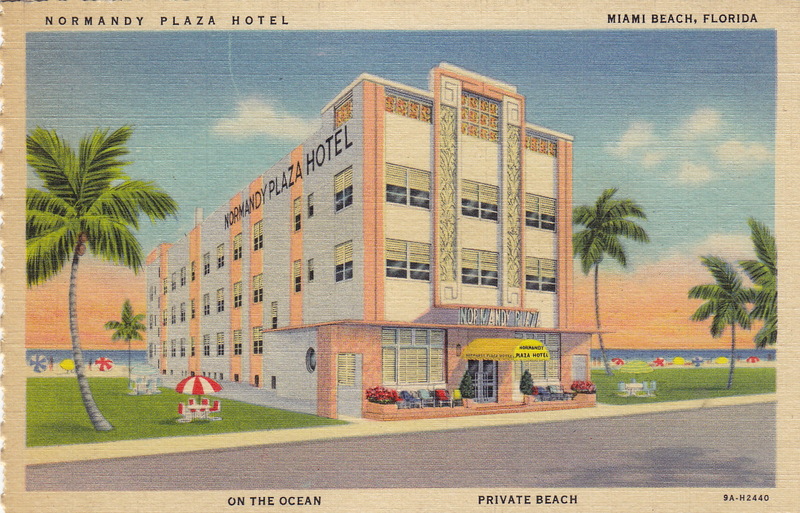 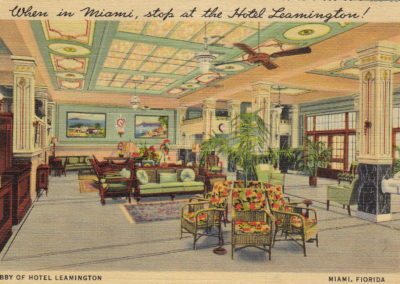 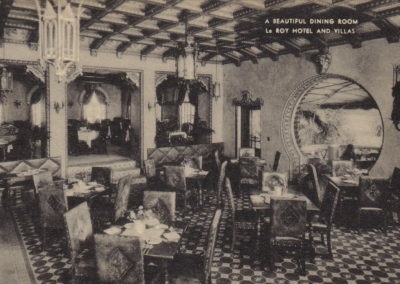 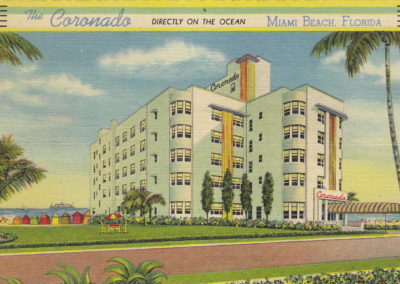 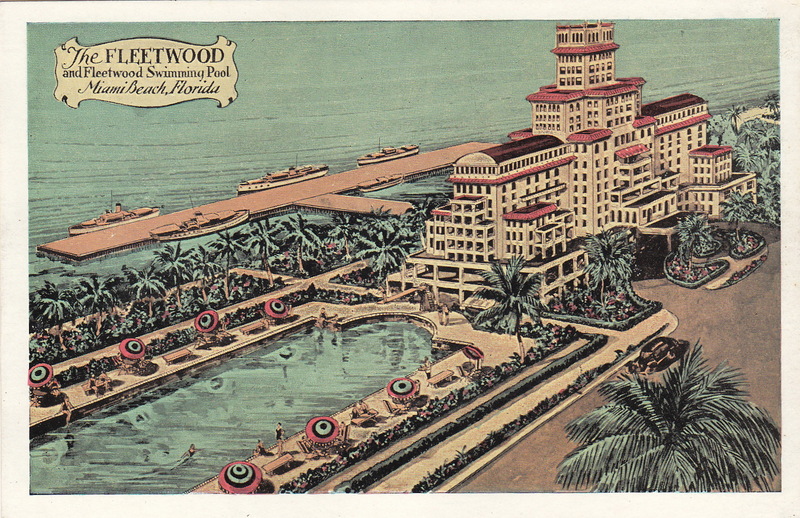 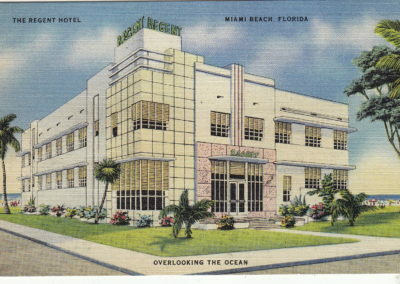 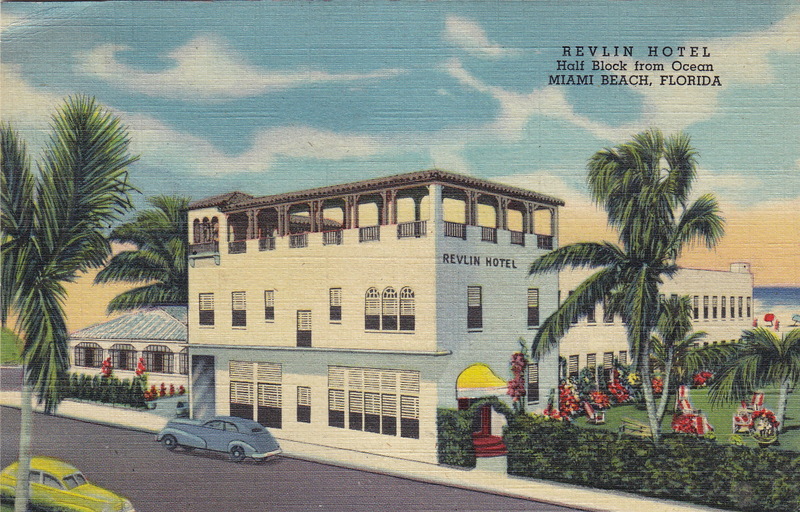 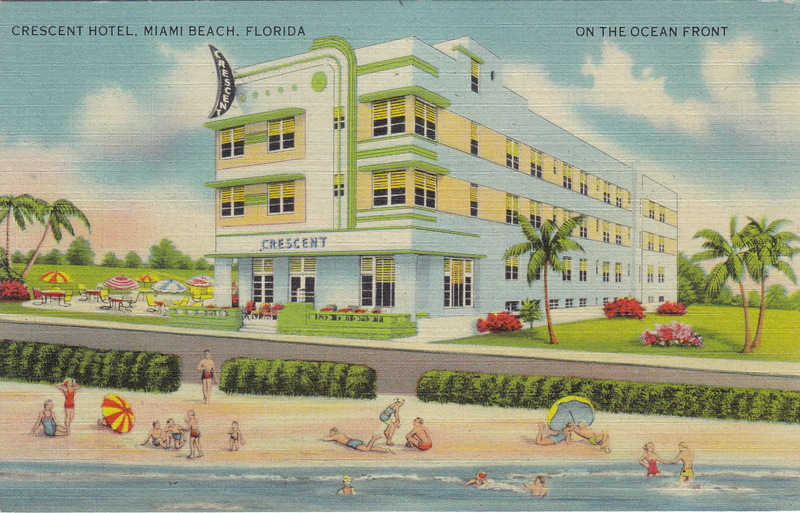 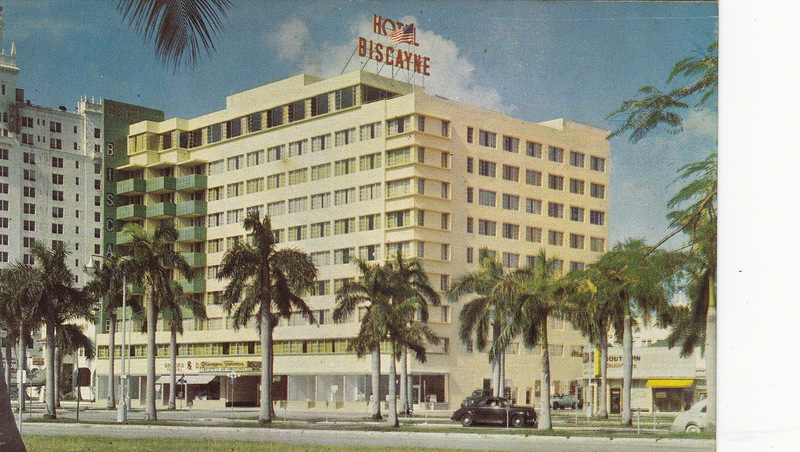 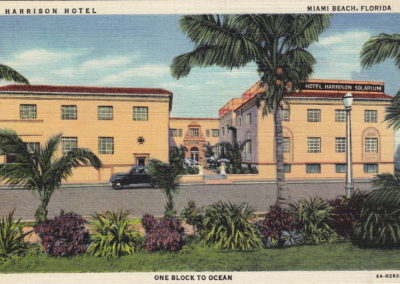 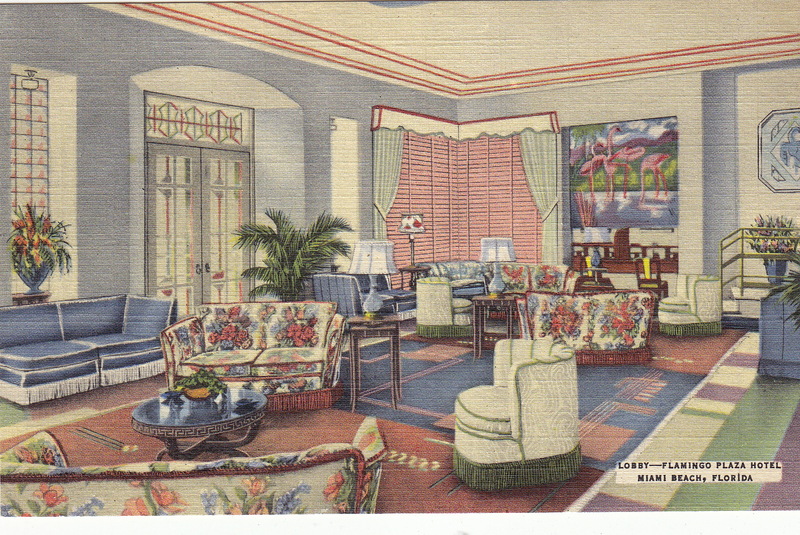 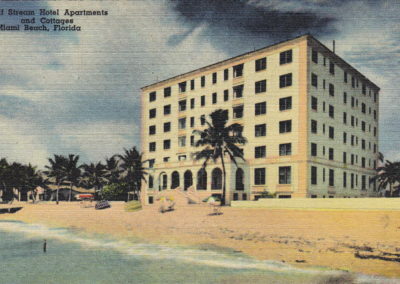 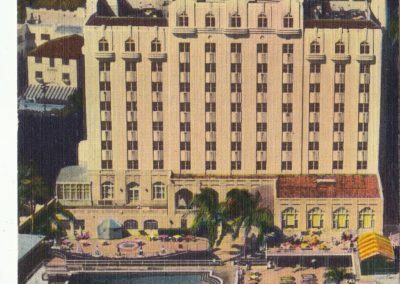 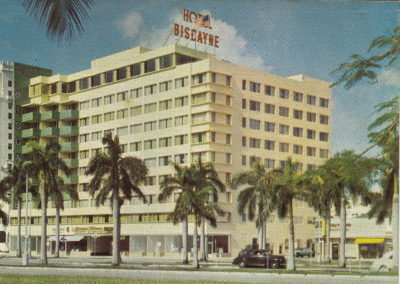 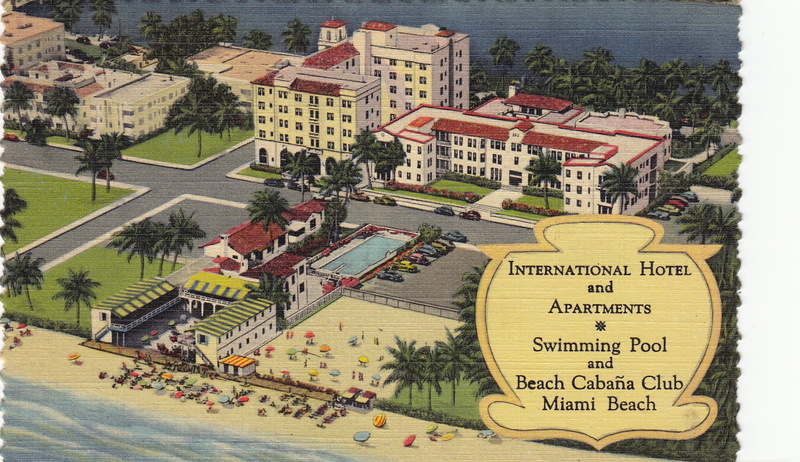 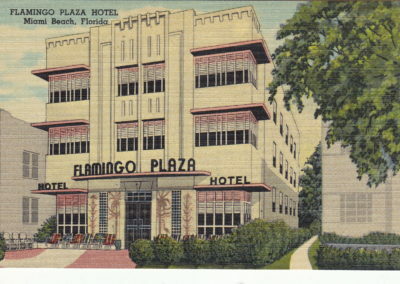 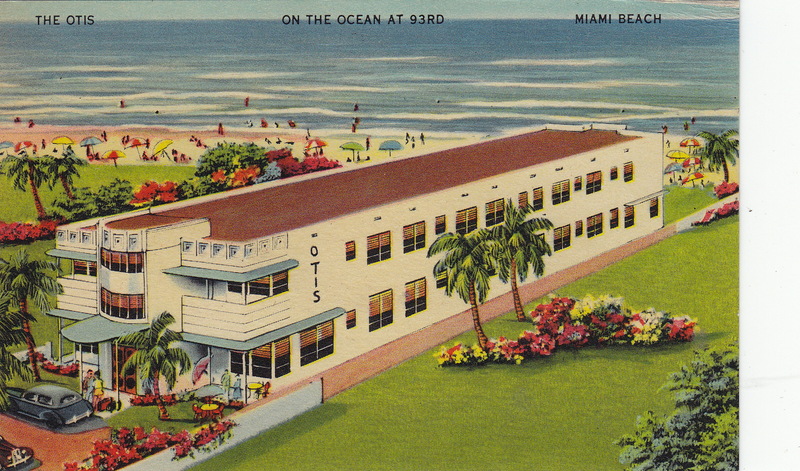 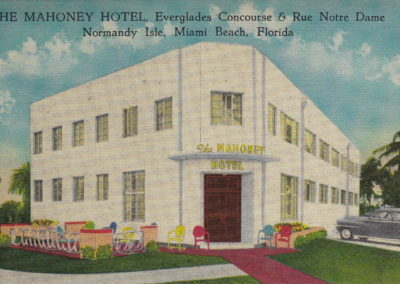 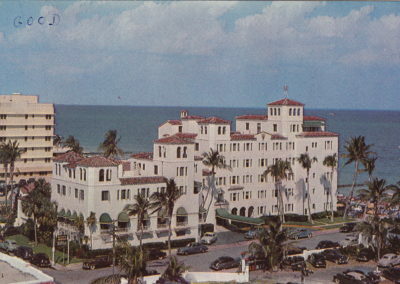 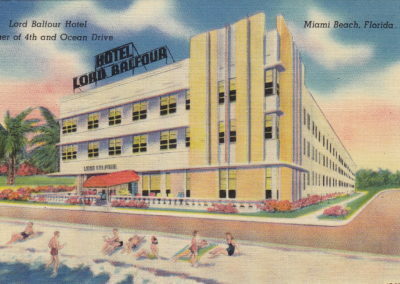 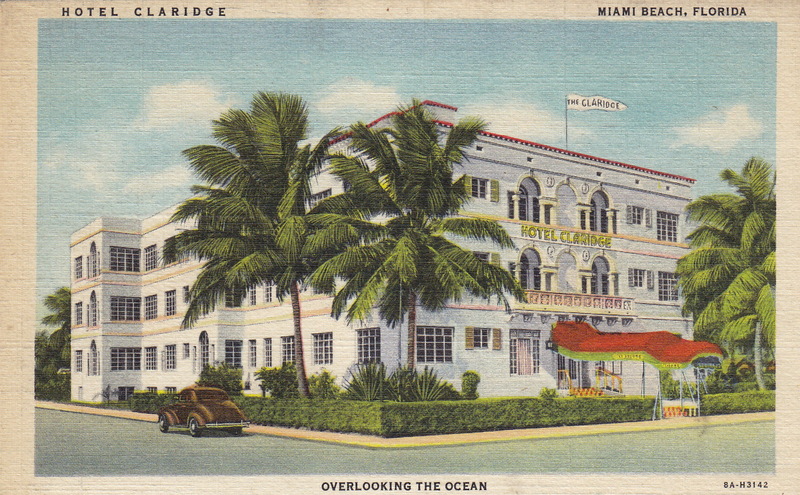 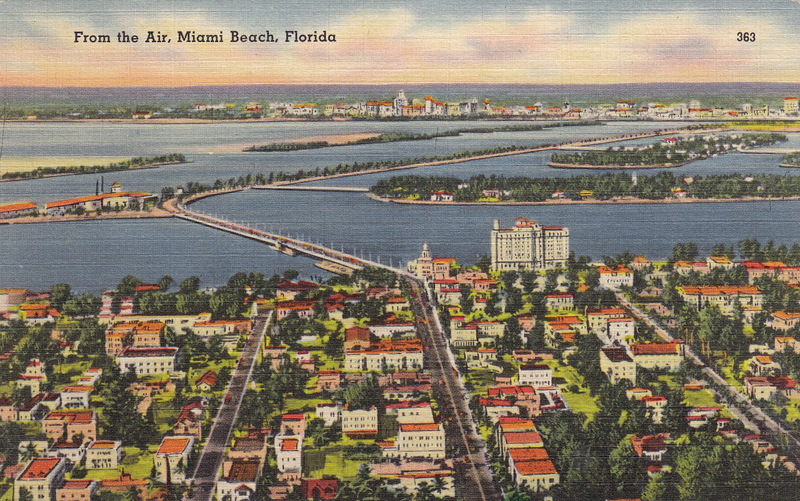 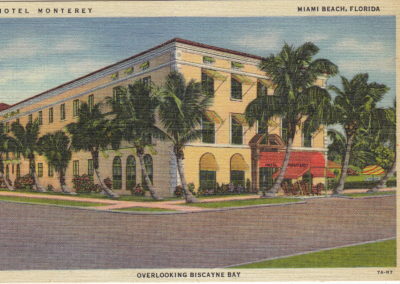 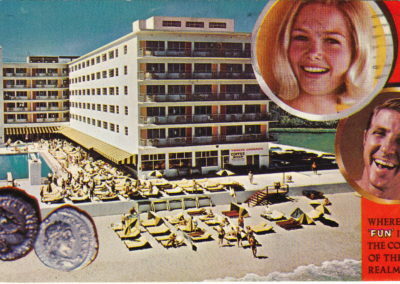 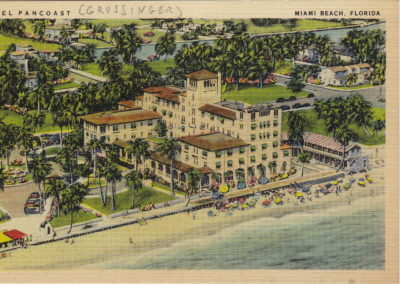 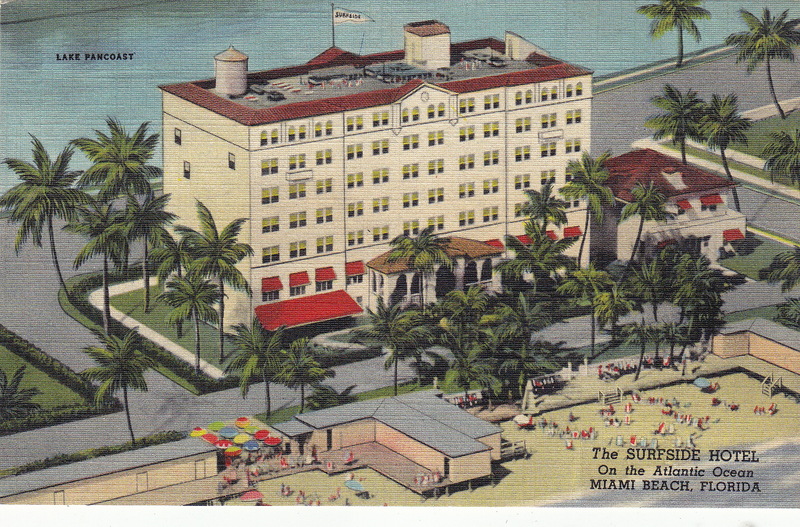 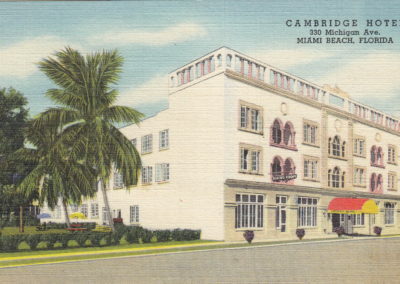 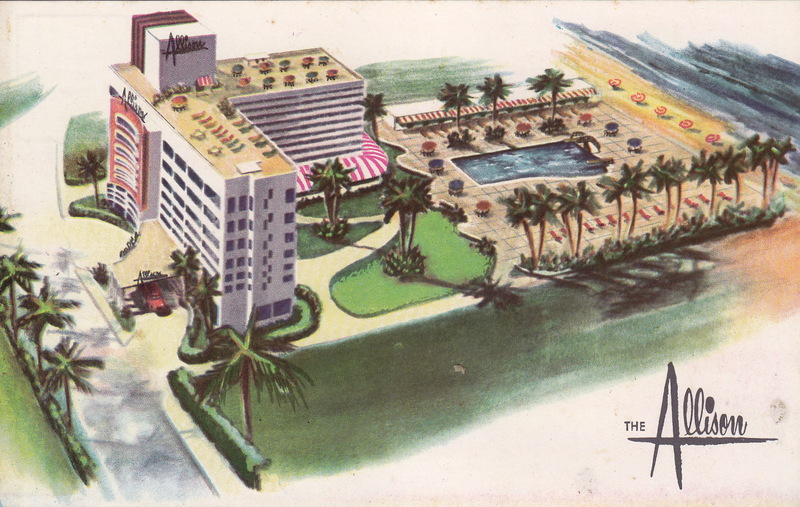 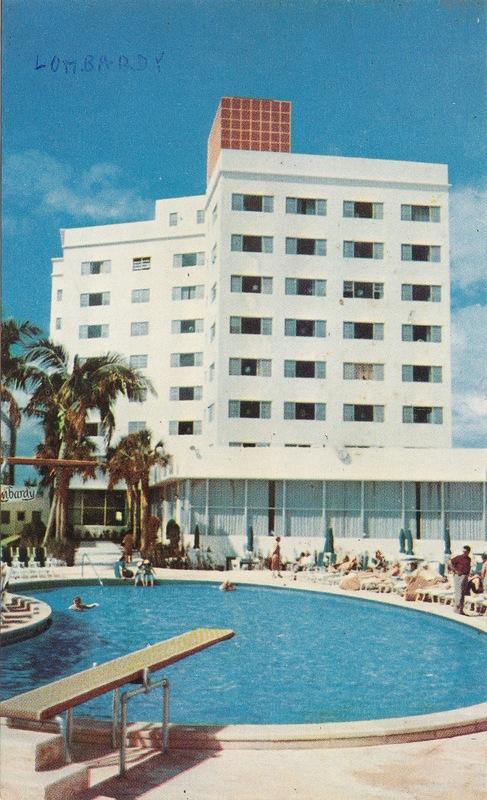 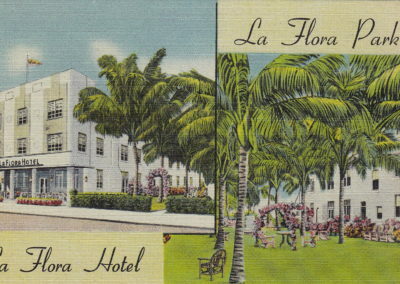 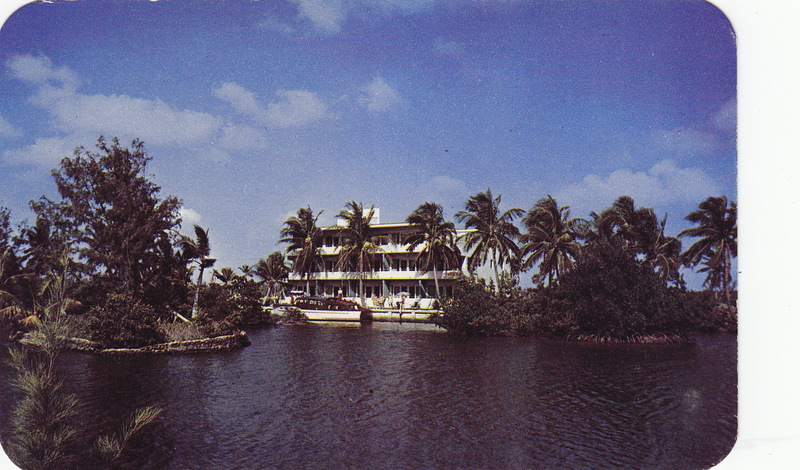 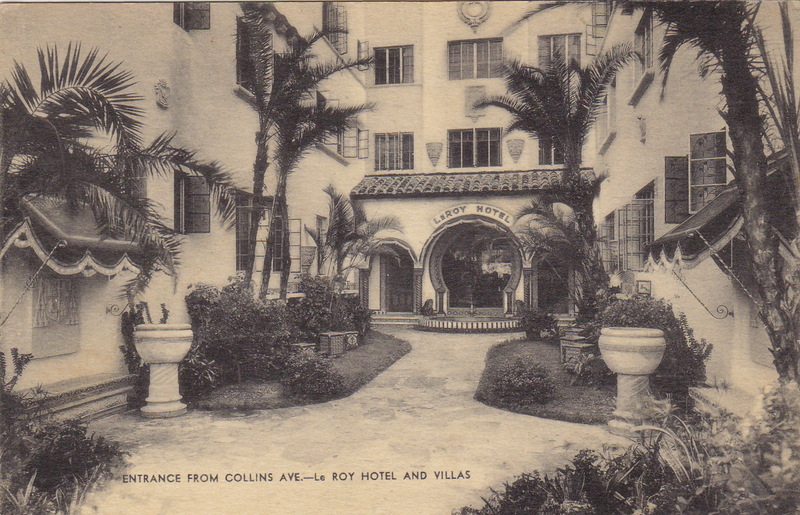 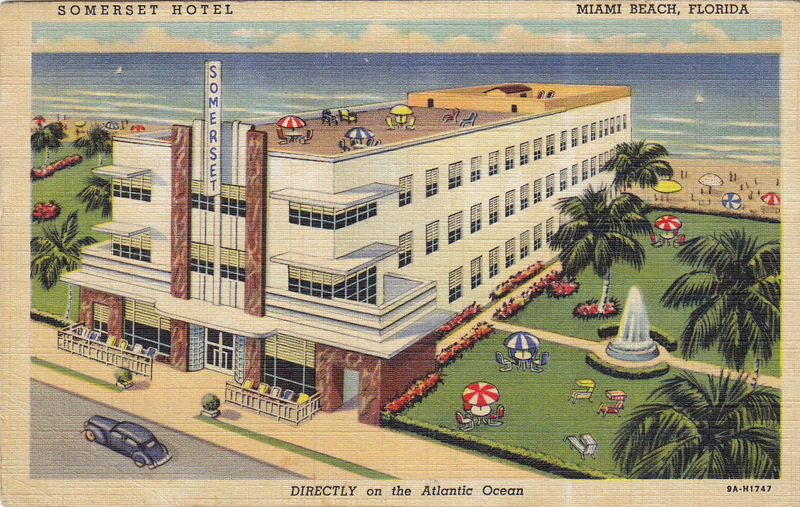 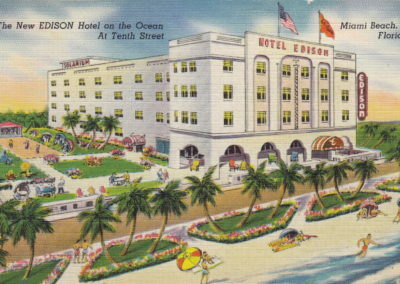 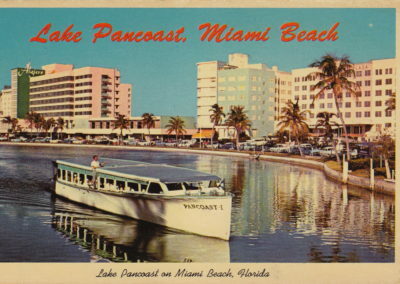 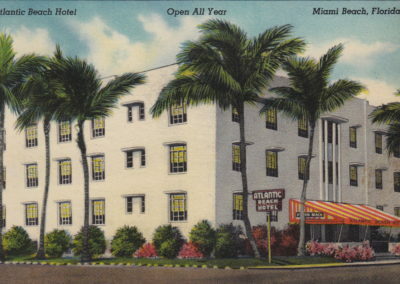 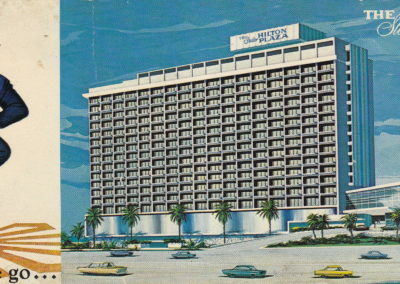 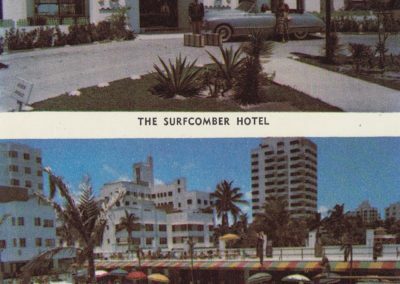 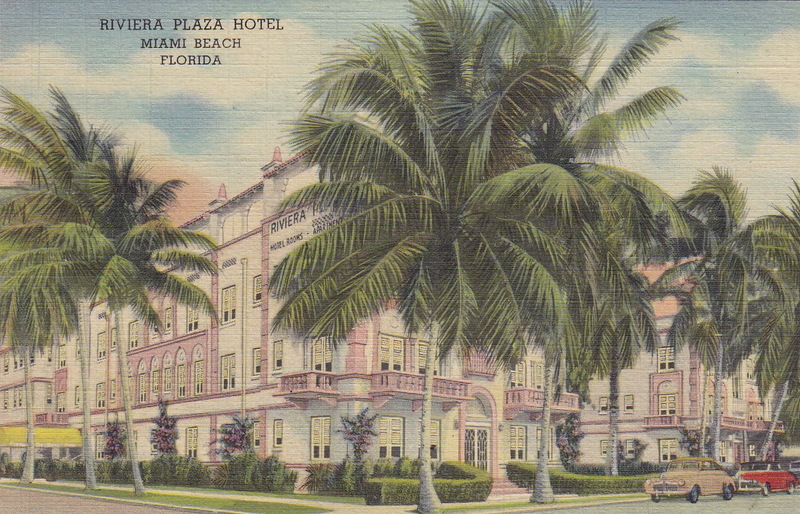 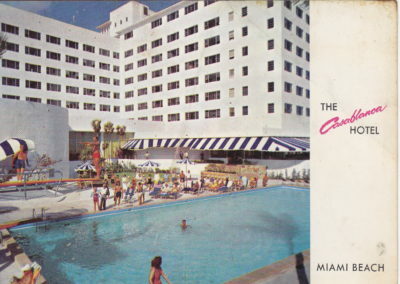 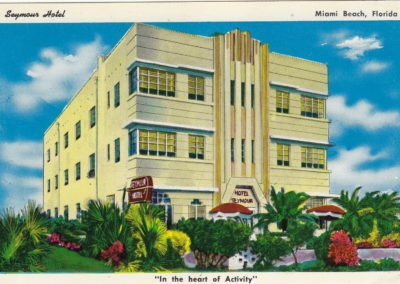 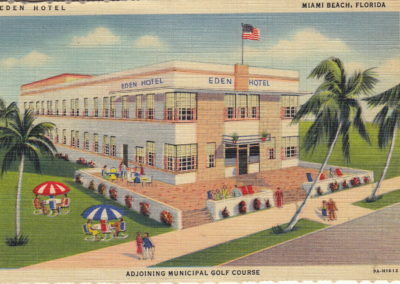 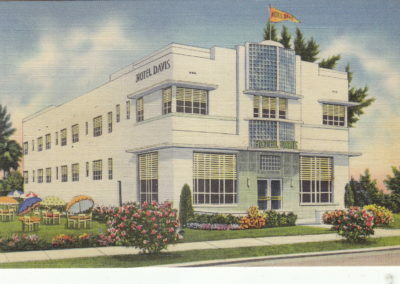 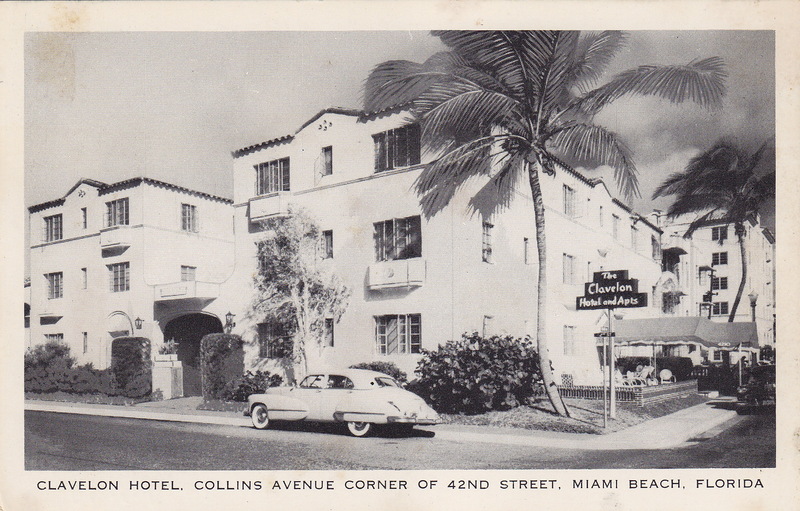 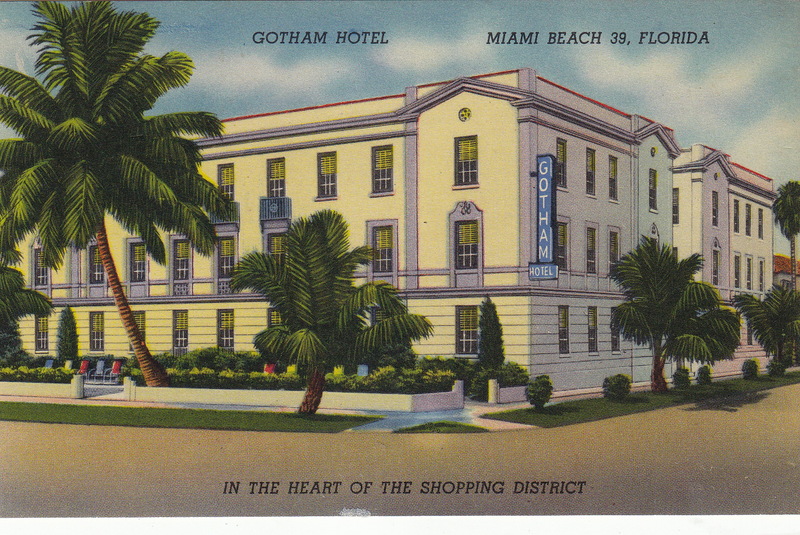 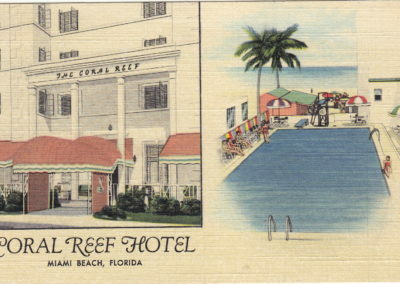 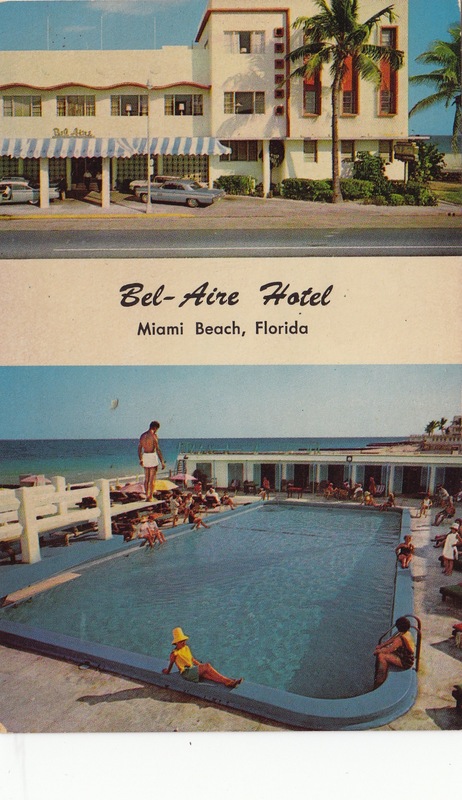 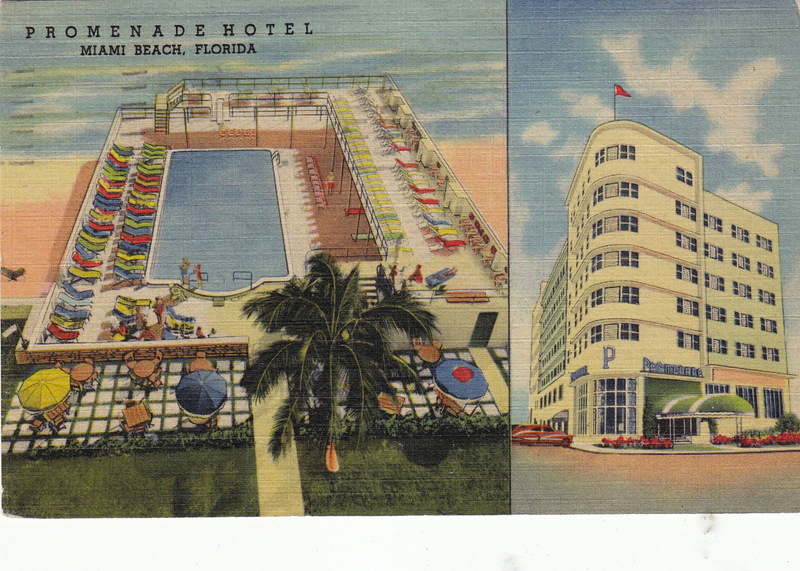 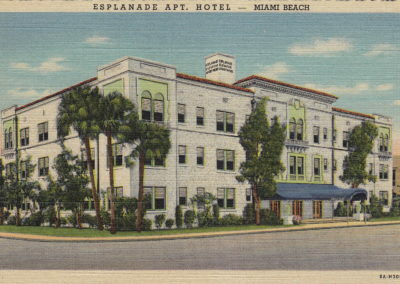 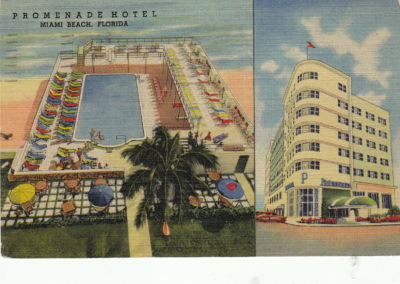 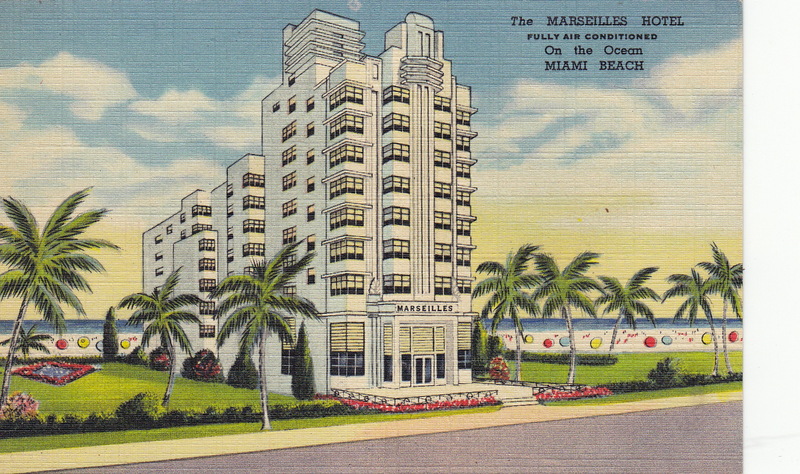 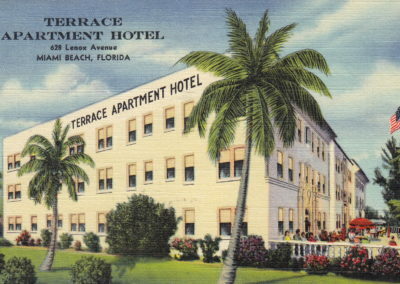 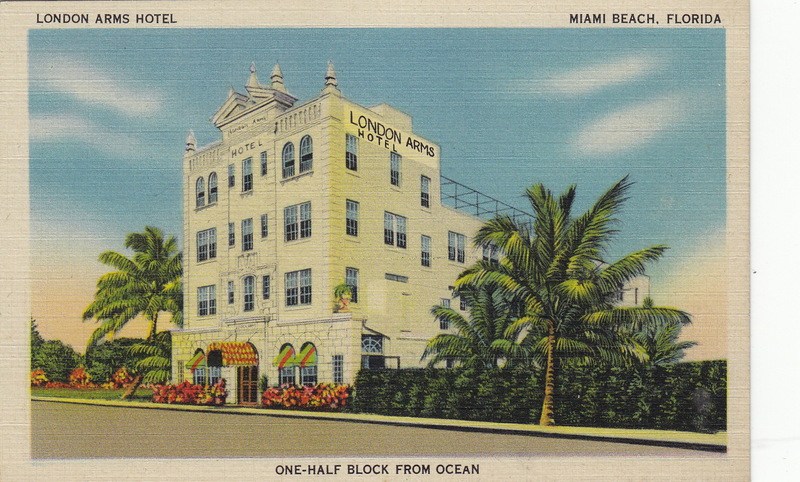 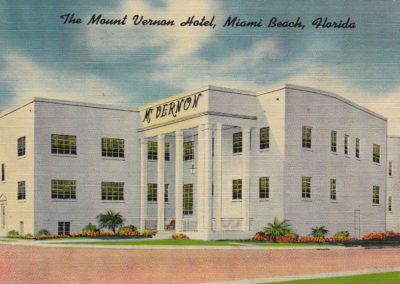 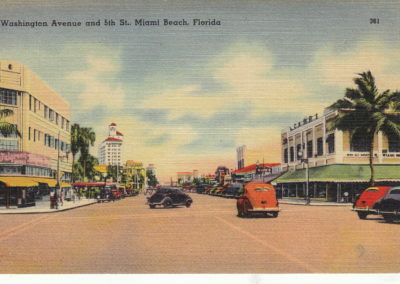 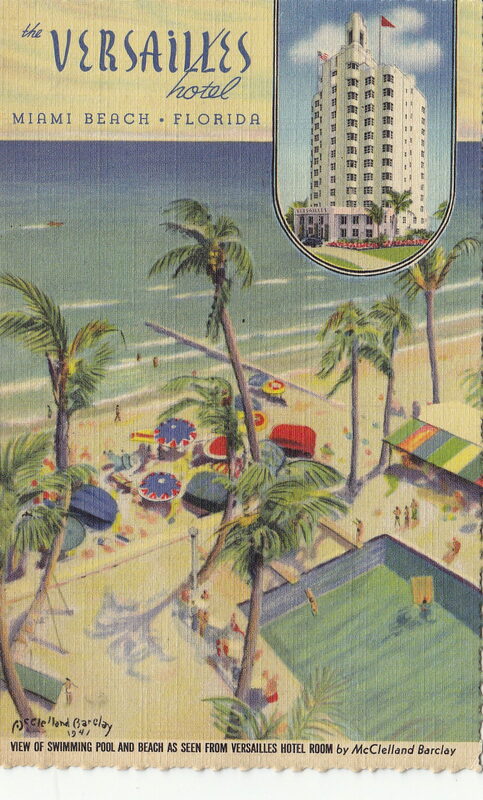 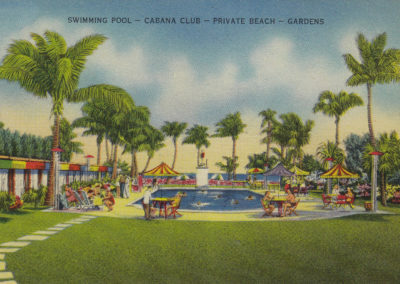 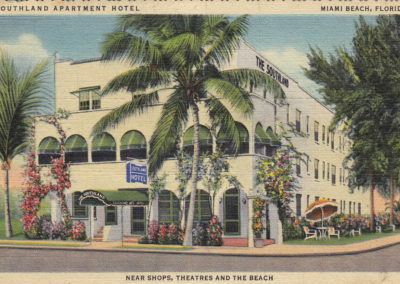 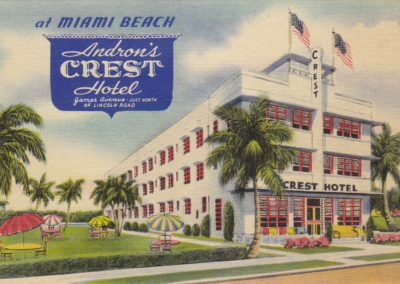 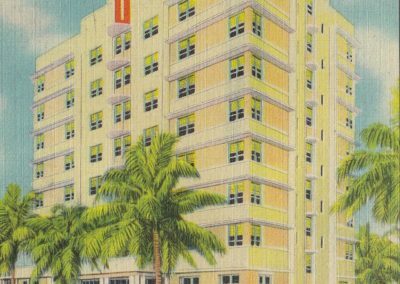 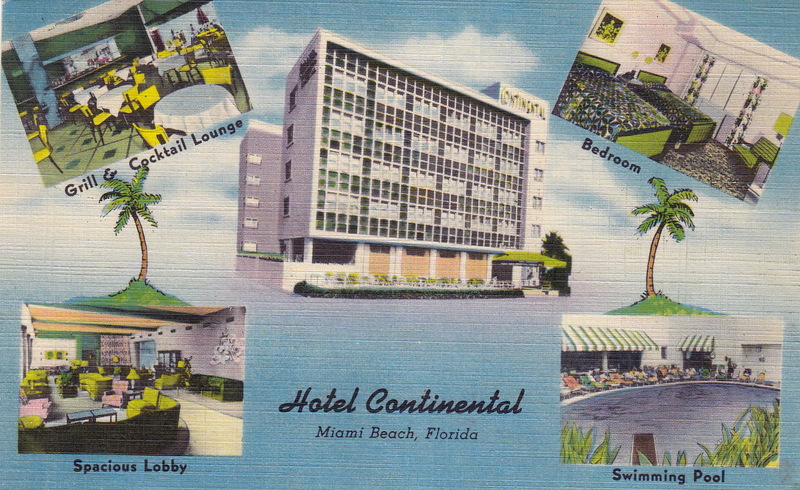 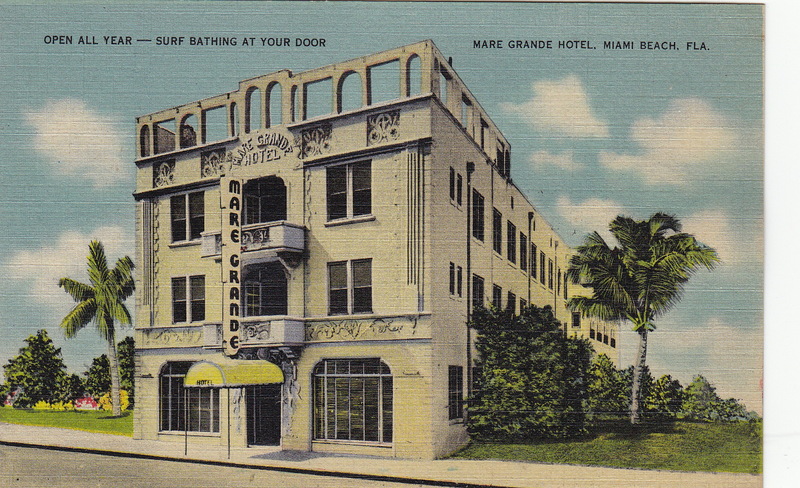 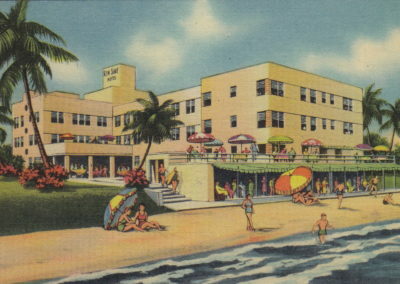 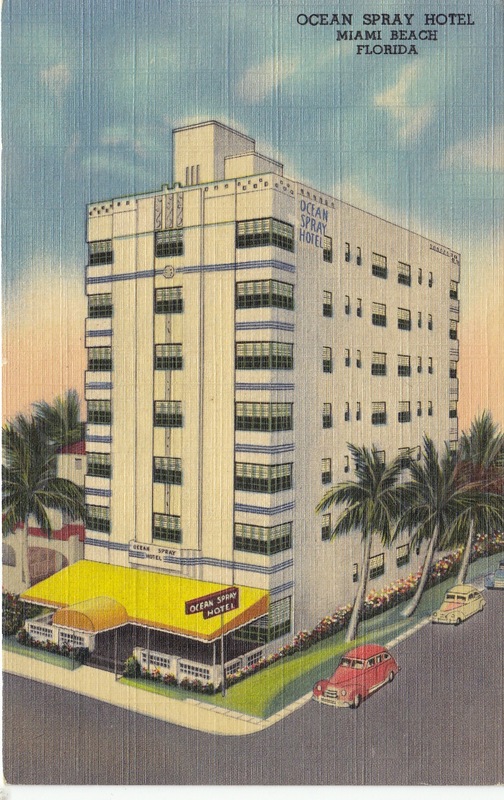 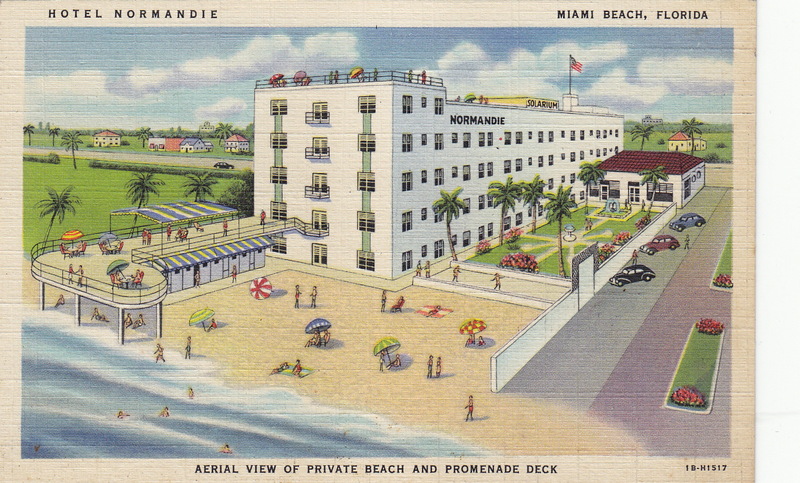 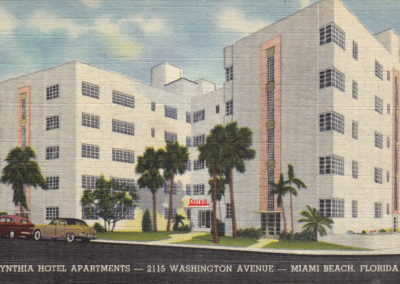 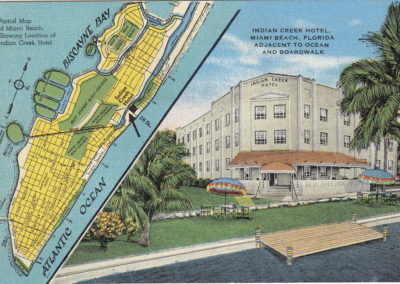 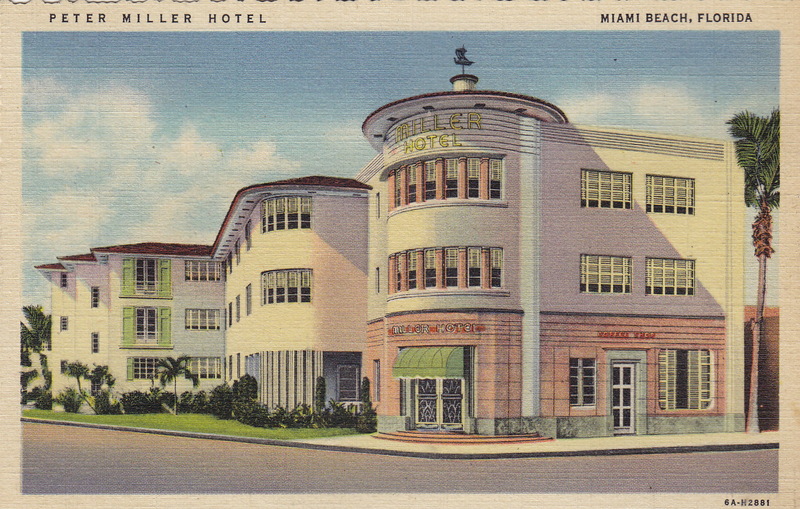 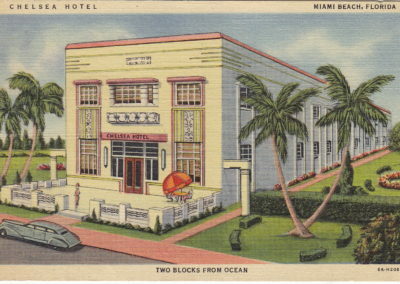 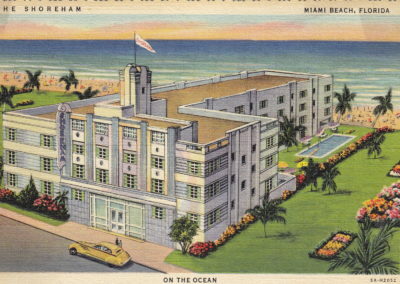 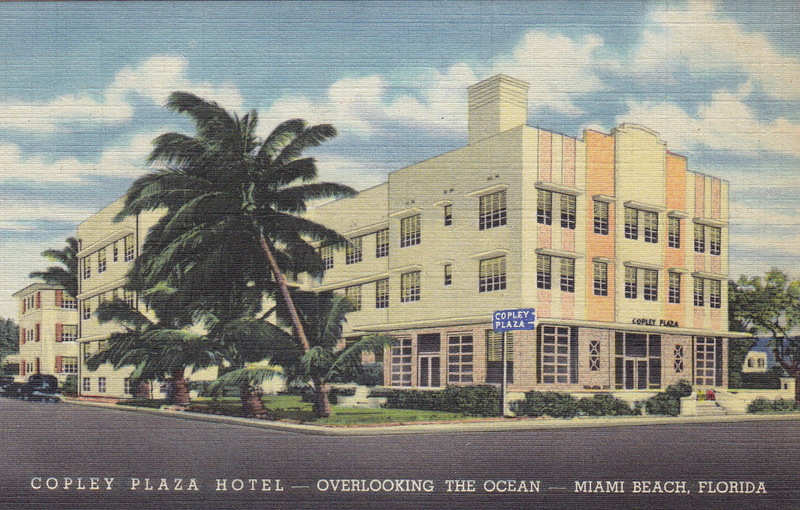 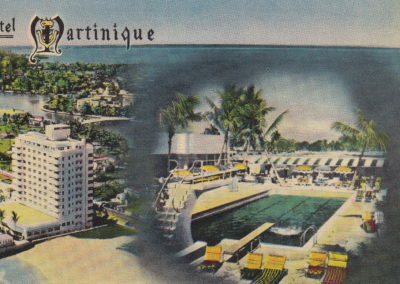 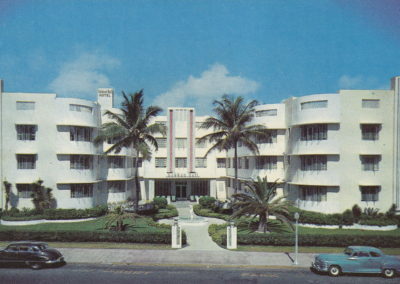 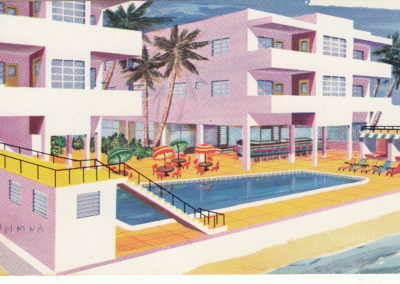 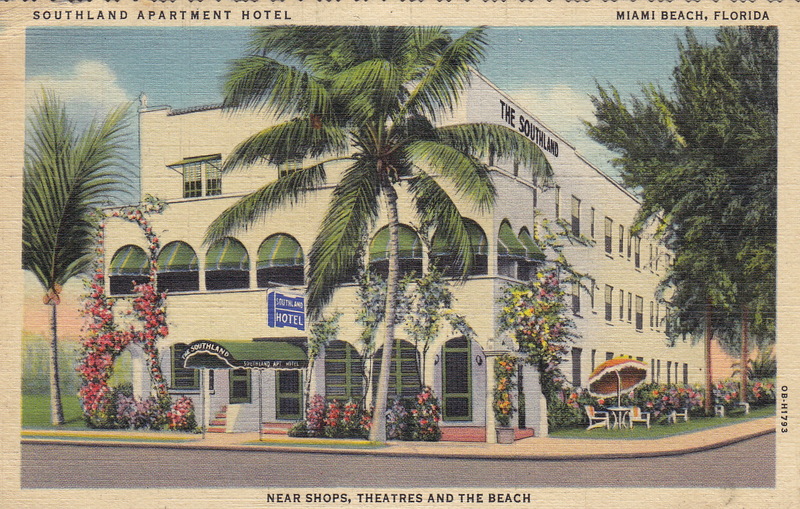 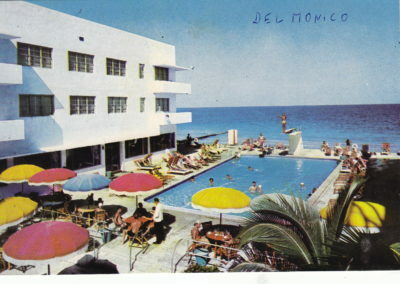 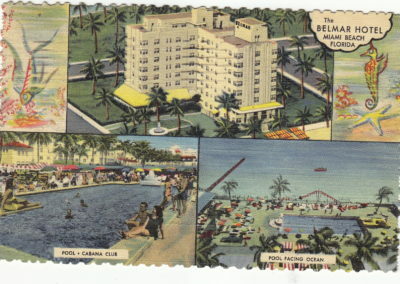 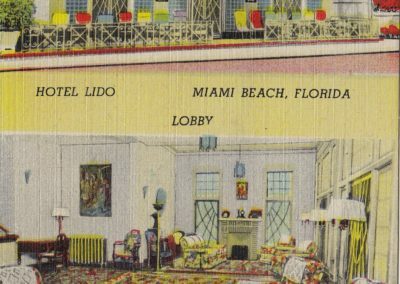 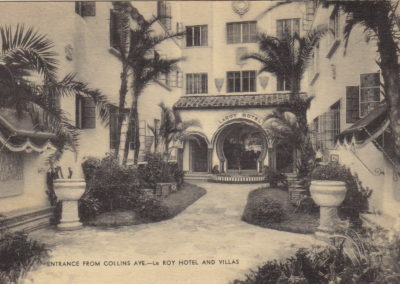 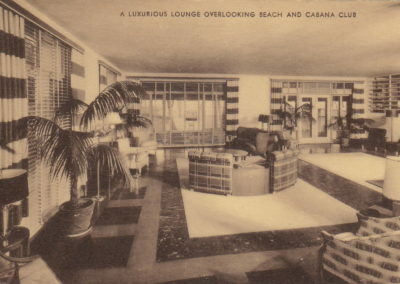 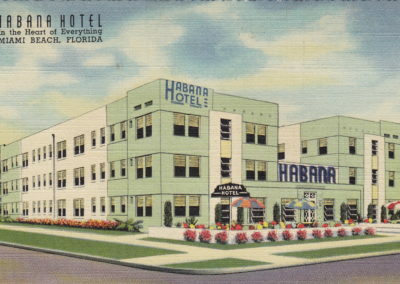 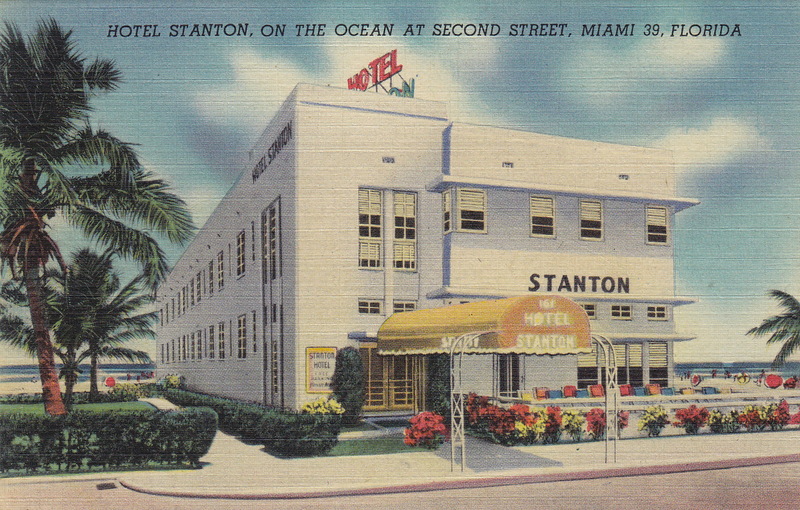 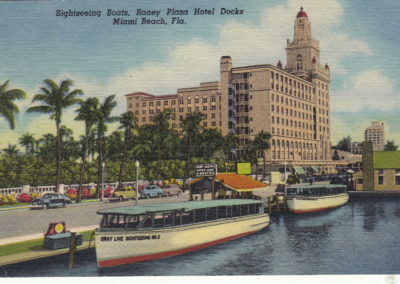 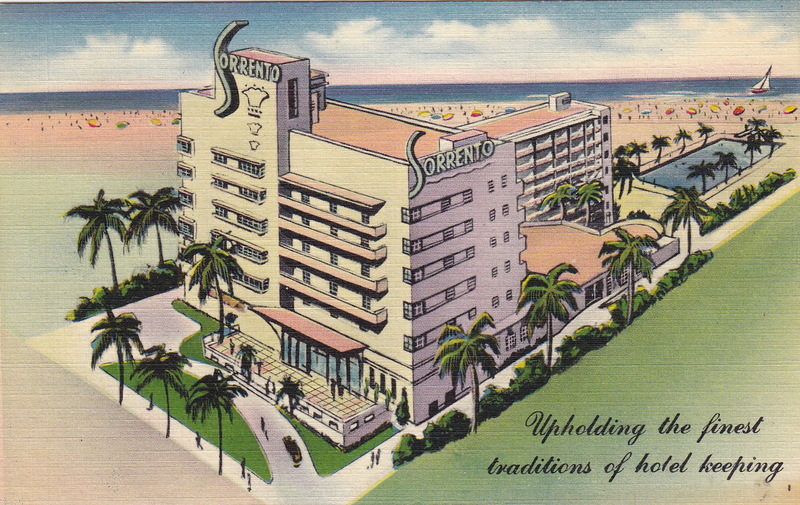 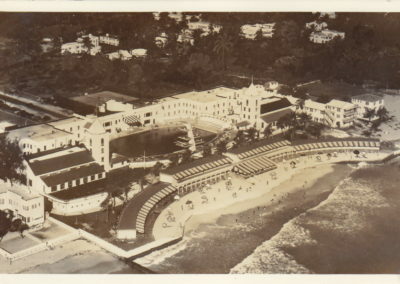 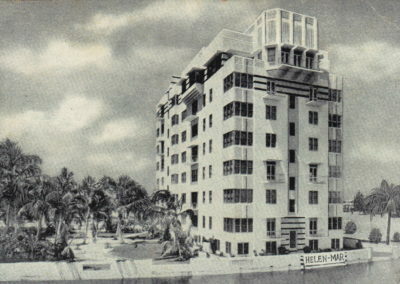 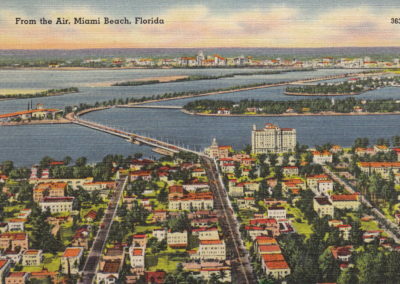 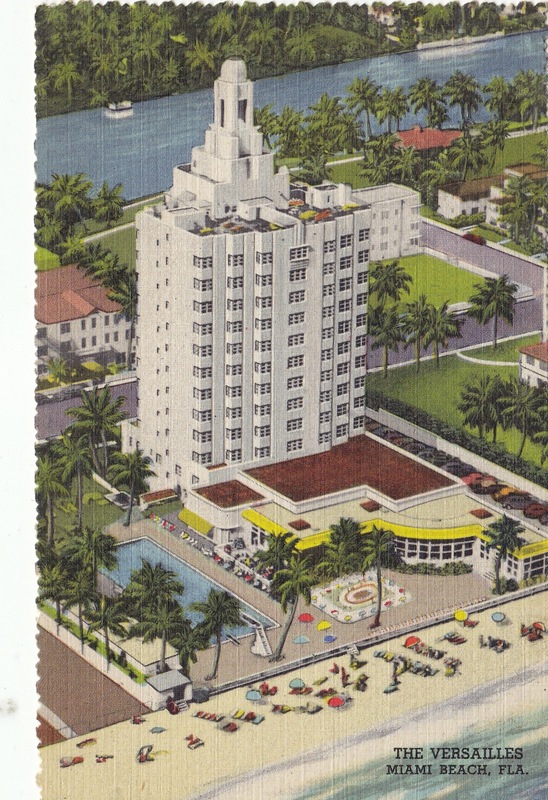 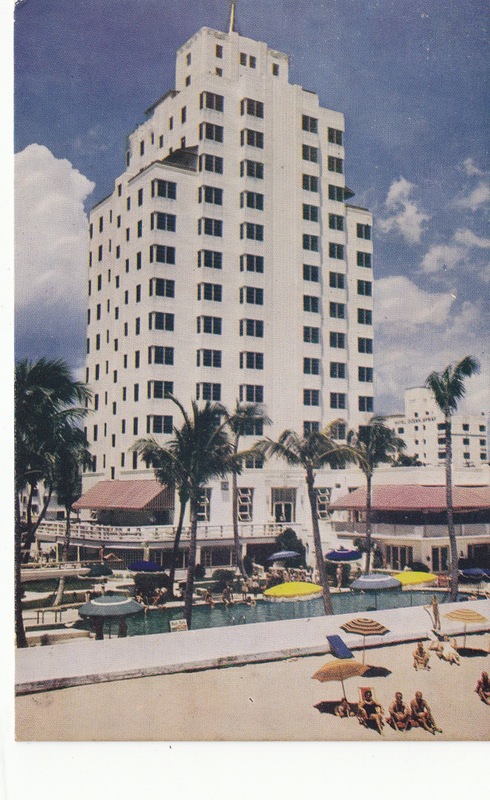 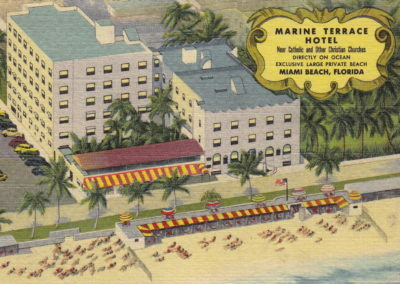 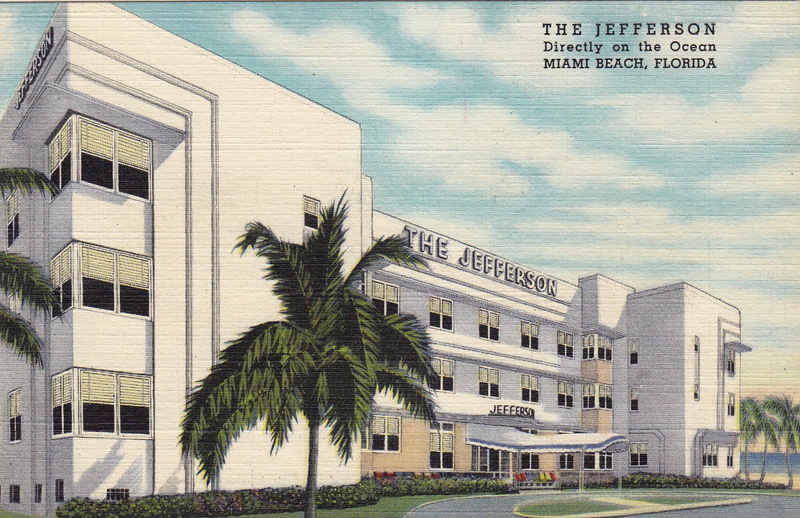 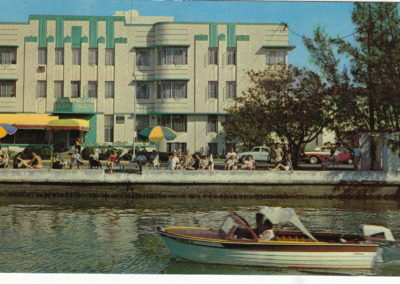 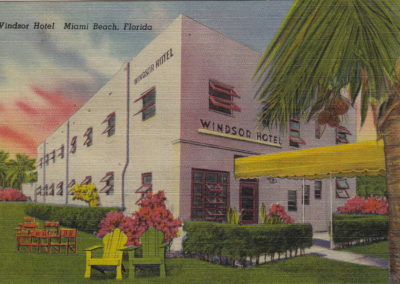 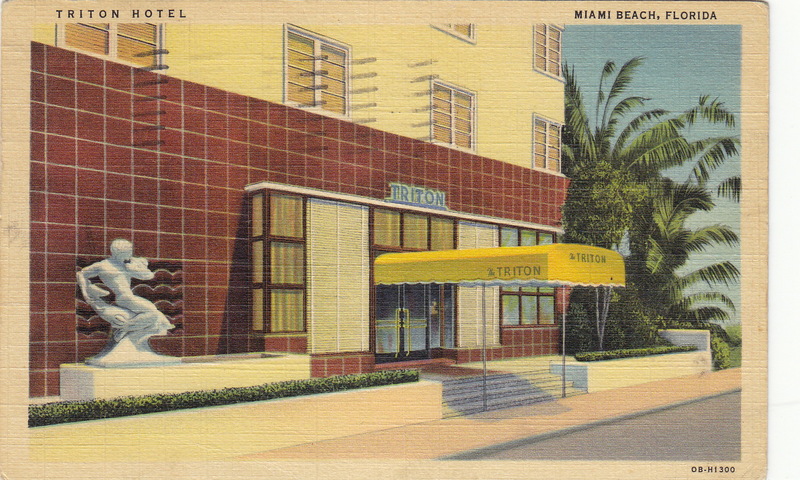 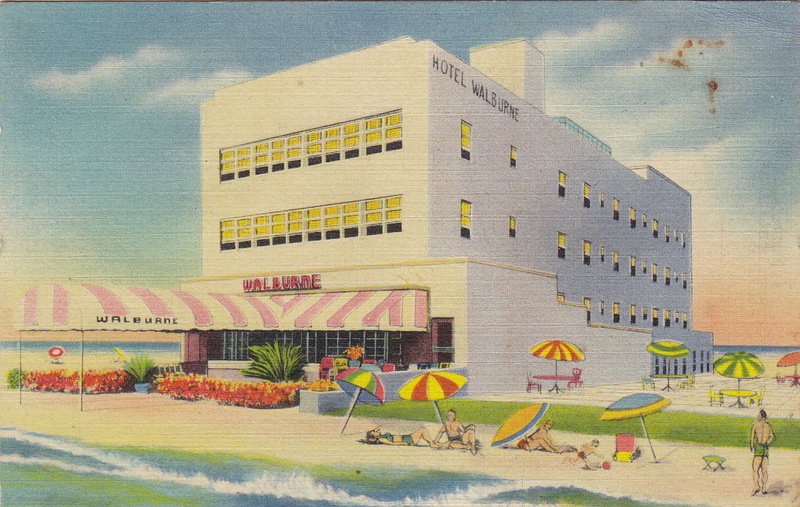 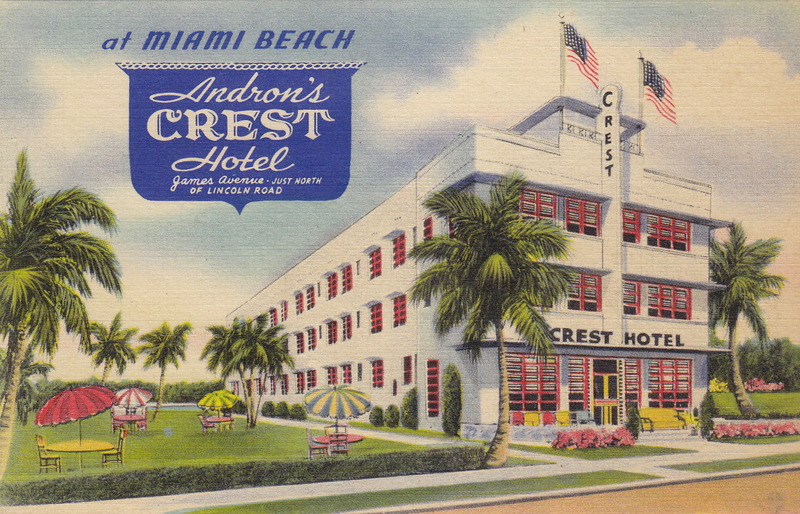 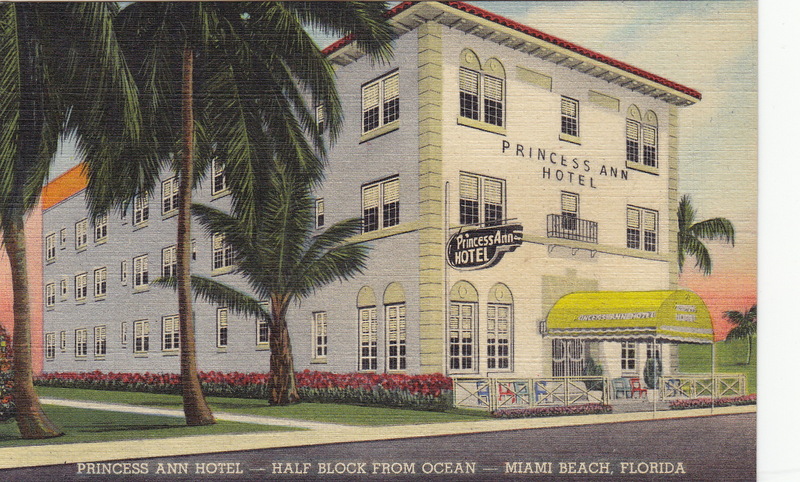 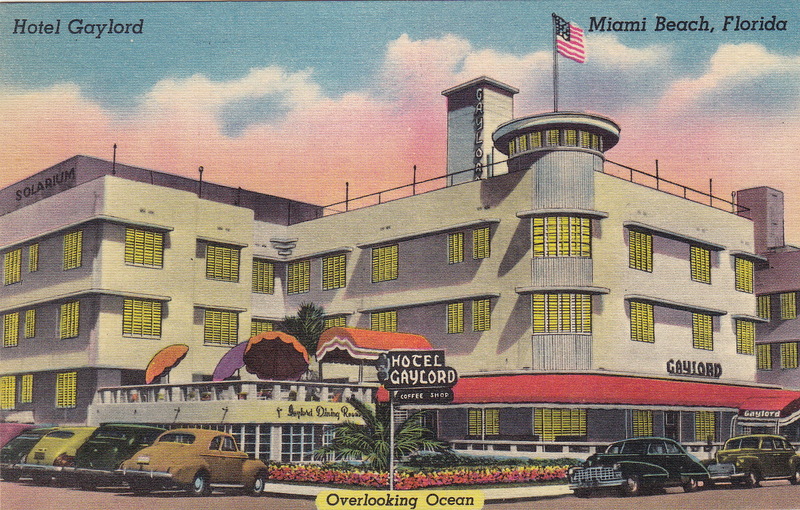 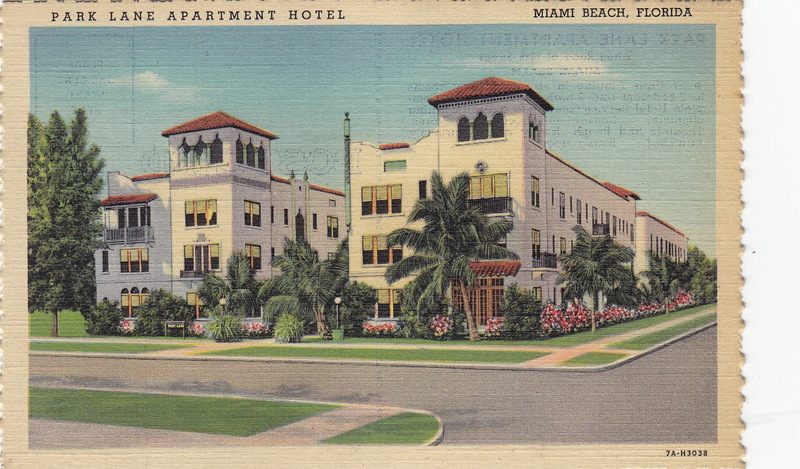 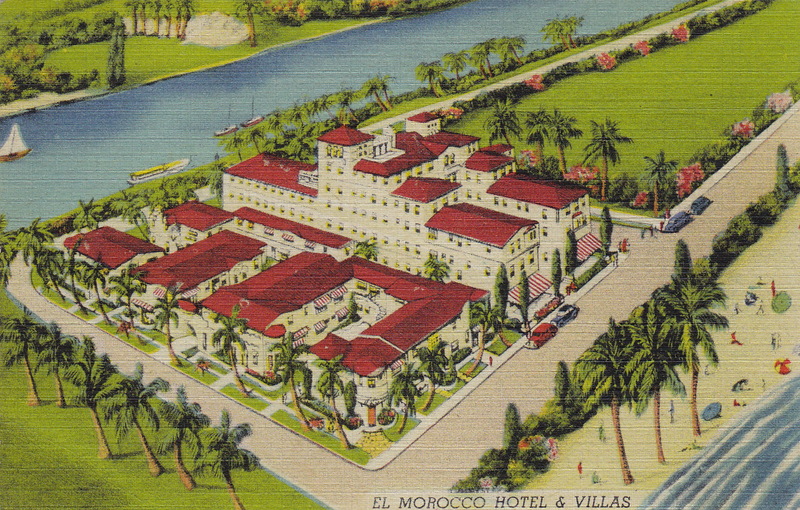 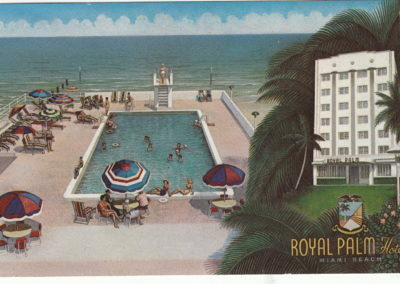 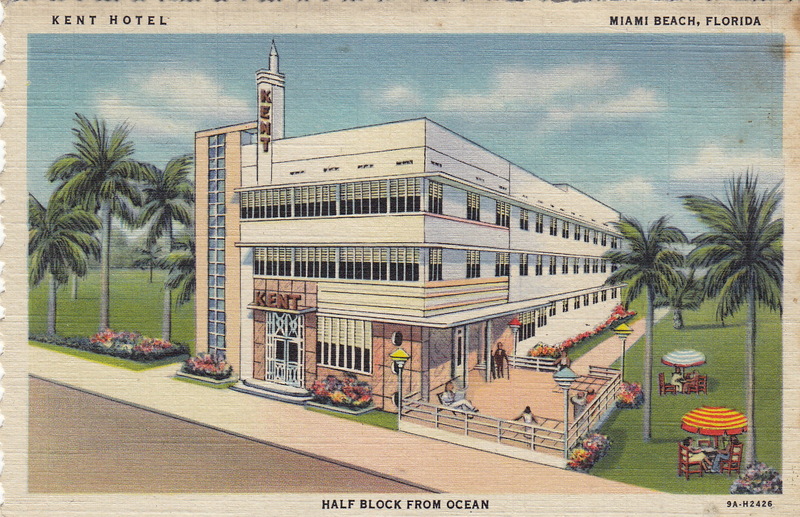 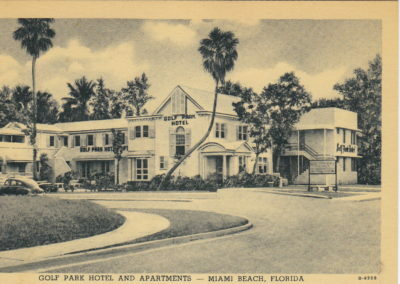 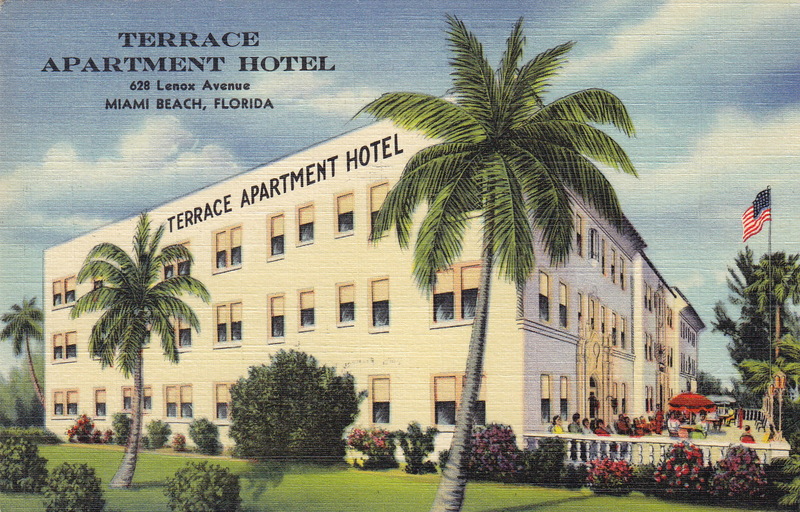 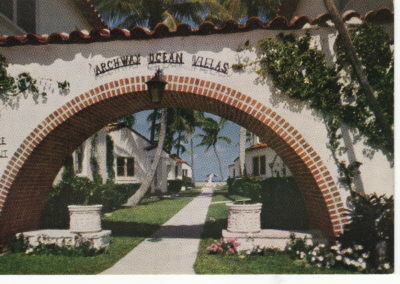 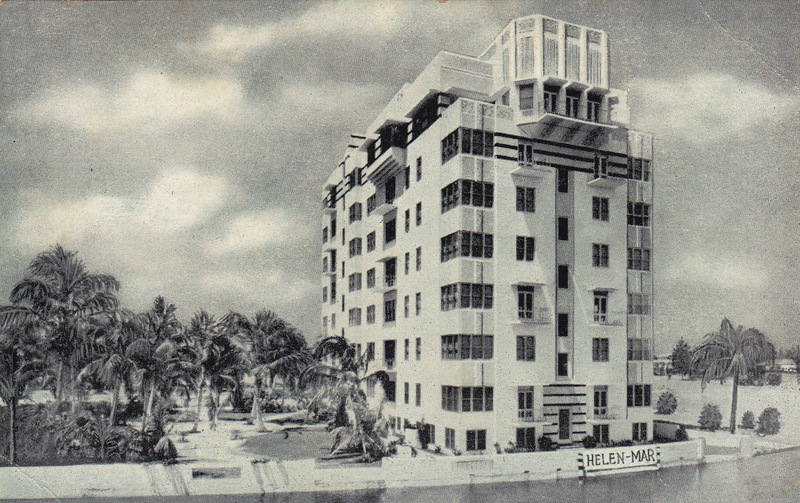 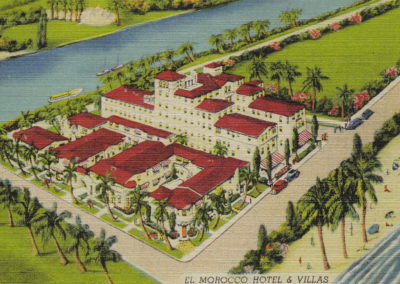 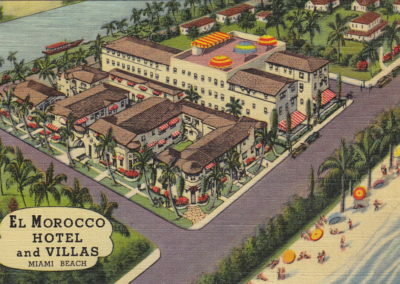 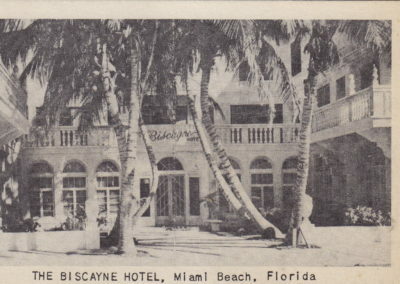 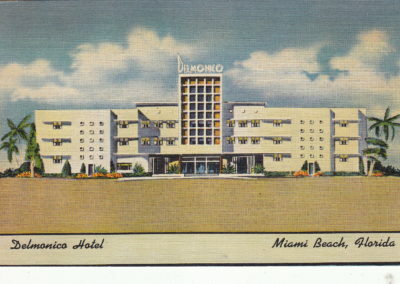 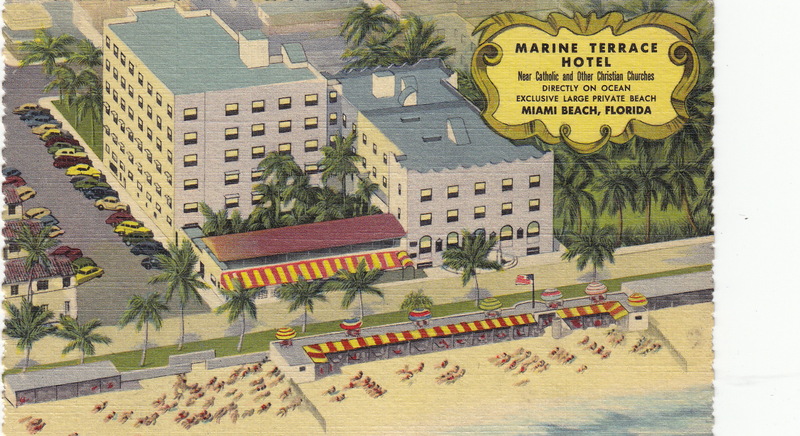 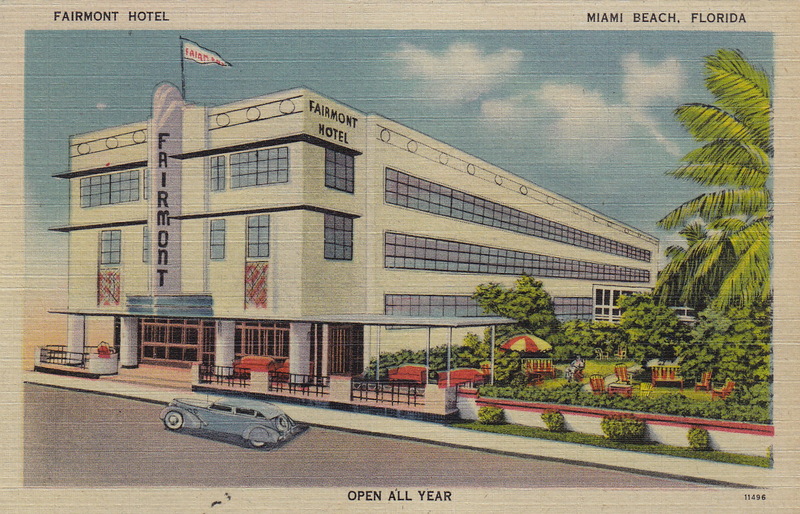 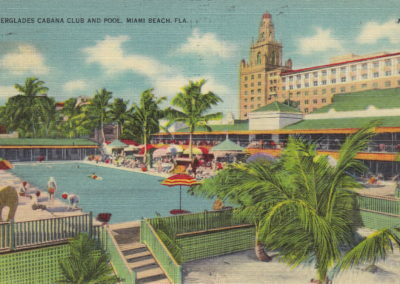 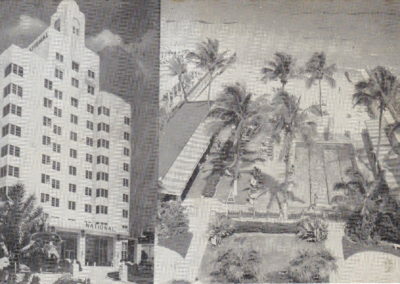 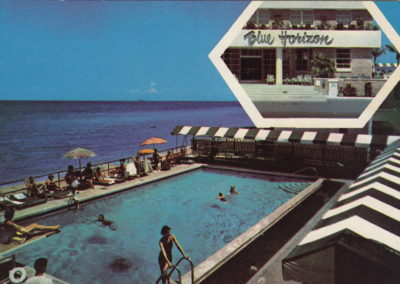 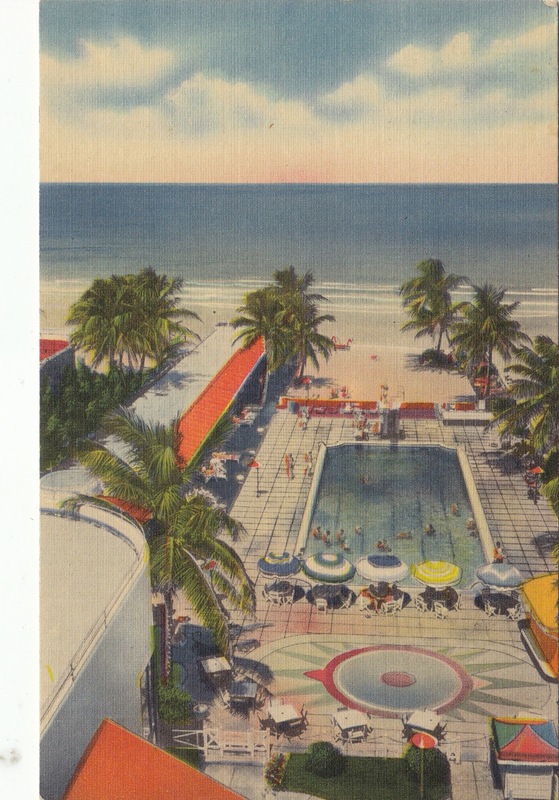 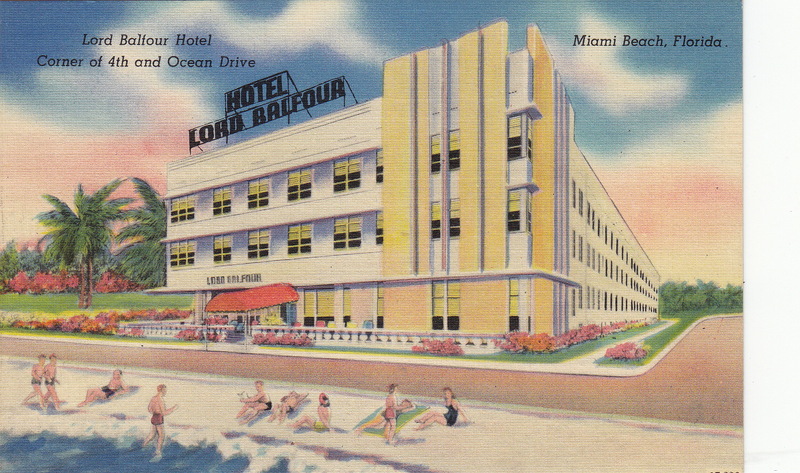 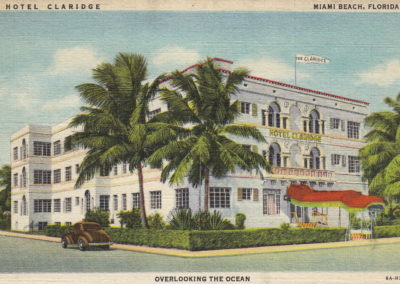 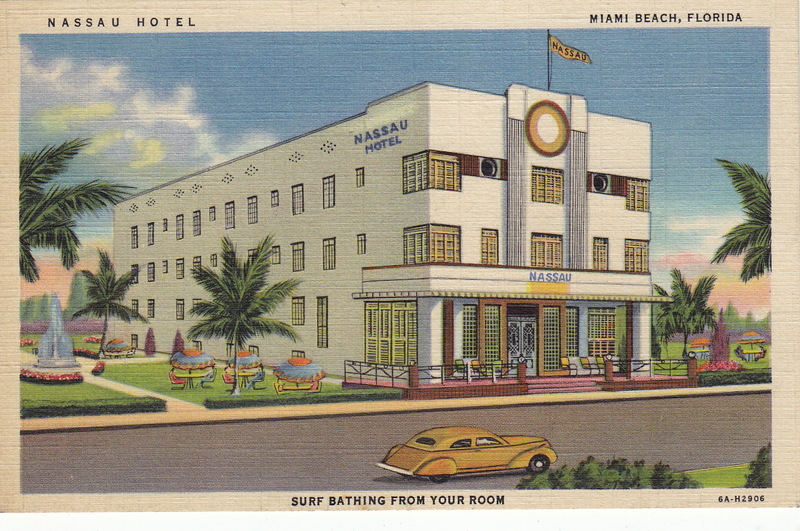 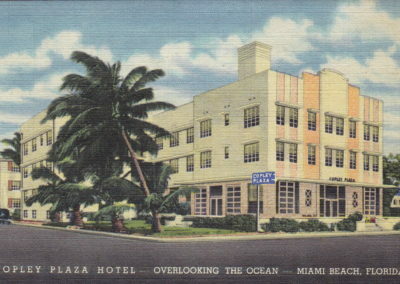 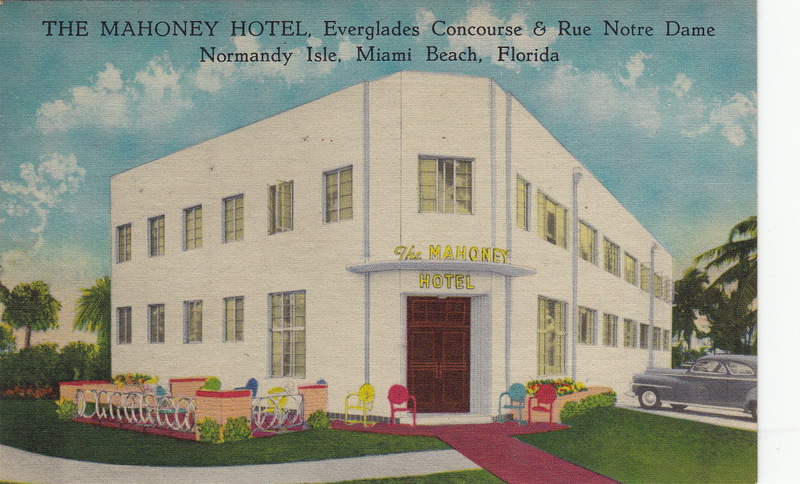 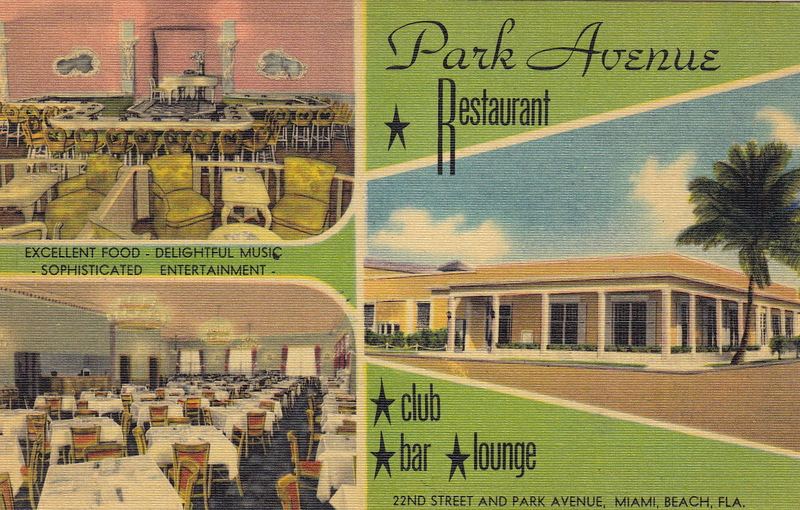 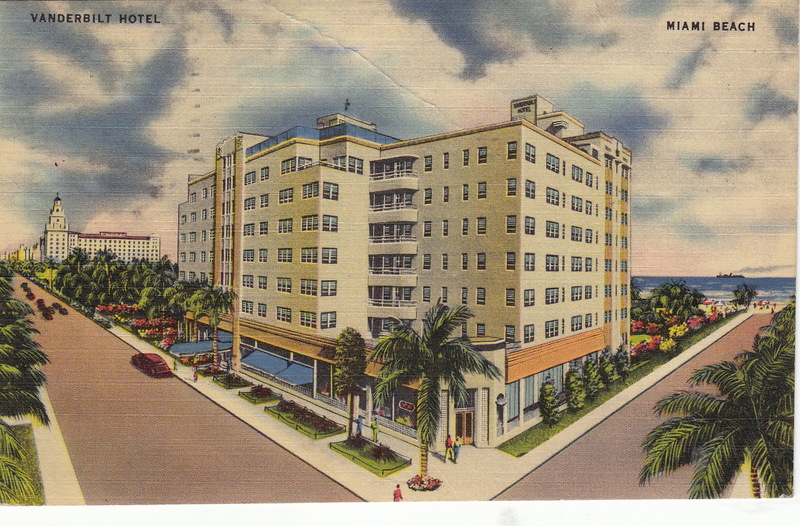 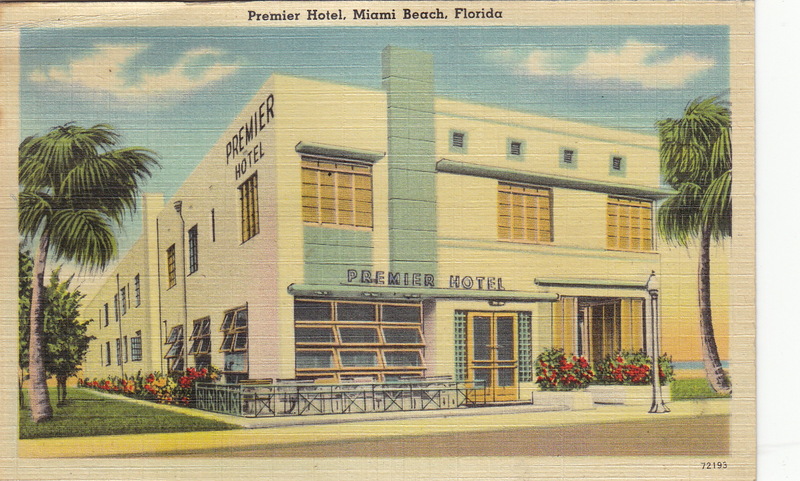 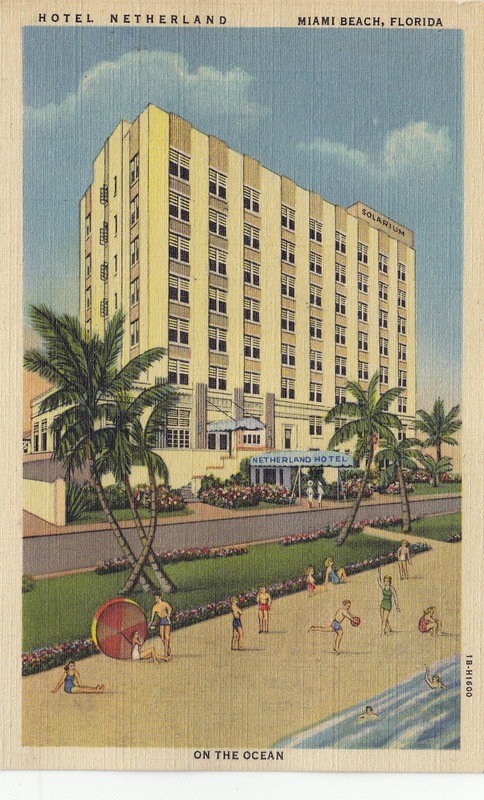 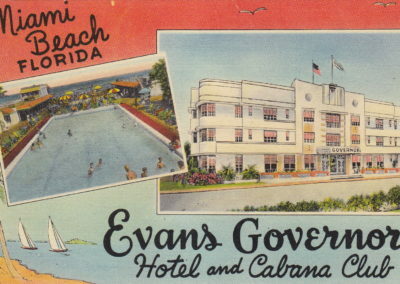 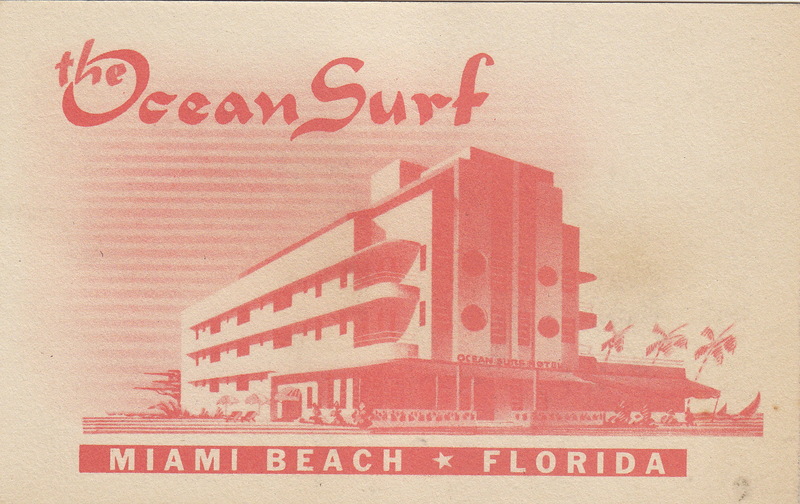 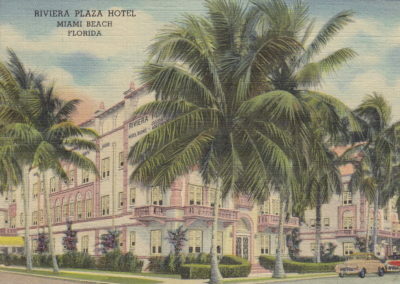 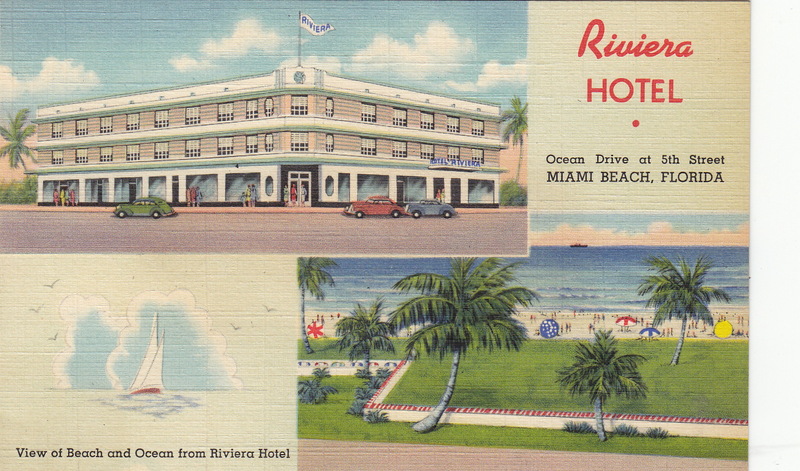 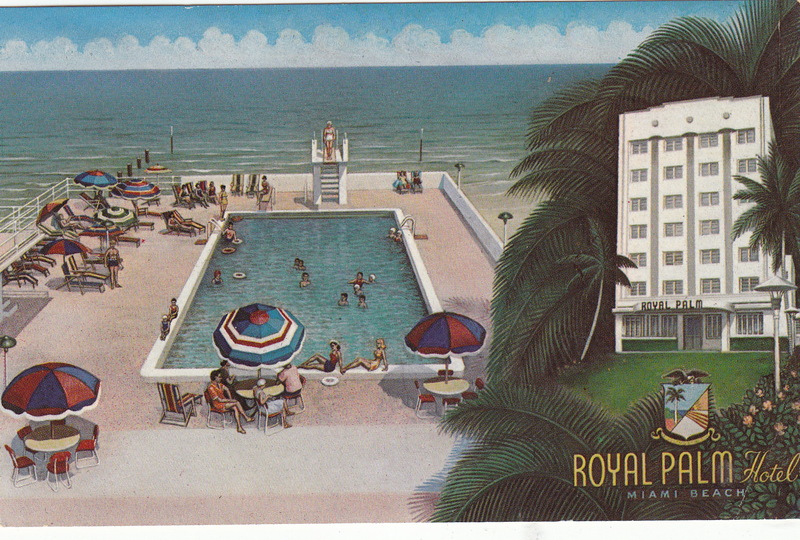 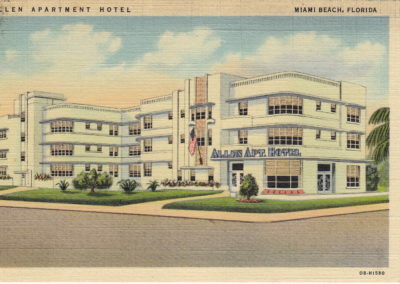 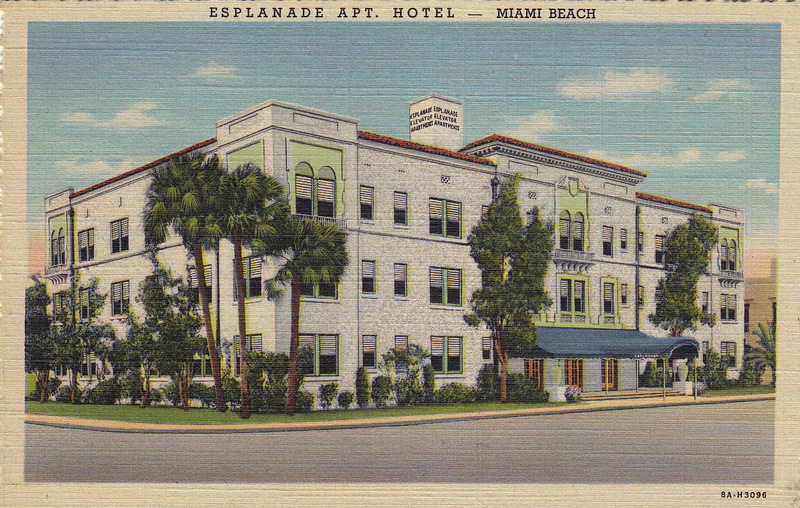 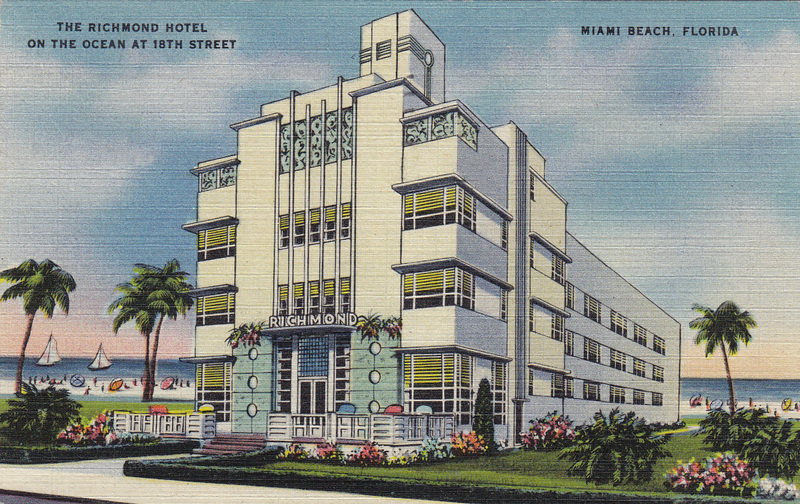 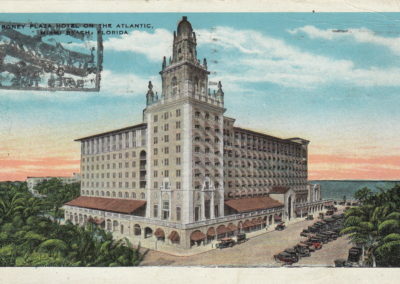 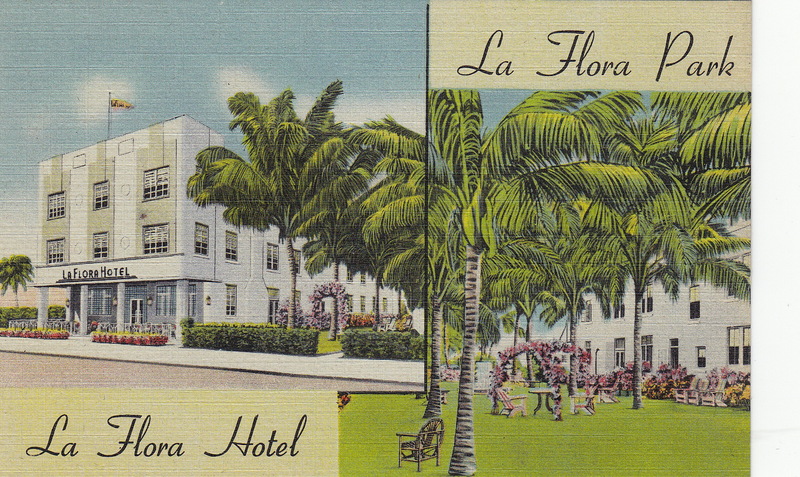 This MDPL collection of 340 hotel picture postcards dates from the 1920s through the 1960s. 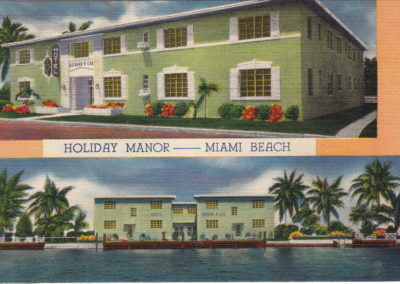 Some buildings no longer exist, others have been refurbished under new names. 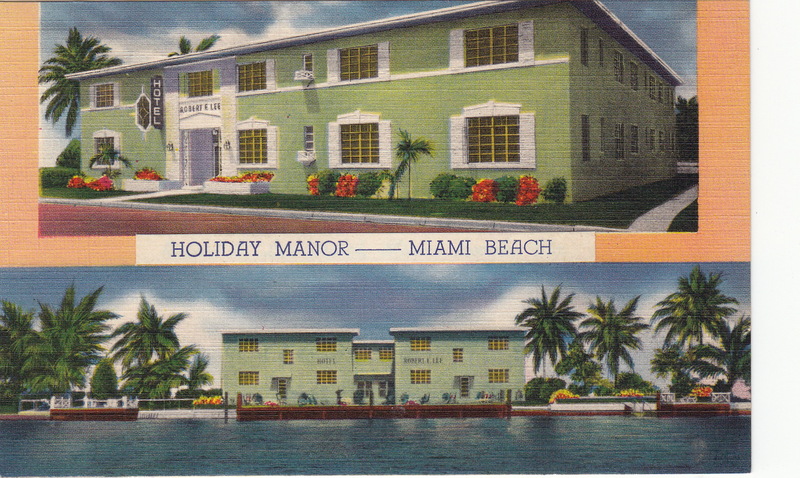 We have grouped images of the same hotel together so comparisons can be made of hotels postcards at different times. 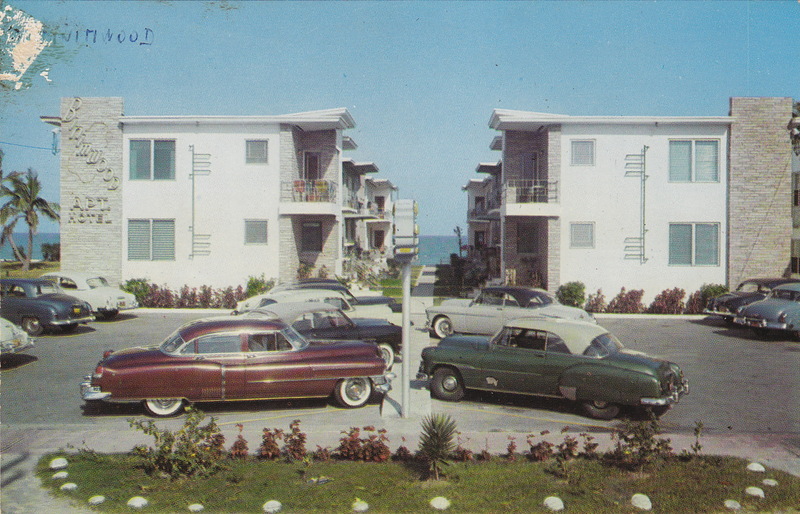 Unfortunately, we have no way of dating the images except by style or the cars depicted. 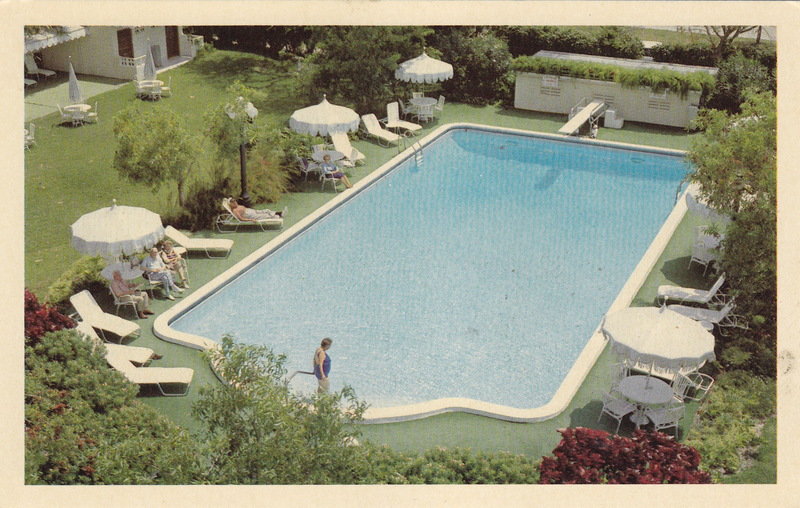 The images are in alphabetical order by the name on the postcard. 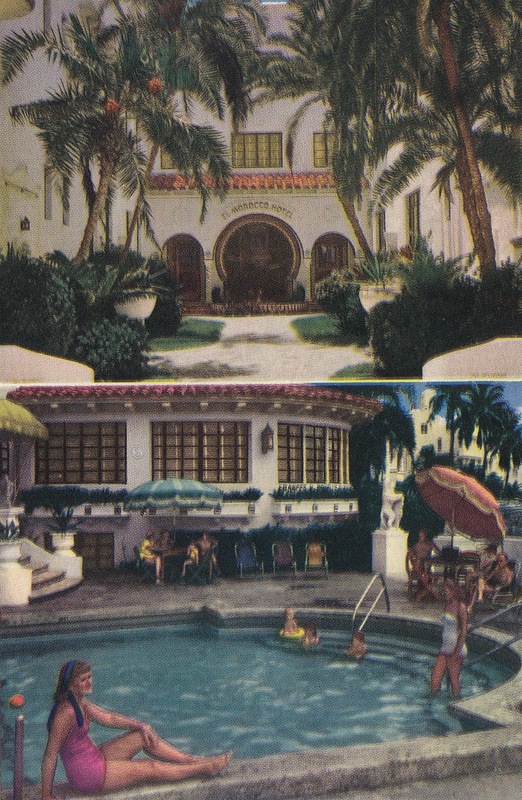 We will be adding images as they become available. 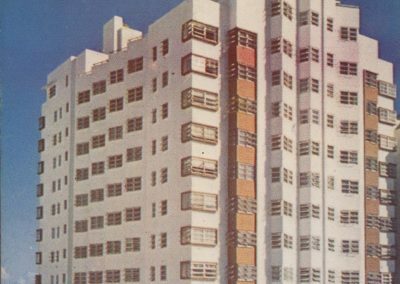 Barbara Baer Capitman’s vision and persistence helped to turn a rundown area of Miami Beach into the vibrant Art Deco Historic District. 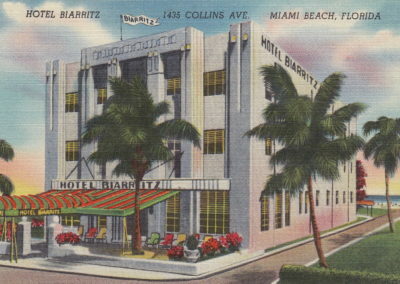 Arriving on Miami Beach in 1973, Barbara was struck by the neglect of what she recognized as an artistic treasure — the hundreds of buildings constructed in the Moderne style following the disastrous 1926 hurricane. 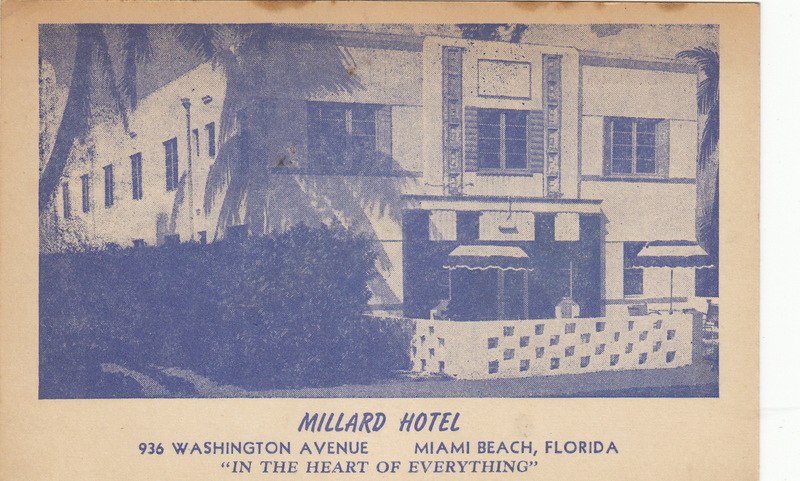 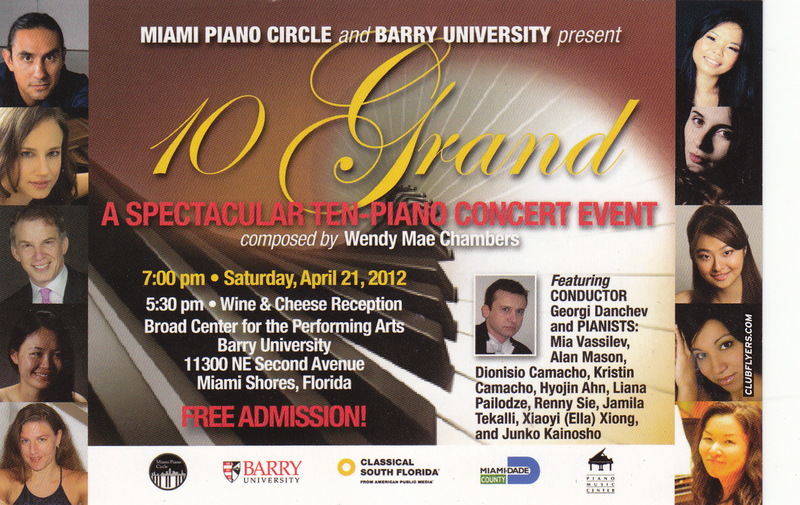 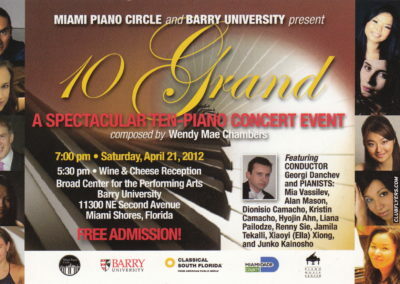 This film uses interviews with people who worked with Barbara and video from a German Television documentary filmed the year before her death in 1990 to tell the story of how Barbara Capitman was able to save large portions of Miami Beach’s unique Art Deco District. 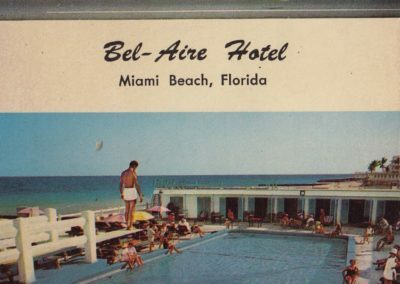 The Miami Beach Visual Memoirs Project is a video archive that records the history of the Beach through the memories and stories of the people who grew up here and have been a part of its development. 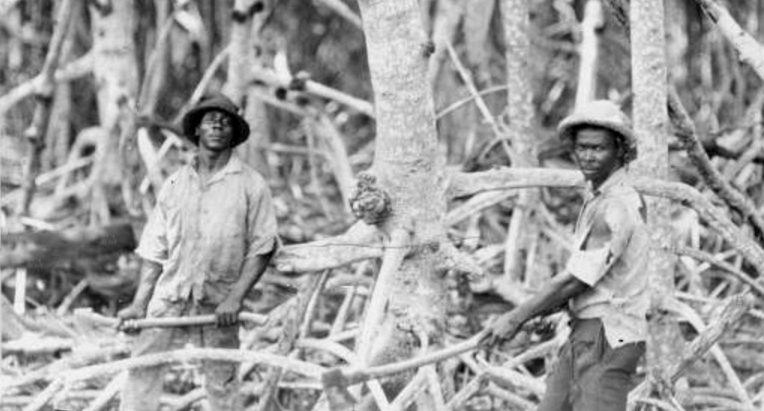 These HD video recollections are available for online research, and have been combined and edited to create museum installations, a series of educational films and on-line access. 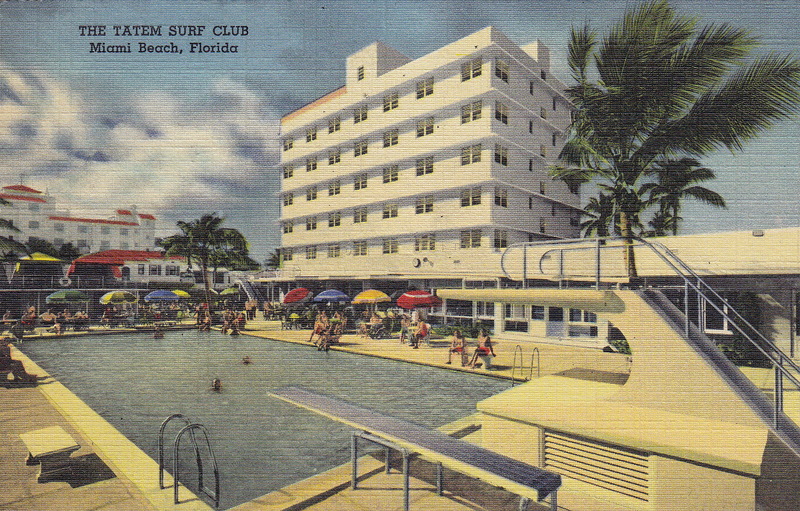 Sharing the legacy of the City’s past expands our appreciation of the unique Beach community. 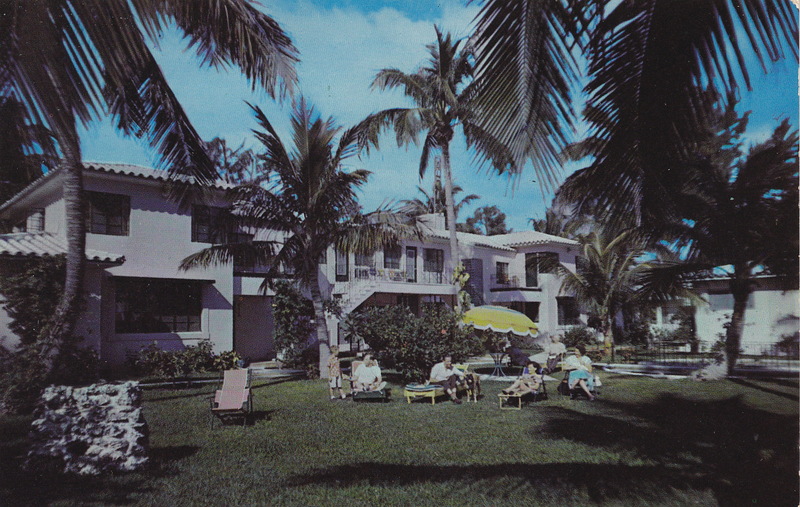 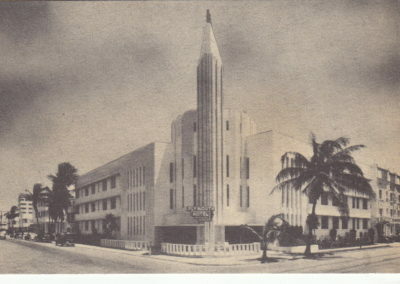 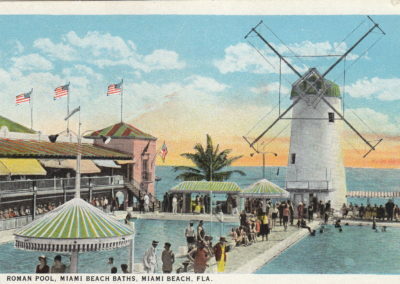 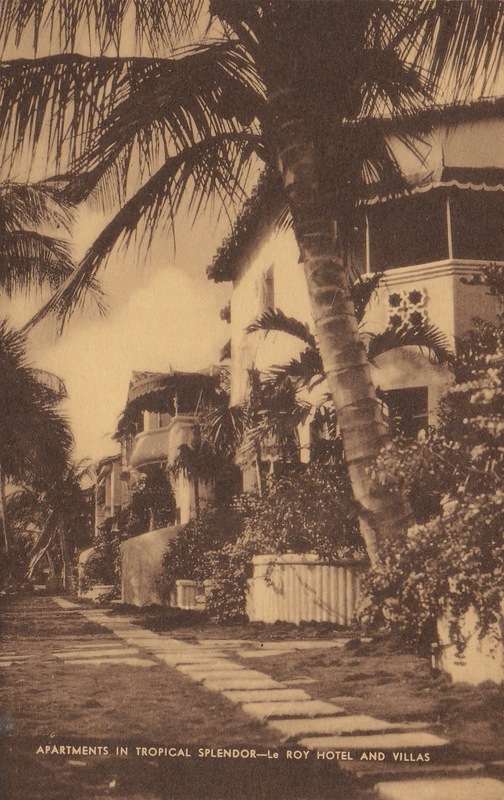 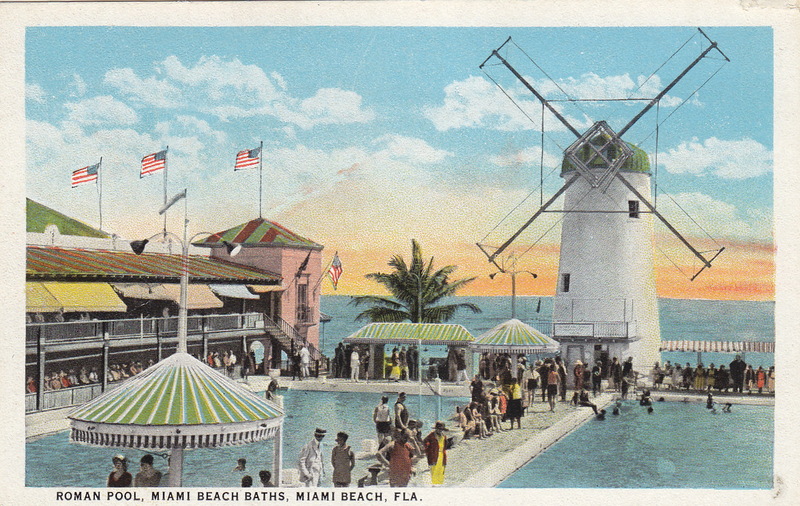 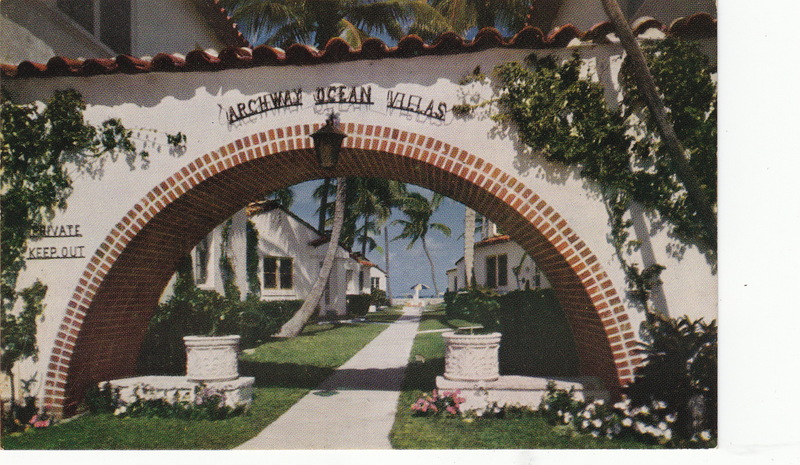 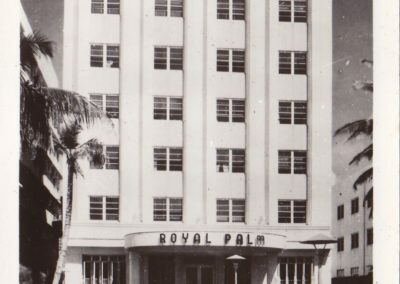 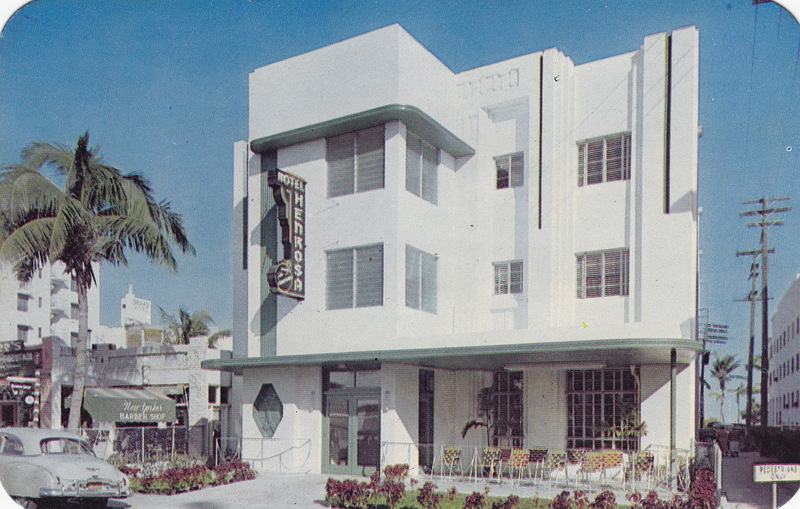 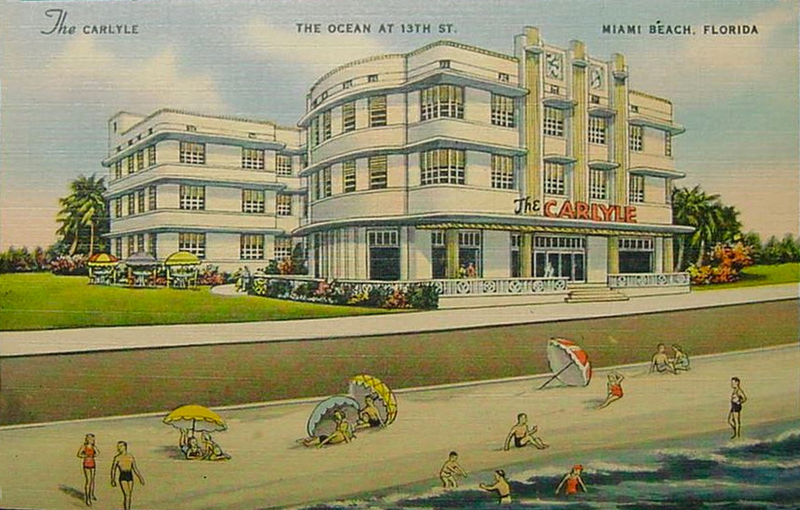 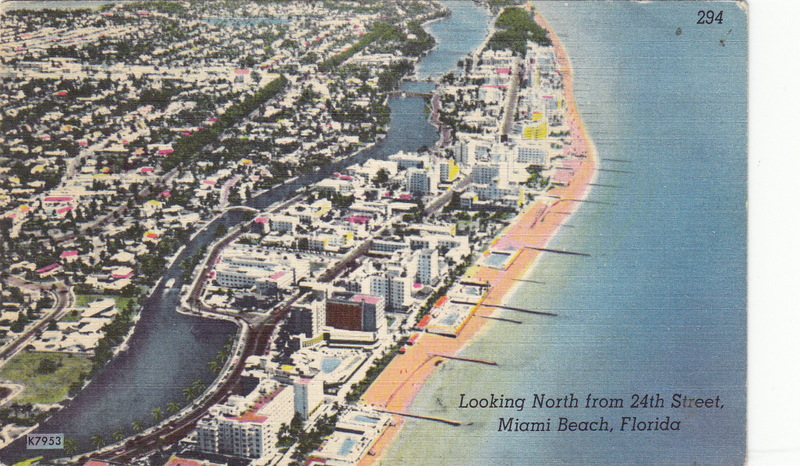 The Miami Beach Visual Memoirs is a joint project of the Miami Design Preservation League and Close-Up Productions, Inc. under a grant from the Miami Beach Visitor and Convention Authority. 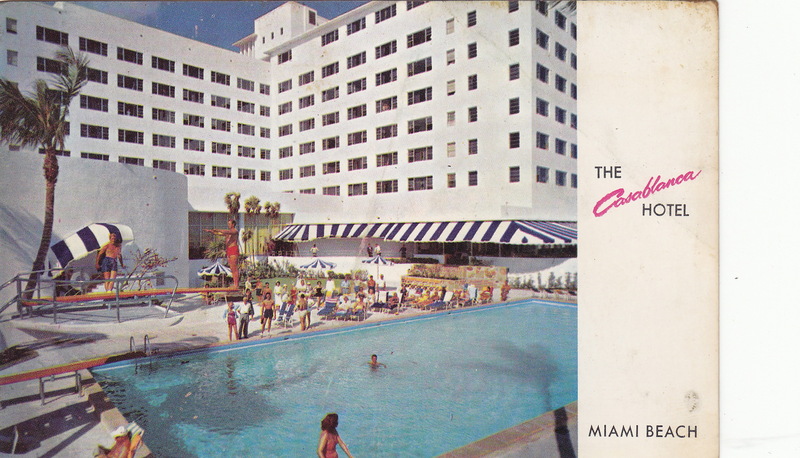 — that’s what the Miami Beach Visual Memoirs Project is about. 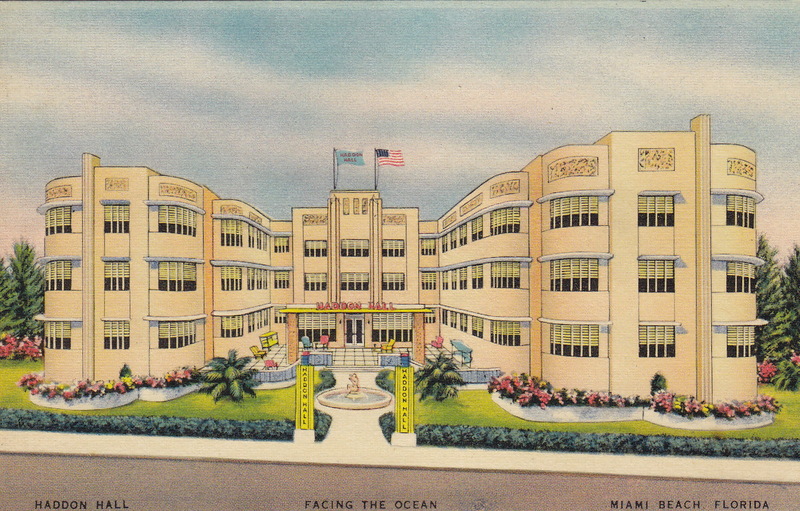 We have created downloadable videos and curricula for Elementary, Middle and High Schools that teach Miami Beach’s history and culture.